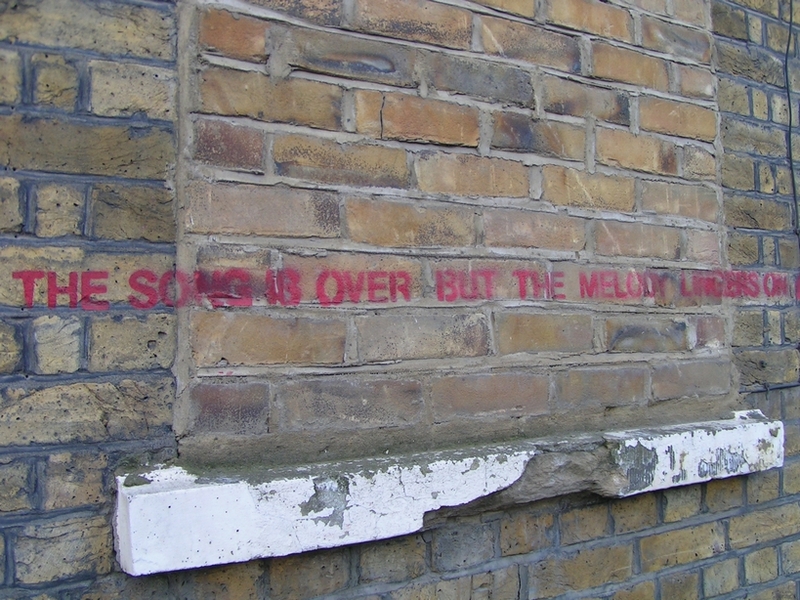 Grove Passage is a narrow alleyway where The Libertines filmed their 'Up The Bracket' video in 2002. 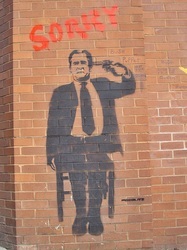 'Up The Bracket' is a slang term as used by comedian Tony Hancock meaning a punch in the throat. 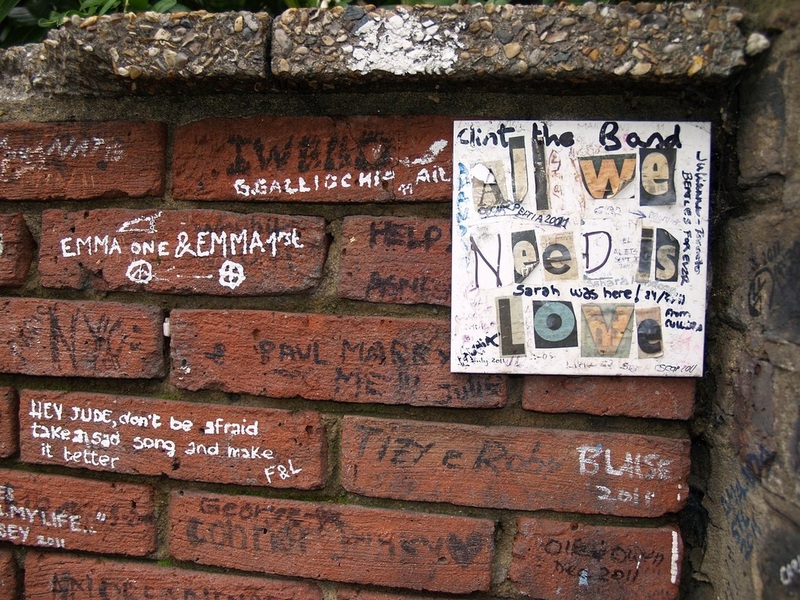 A bit like the Beatles in Abbey Road, Grove Passage has become a place of pilgrimage for Libertines fans. 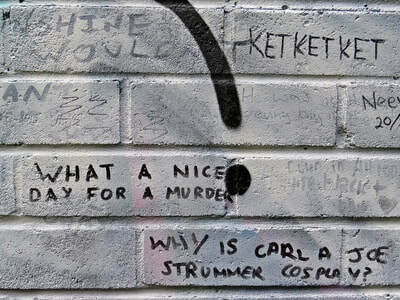 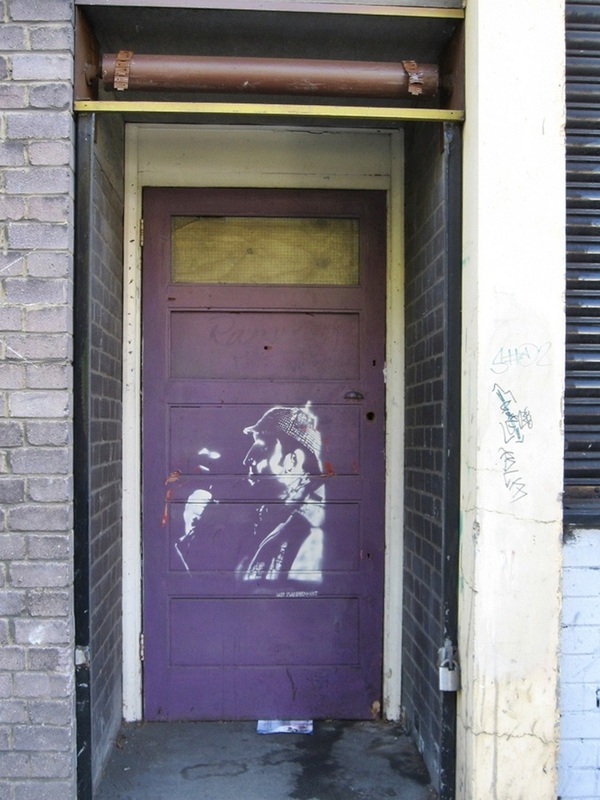 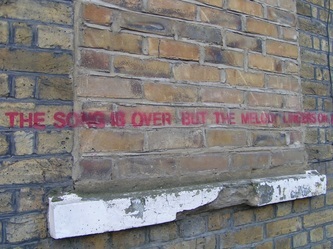 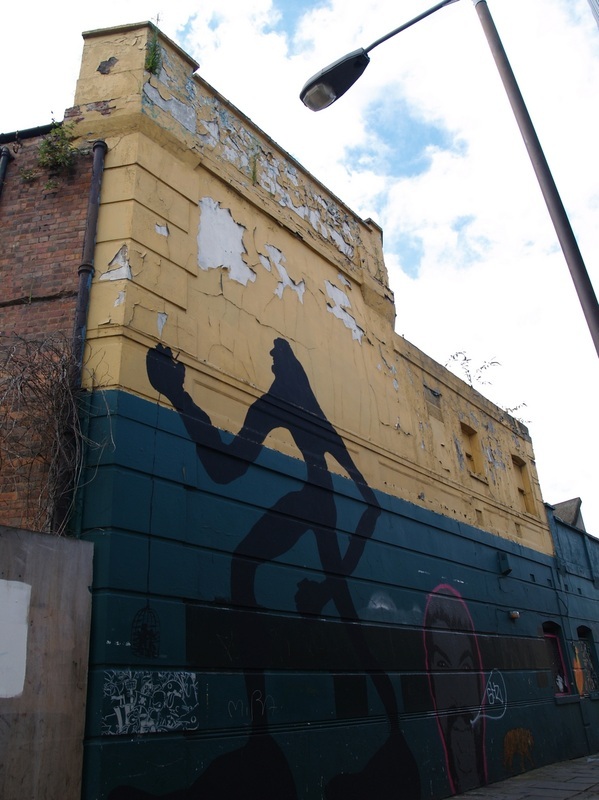 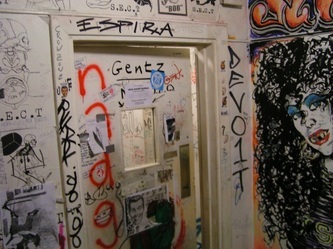 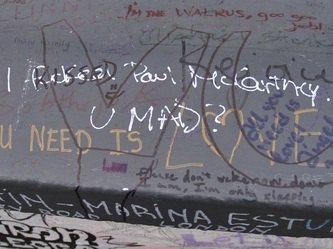 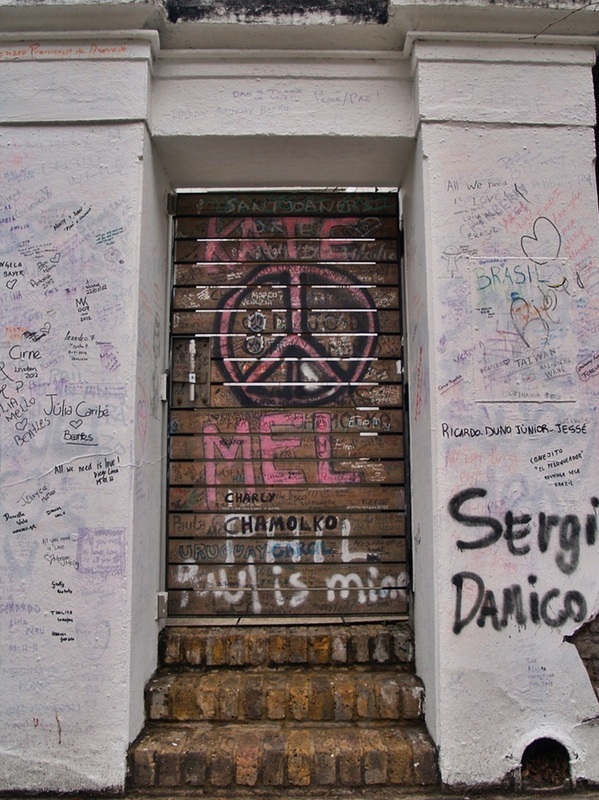 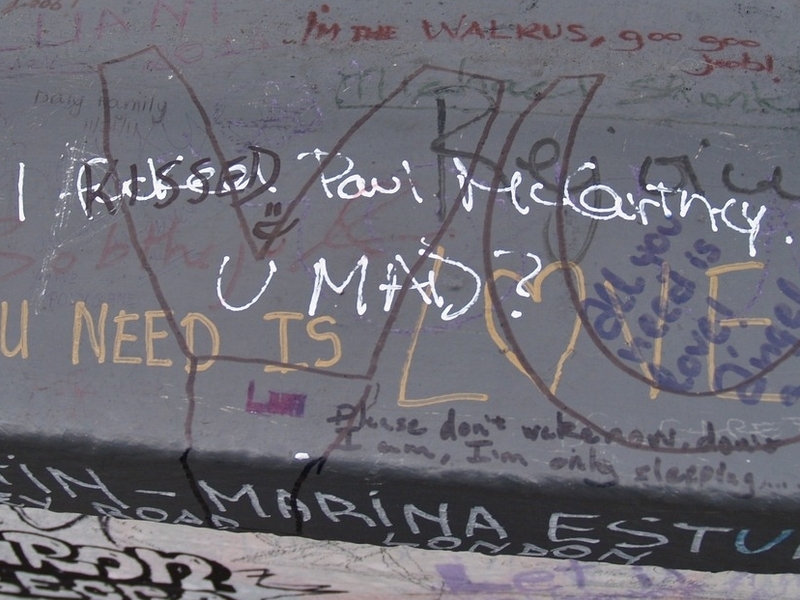 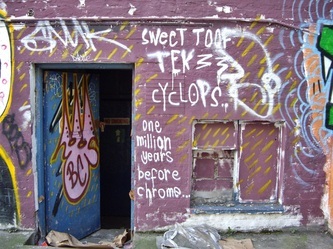 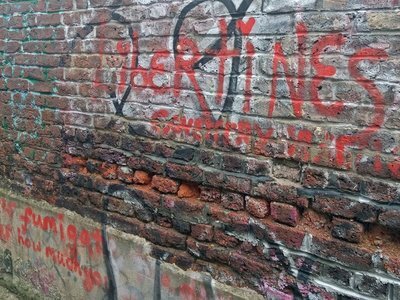 It is graffitied with many Libertines tributes and is close to Carl Barât and Pete Doherty's former flat on Teesdale Street. 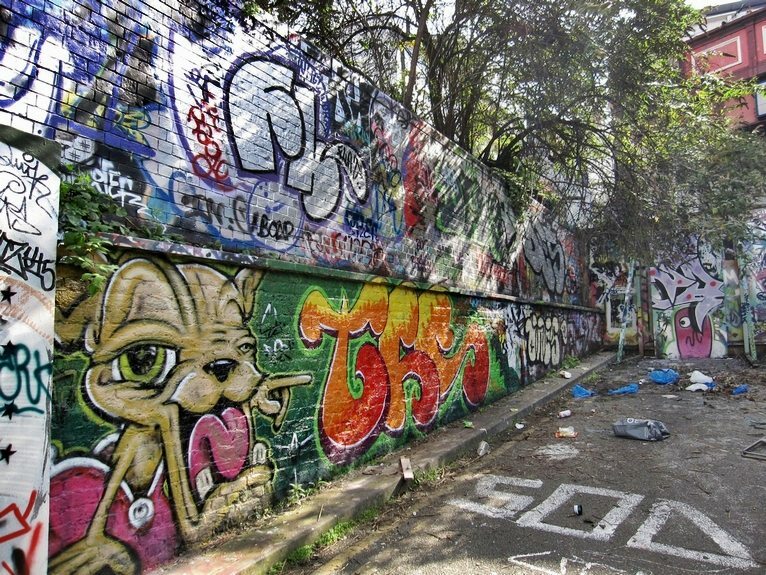 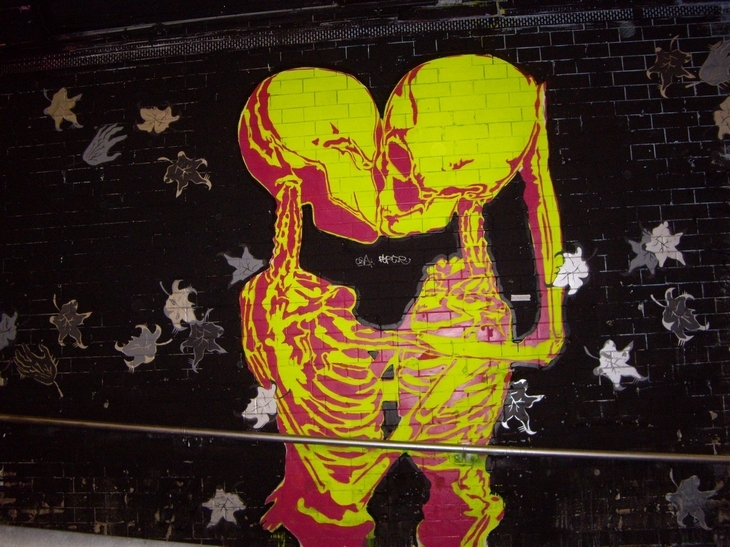 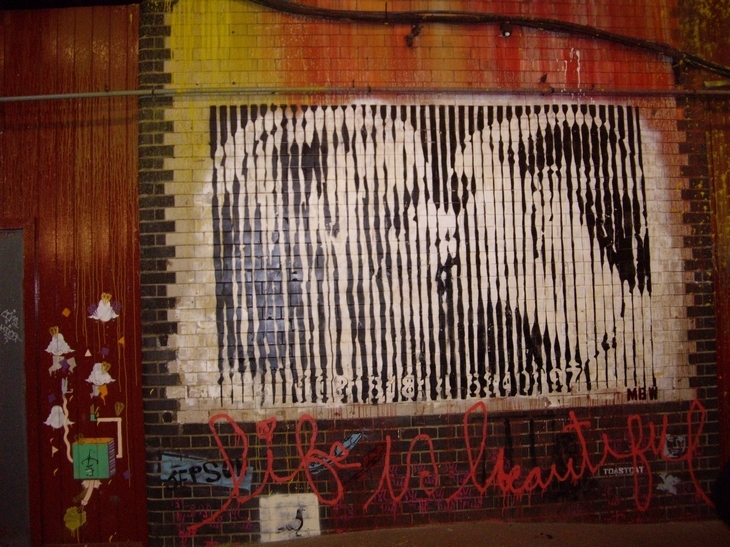 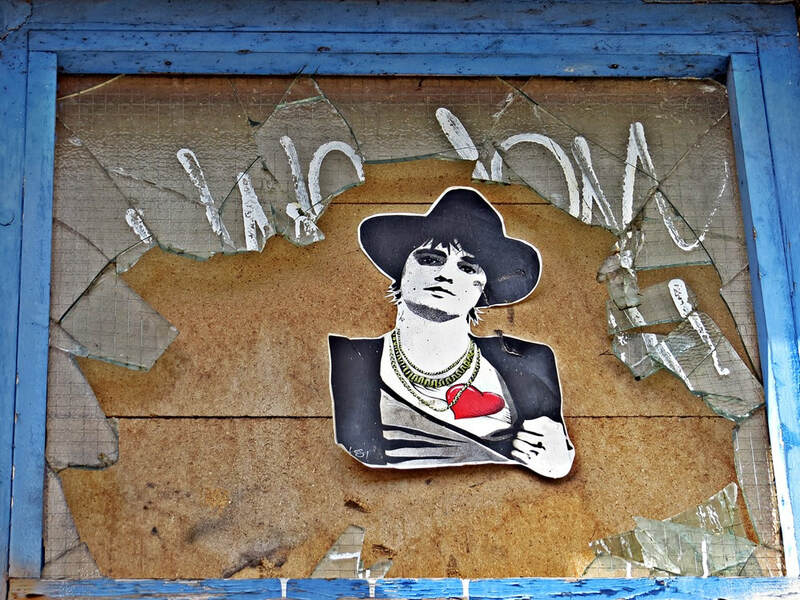 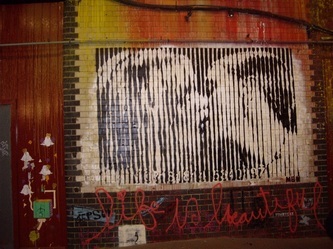 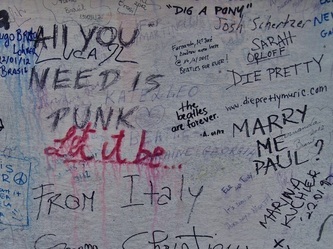 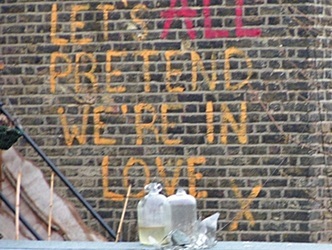 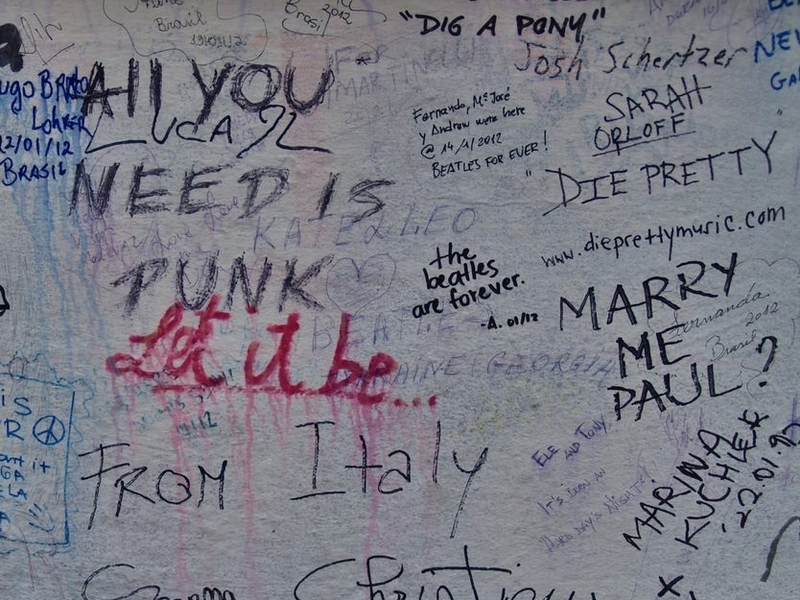 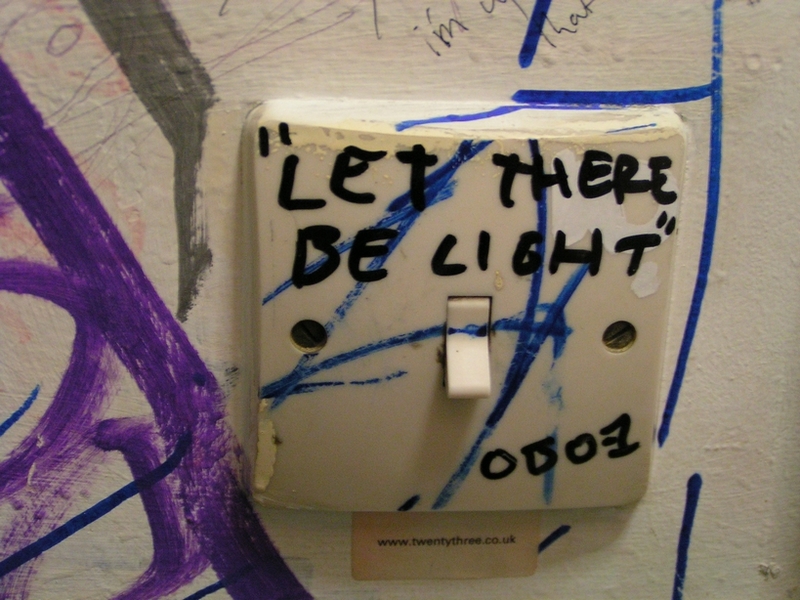 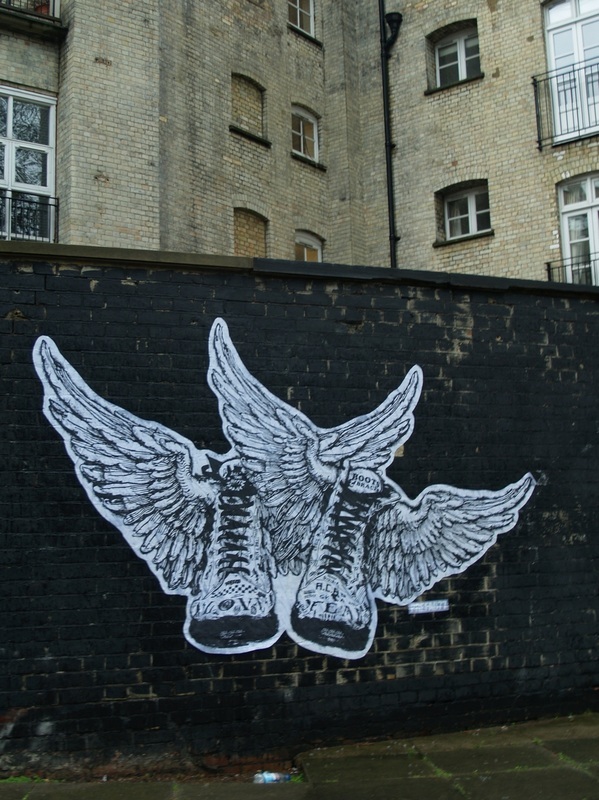 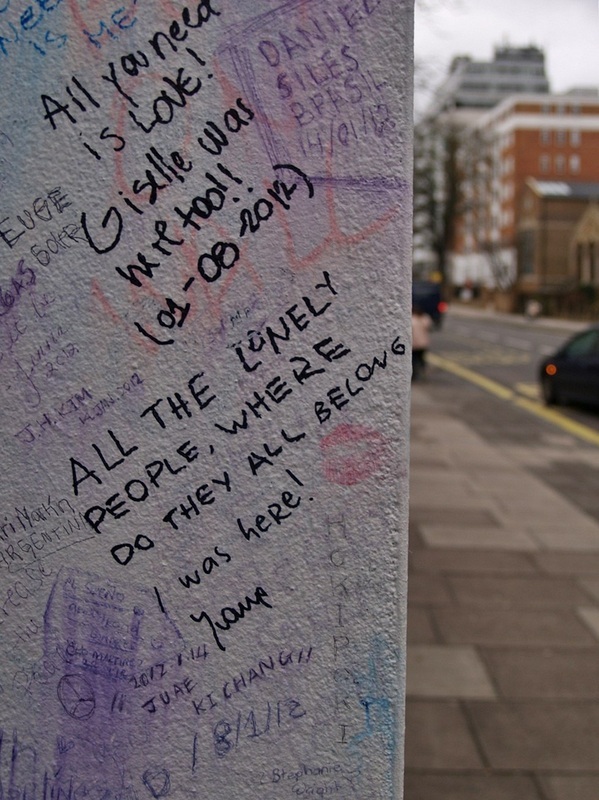 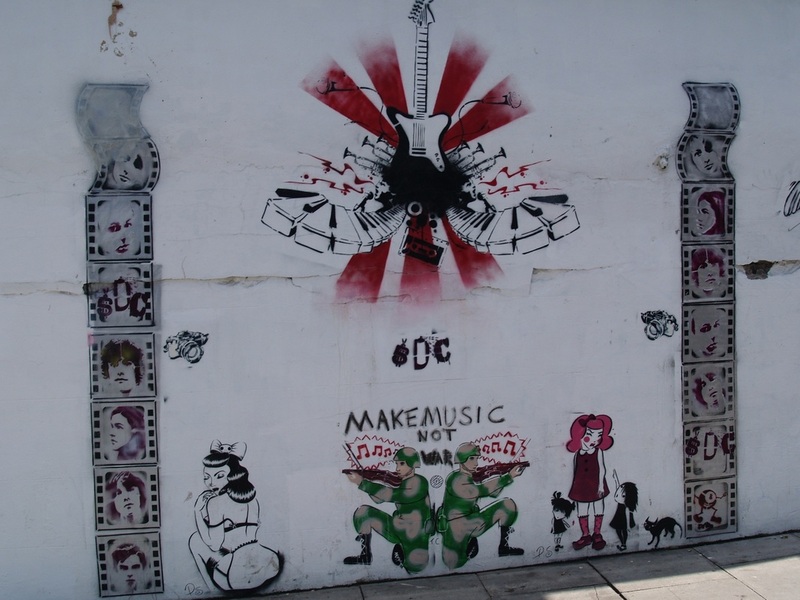 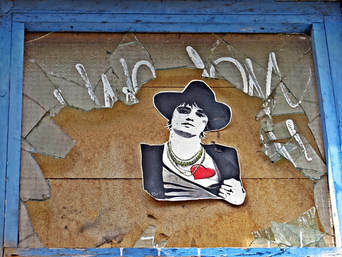 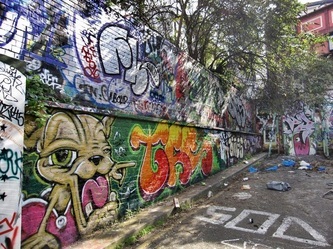 ​In 2014 at The Libertines' reunion gig in Hyde Park the show started with the footage of the Up the bracket alley's graffiti, shown at the big screens along with old band's photos. 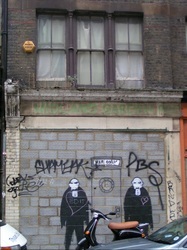 Teatime for the Grim Reaper and cat just off the Seven Sisters Road in Holloway, N7. 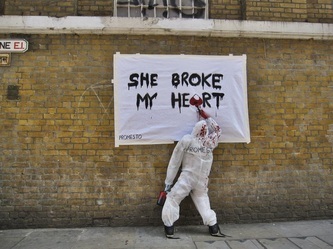 Artwork by Loretto. 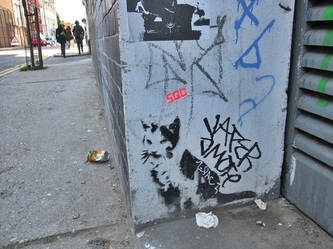 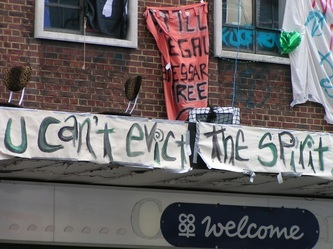 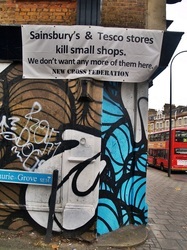 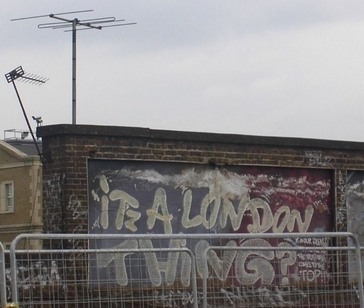 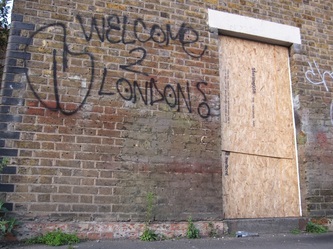 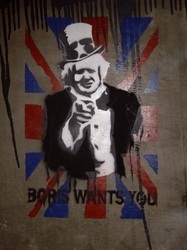 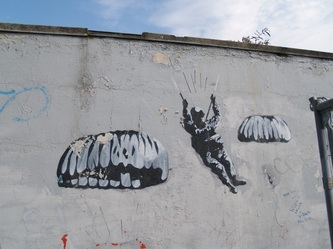 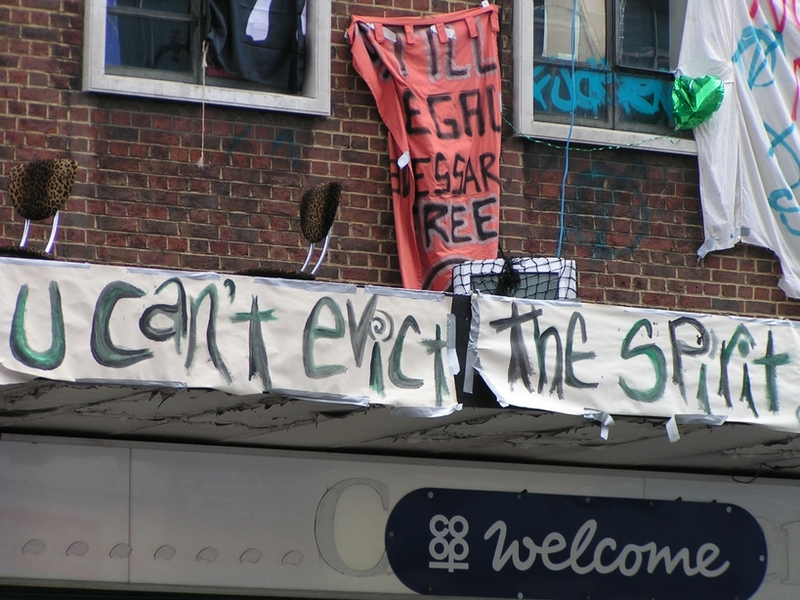 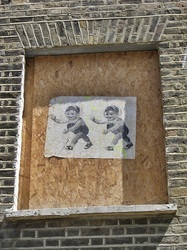 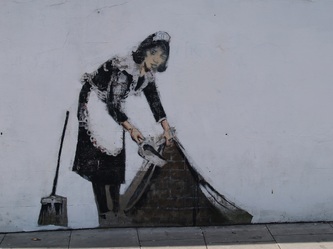 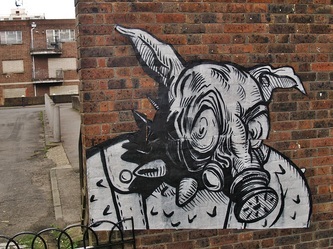 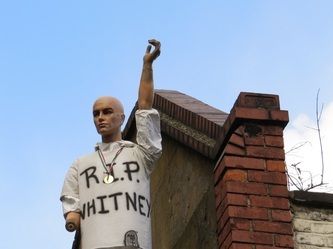 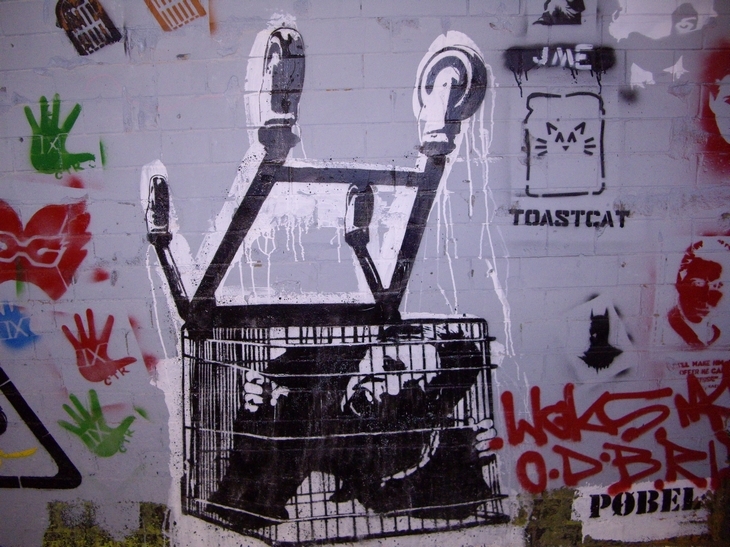 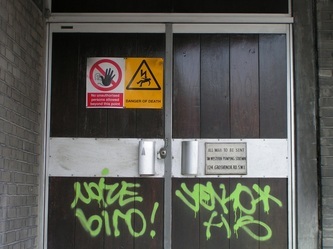 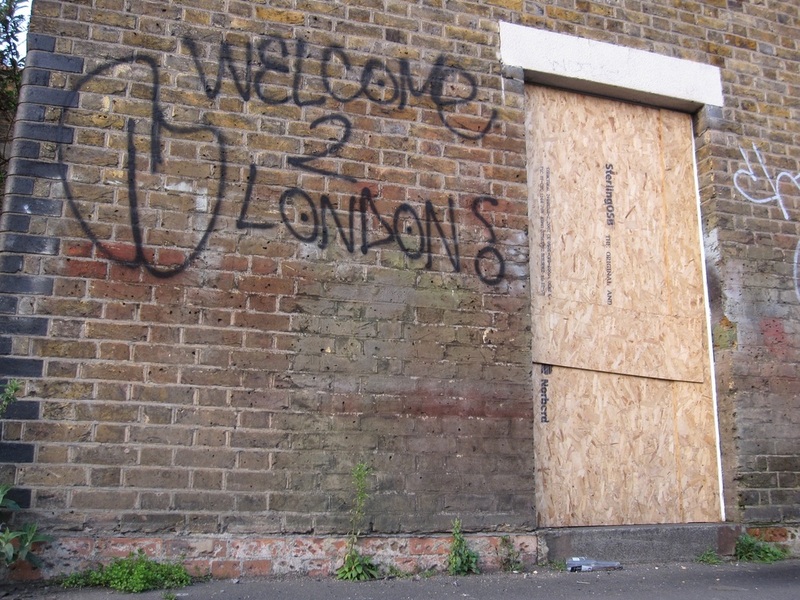 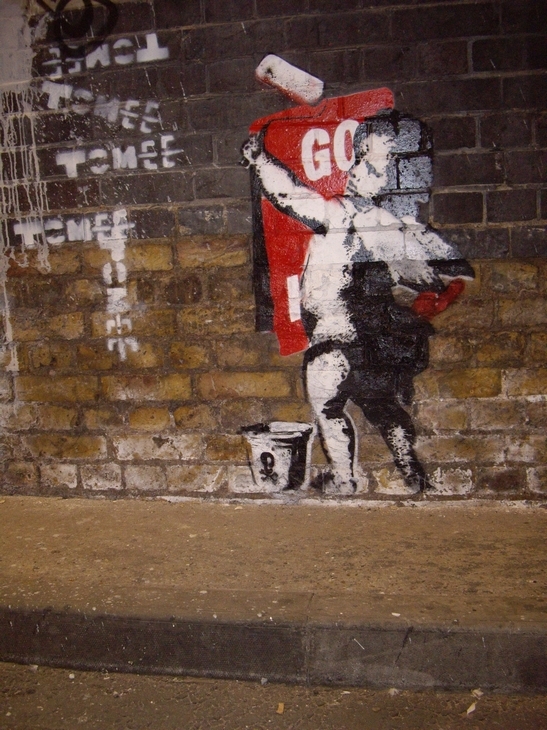 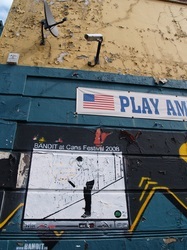 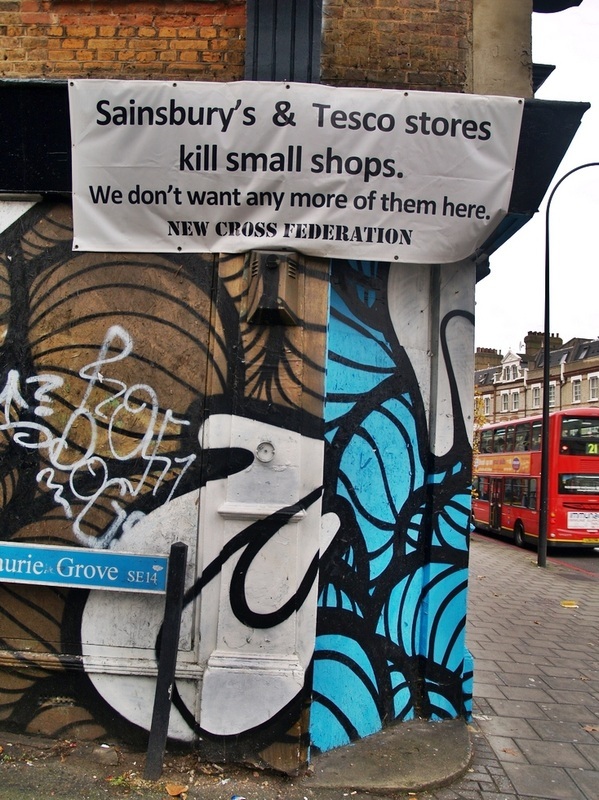 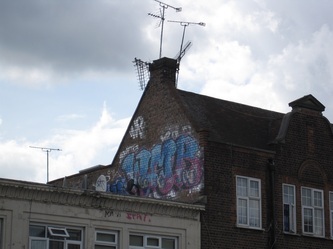 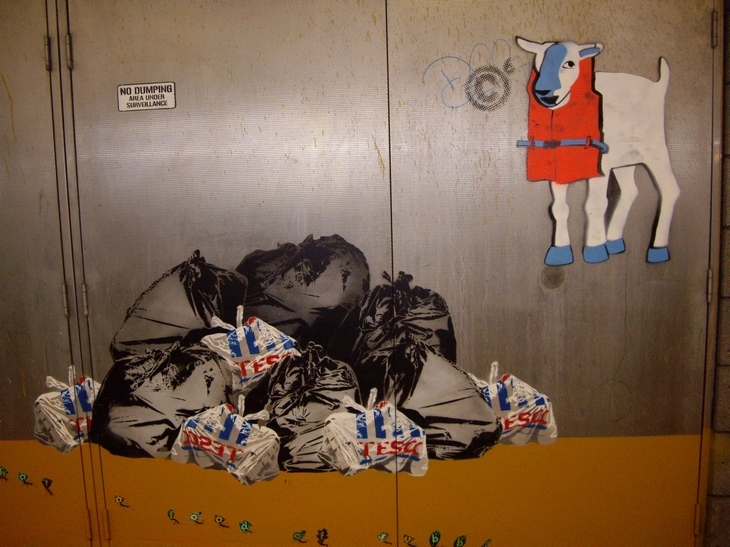 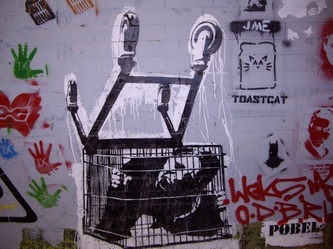 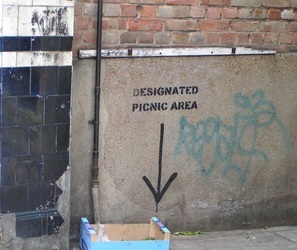 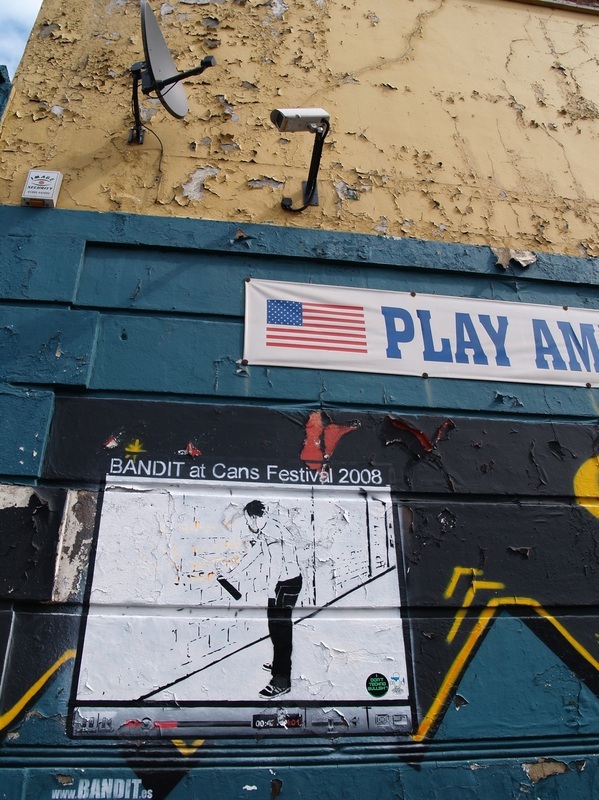 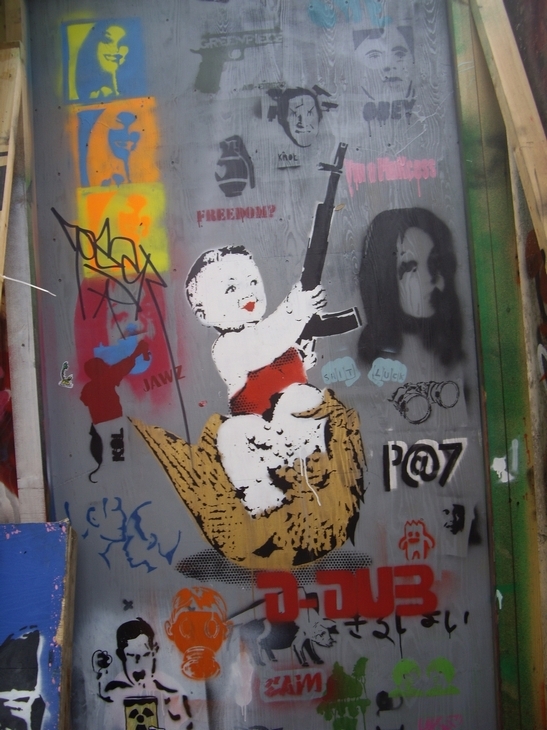 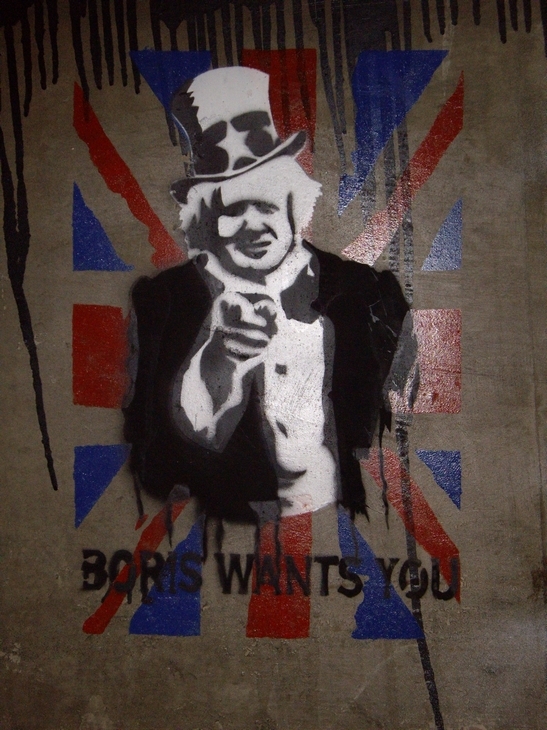 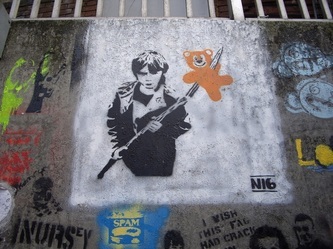 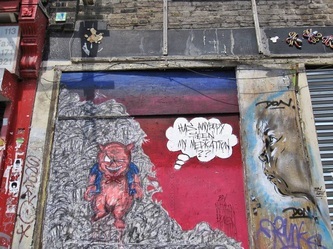 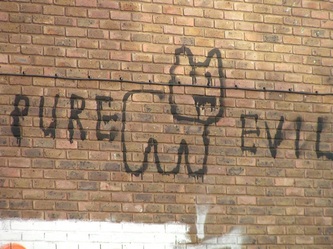 The stencilled graffiti of a rat holding a sign saying “why?” appeared on the side of Poundland in Turnpike lane as a response to the removal of the Banksy ‘Slave Labour’ artwork which was due to be sold at auction where was expected to sell for up to £450,000.The original image of a child making Union Jack bunting appeared overnight in May 2012 and was removed in February 2013 and put on an online auction site in the US by an anonymous vendor though later withdrawn from sale. 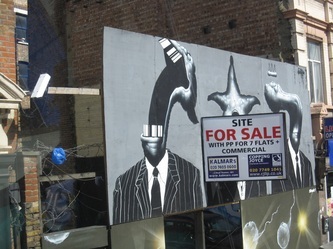 It is still not clear who actually removed it for sale. 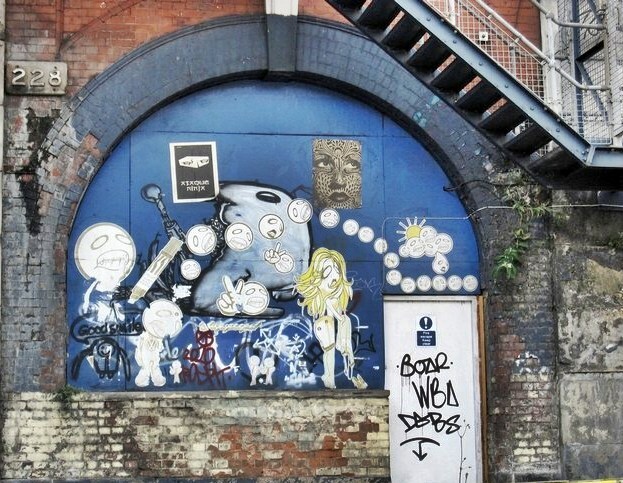 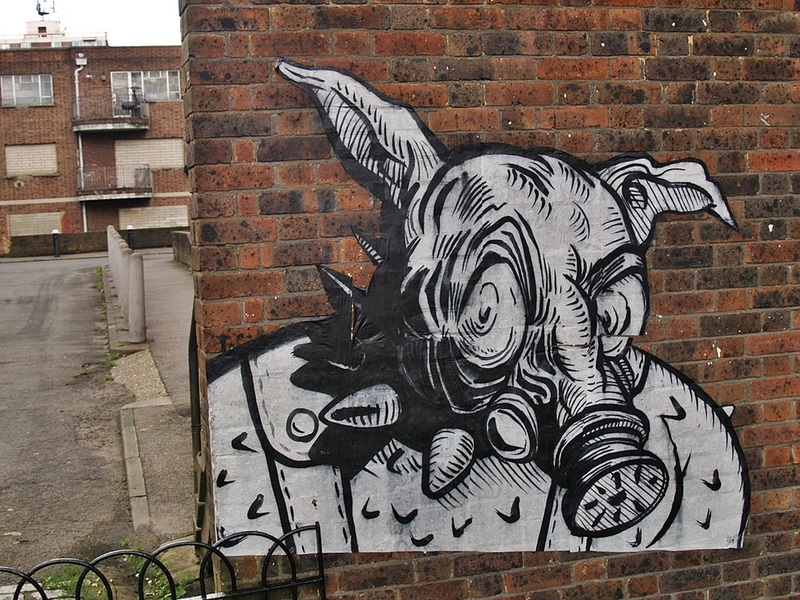 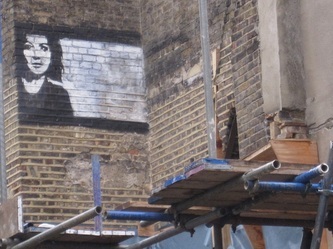 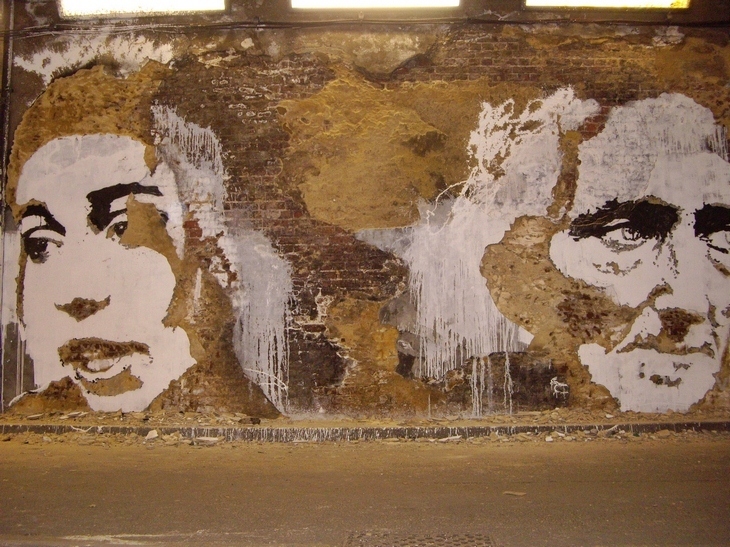 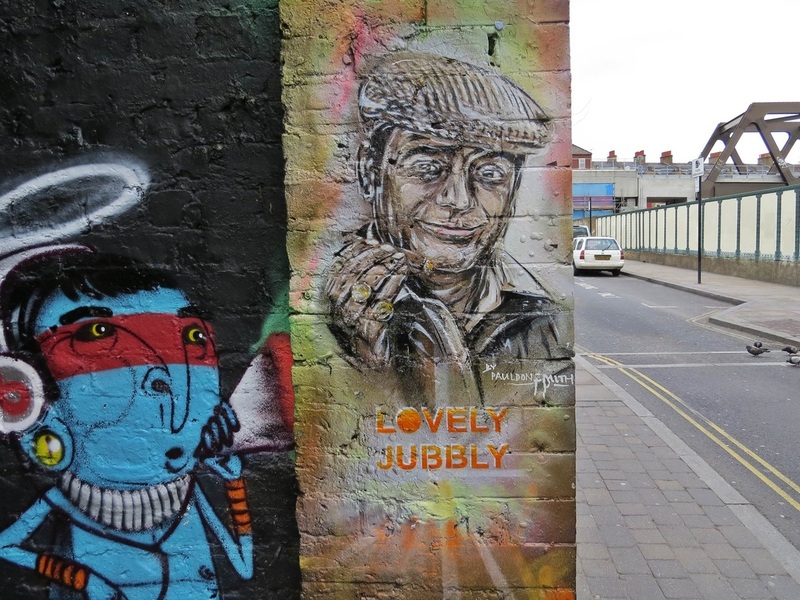 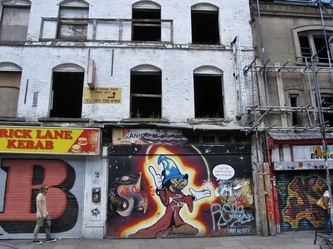 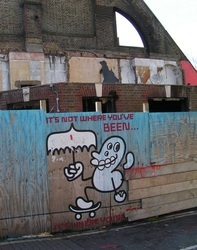 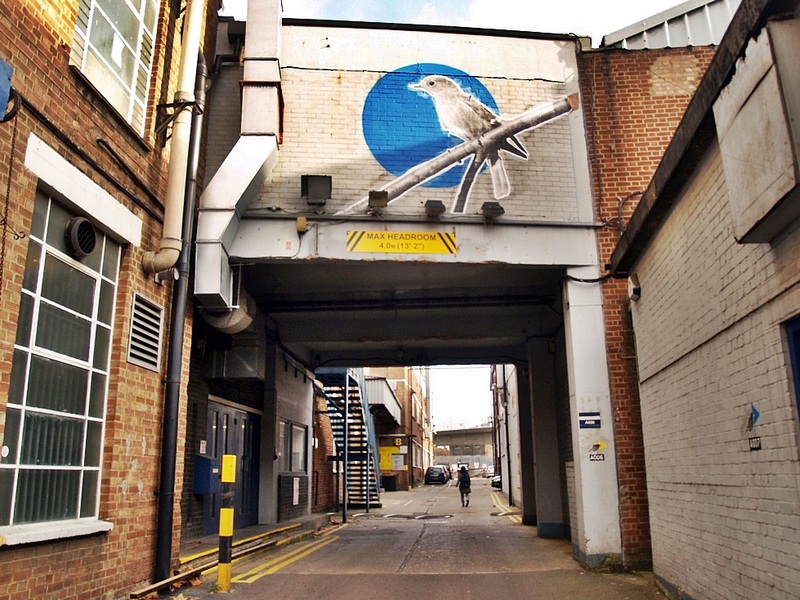 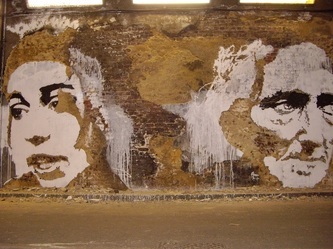 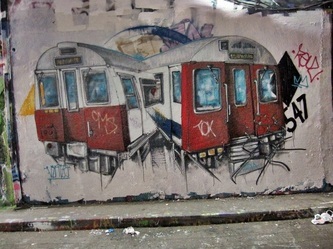 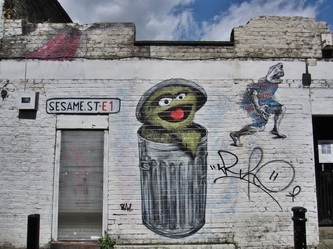 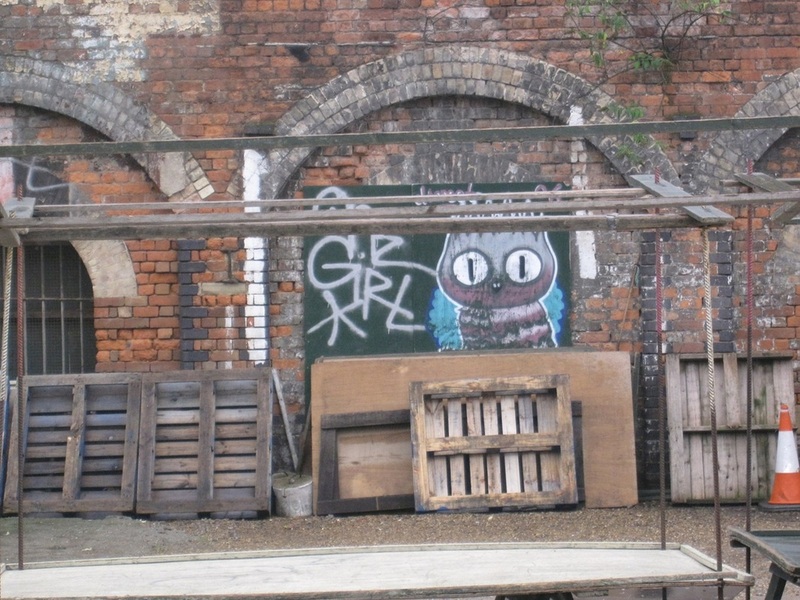 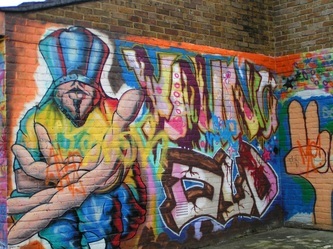 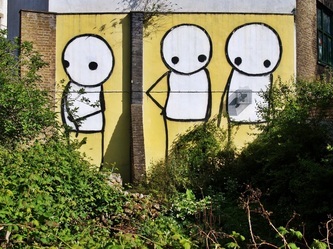 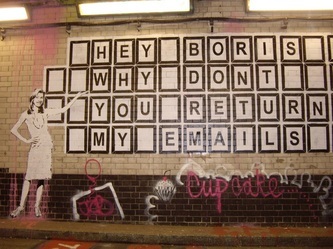 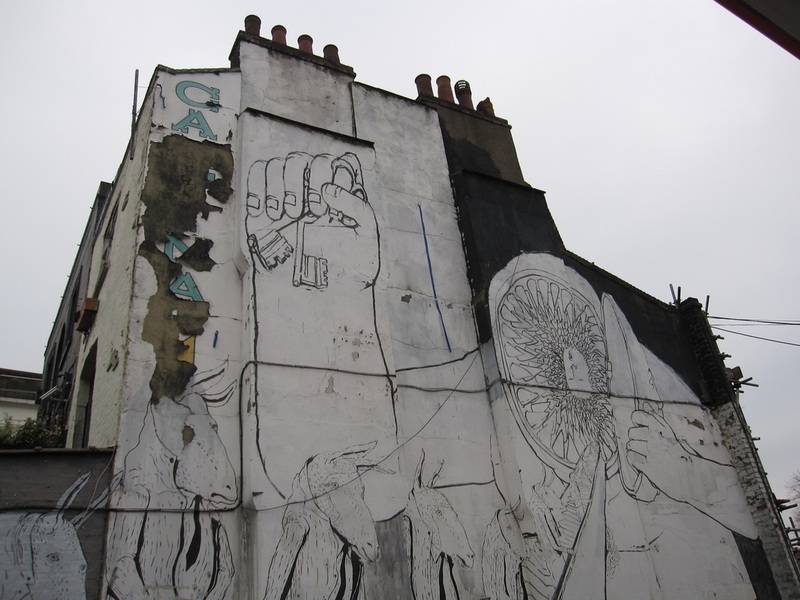 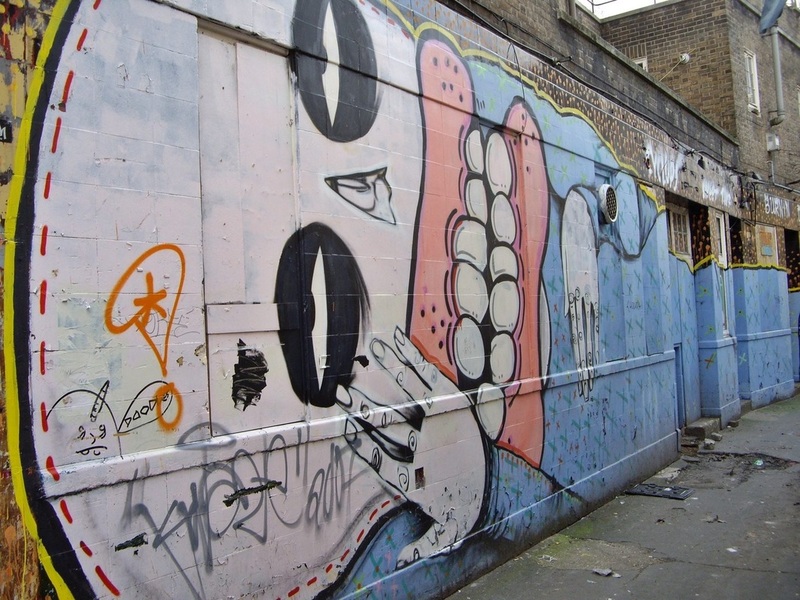 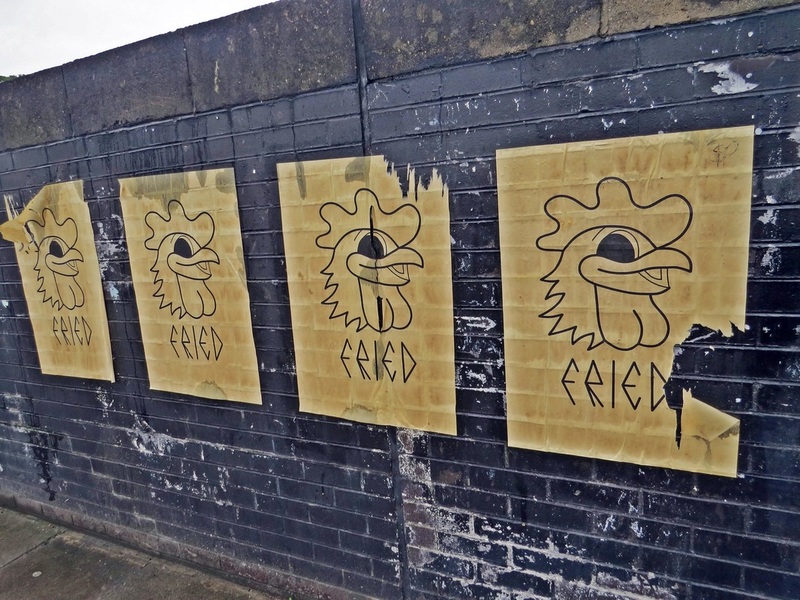 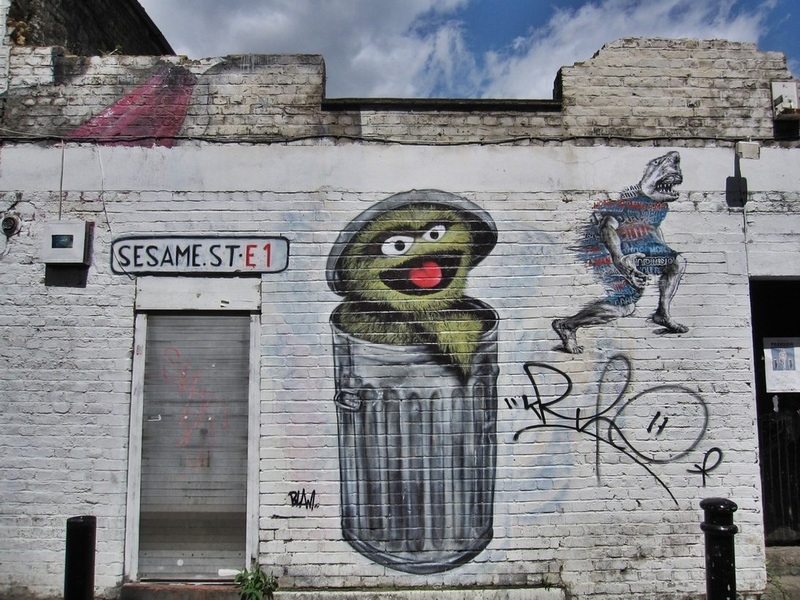 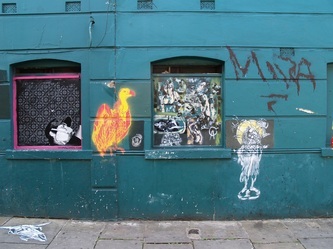 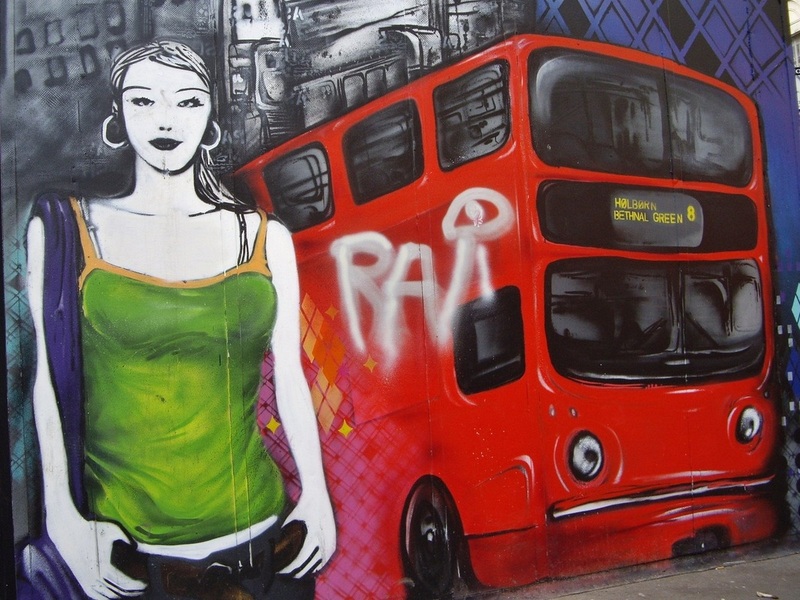 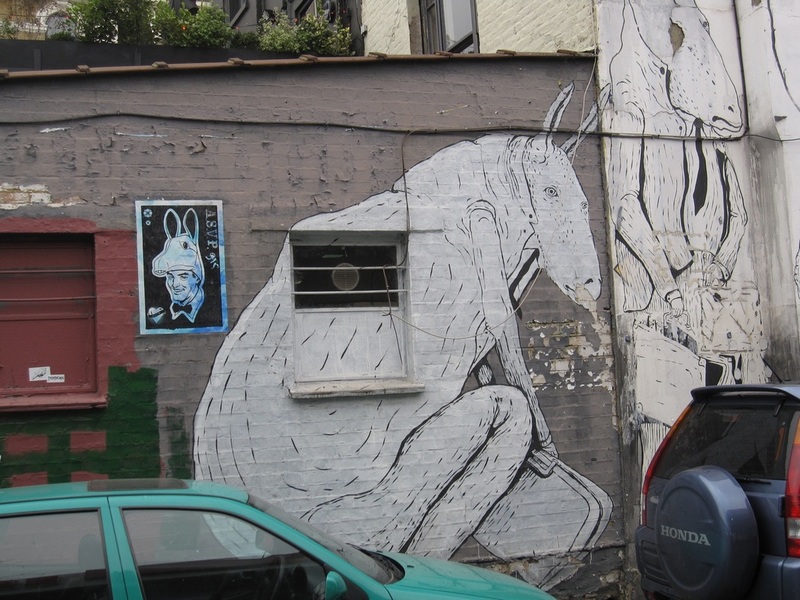 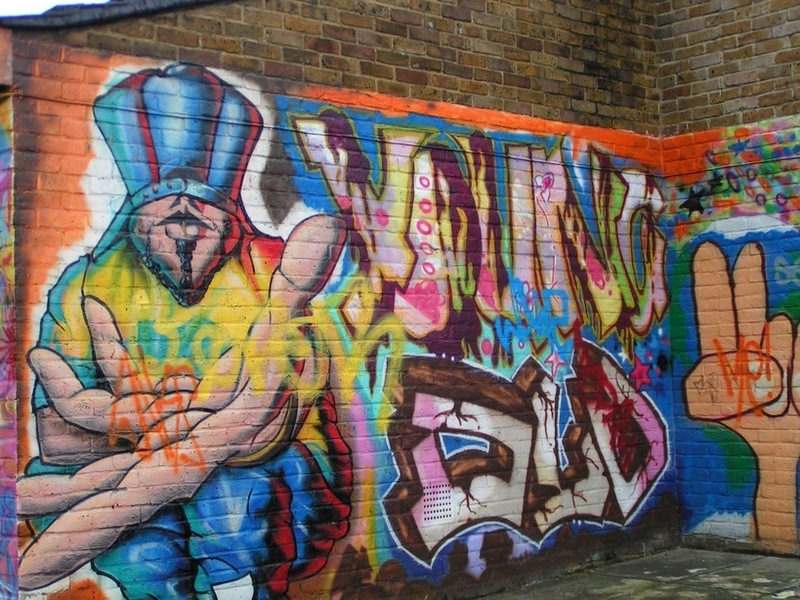 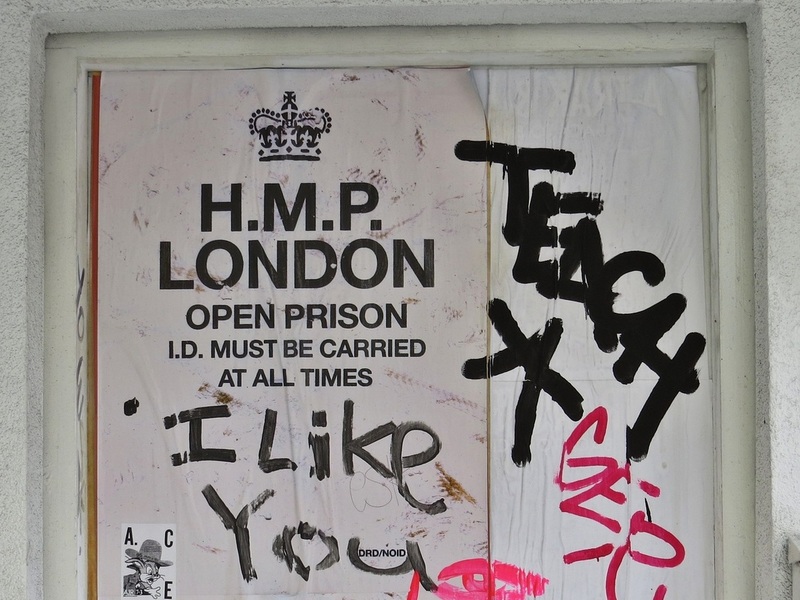 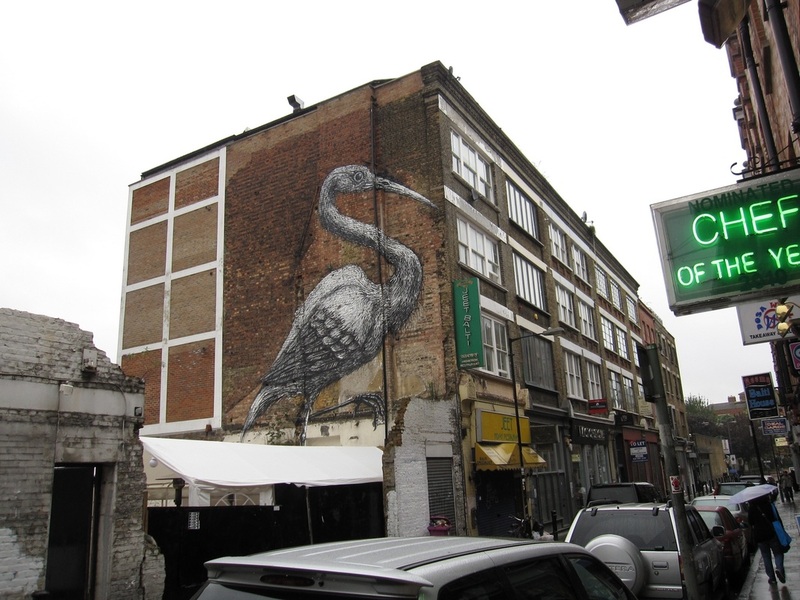 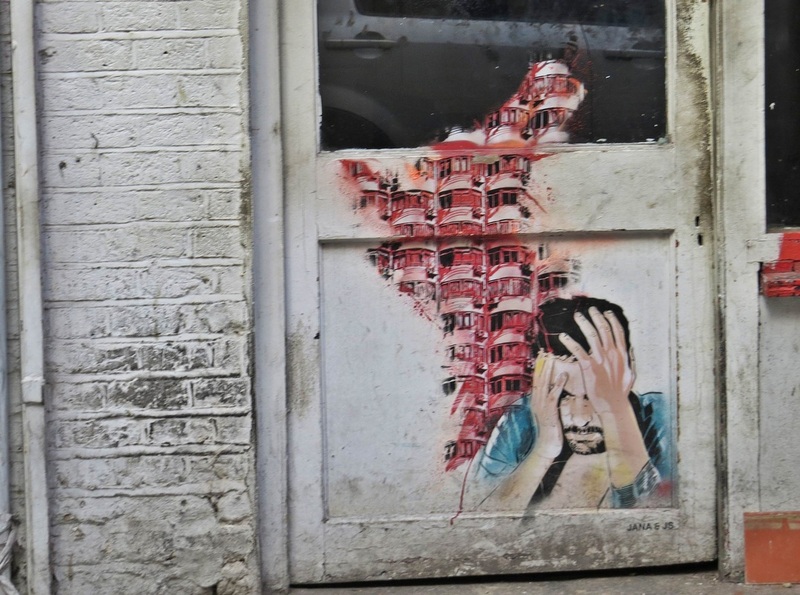 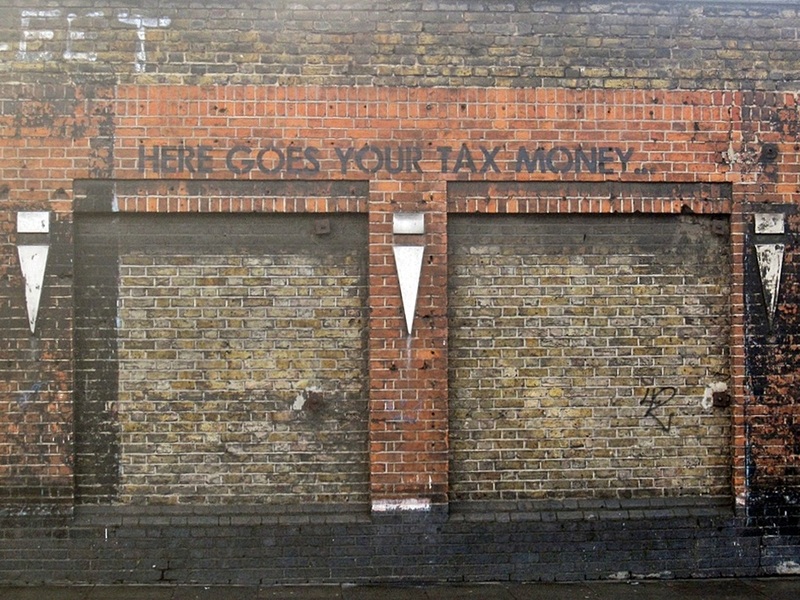 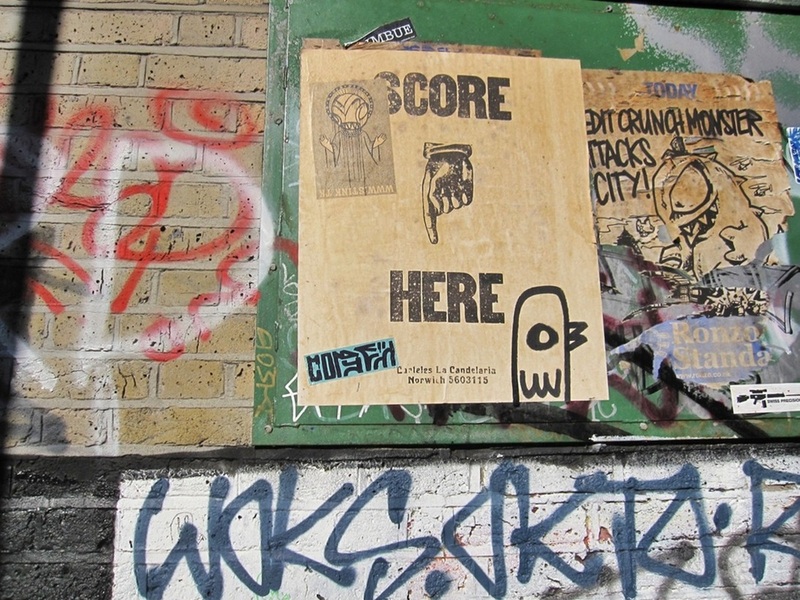 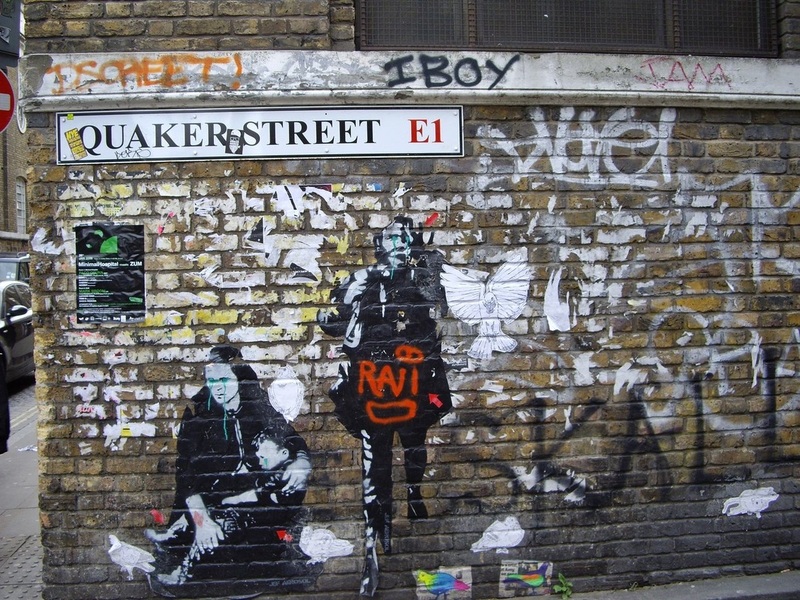 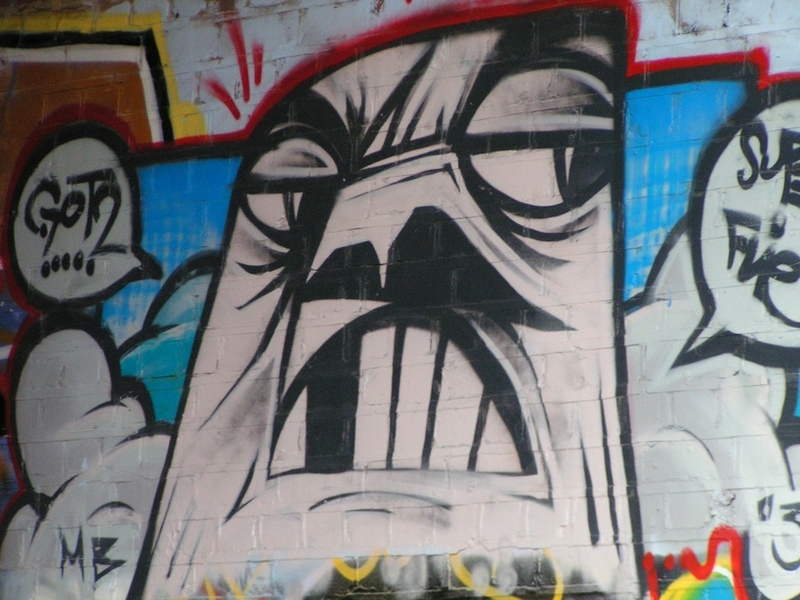 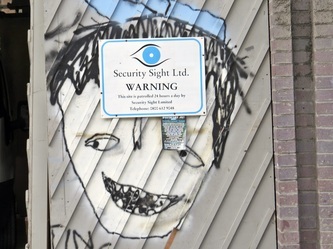 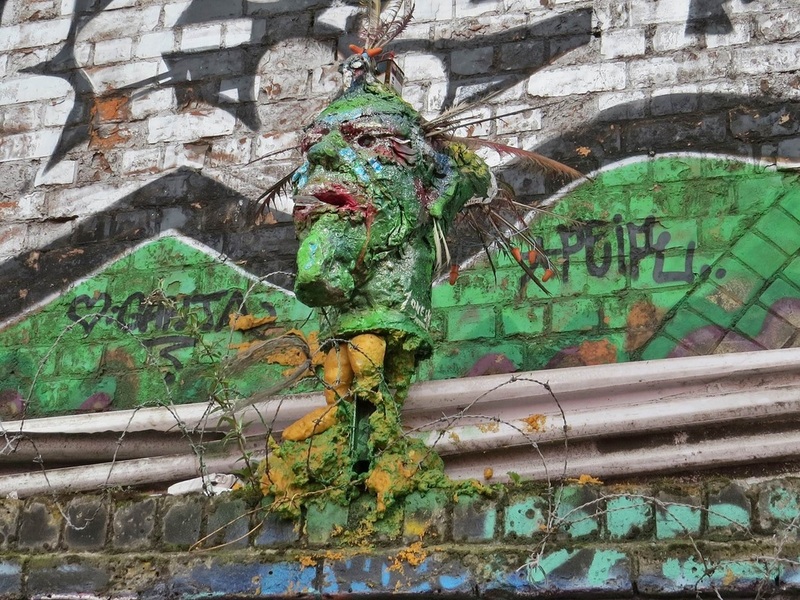 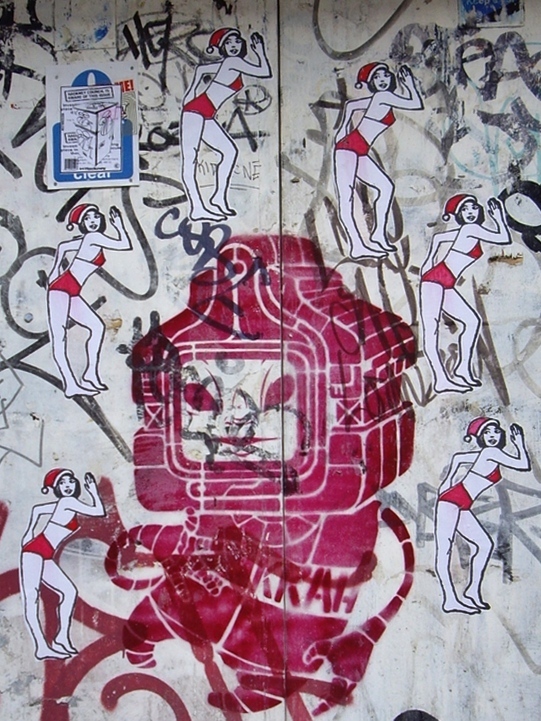 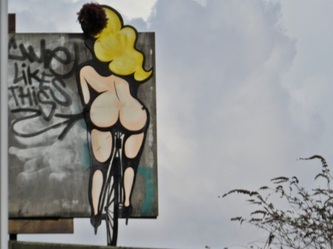 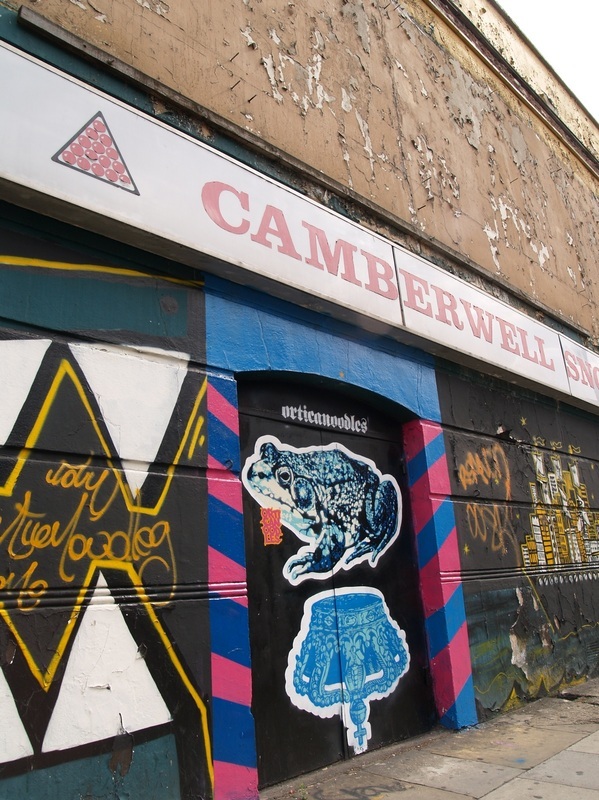 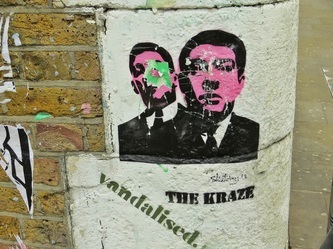 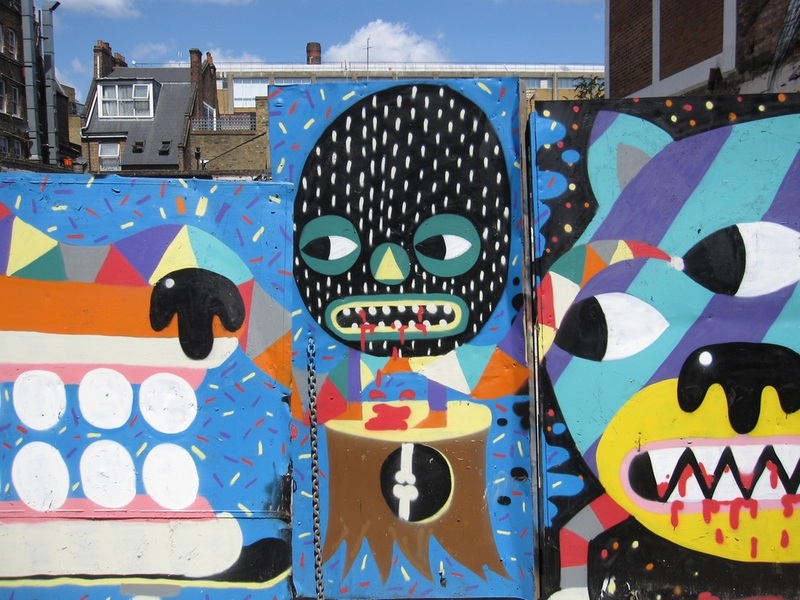 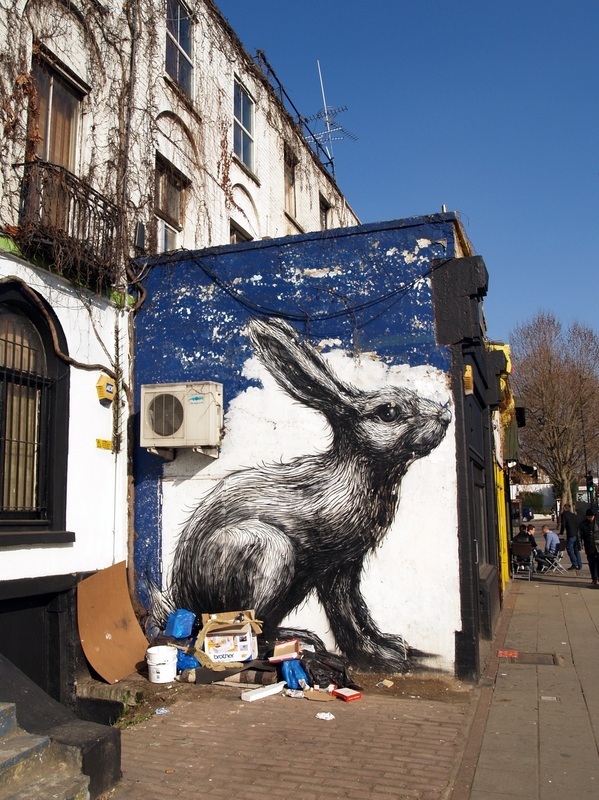 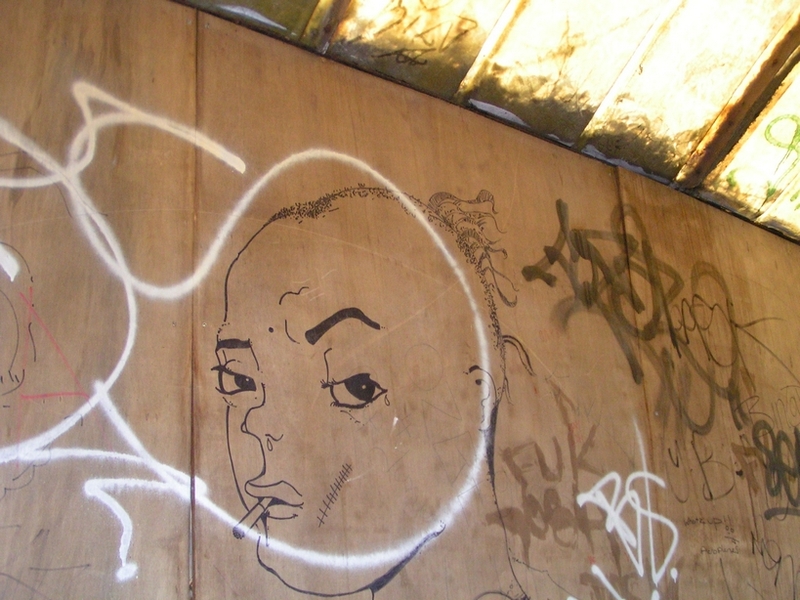 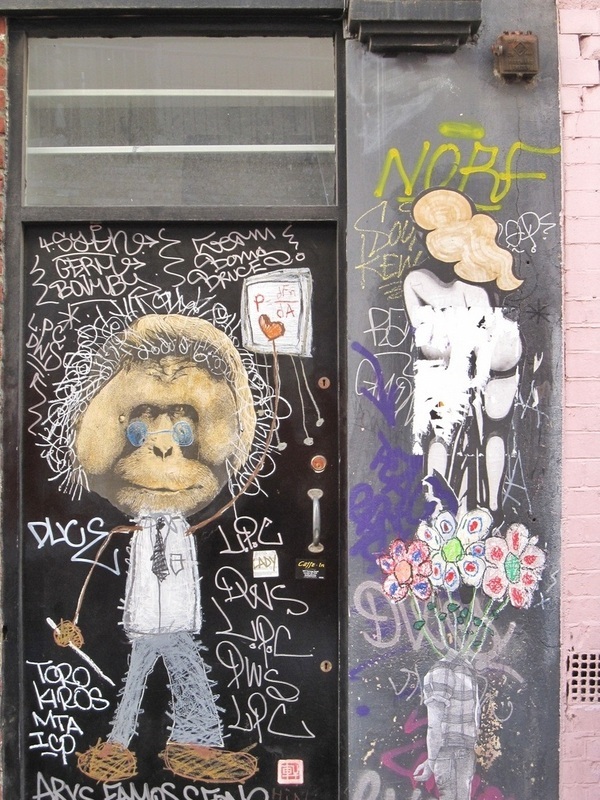 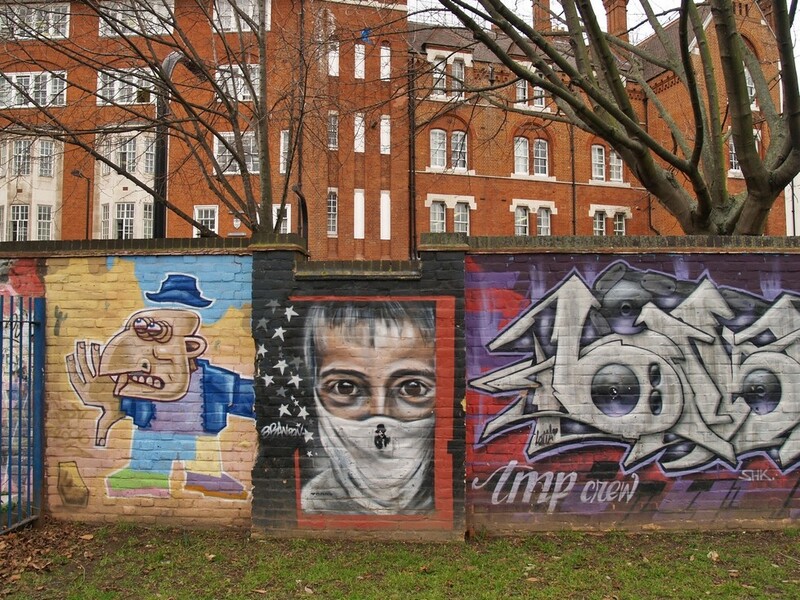 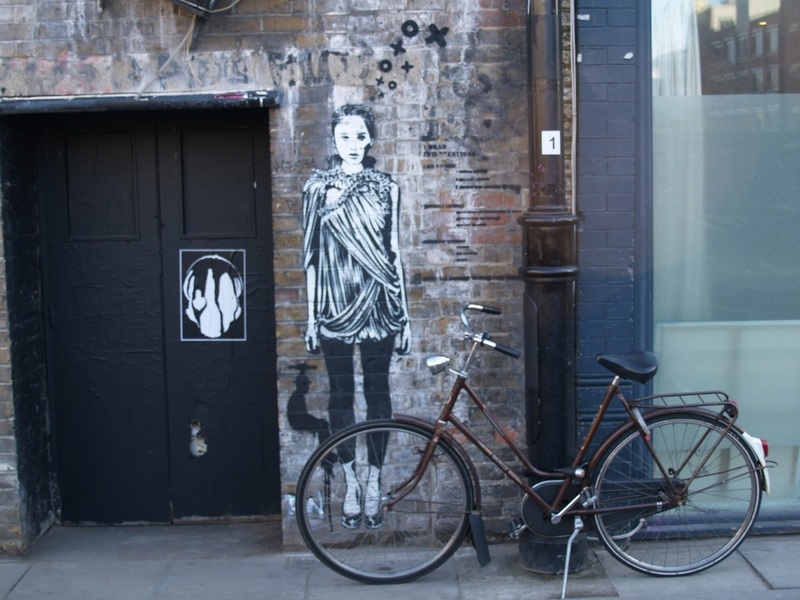 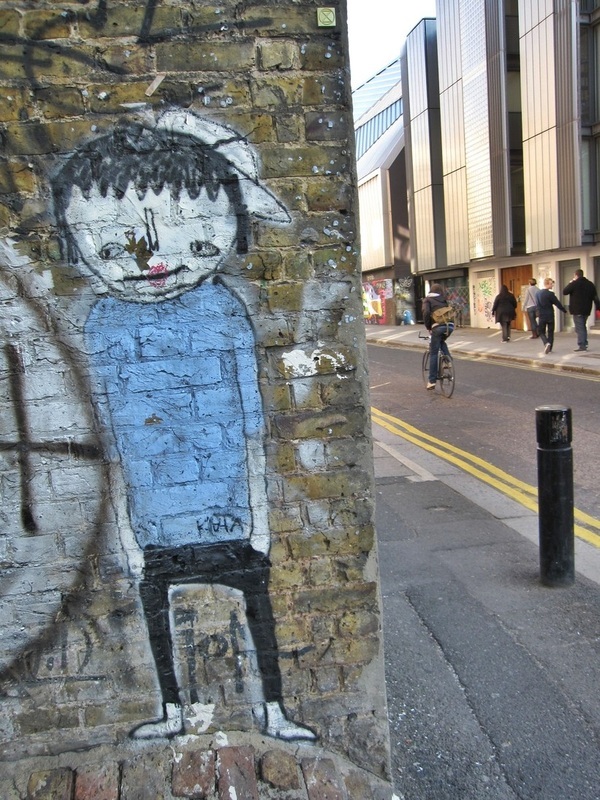 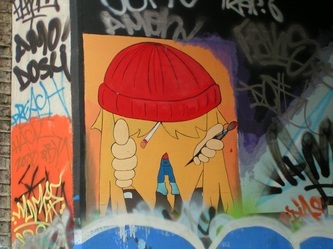 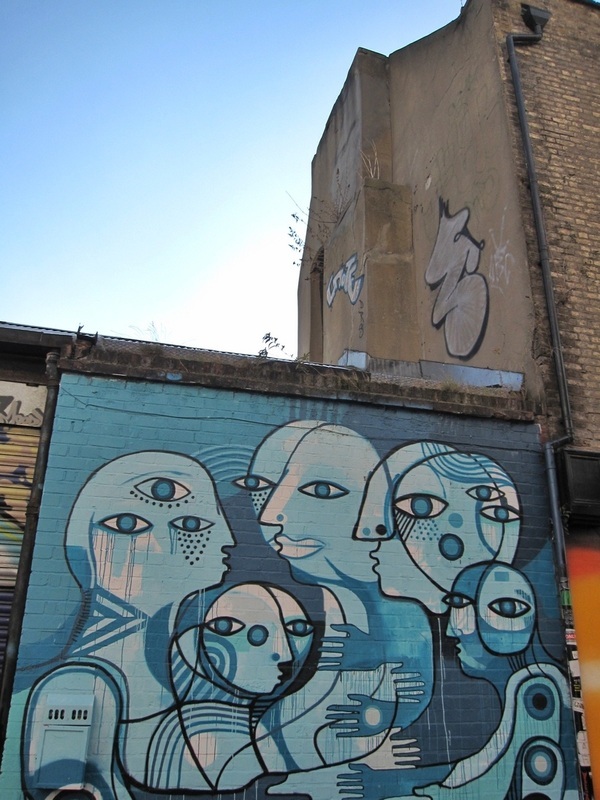 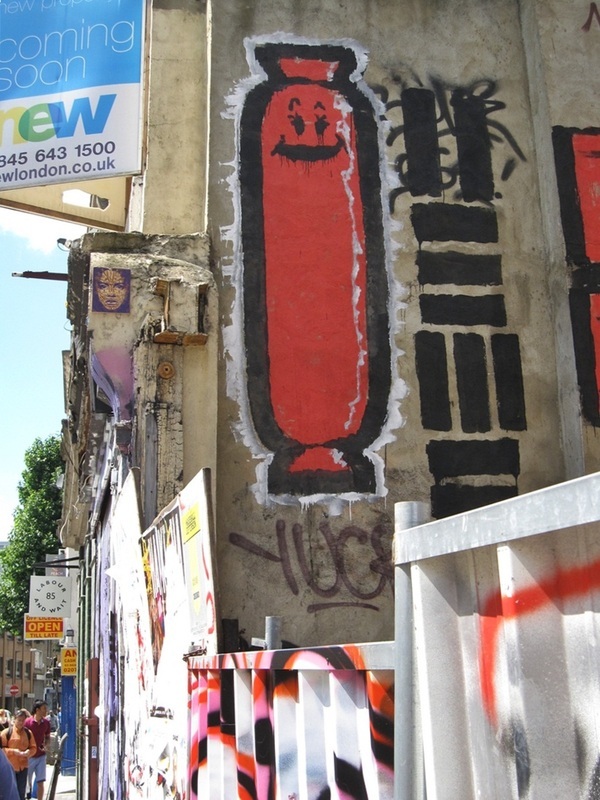 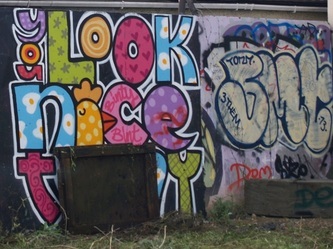 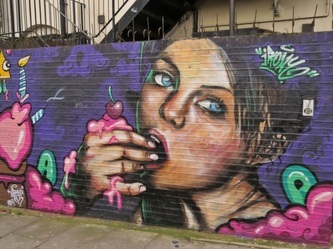 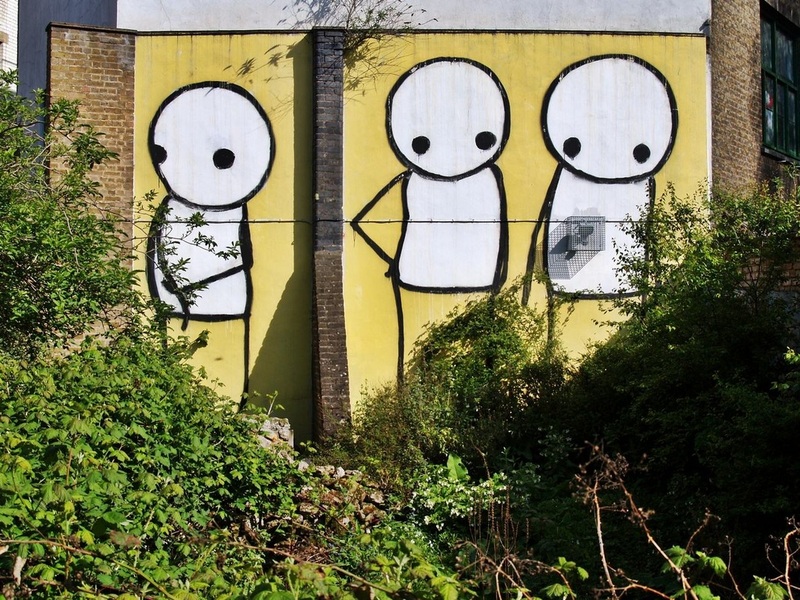 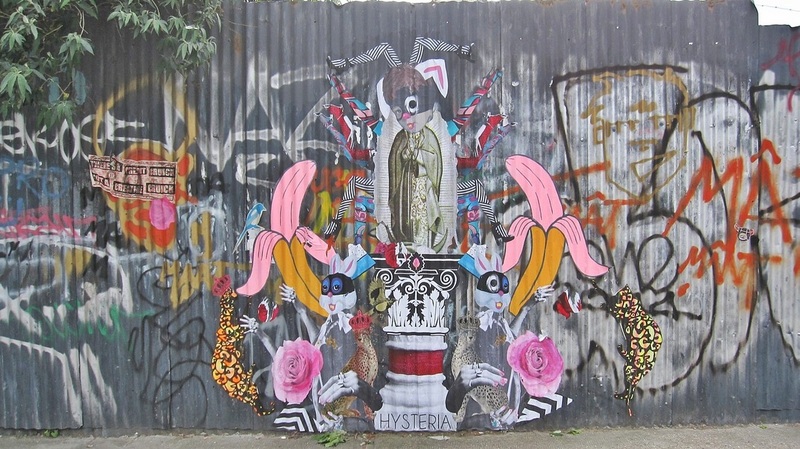 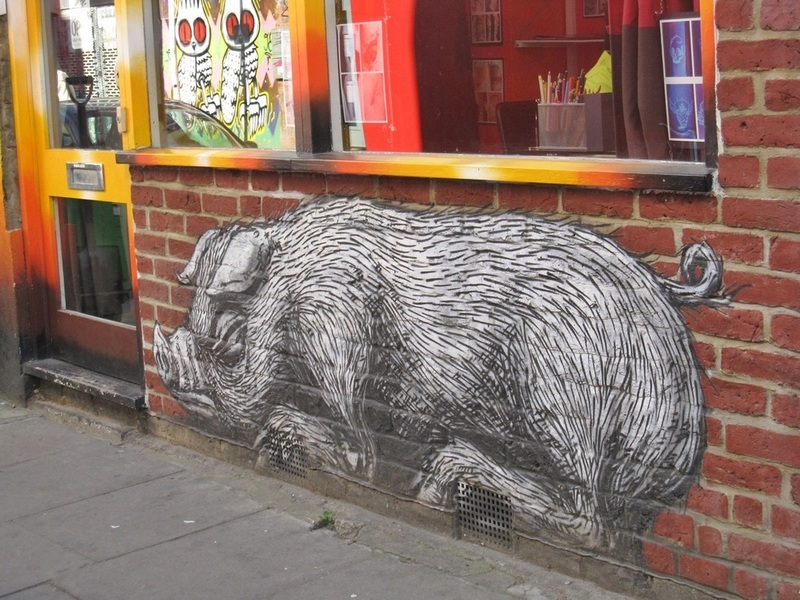 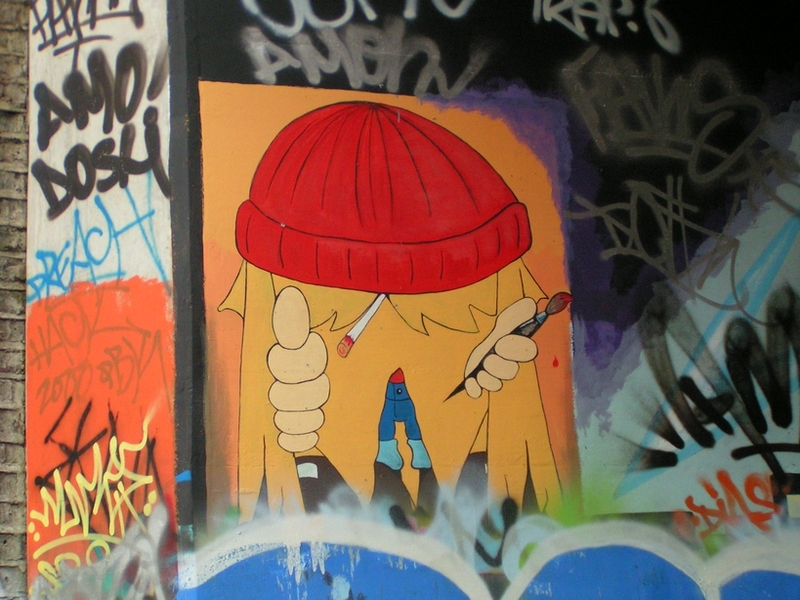 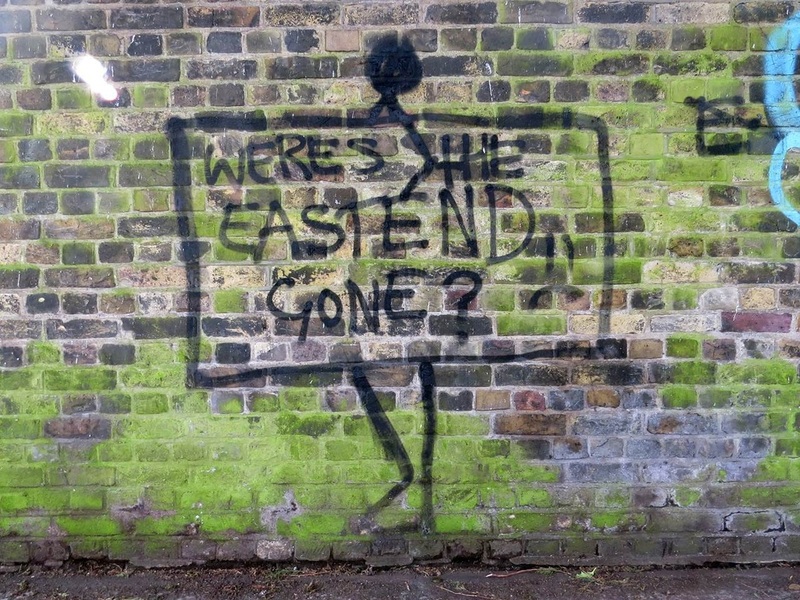 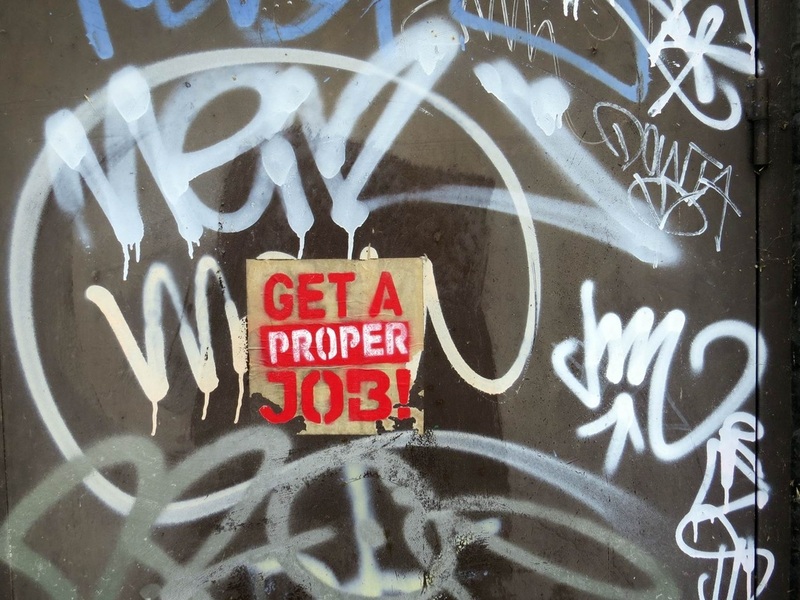 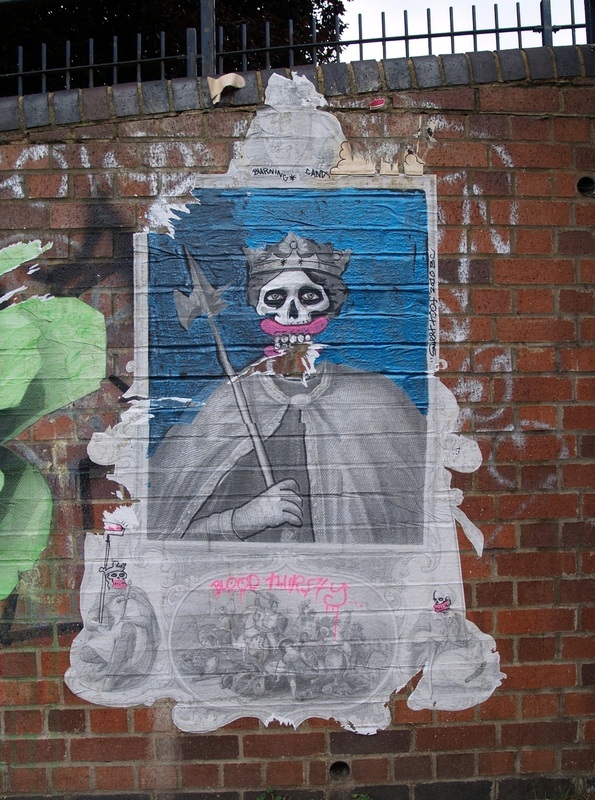 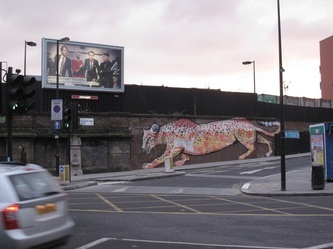 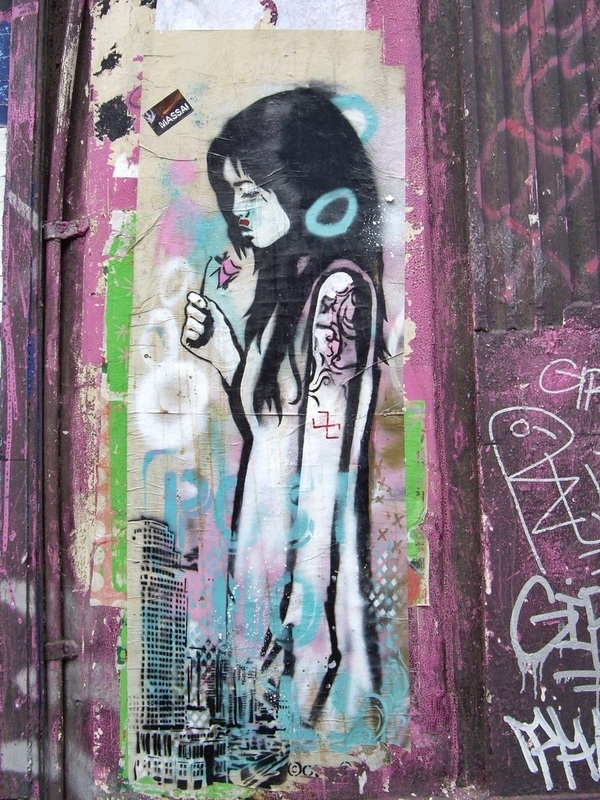 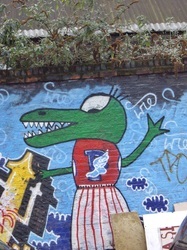 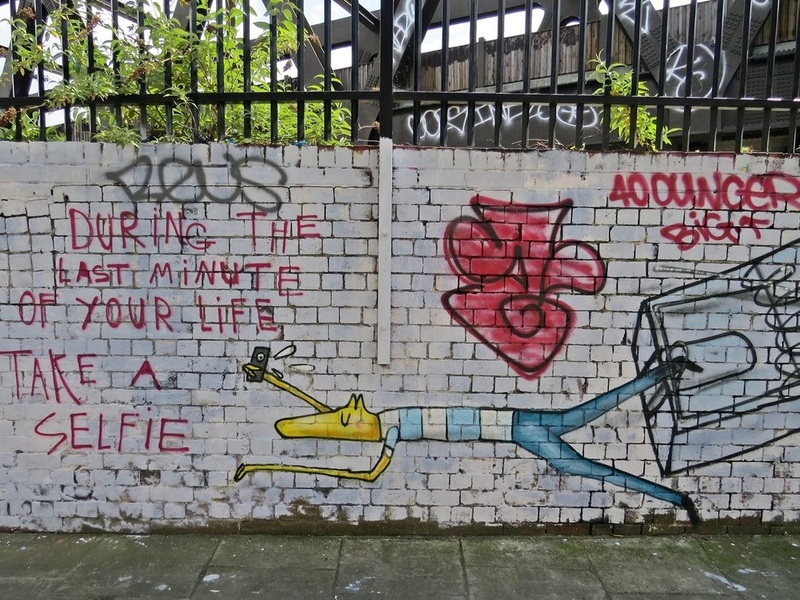 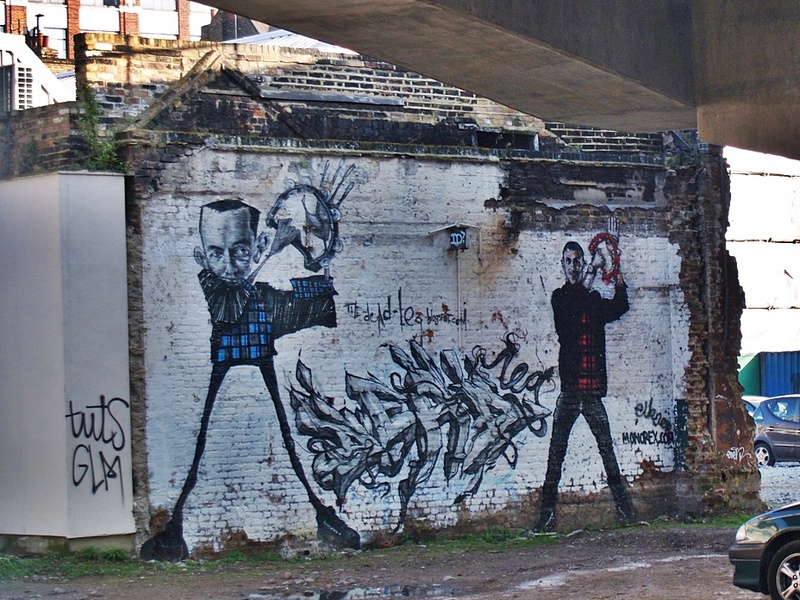 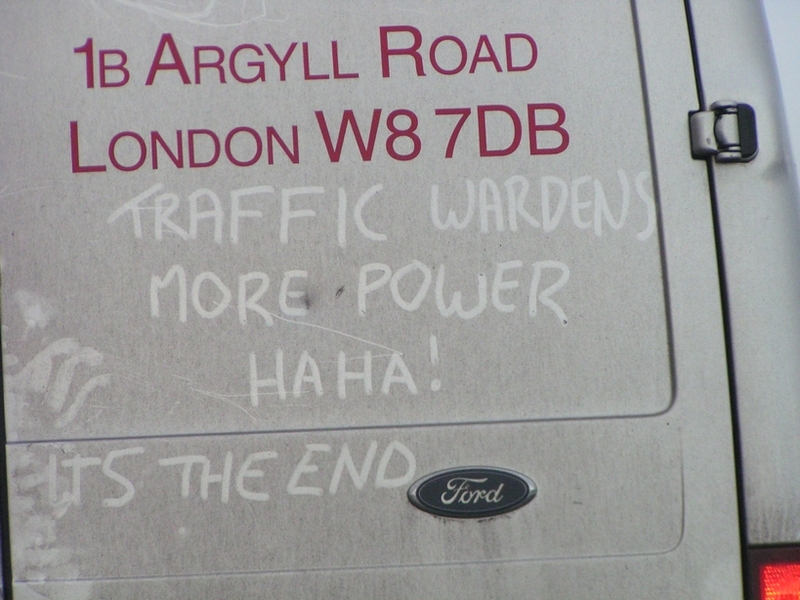 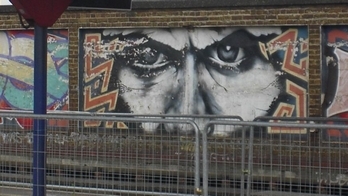 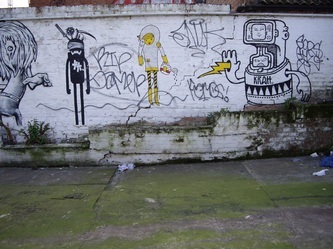 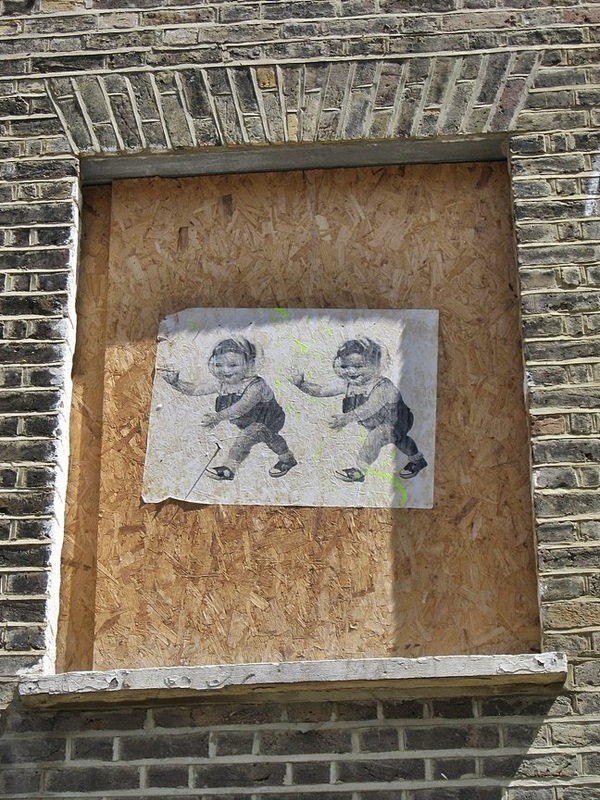 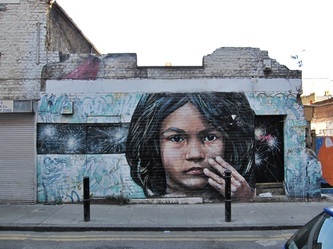 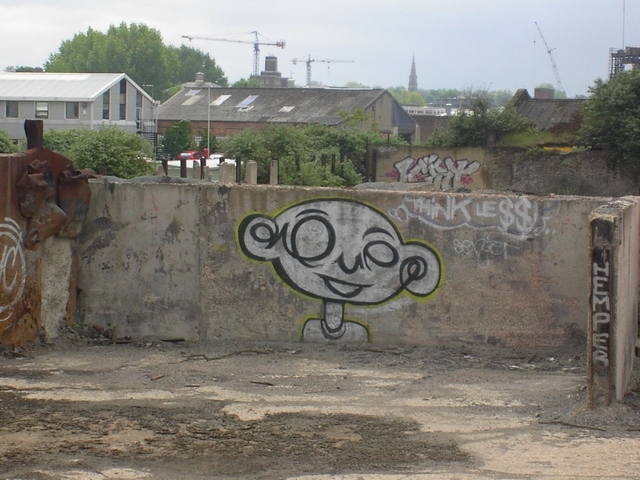 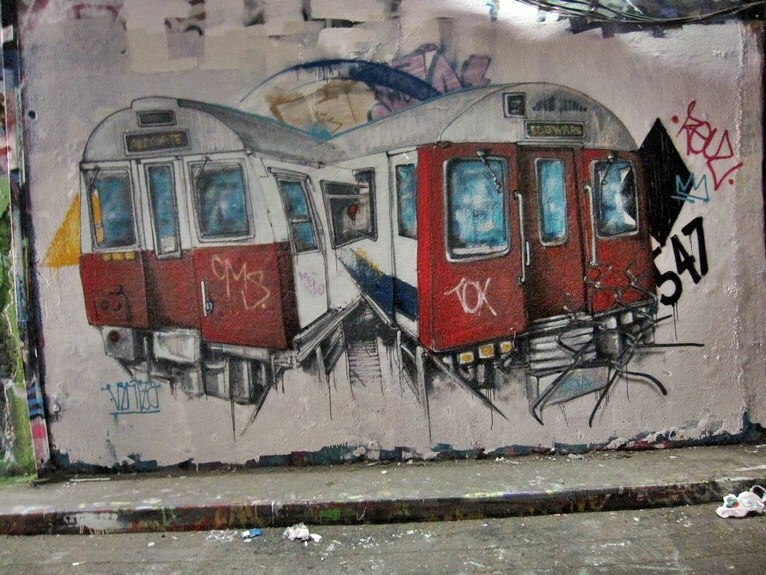 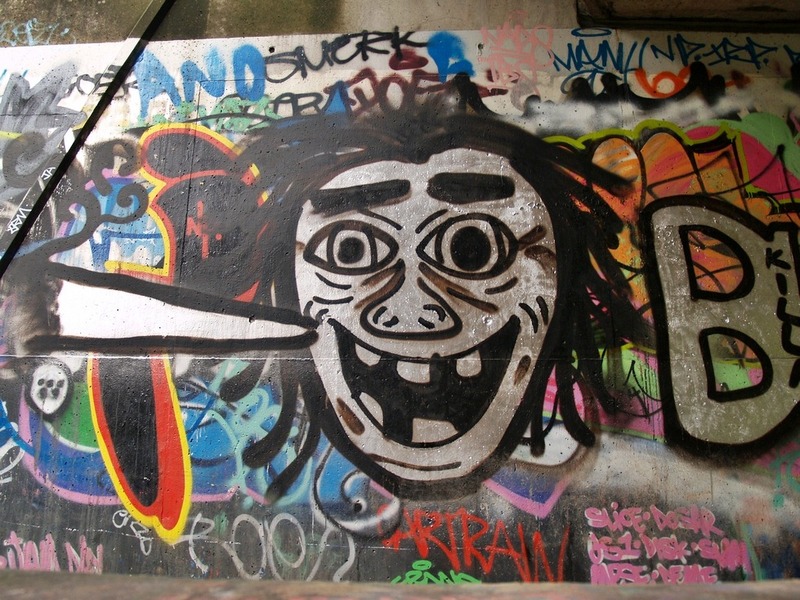 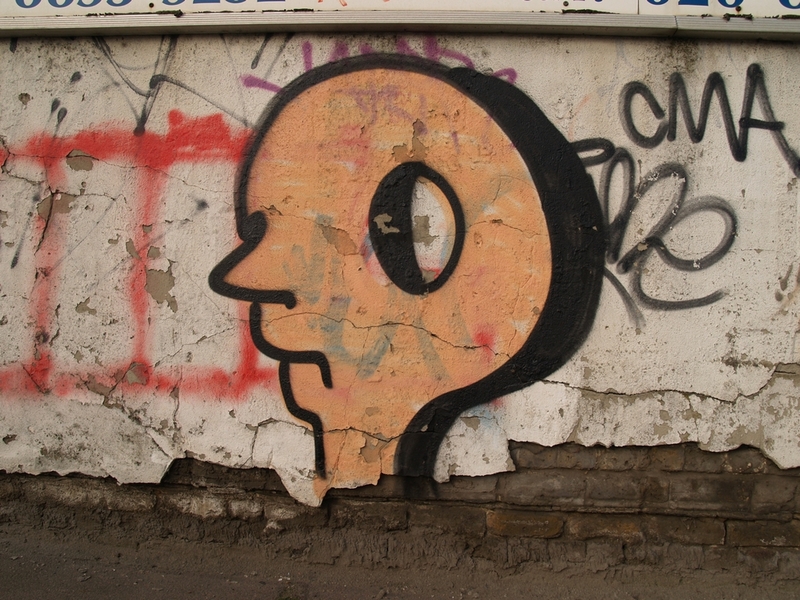 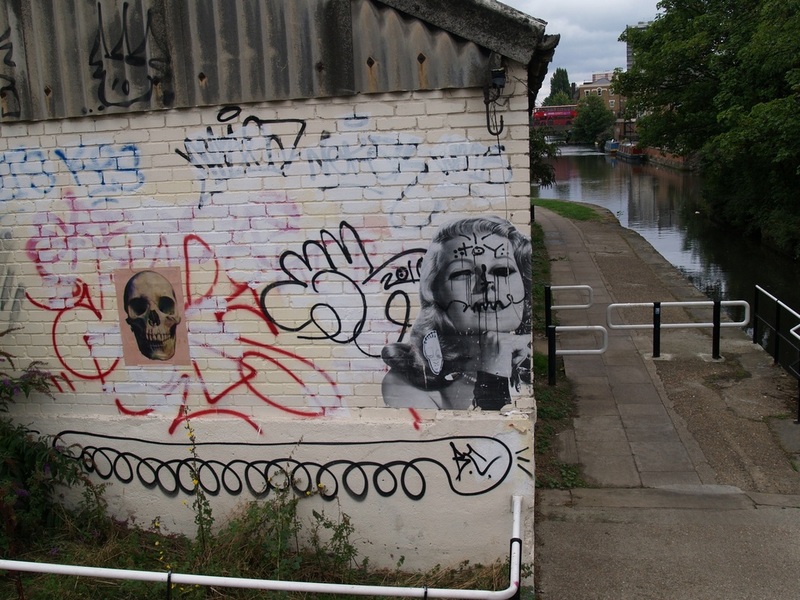 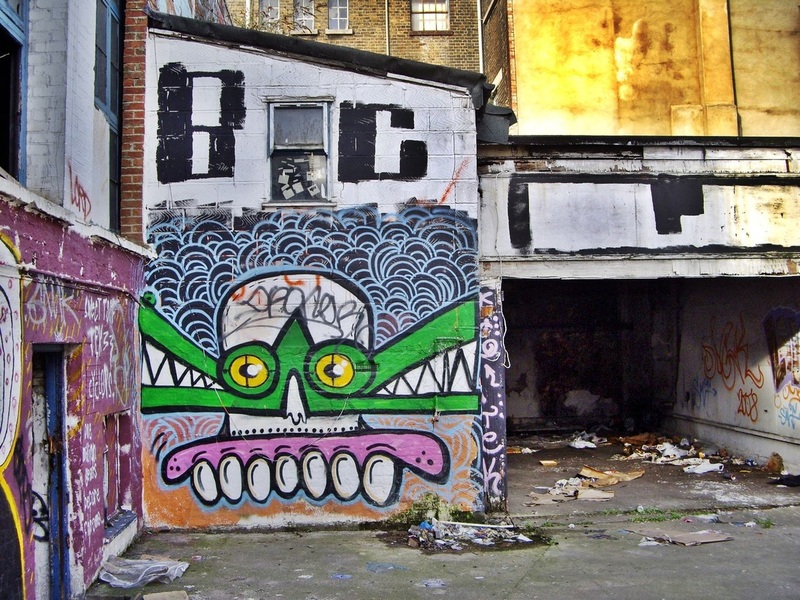 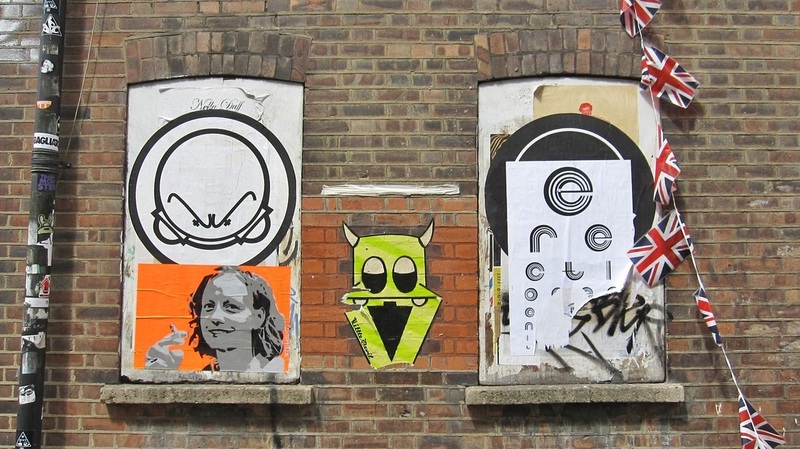 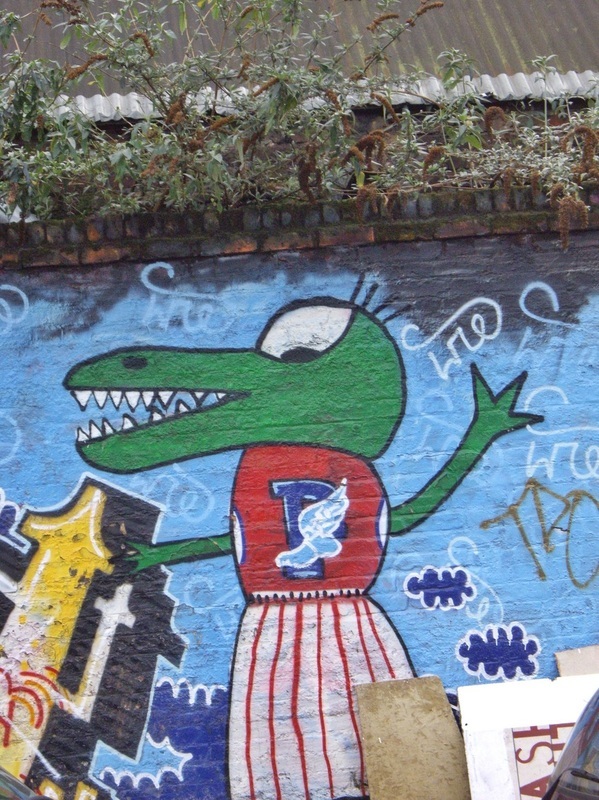 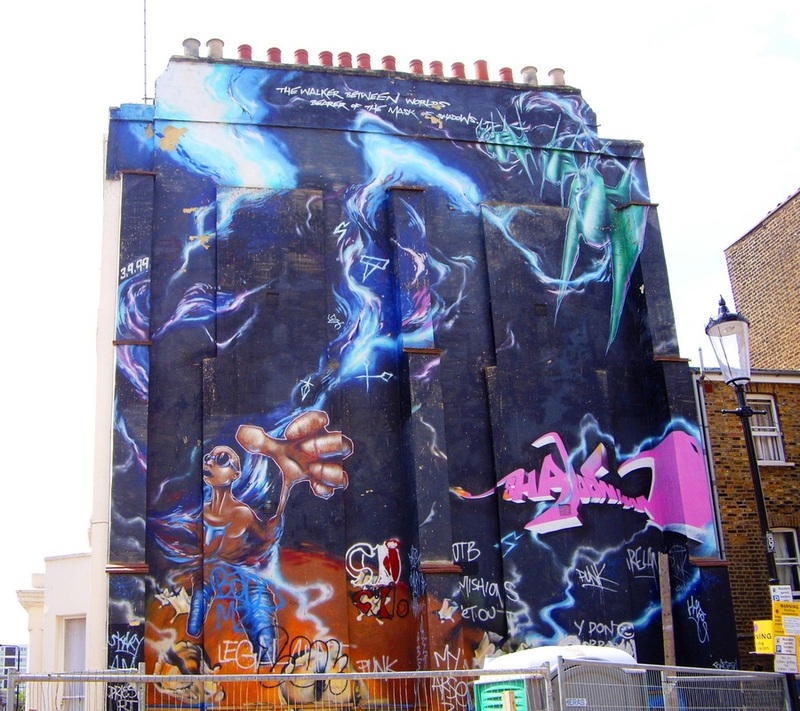 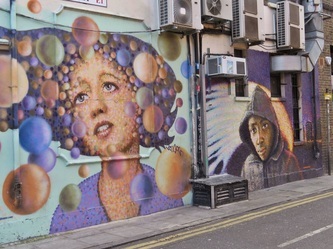 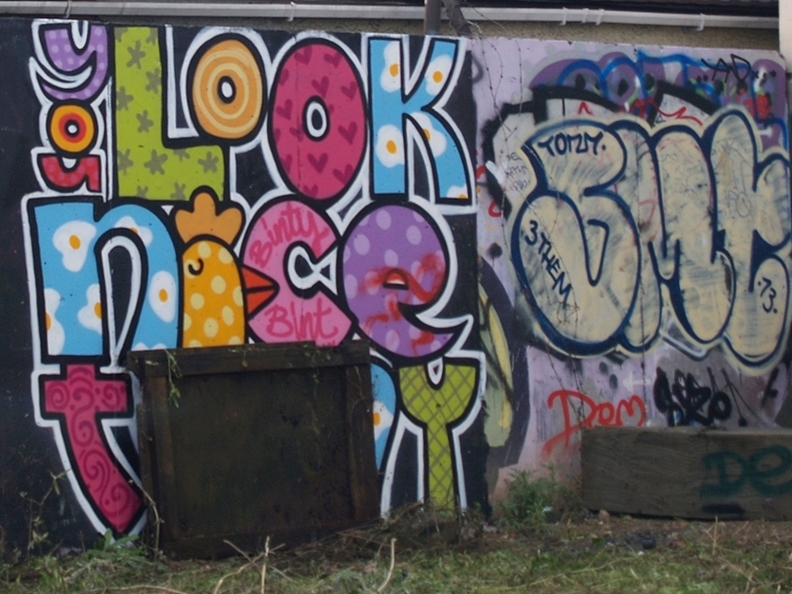 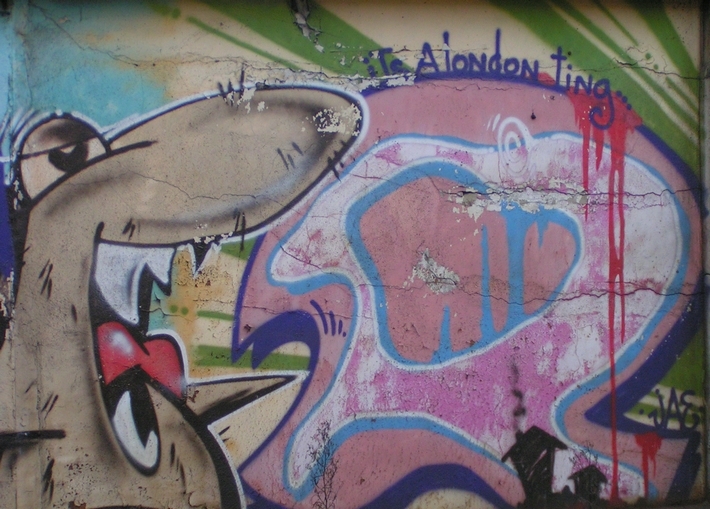 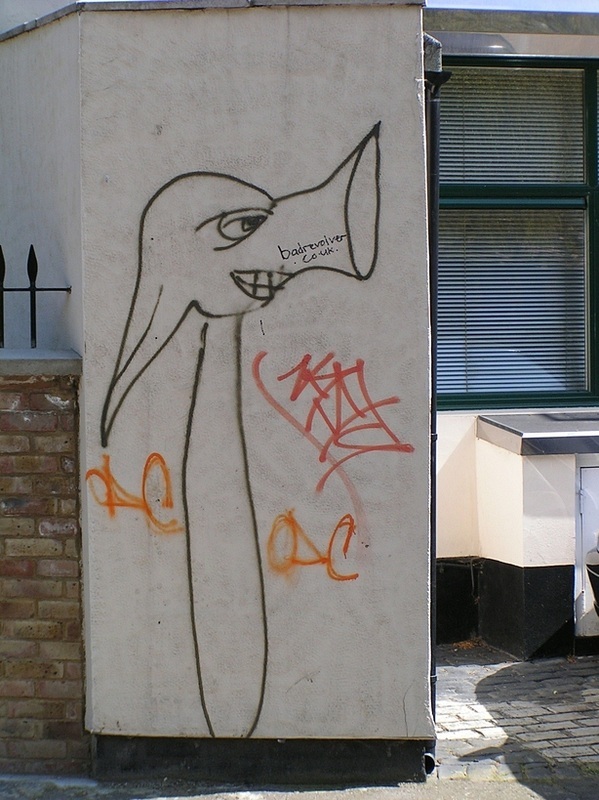 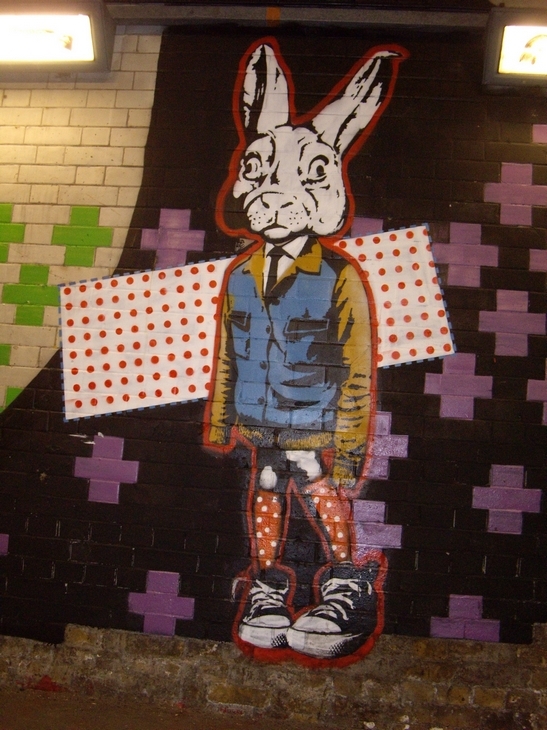 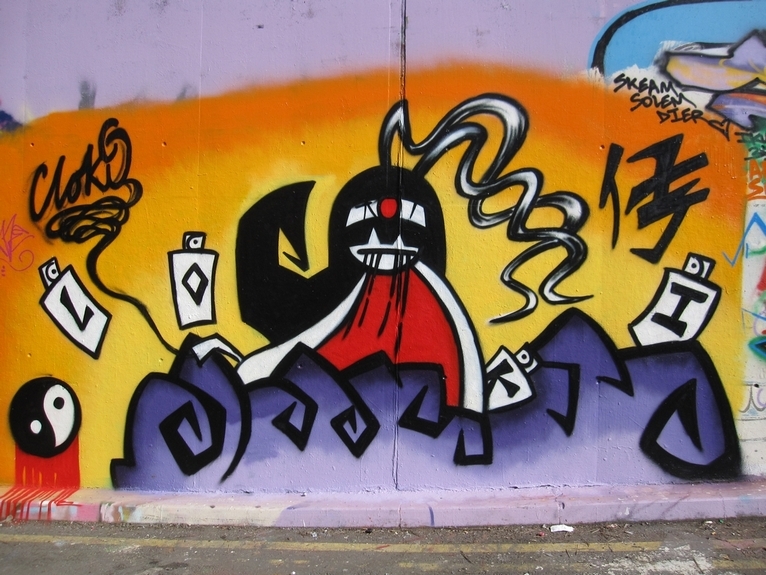 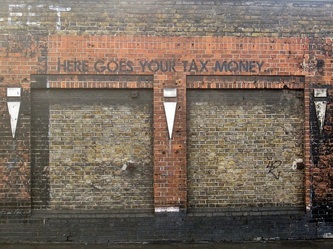 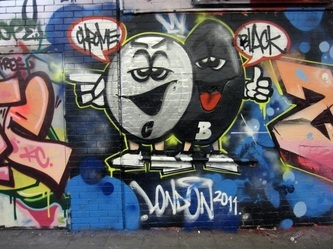 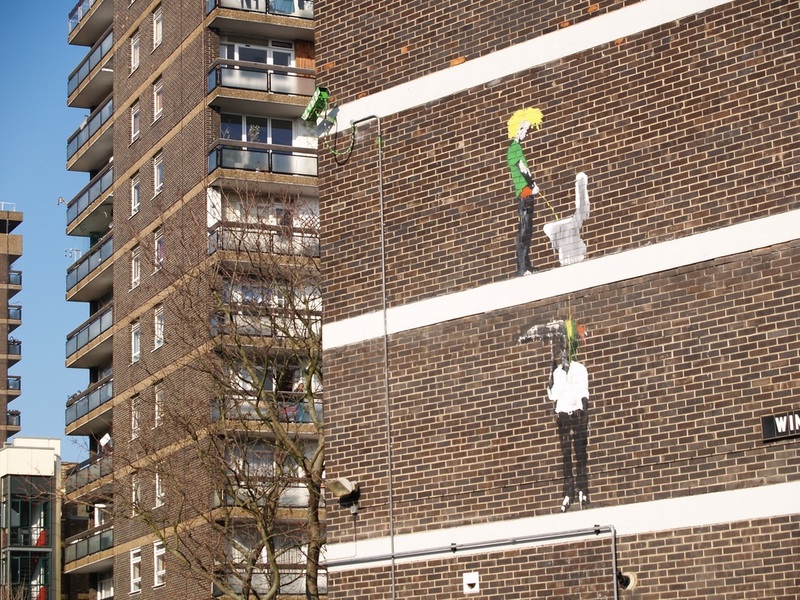 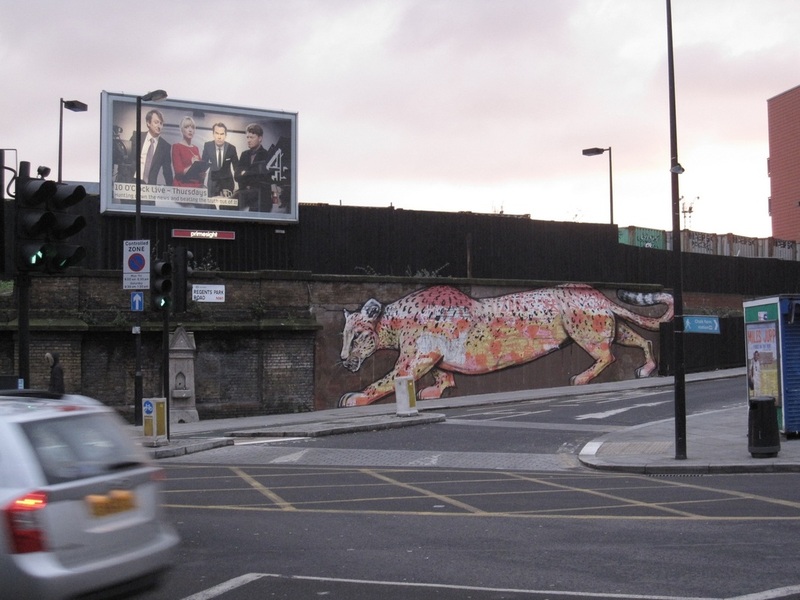 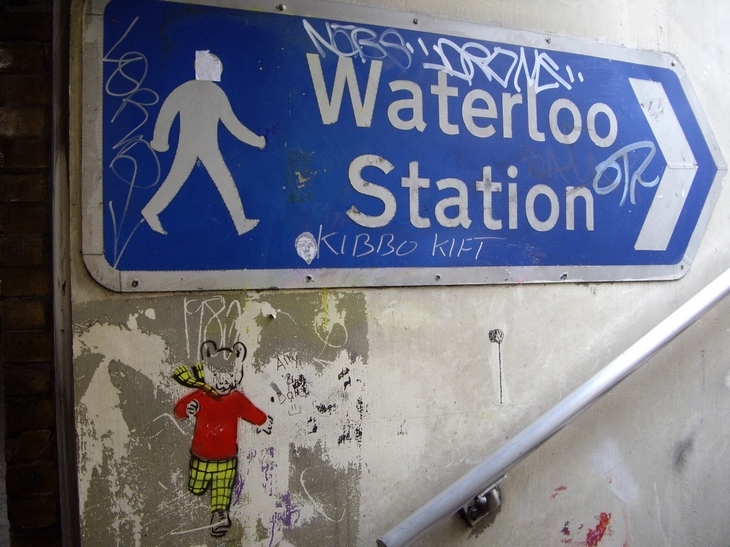 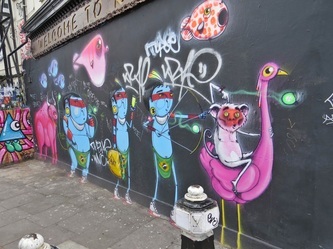 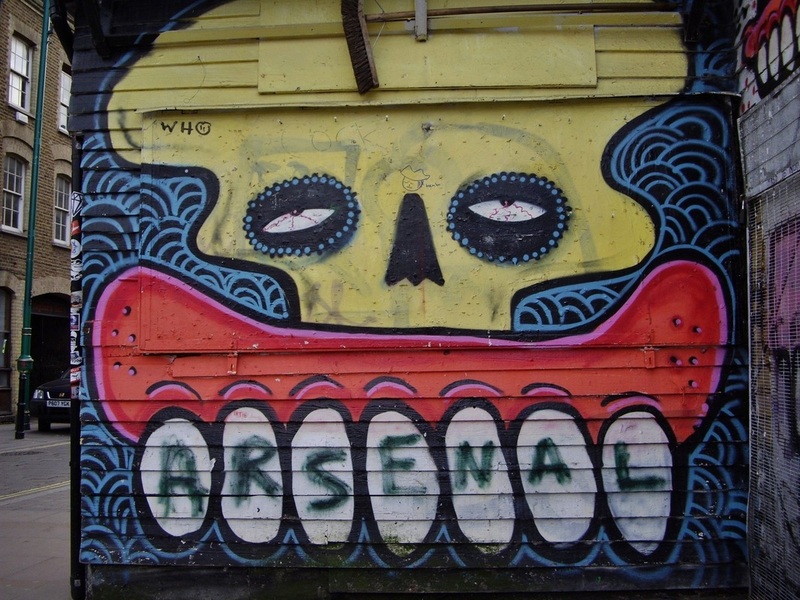 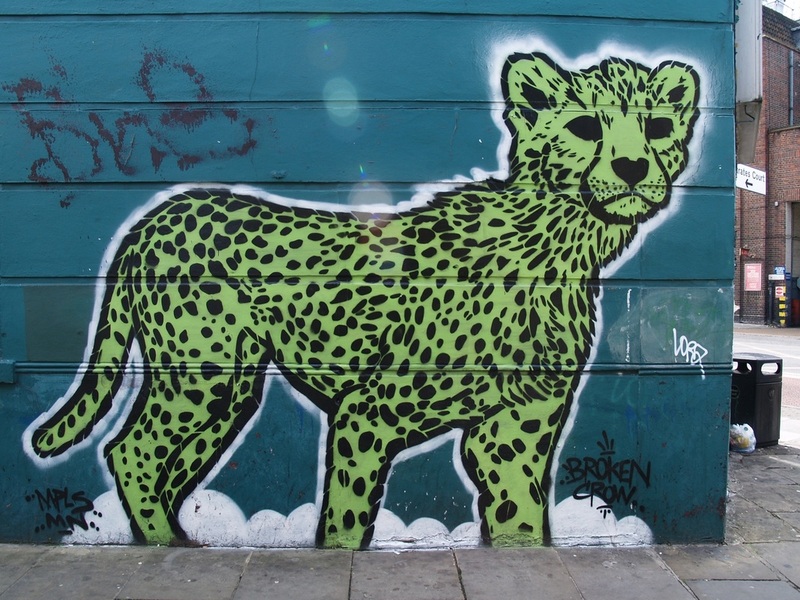 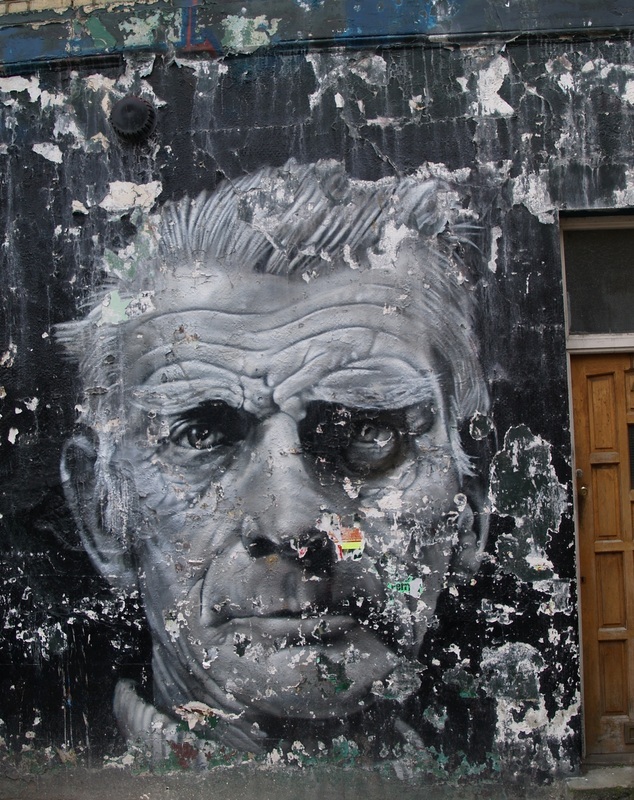 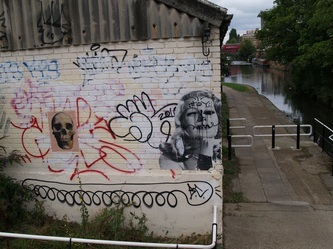 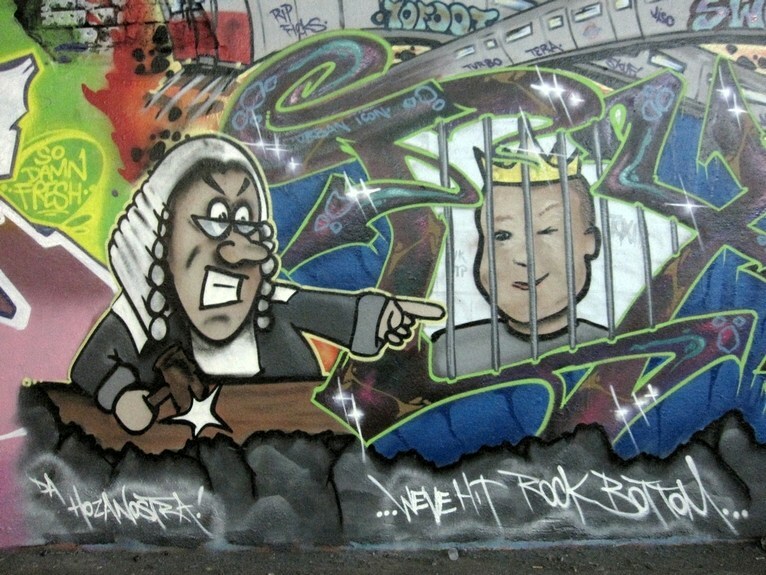 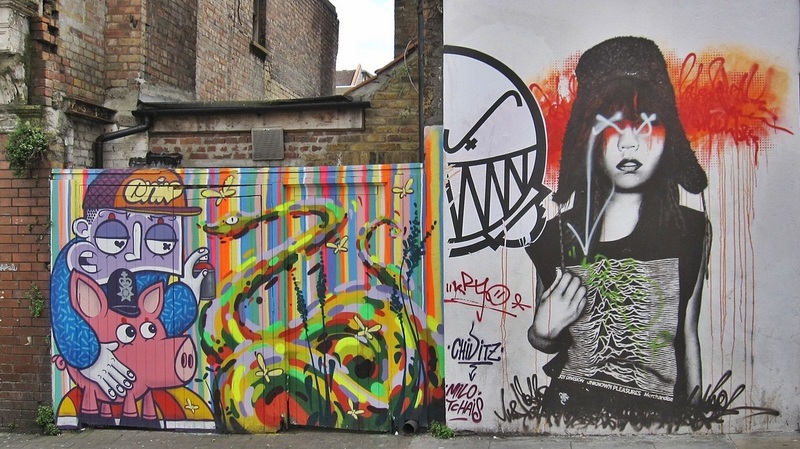 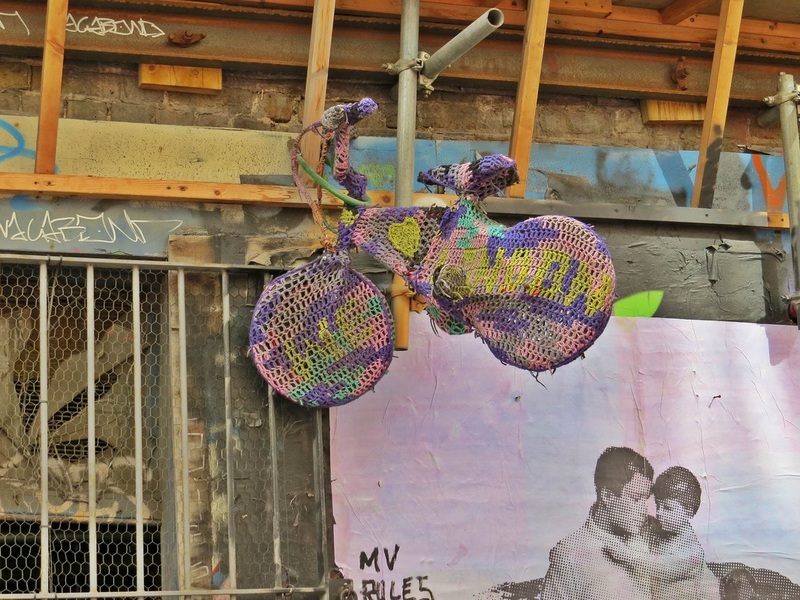 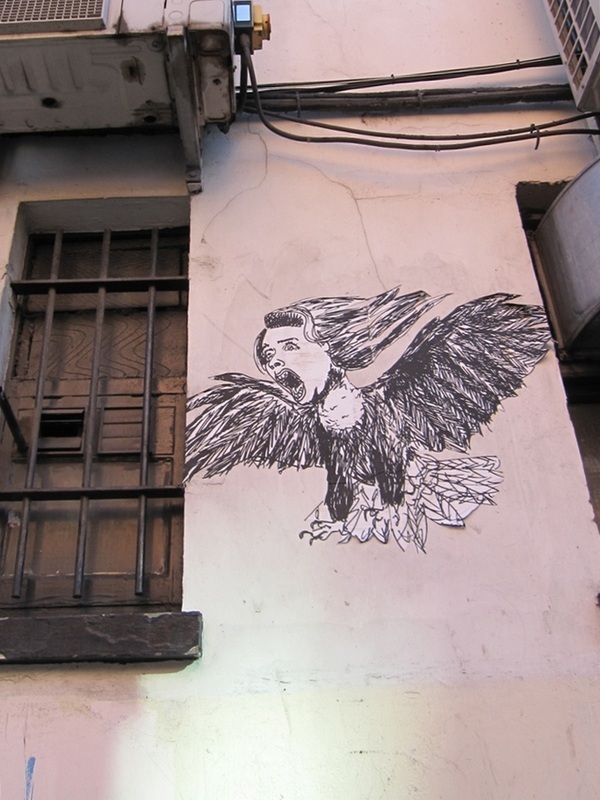 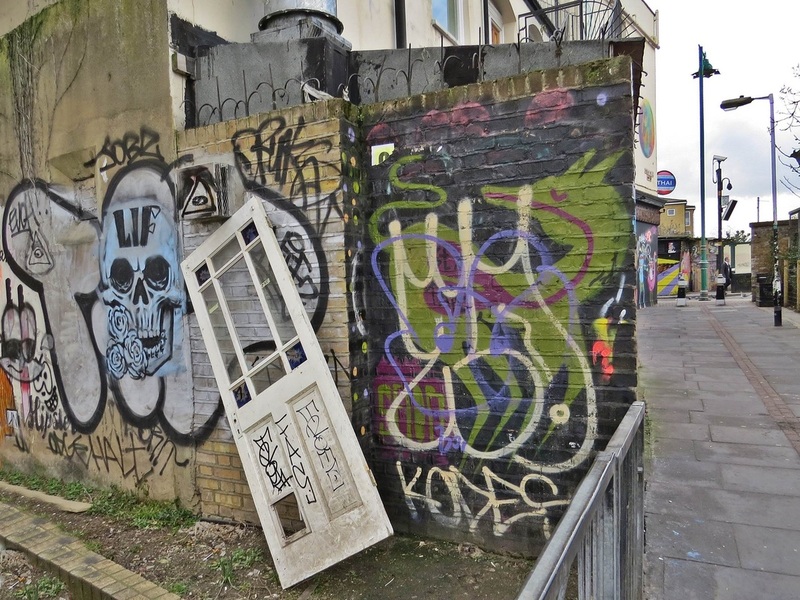 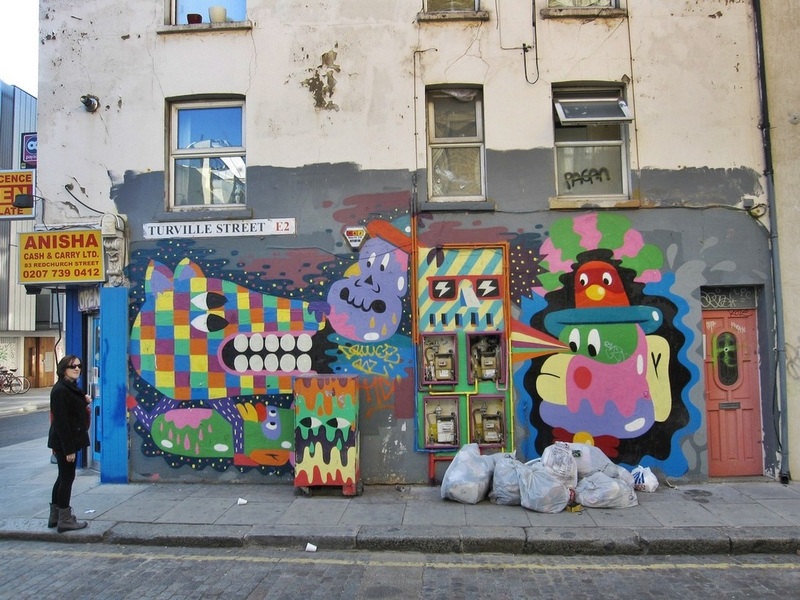 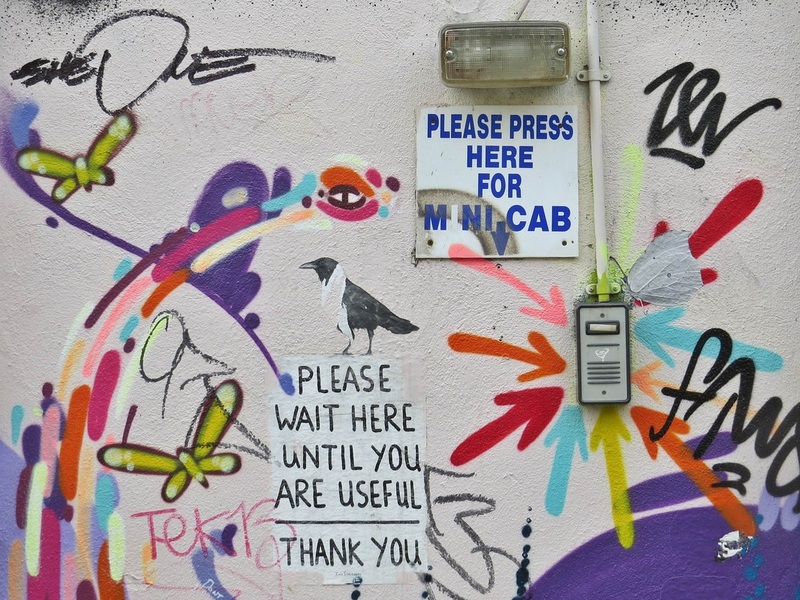 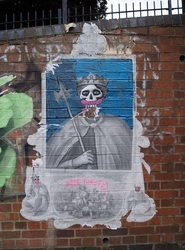 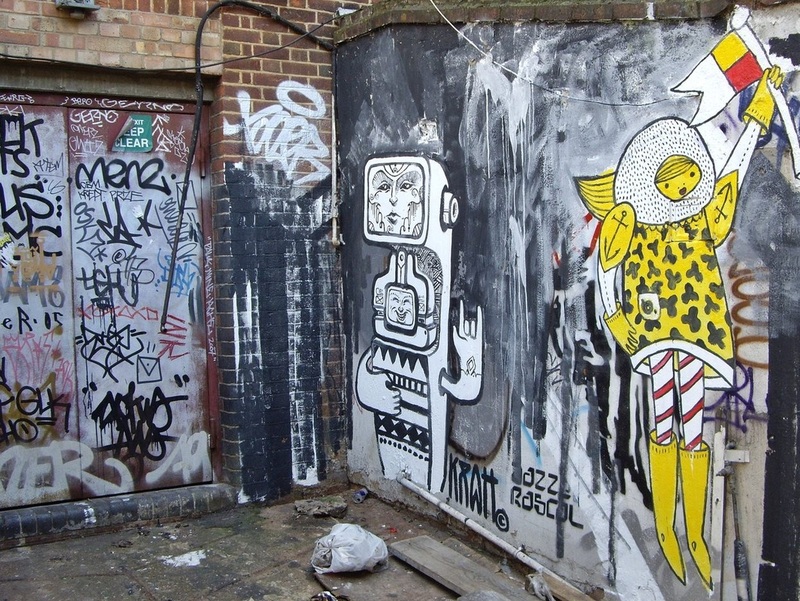 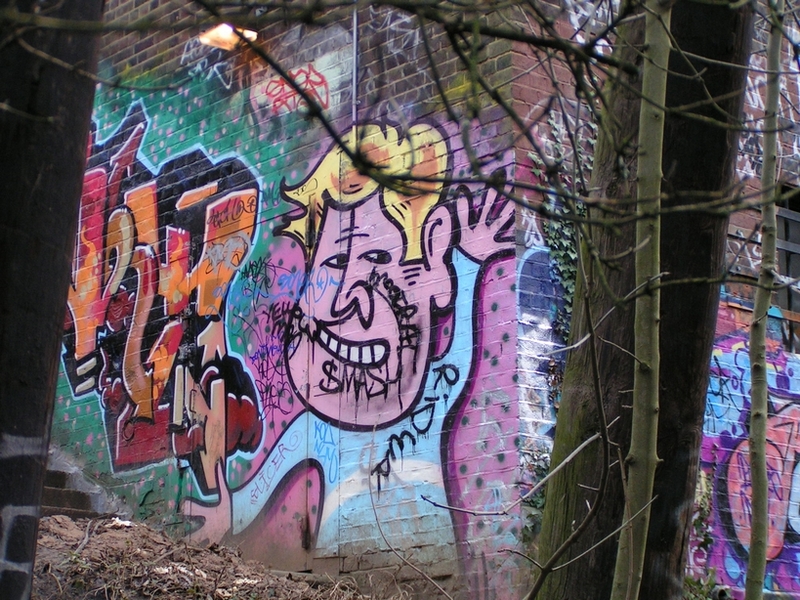 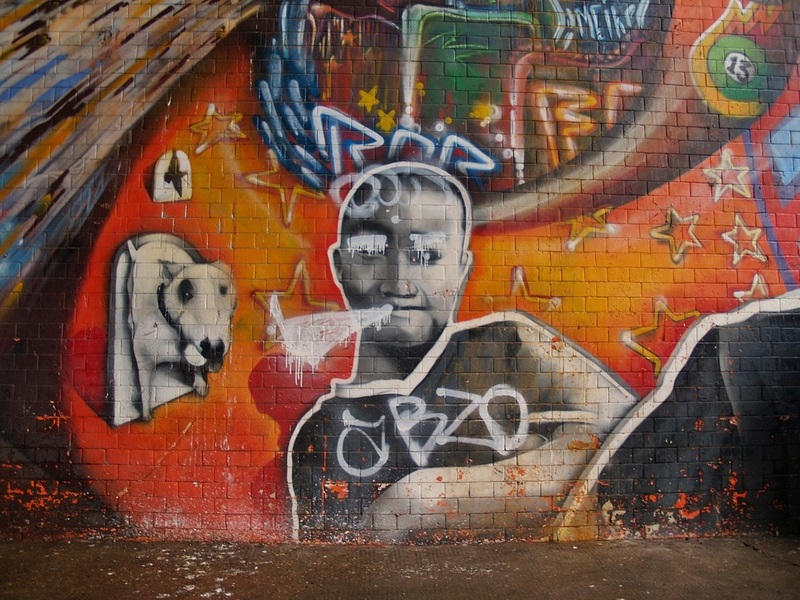 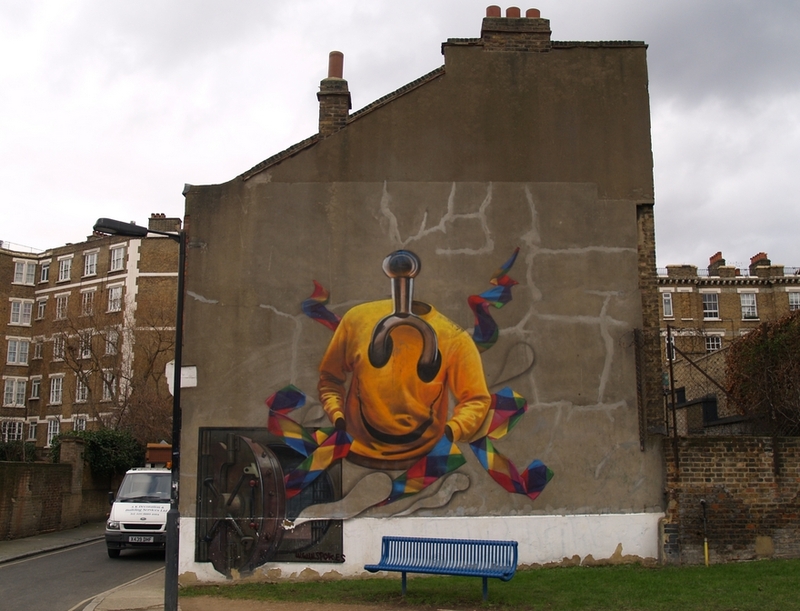 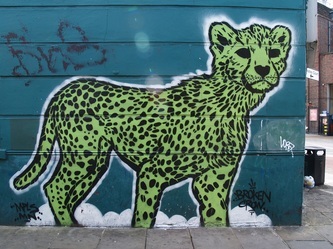 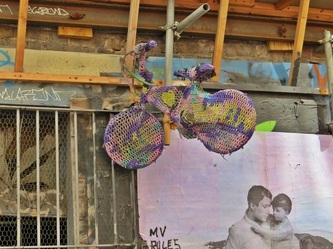 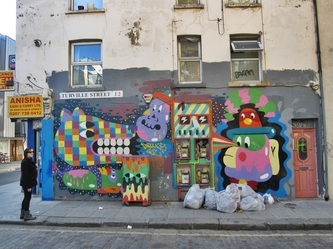 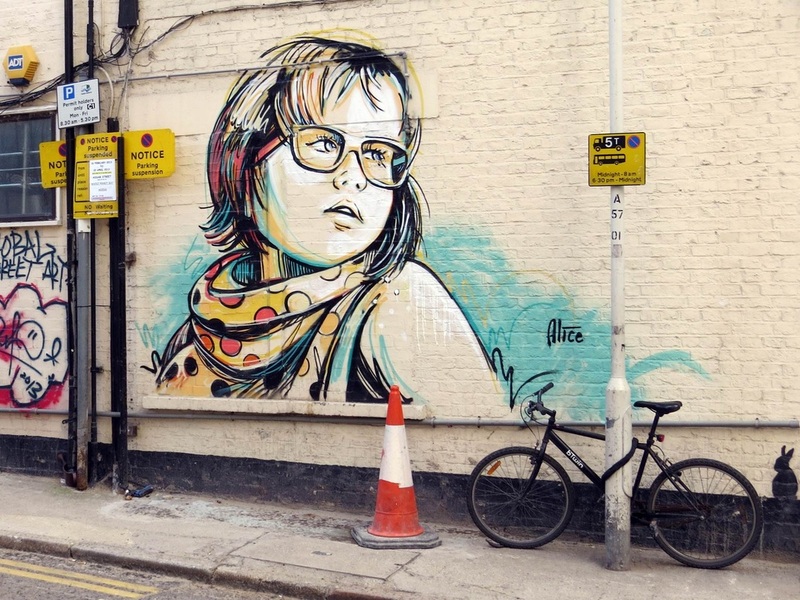 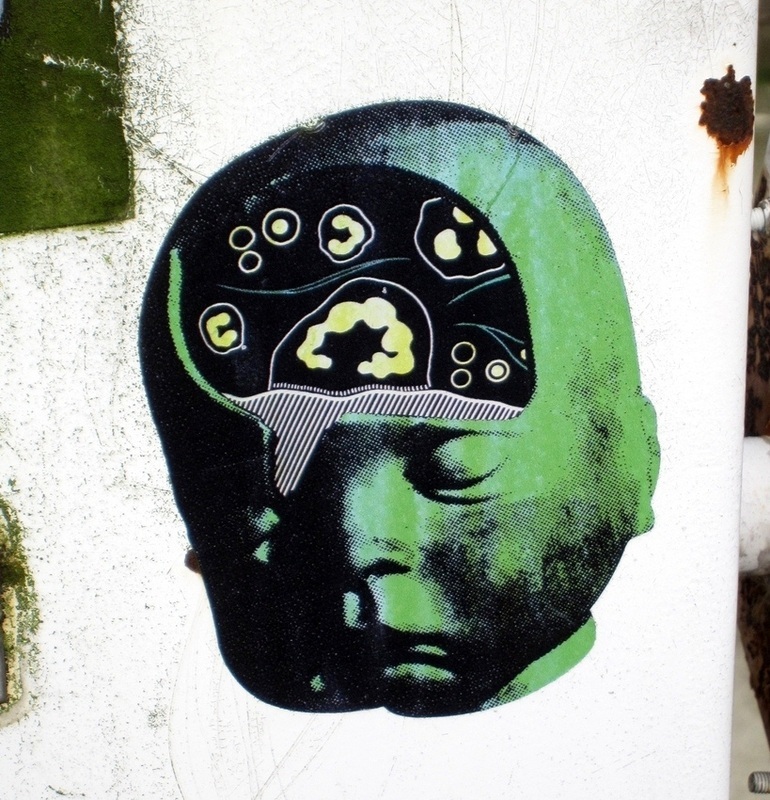 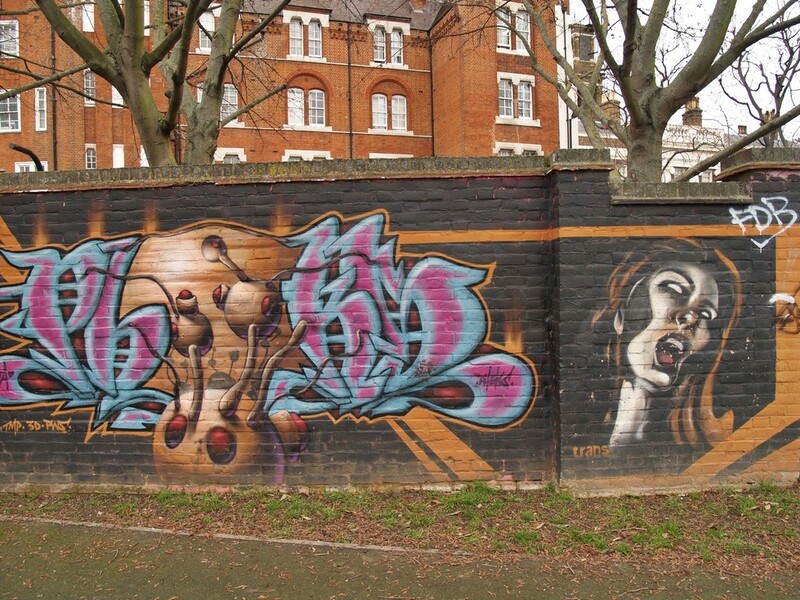 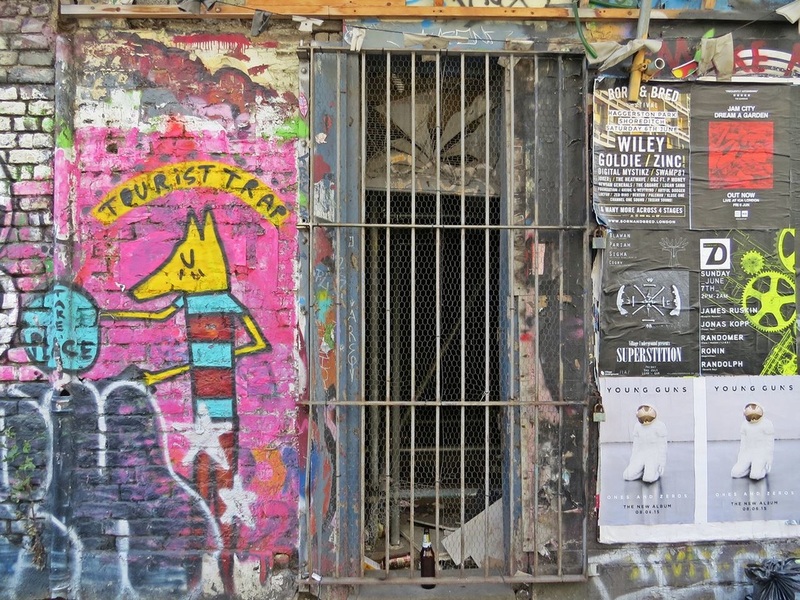 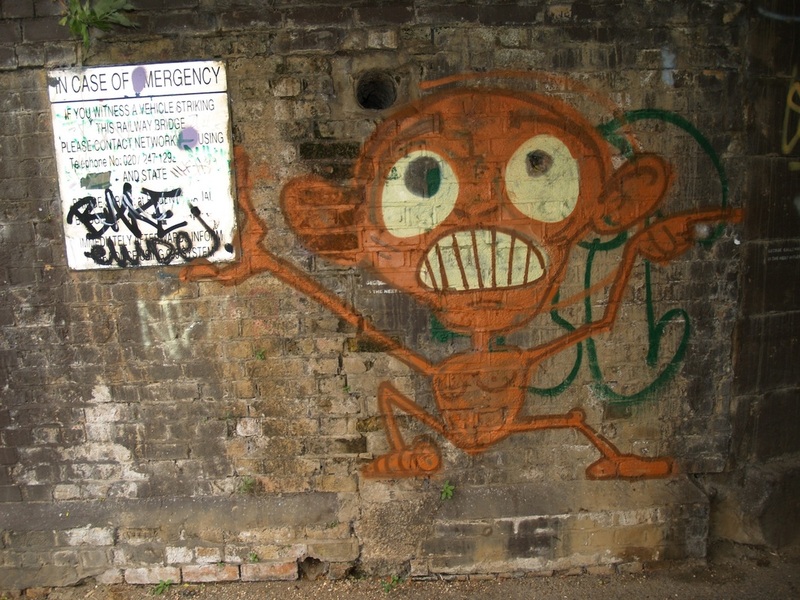 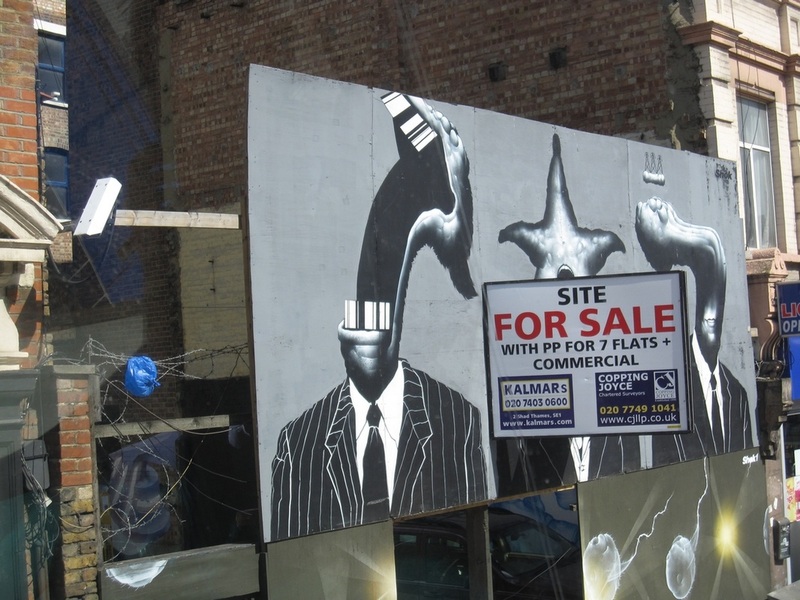 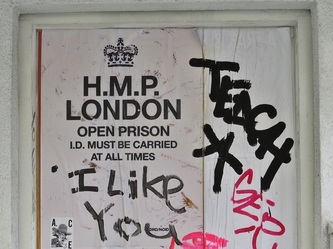 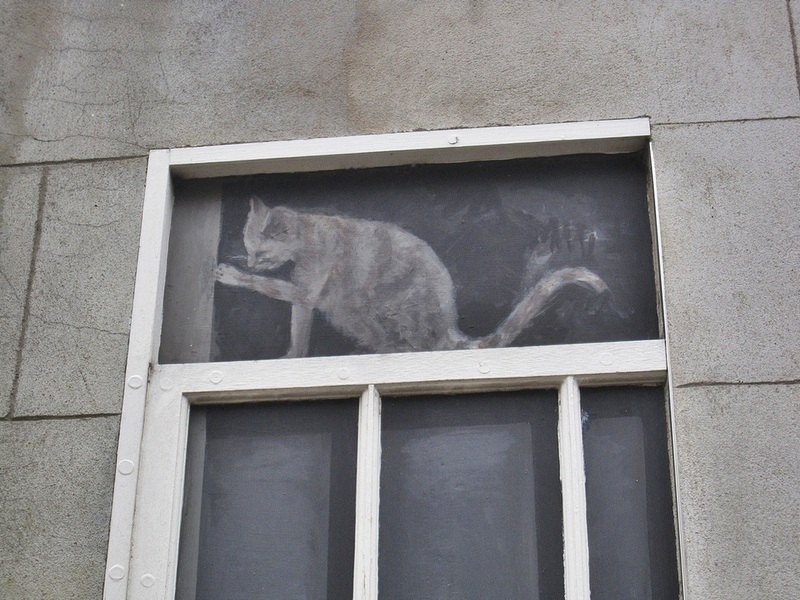 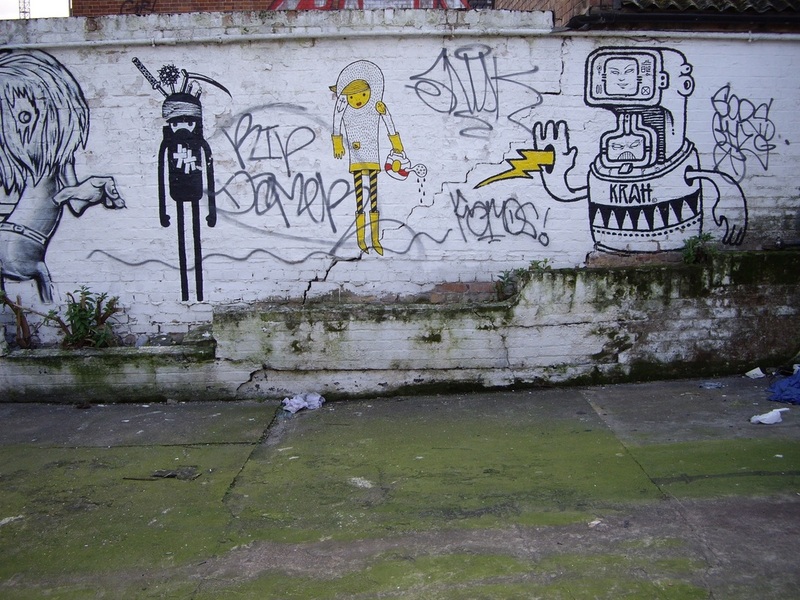 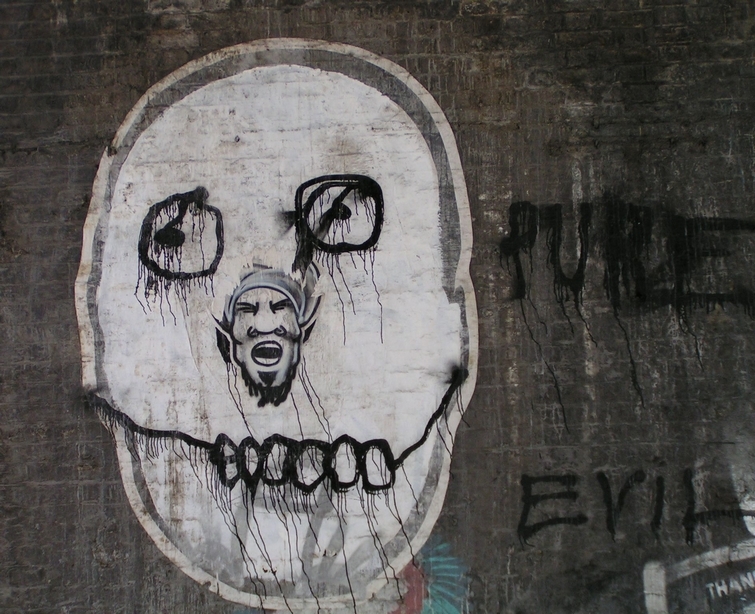 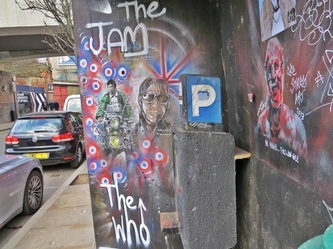 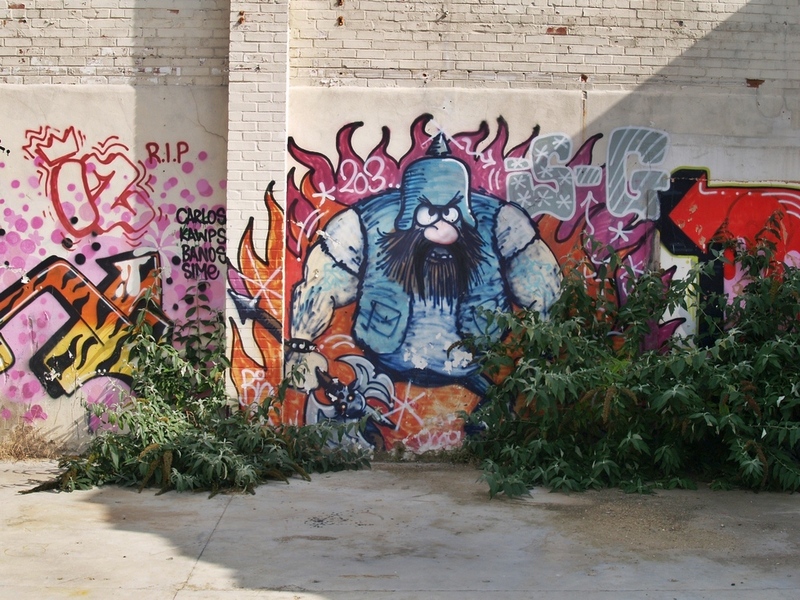 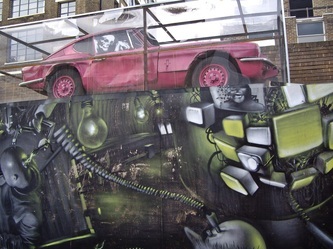 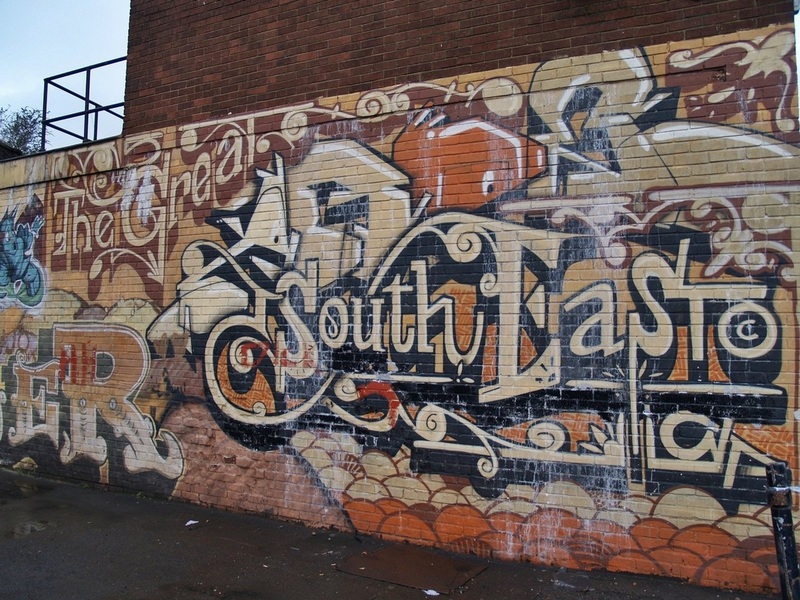 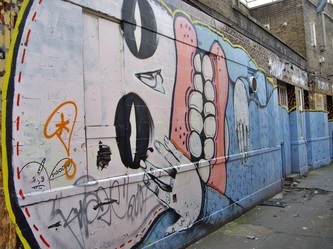 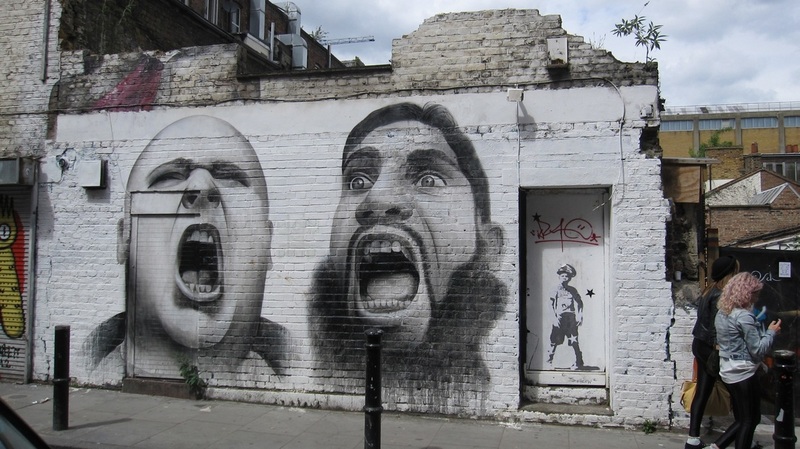 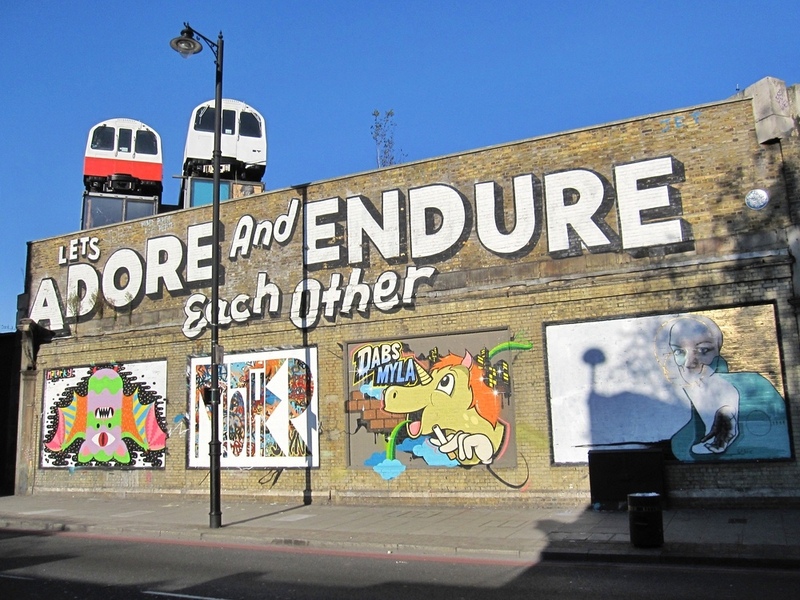 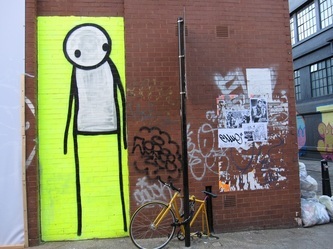 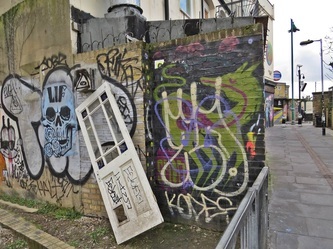 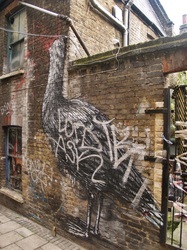 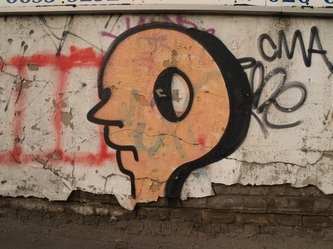 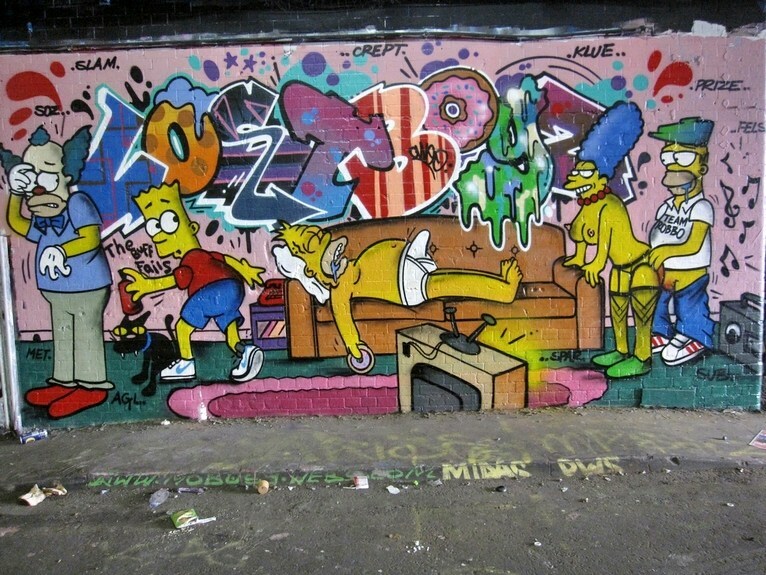 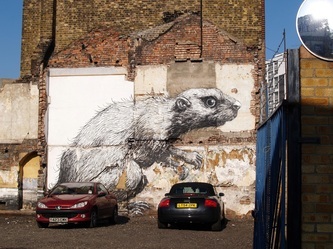 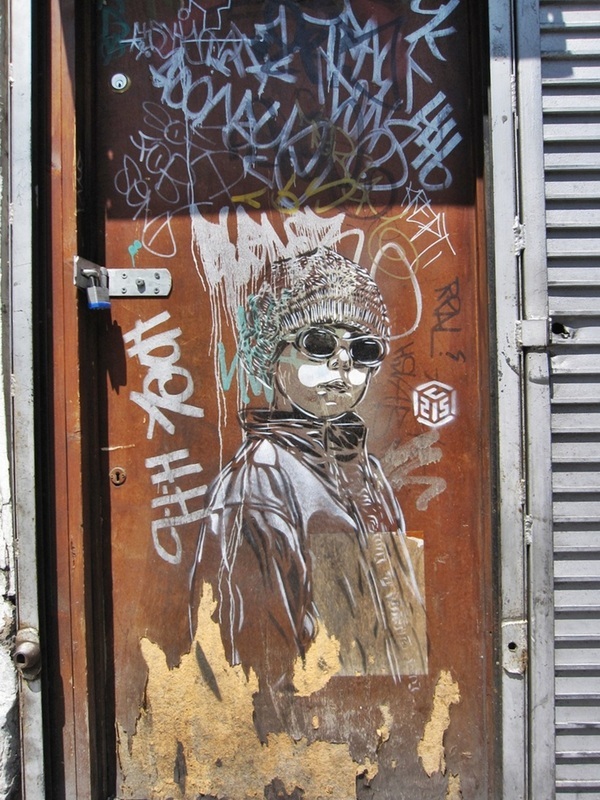 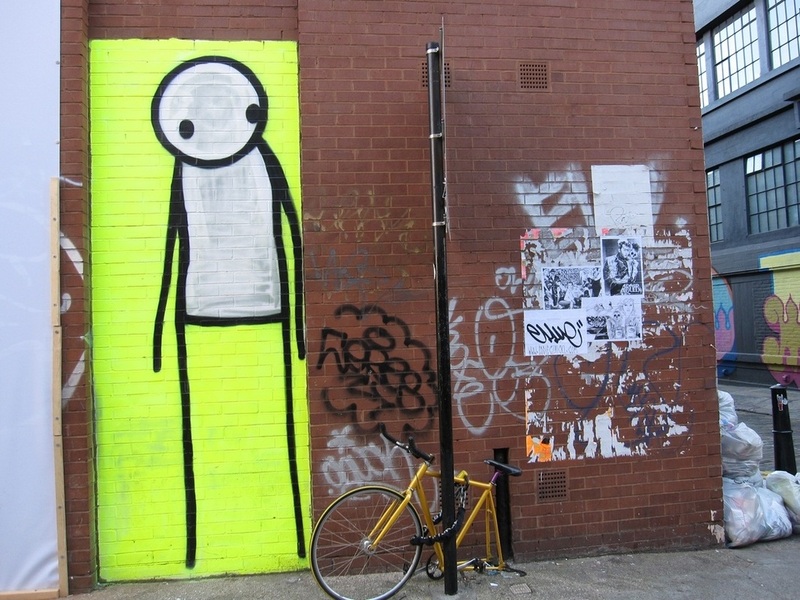 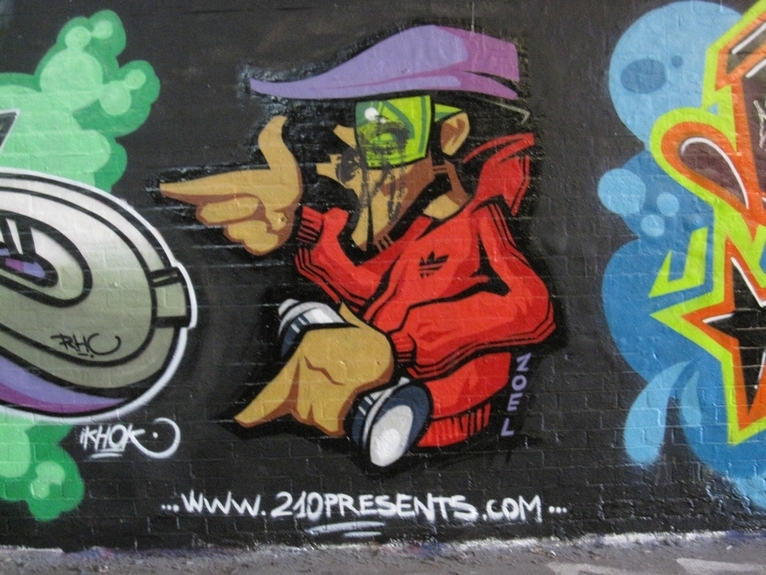 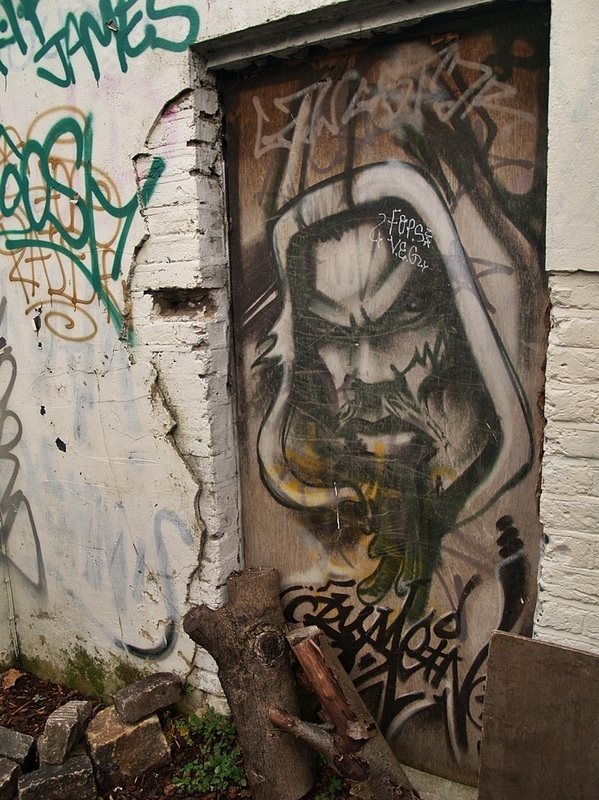 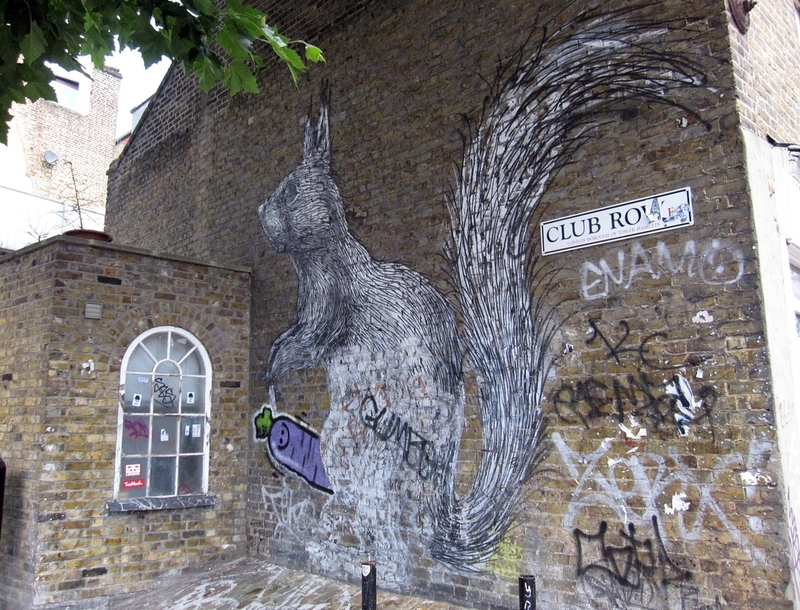 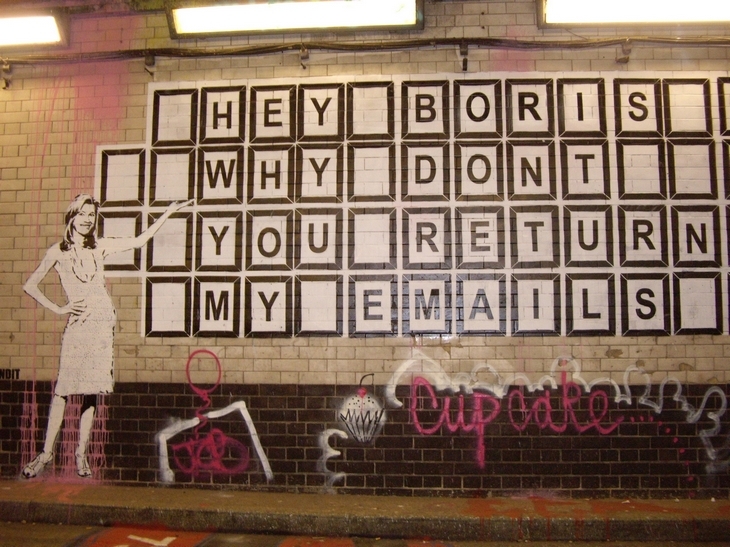 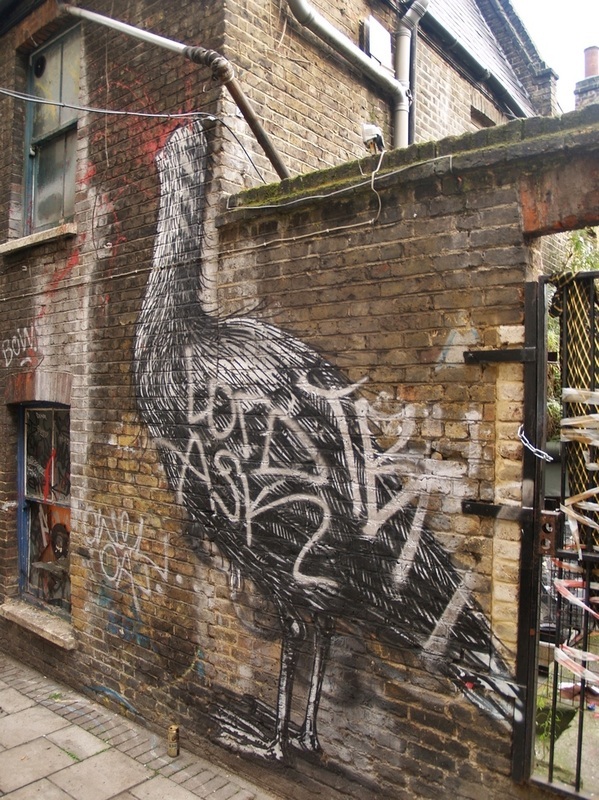 There is so much streetart appearing (and disappearing) in London at a rapid pace. 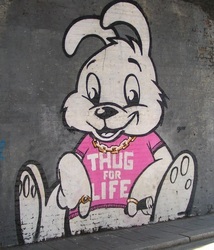 I like the rabbit in the bottom right corner! 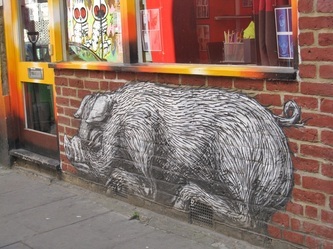 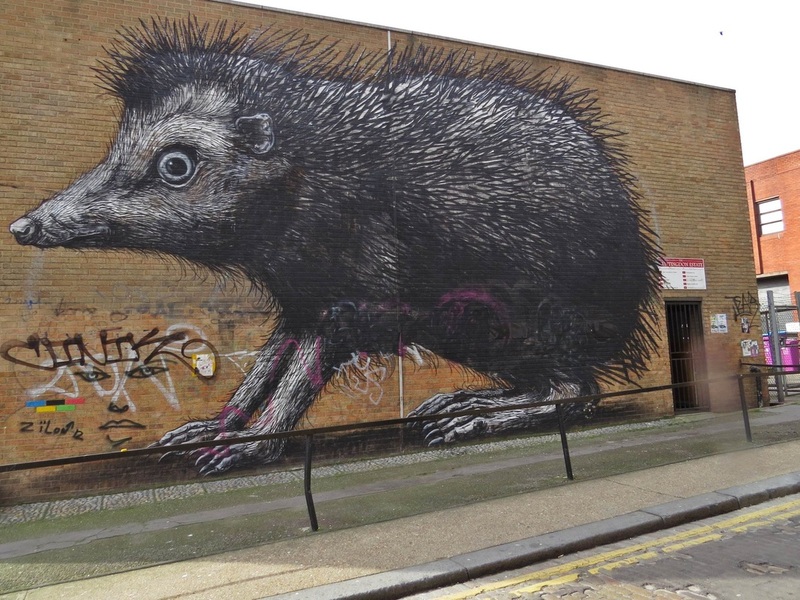 Roa is a street artist from Belgium and his black and white animals . 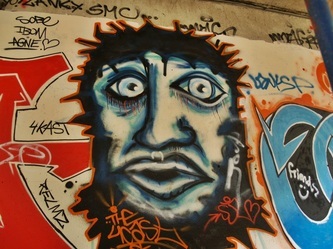 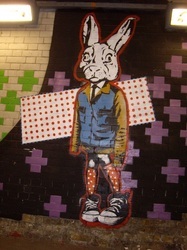 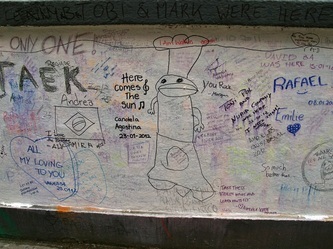 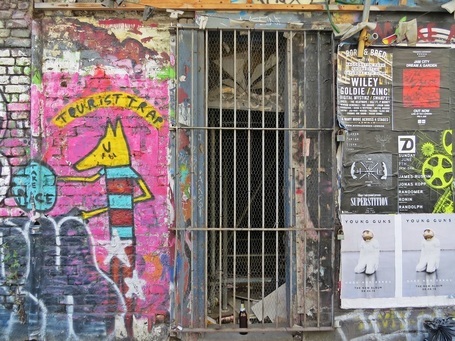 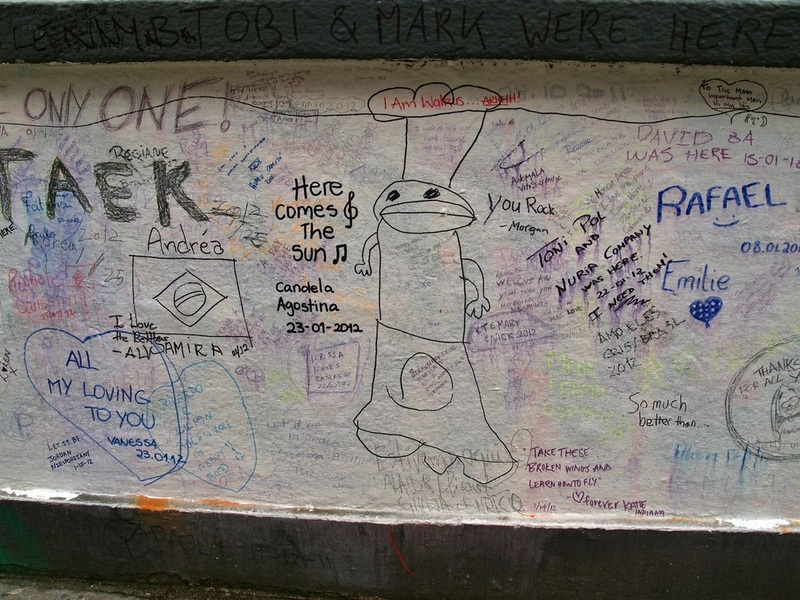 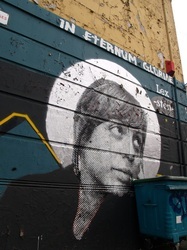 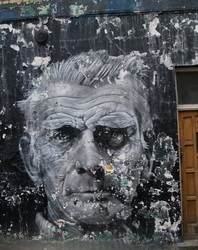 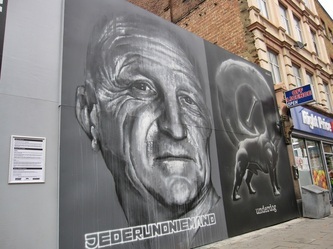 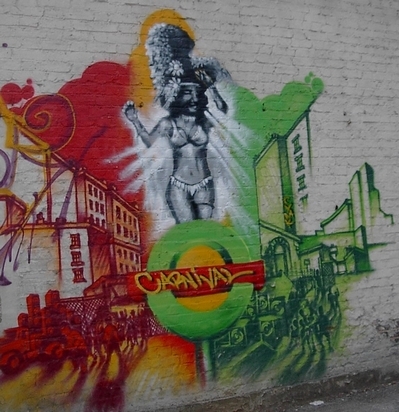 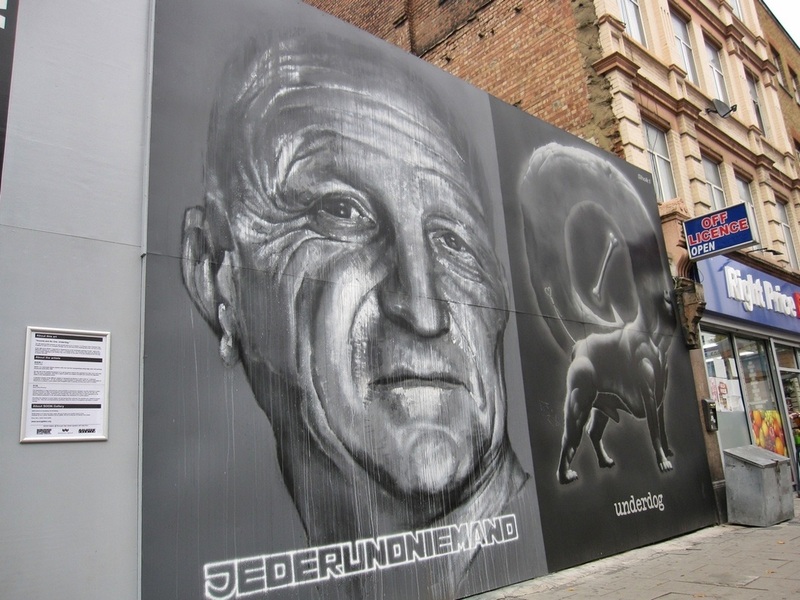 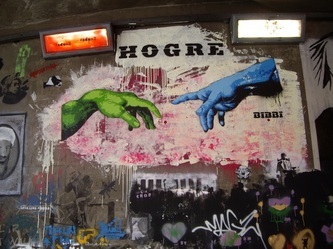 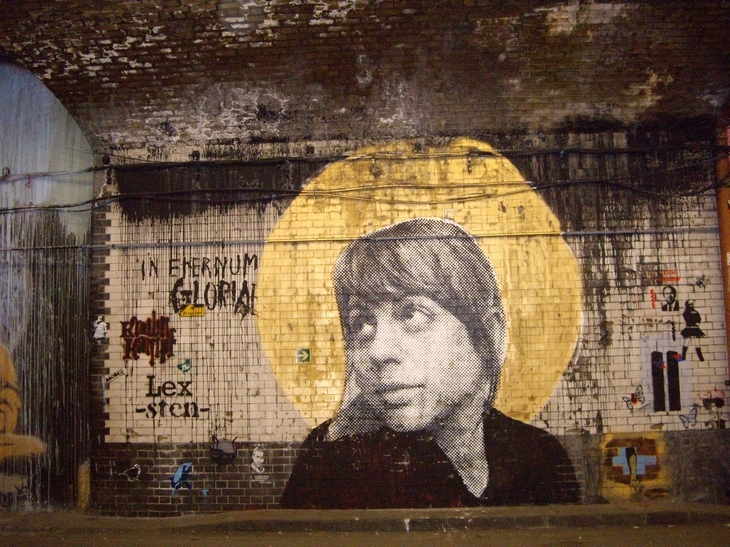 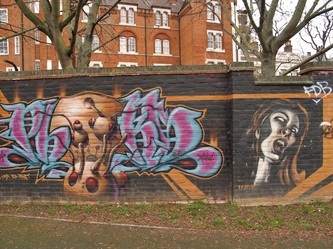 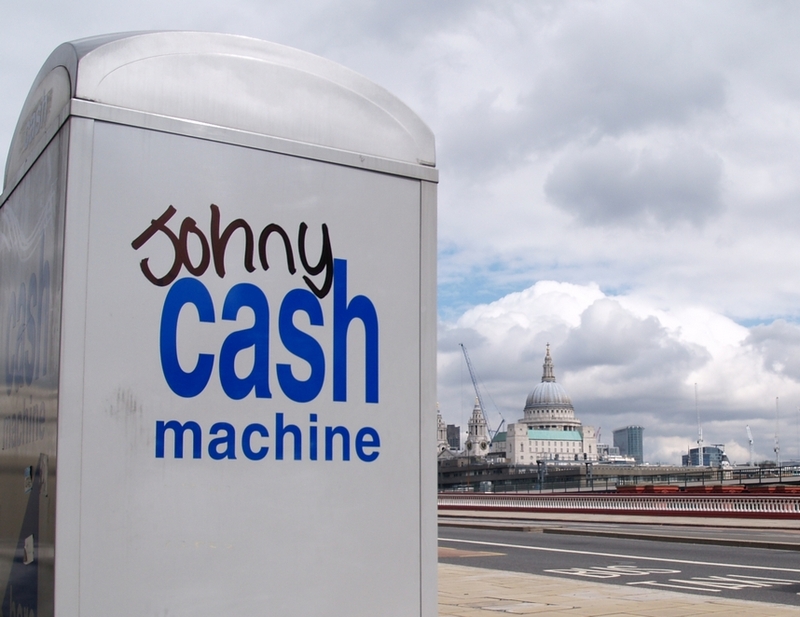 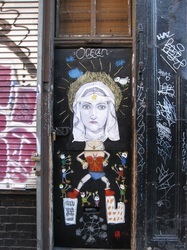 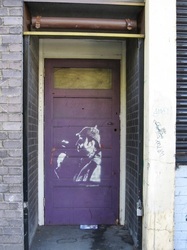 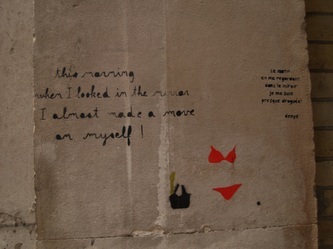 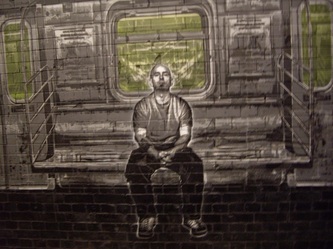 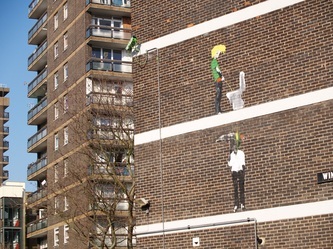 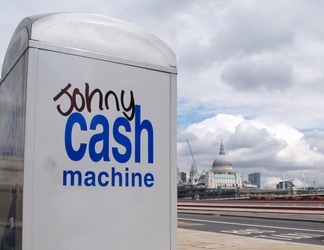 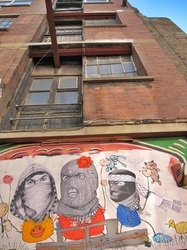 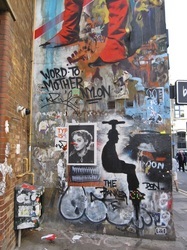 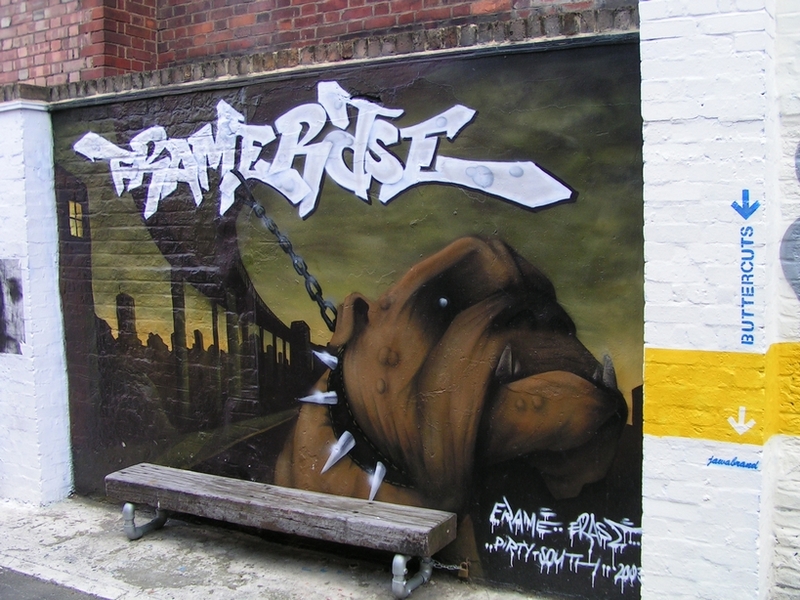 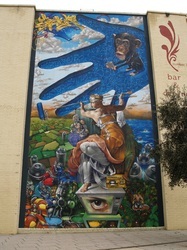 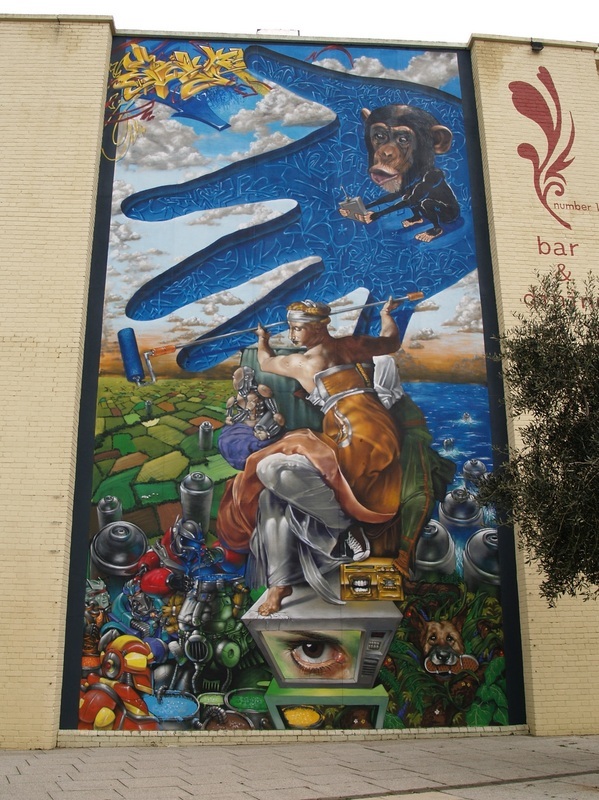 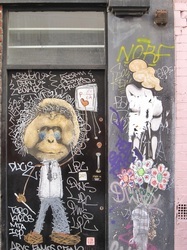 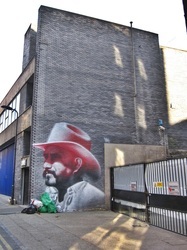 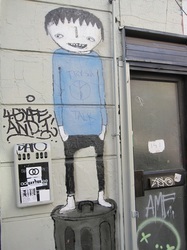 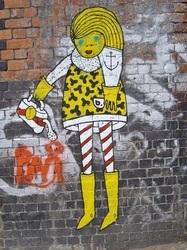 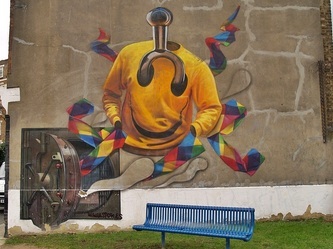 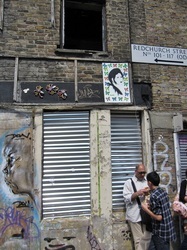 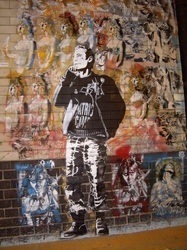 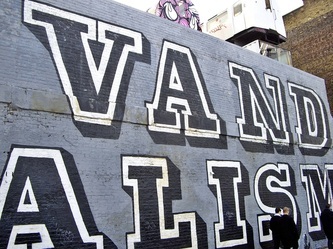 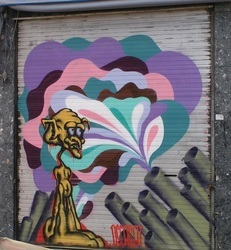 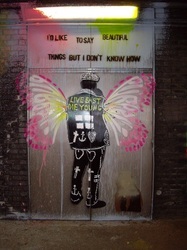 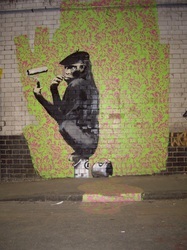 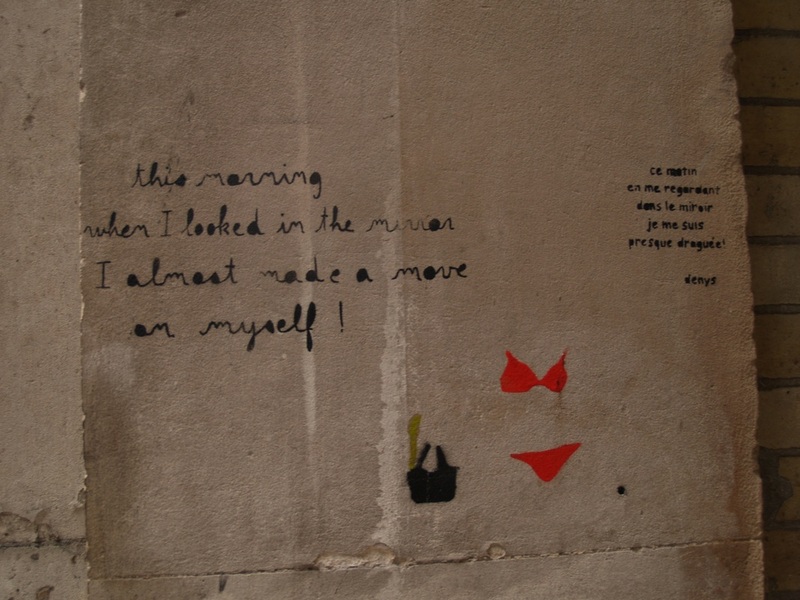 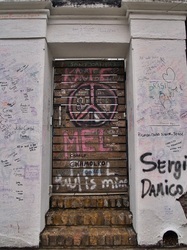 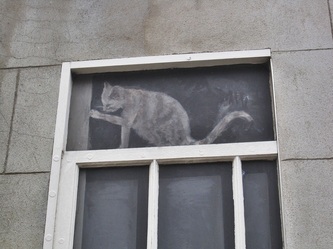 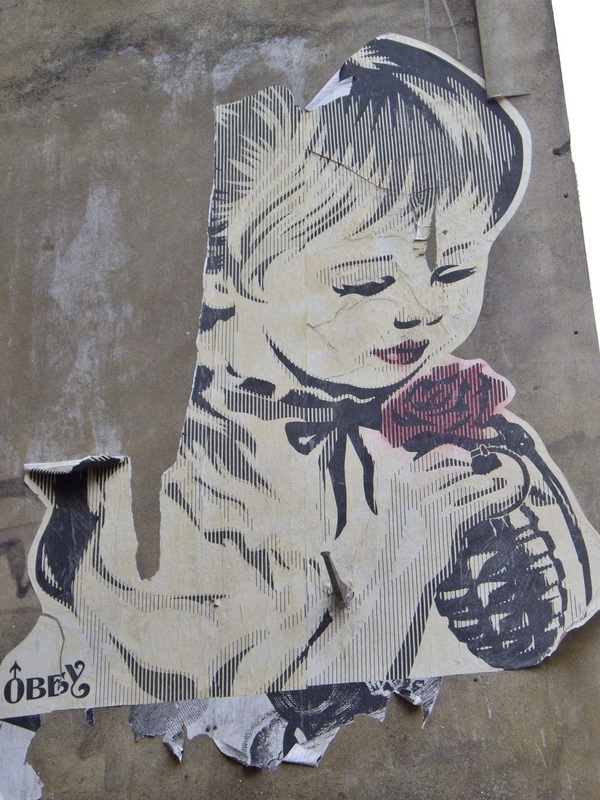 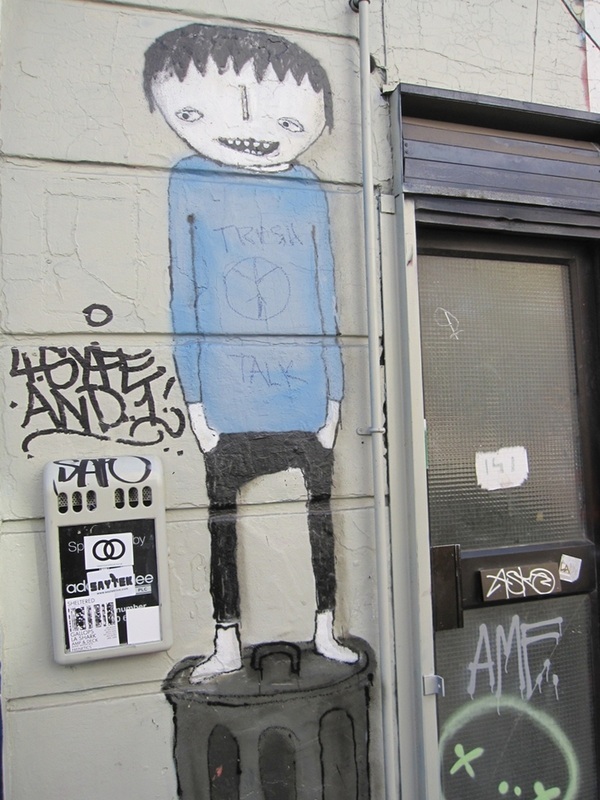 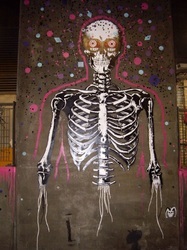 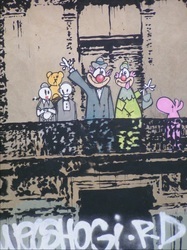 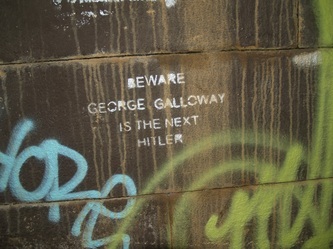 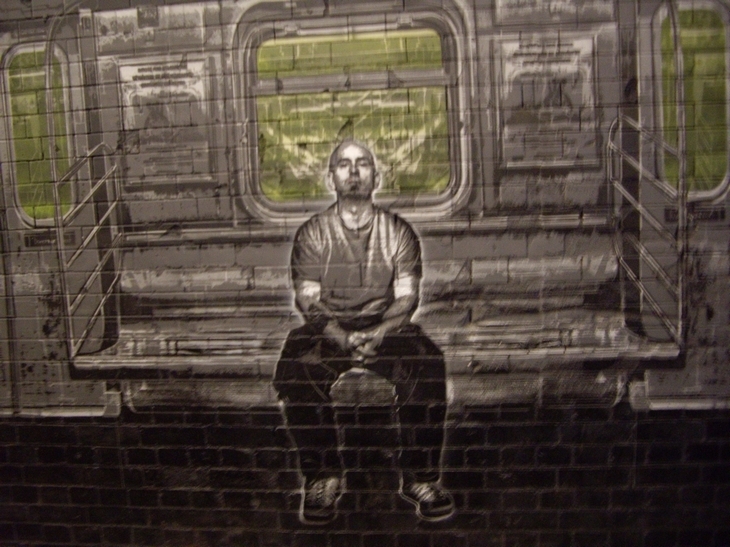 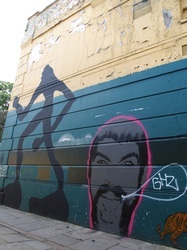 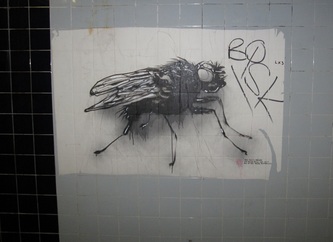 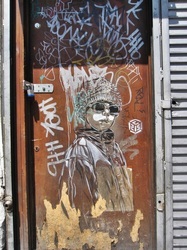 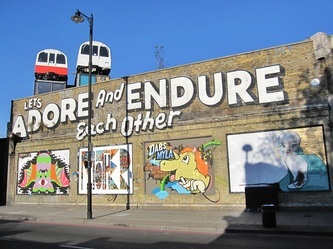 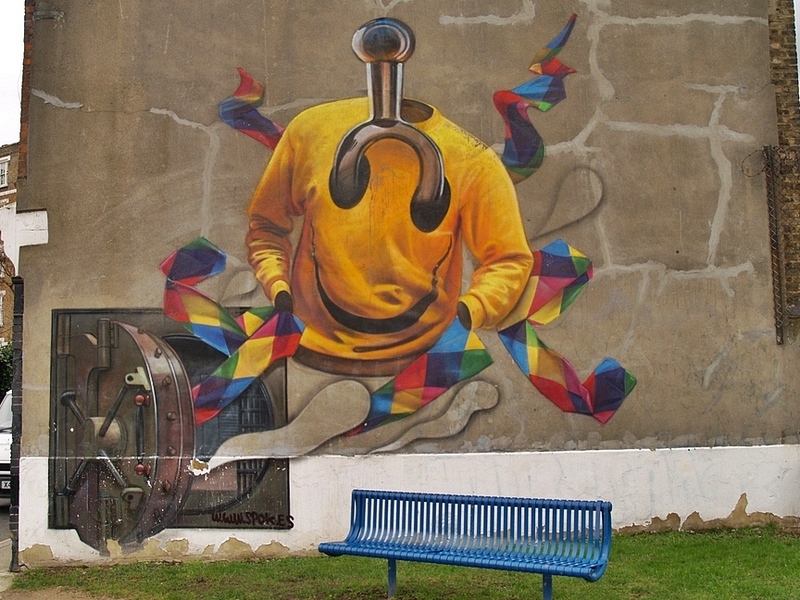 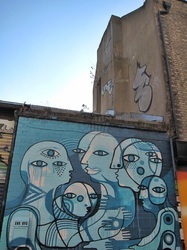 In addition to leaving his mark in London his work can be seen on buildings from New York to Berlin. 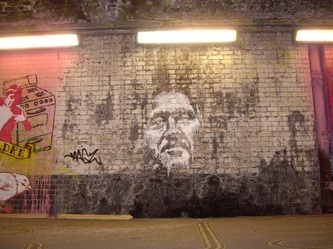 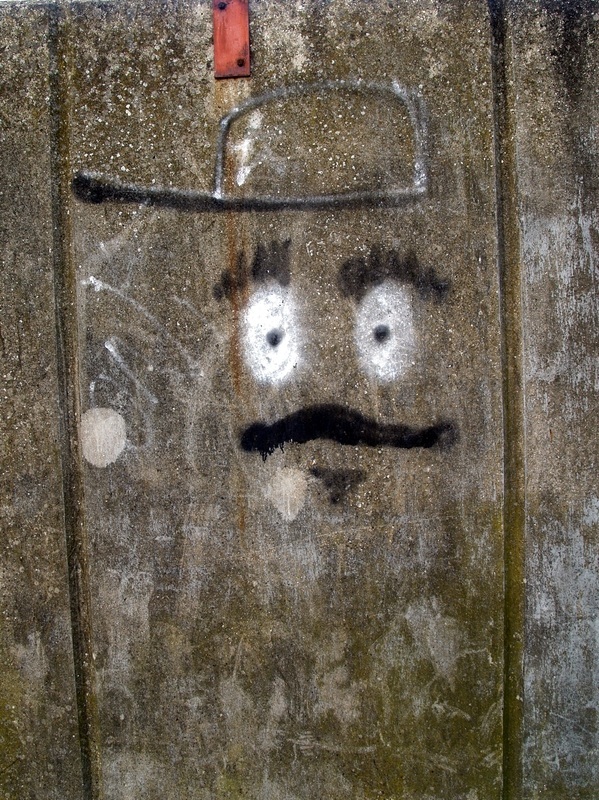 The face staring out from the wall is of local architect, journalist and author Peter Murray. 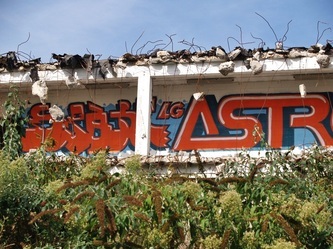 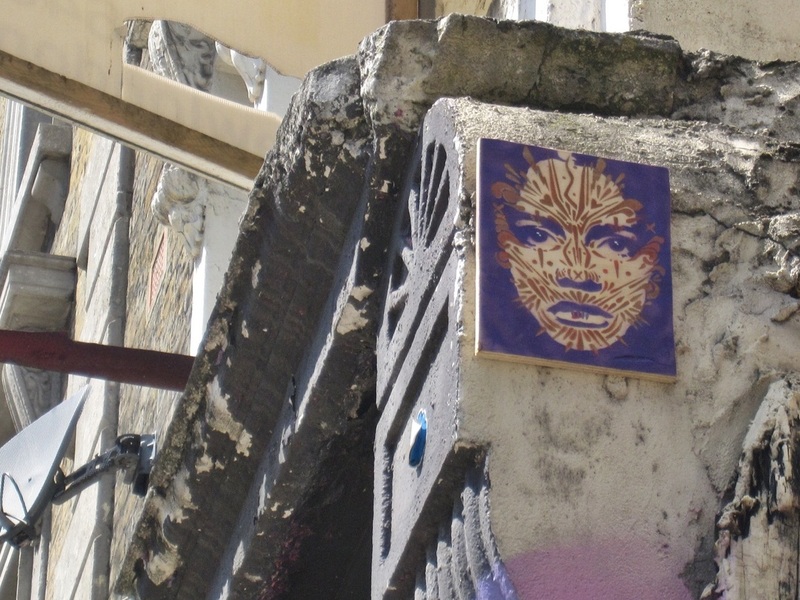 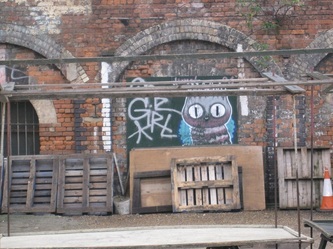 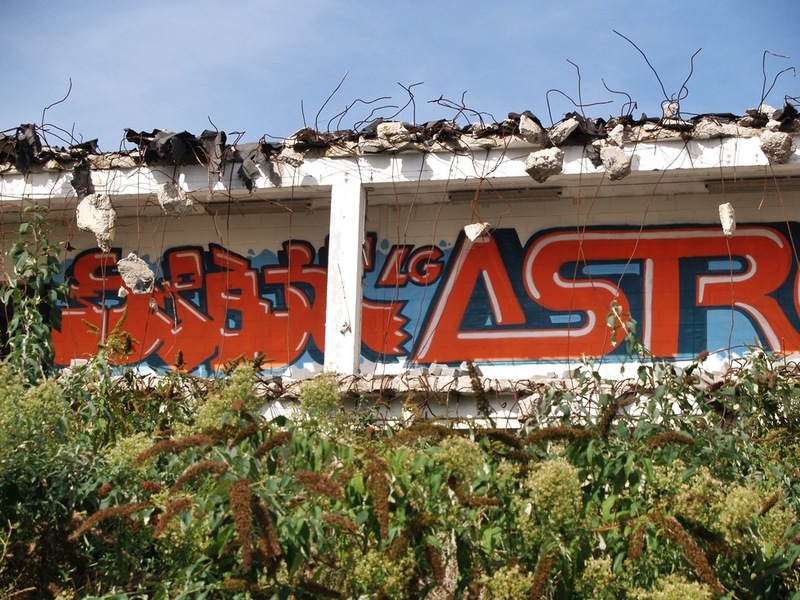 The derelict wall is owned by Domus Tiles which is adjacent to their car park. 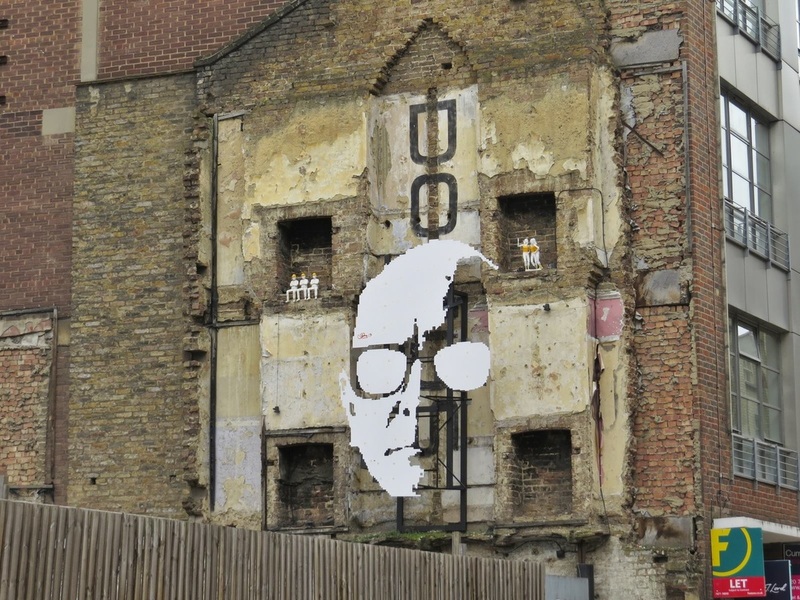 The portrait “a piece of art that rewards the viewer for effort.” was erected by London based artist Greg Shapter. 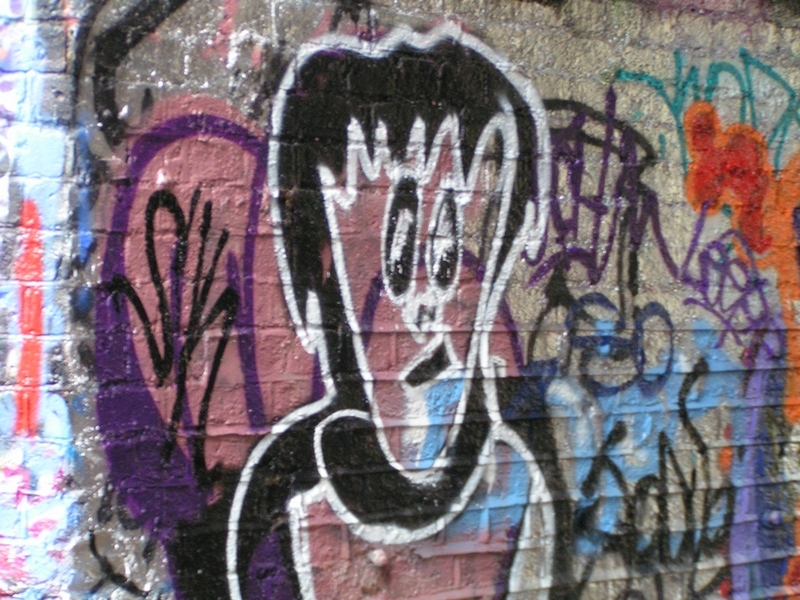 The image is split into multiple parts and set on different planes so that the image could only be viewed as a whole from one point. 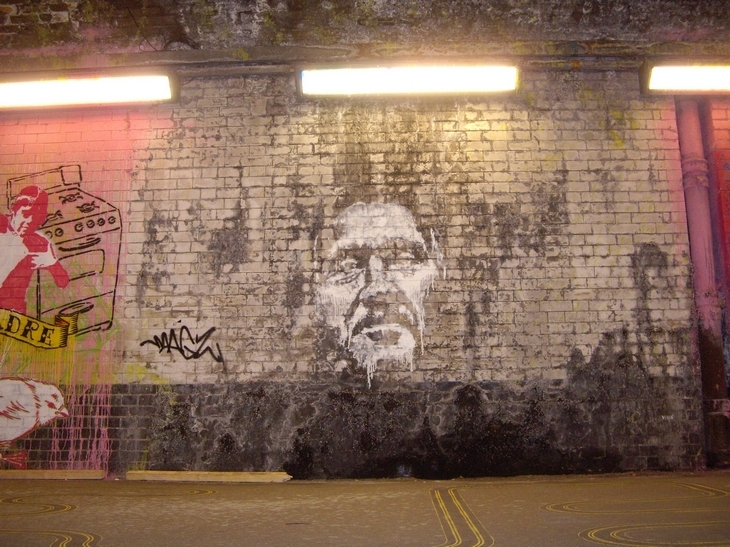 From the side it could be a map or abstract artwork and only by finding an ‘X’ on a nearby pavement can you see the face the way it is meant to be viewed. 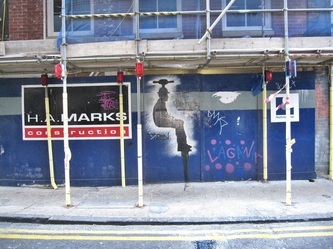 The Shapter installation has since been moved from this spot in Great Sutton St to Clekenwell Rd. 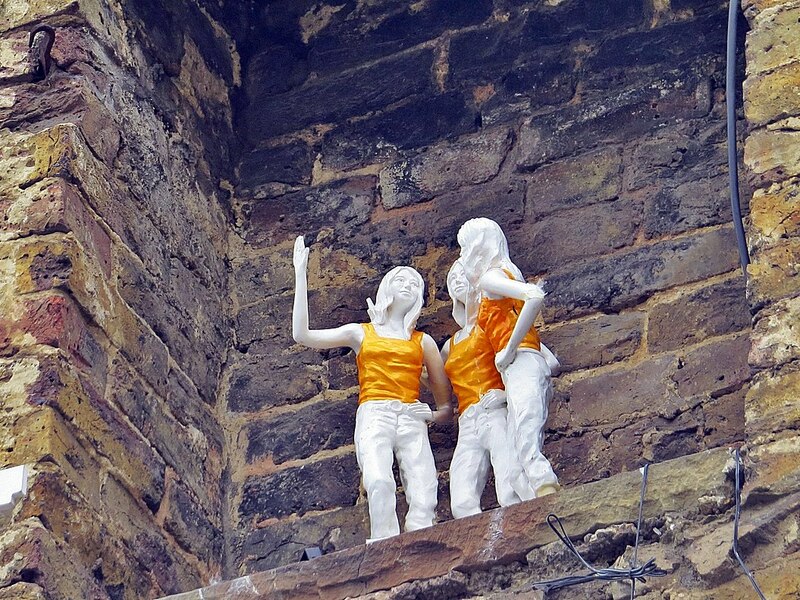 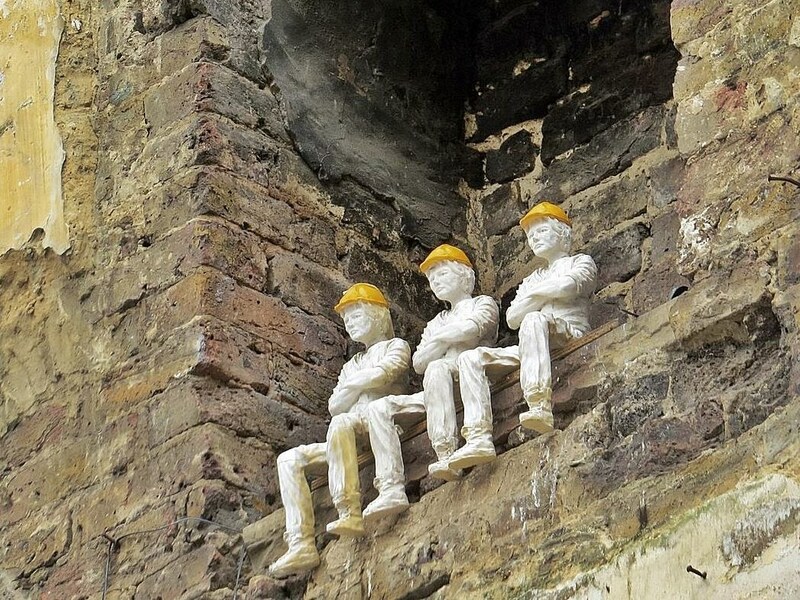 The little people figurines have been placed all around Clerkenwell as part of an advertising campaign to increase awareness about the Domus shop. 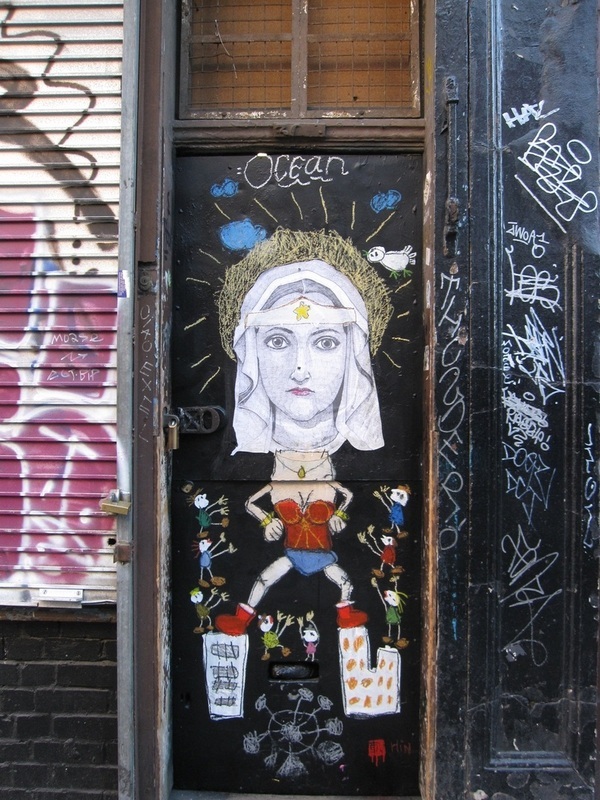 This next gallery is from the Brick Lane vicinity, an area really prolific for fantastic streetart where it has almost become socially acceptable. 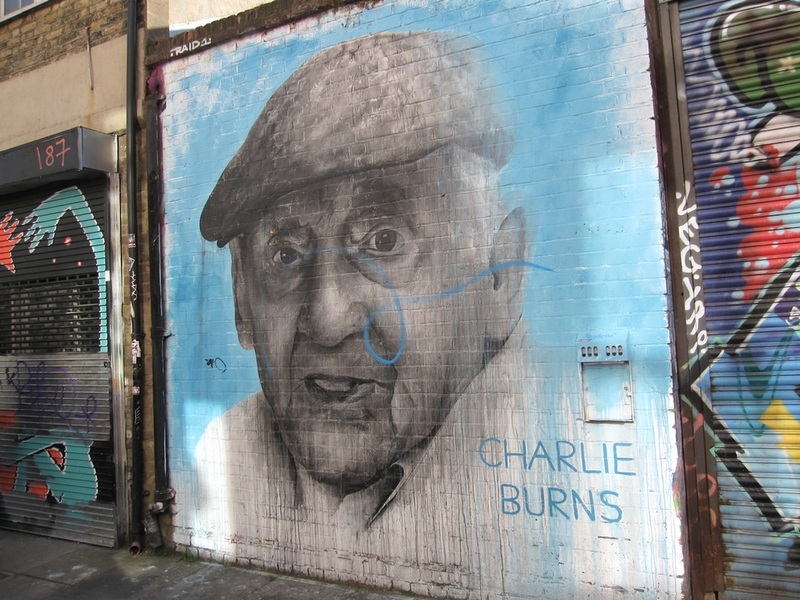 Charlie is a local 95-year-old who spends much of his time sitting in his car in Bacon Street, outside the family second hand furniture business ran by his daughter. 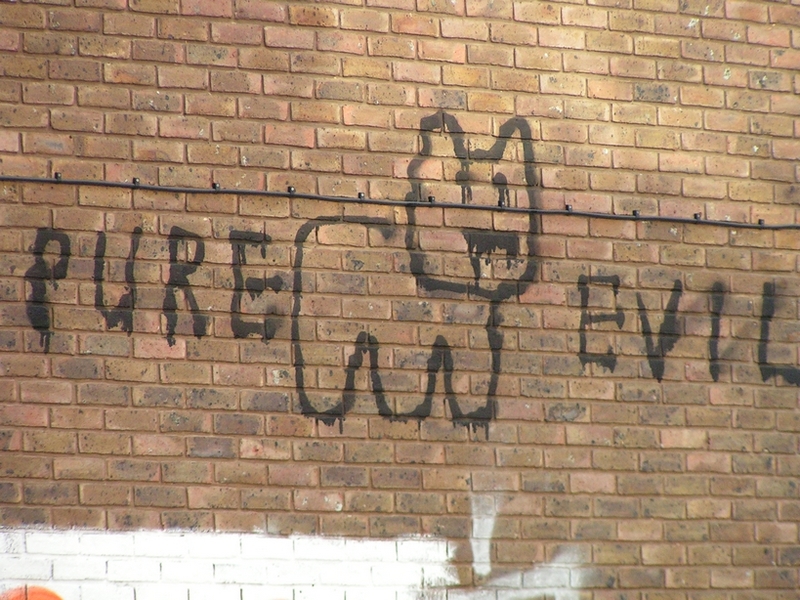 No introduction really needed here. 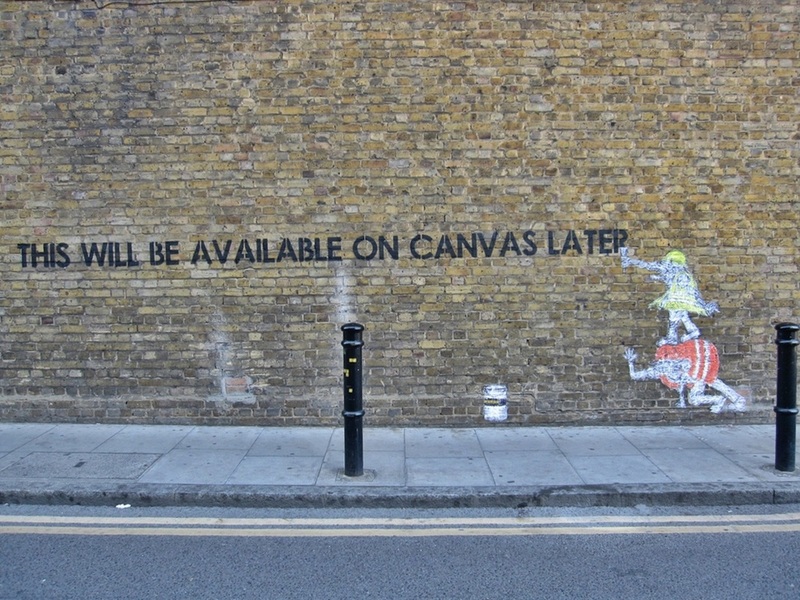 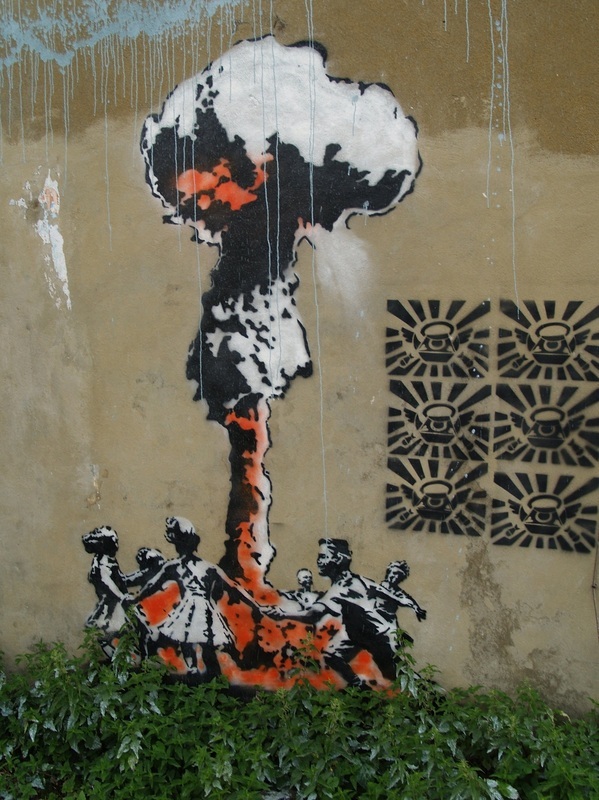 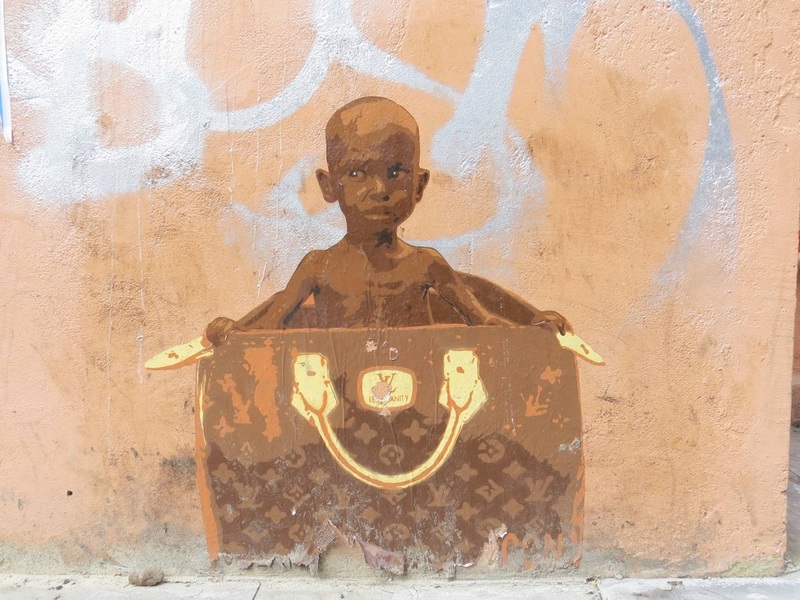 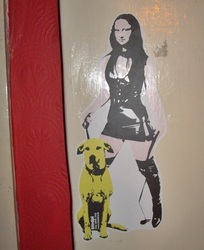 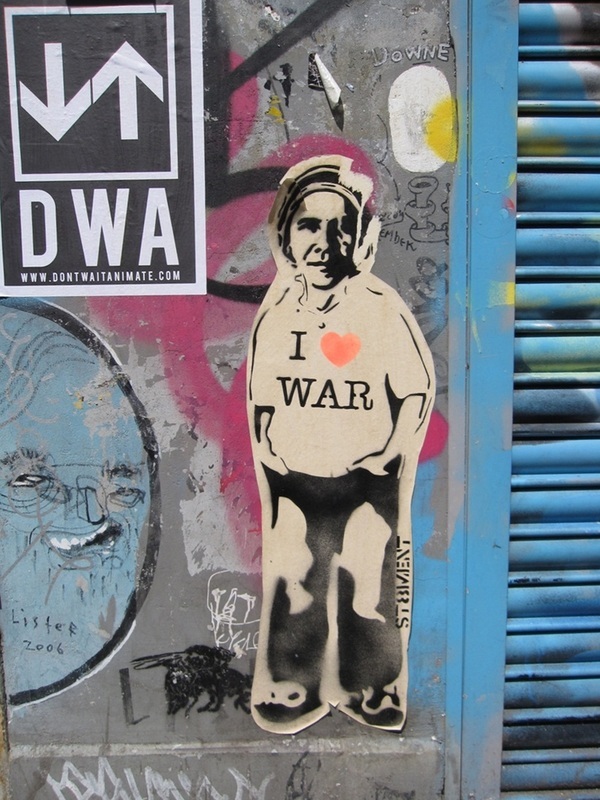 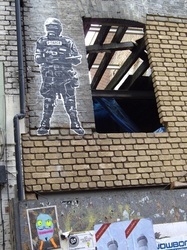 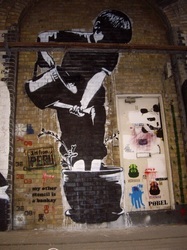 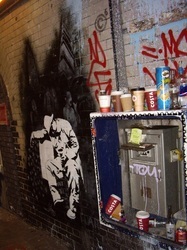 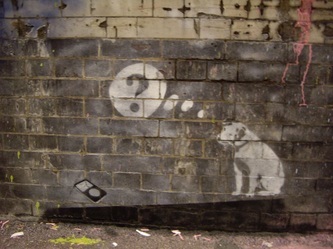 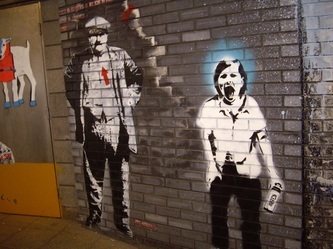 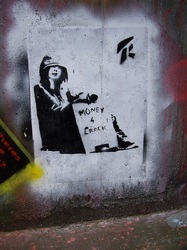 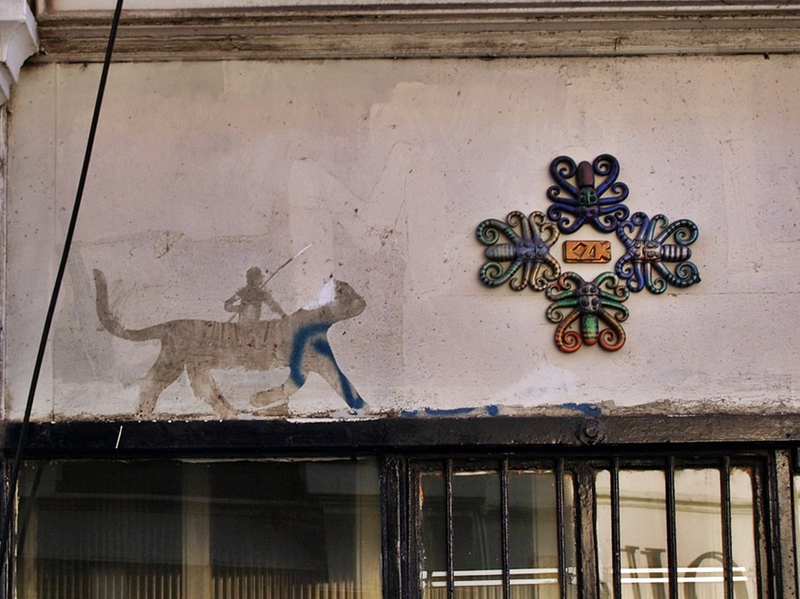 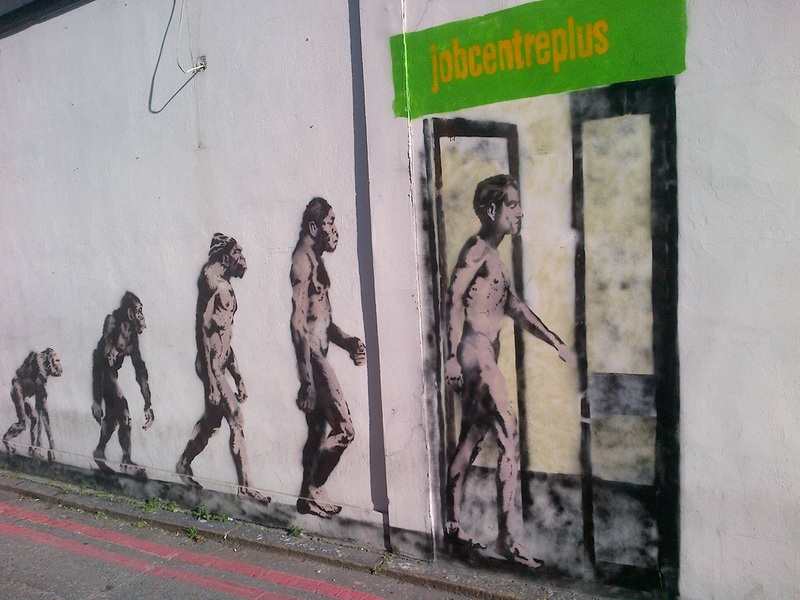 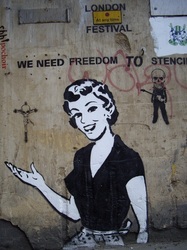 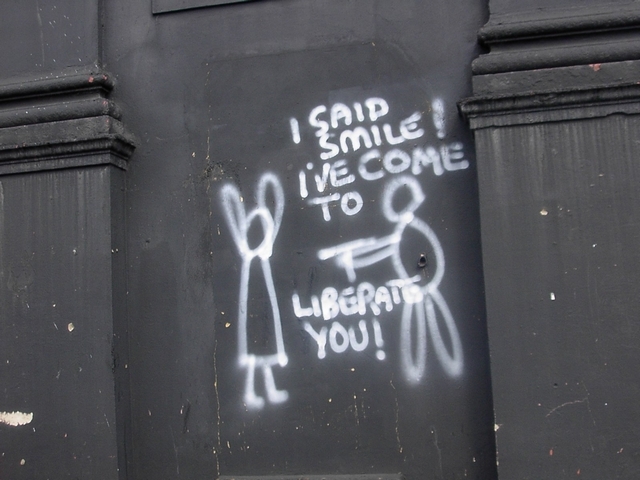 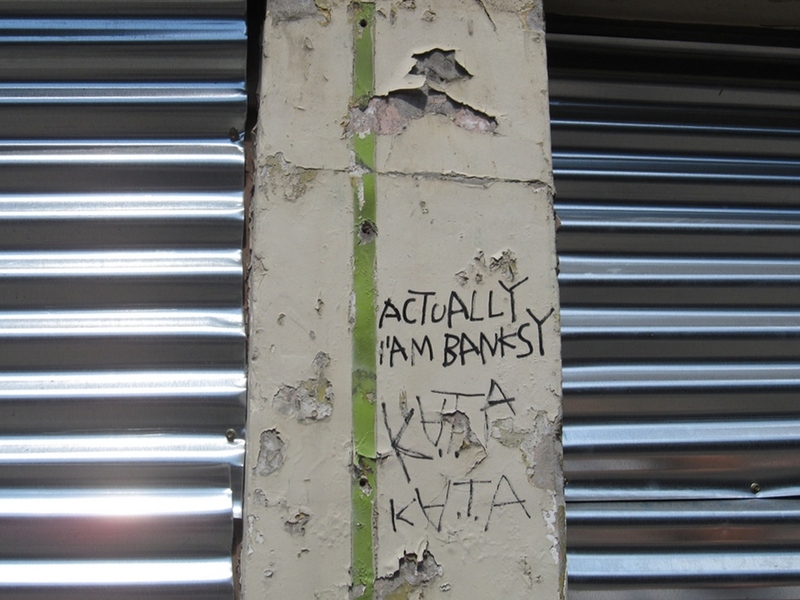 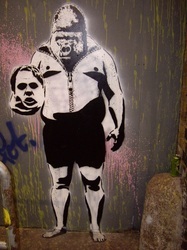 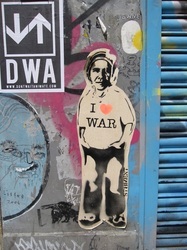 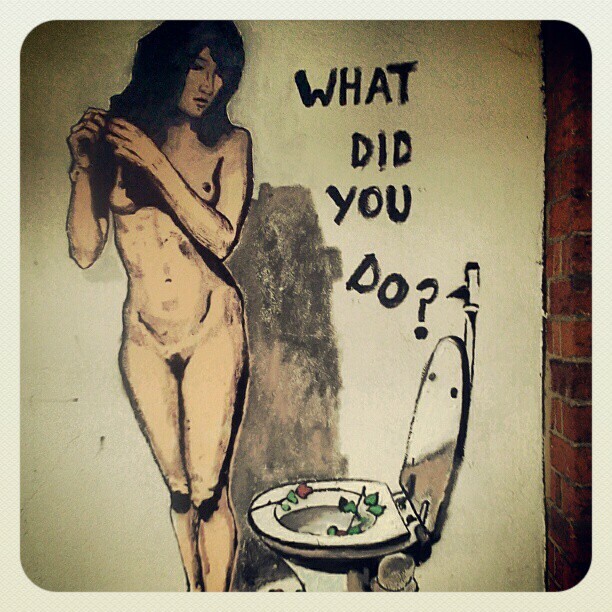 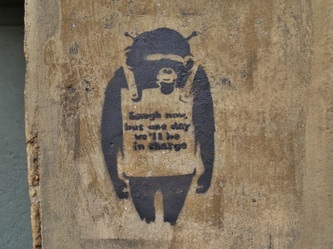 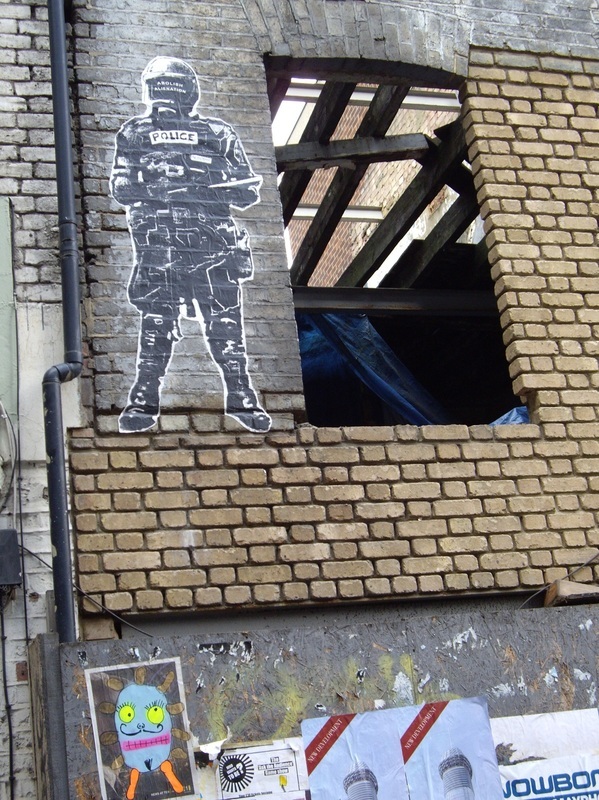 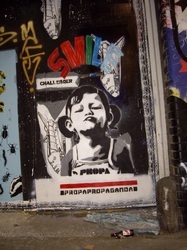 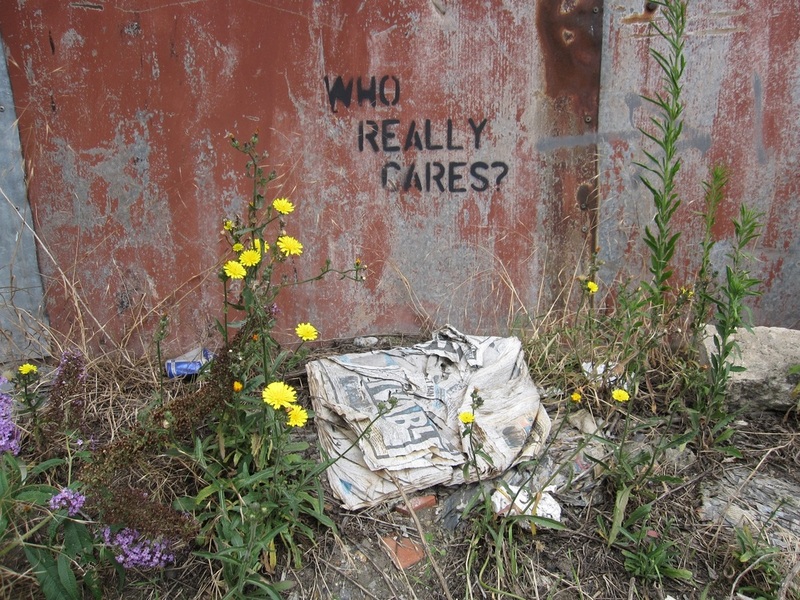 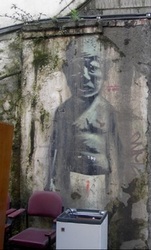 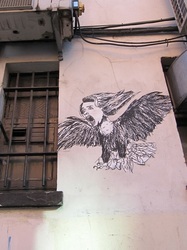 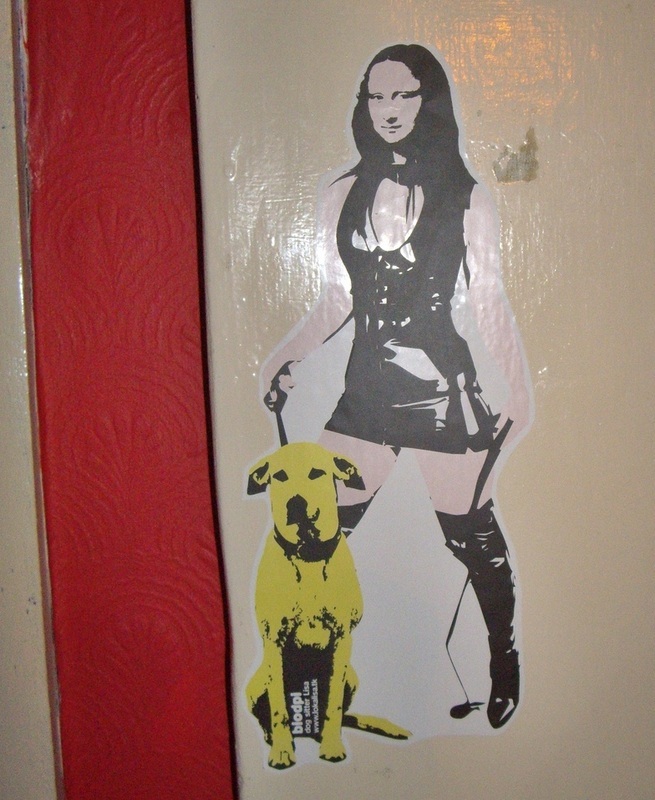 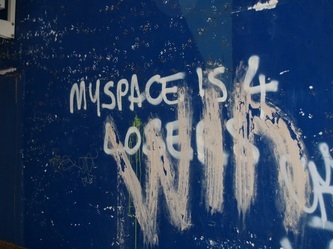 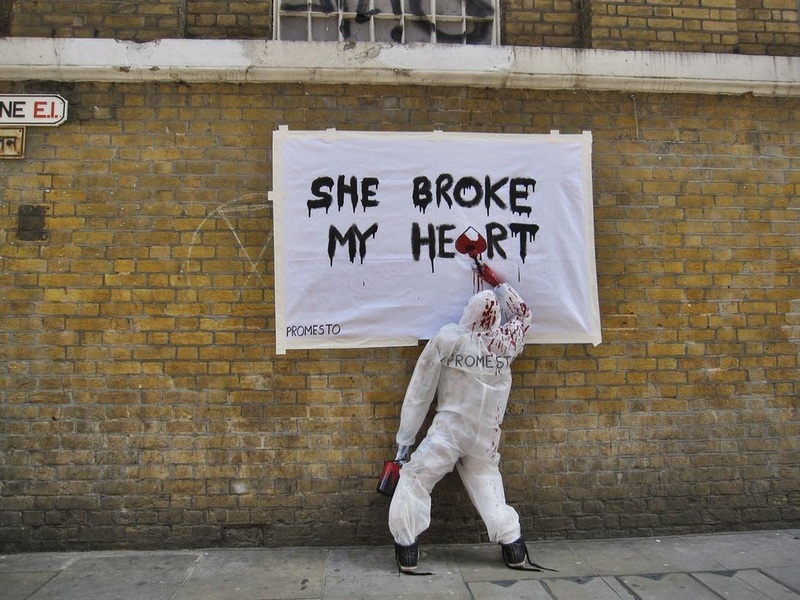 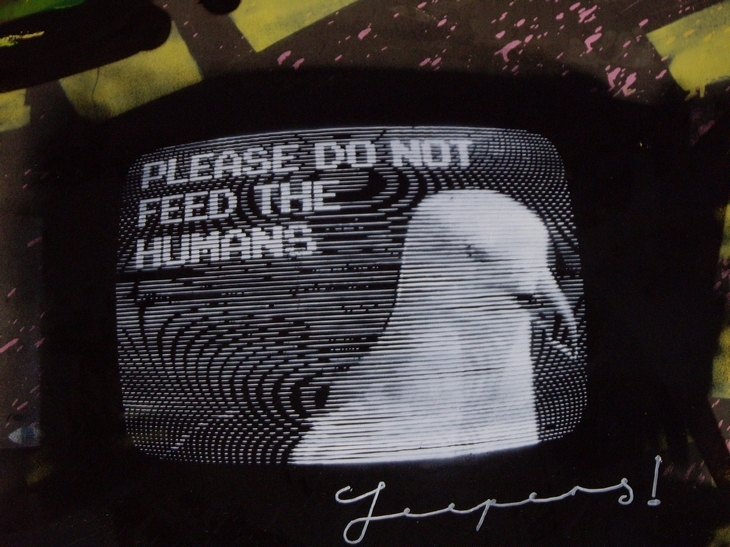 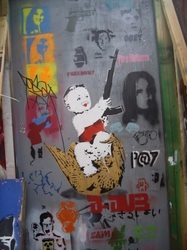 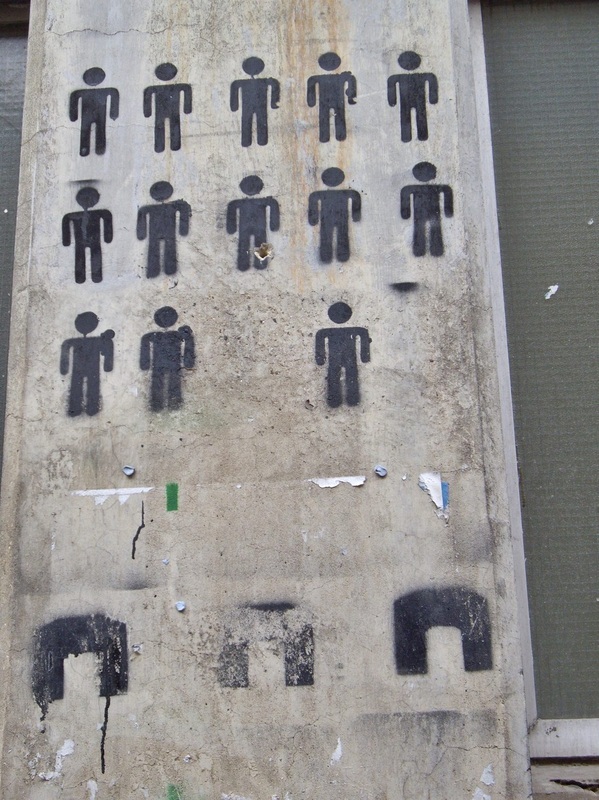 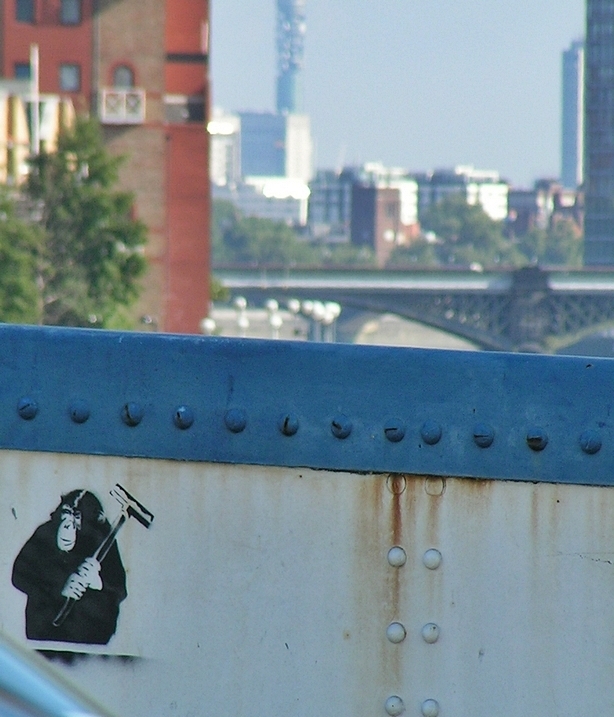 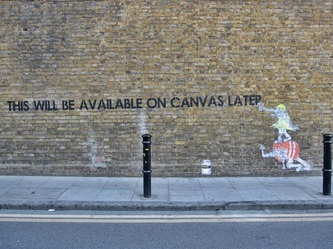 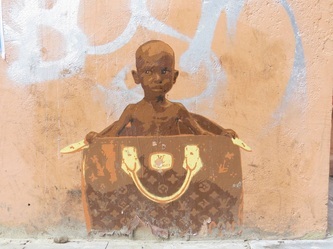 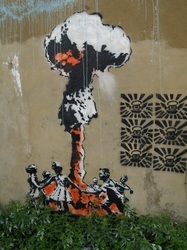 This next gallery are some Banksy images that I took a few years ago. 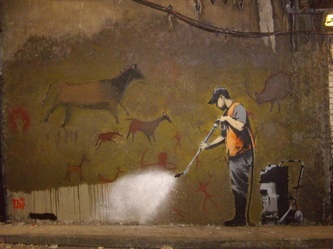 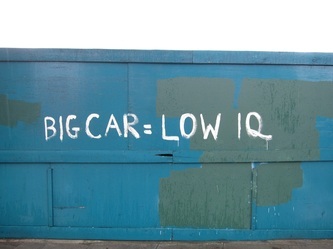 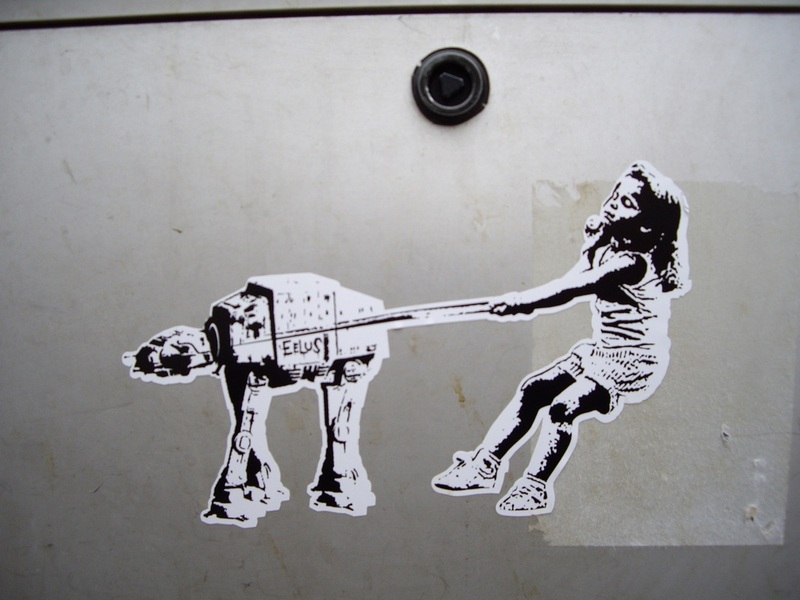 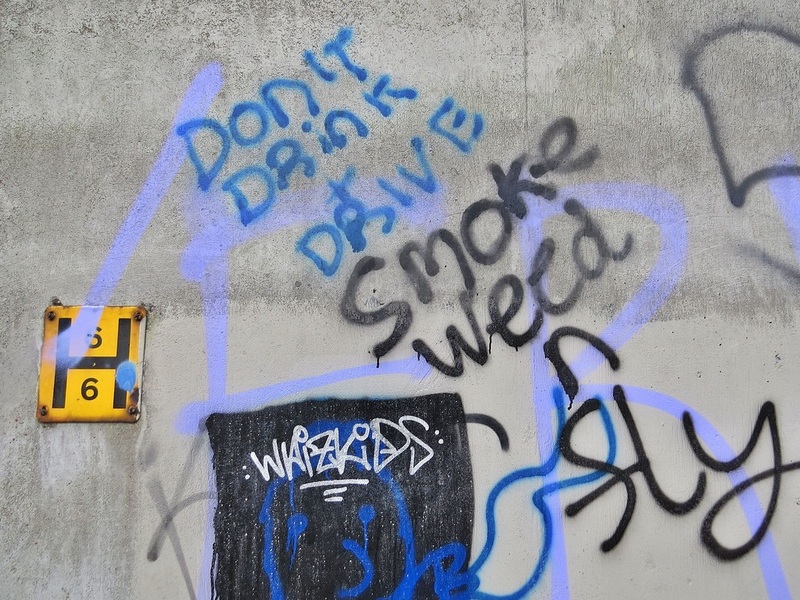 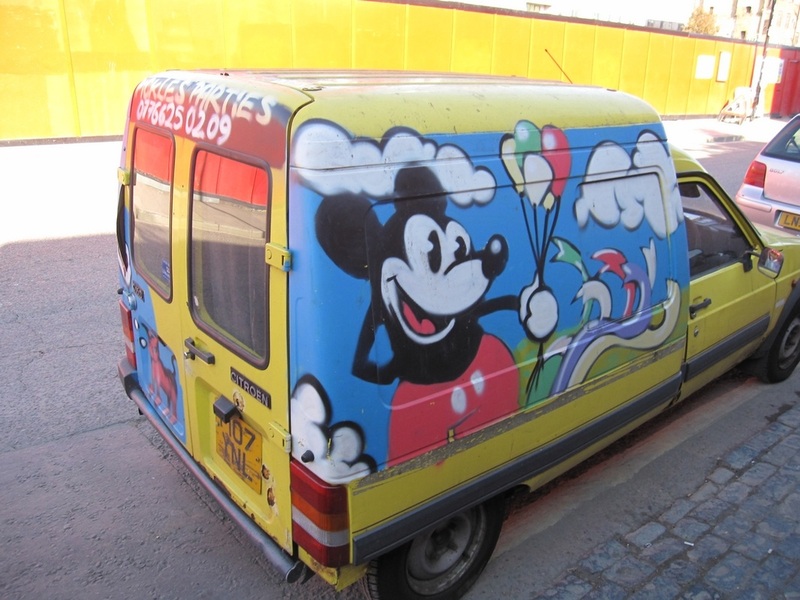 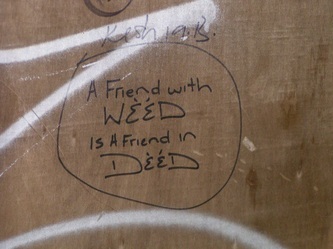 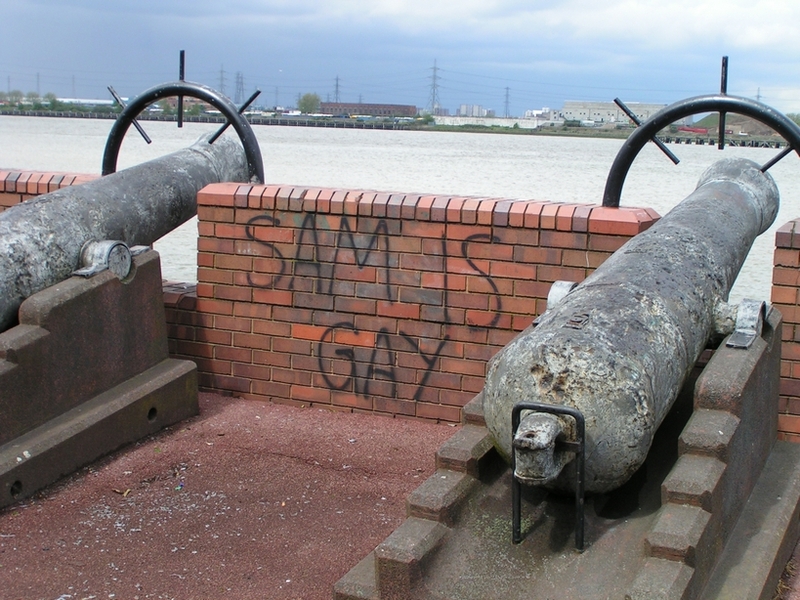 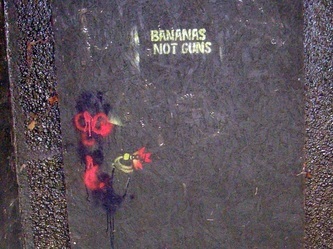 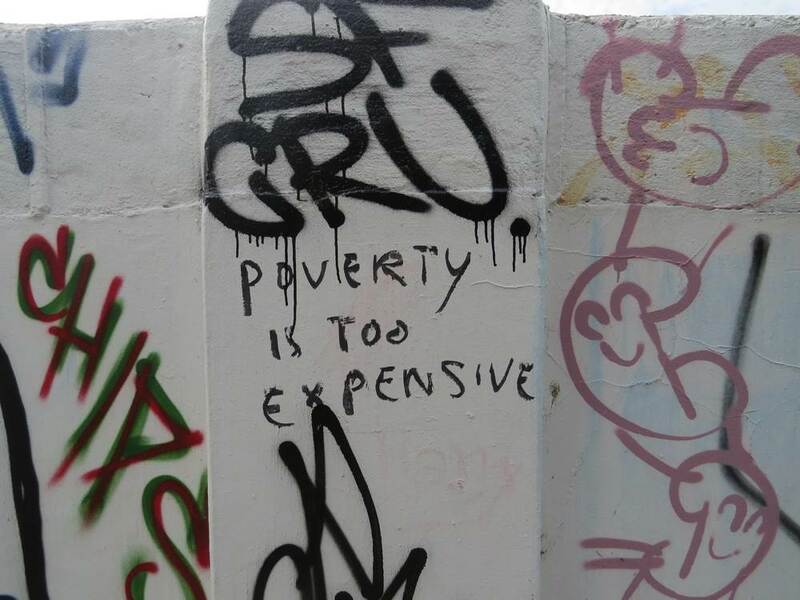 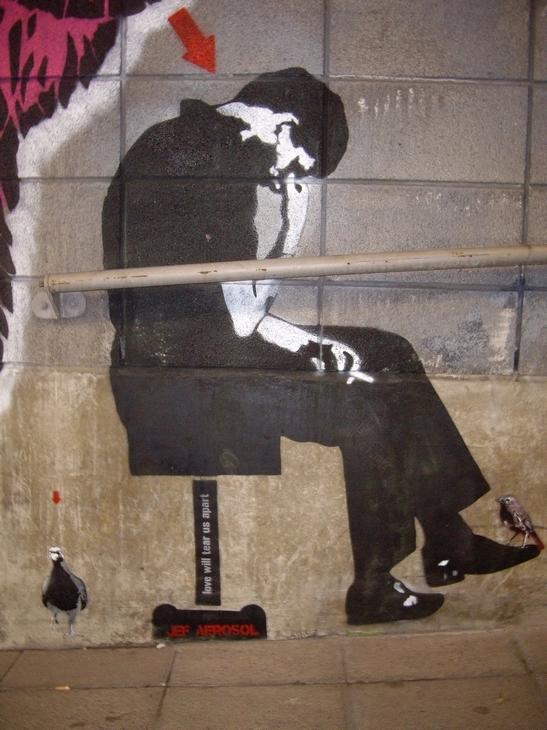 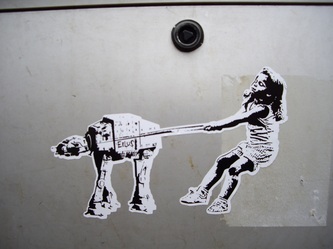 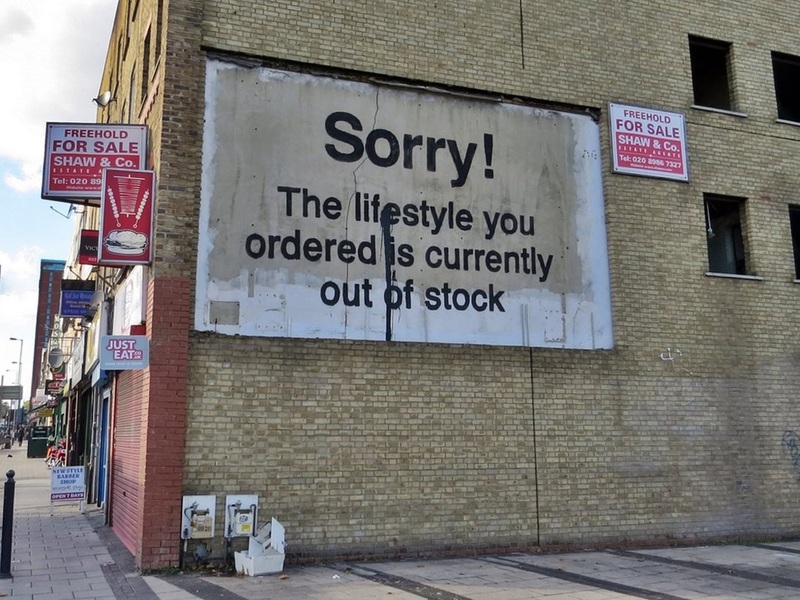 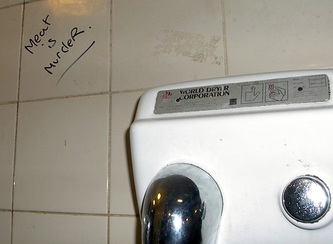 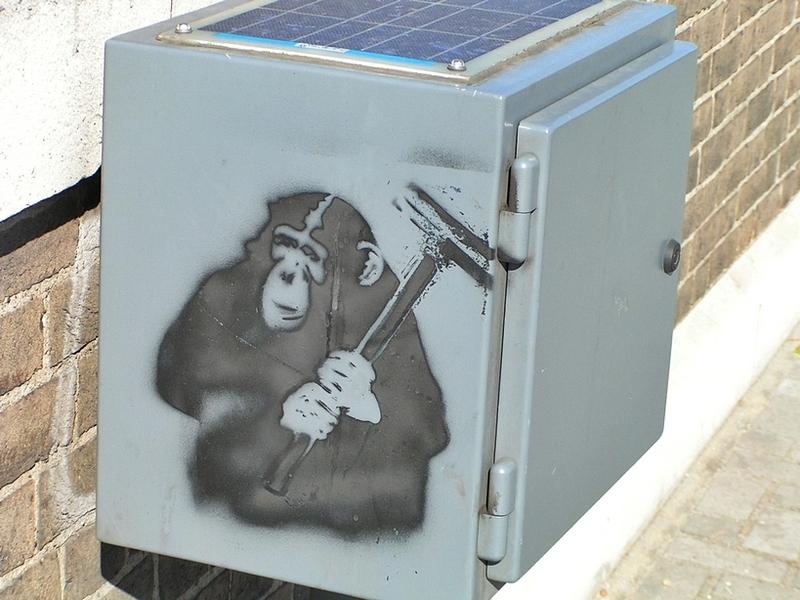 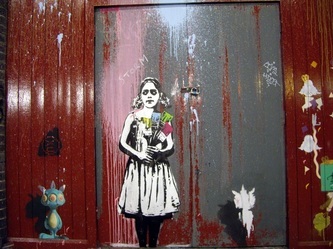 Banksy is a well-known pseudo-anonymous English graffiti artist. 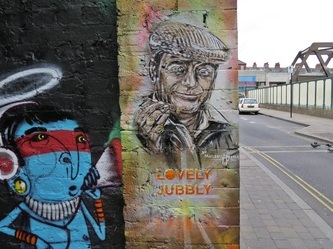 He is believed to be a native of Bristol but there is substantial public uncertainty about his identity and personal and biographical details. 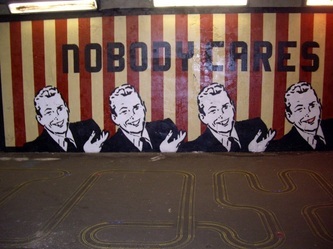 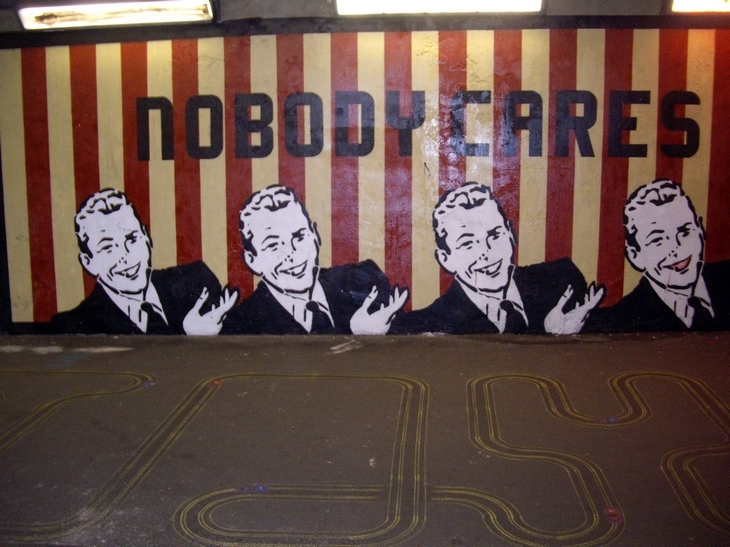 His artworks are often satirical pieces of art on topics such as politics, culture, and ethics. 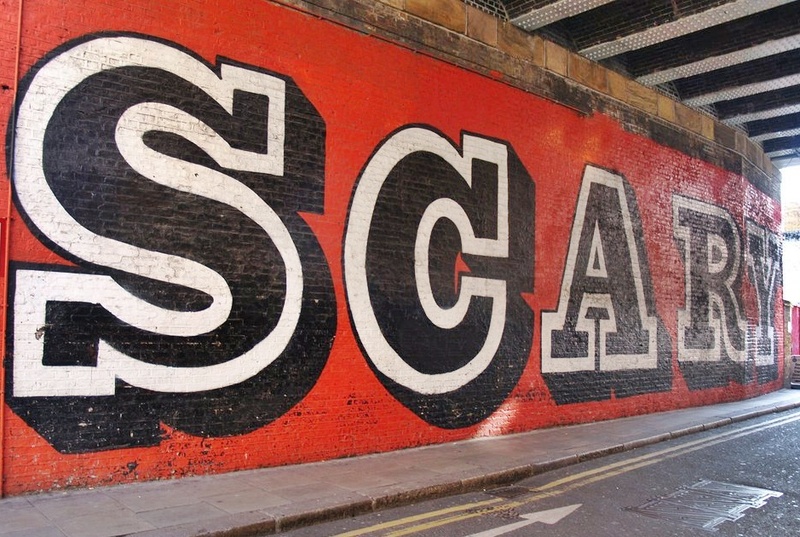 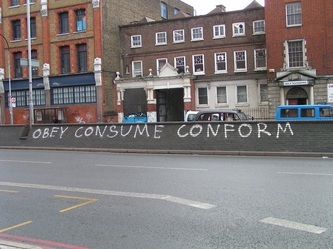 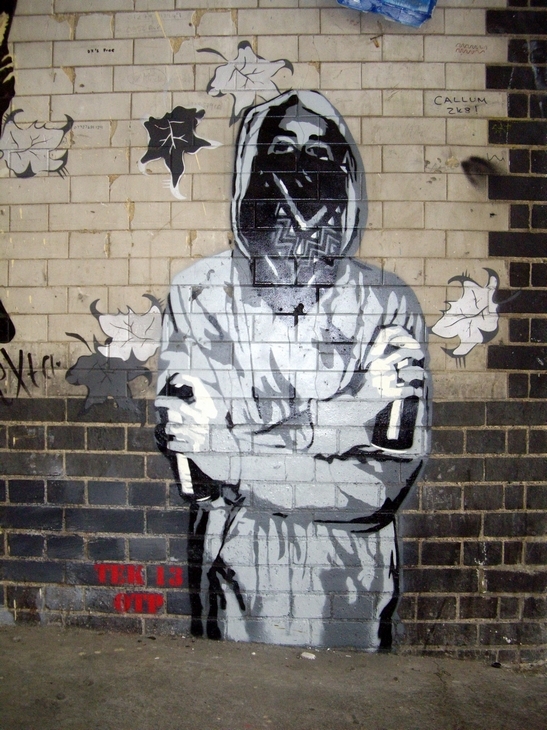 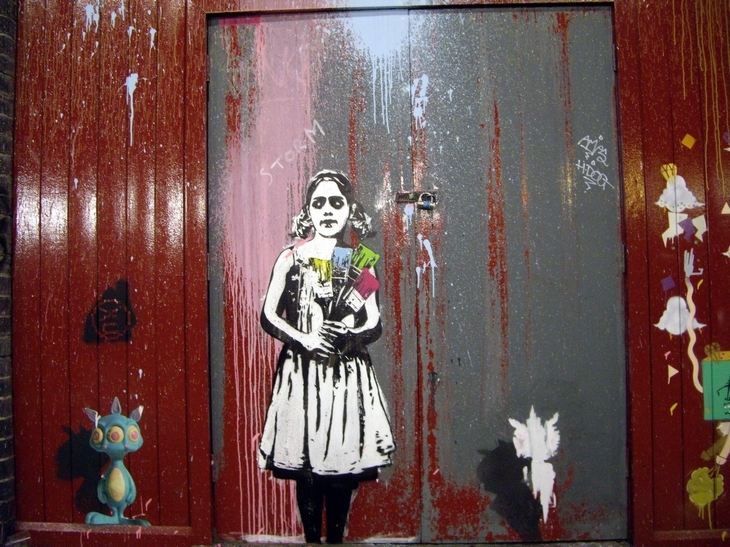 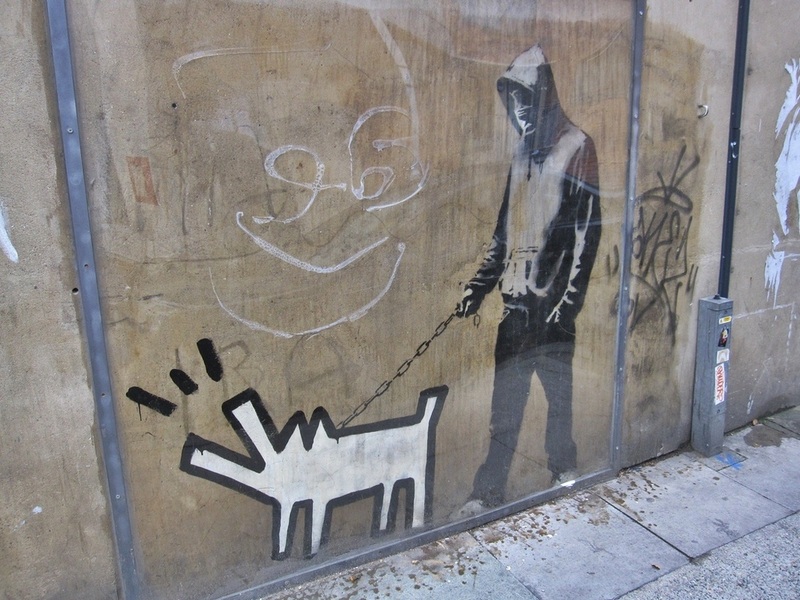 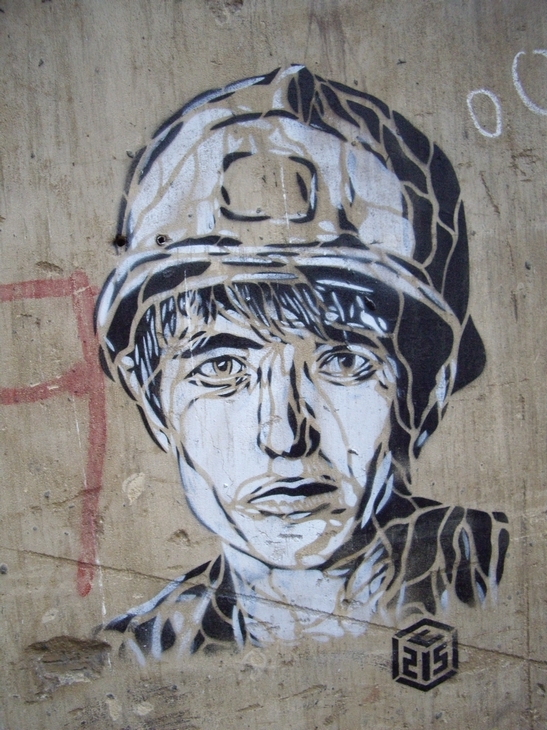 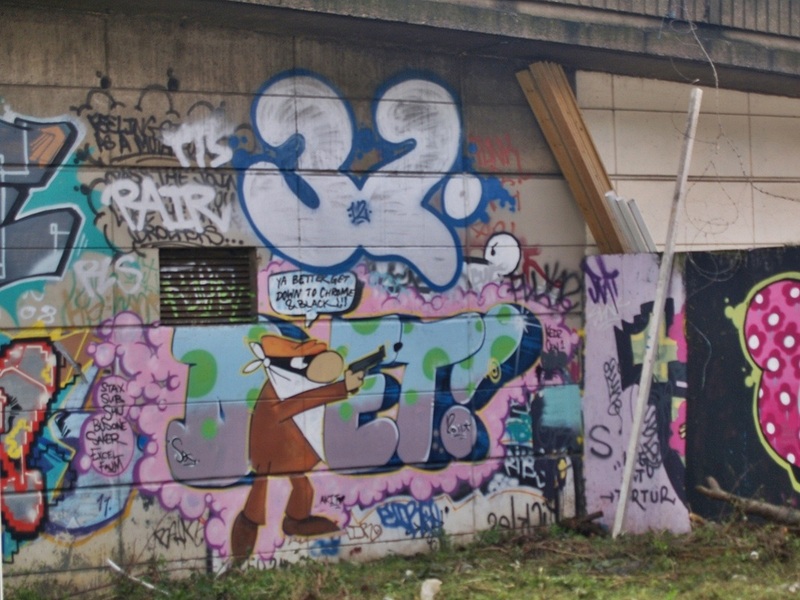 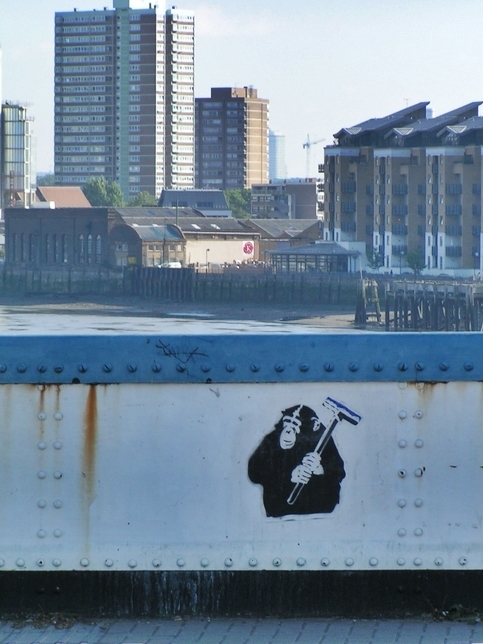 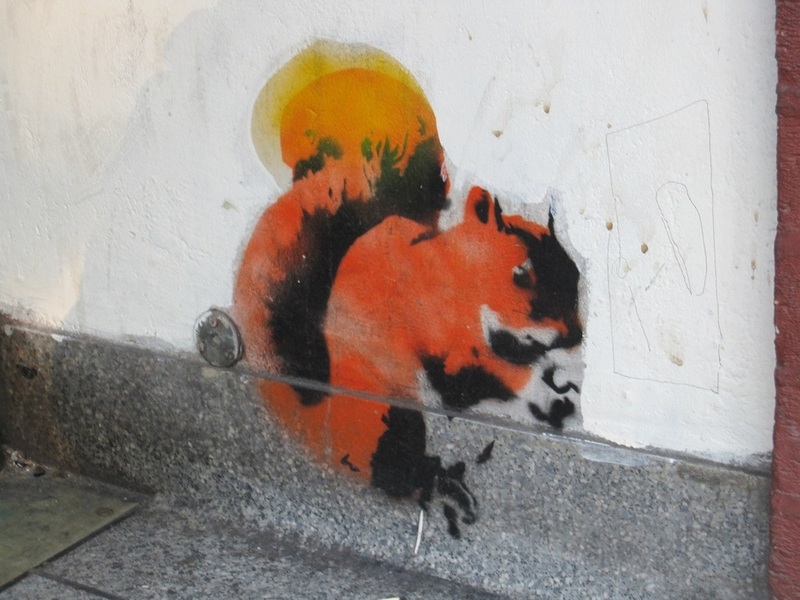 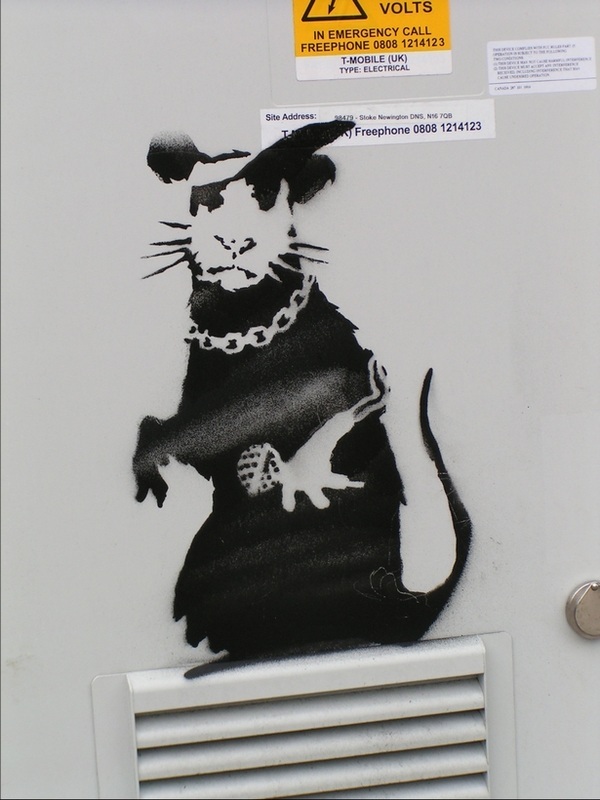 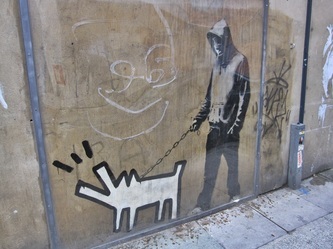 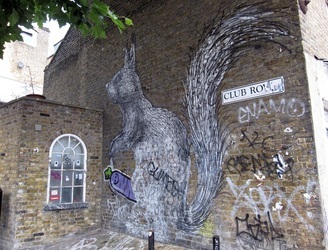 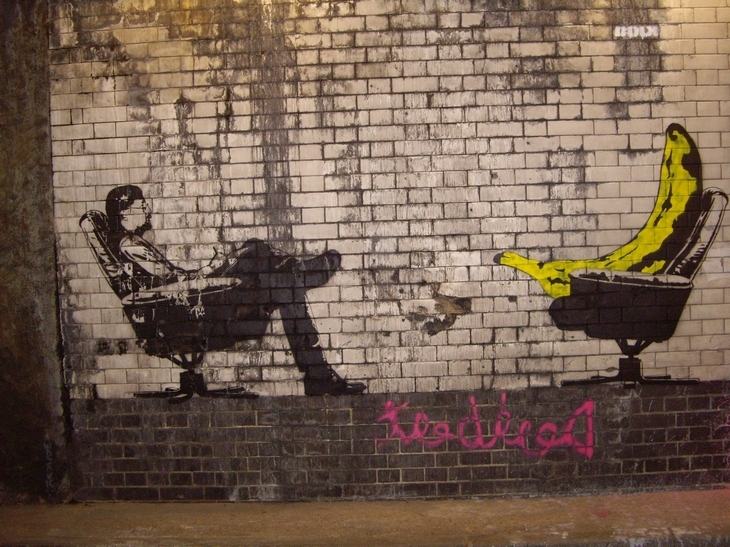 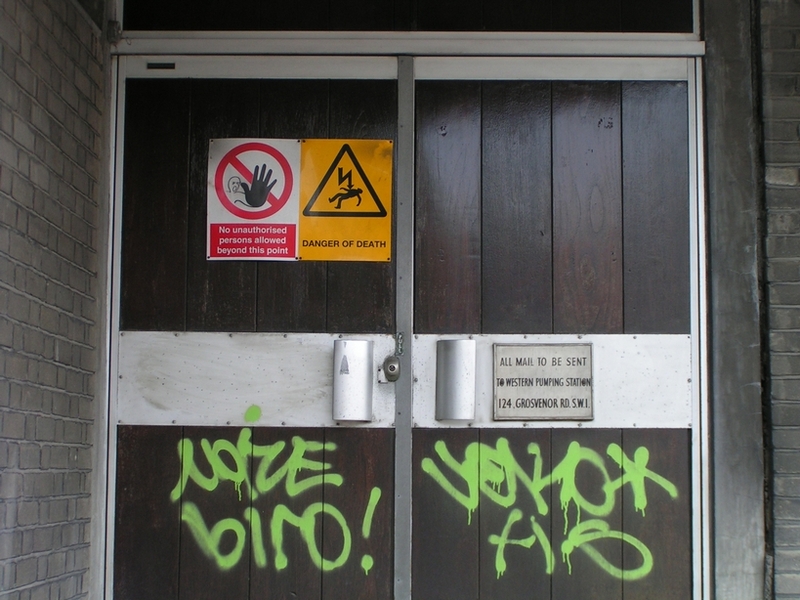 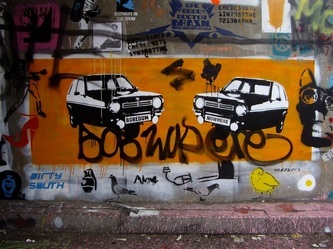 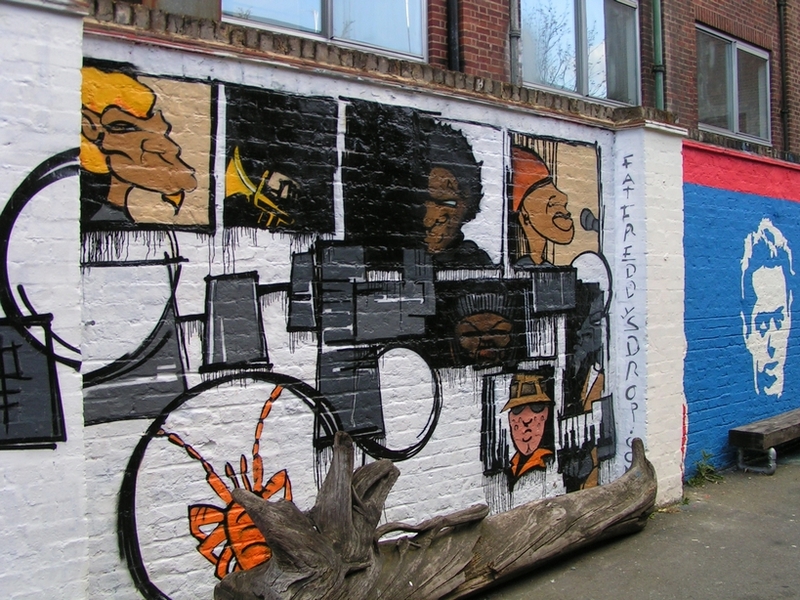 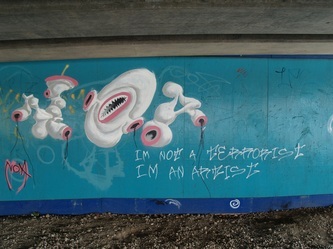 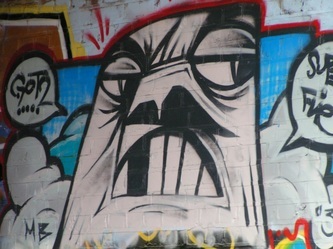 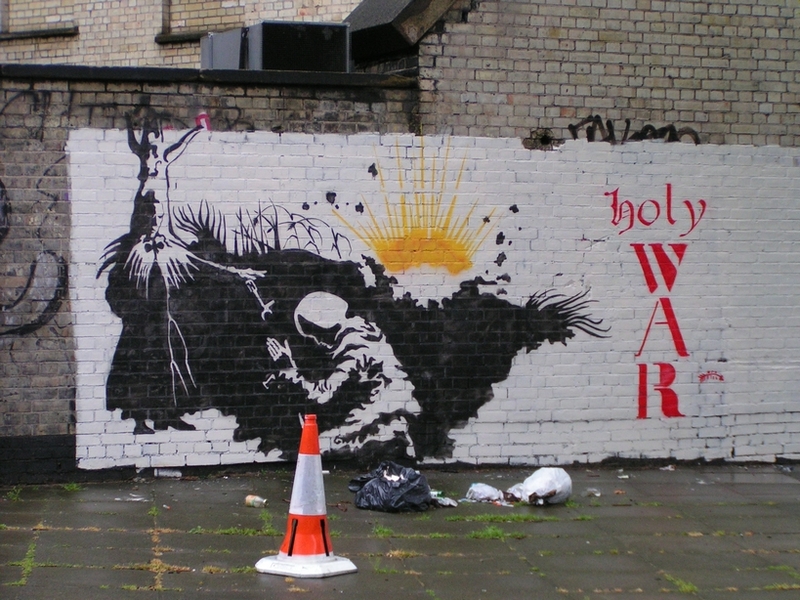 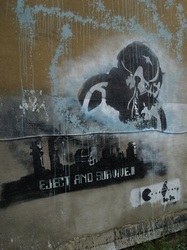 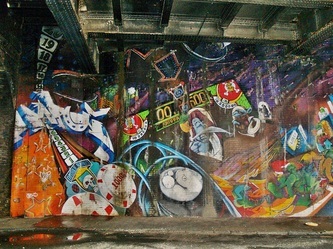 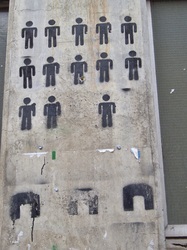 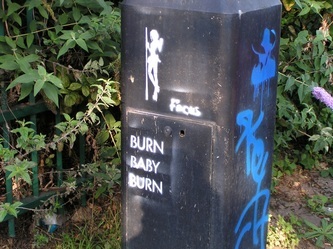 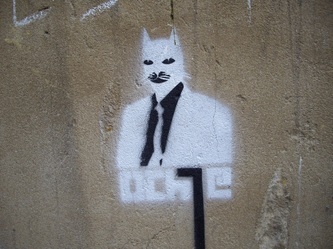 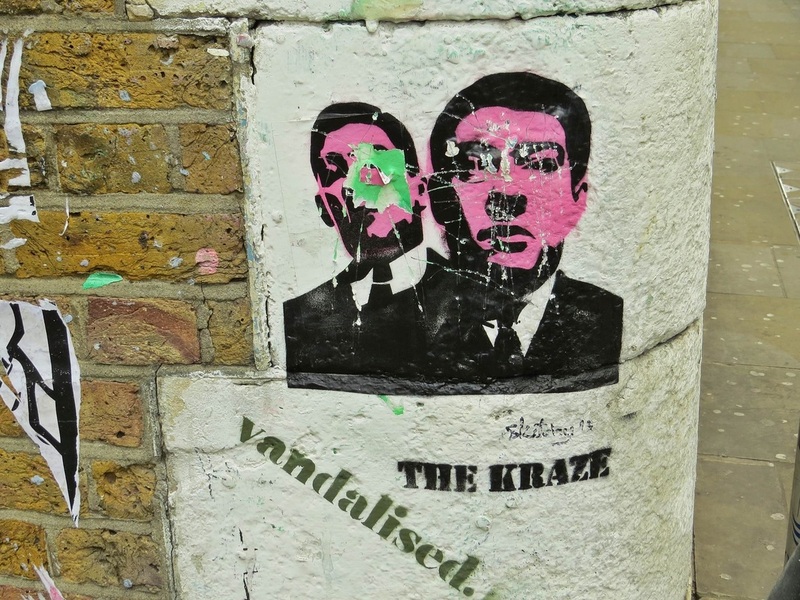 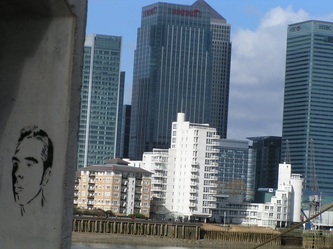 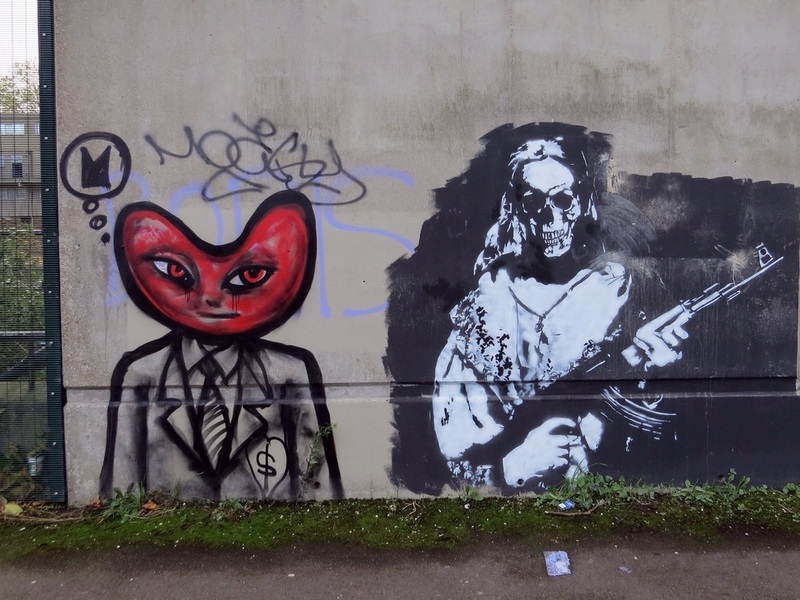 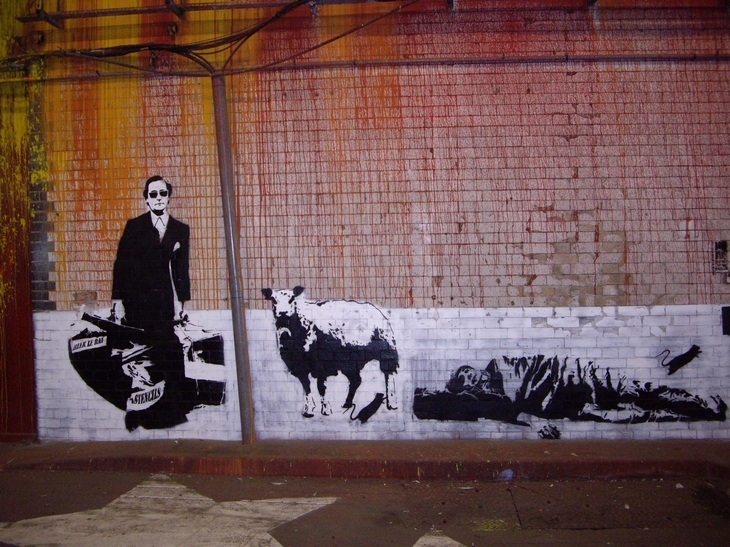 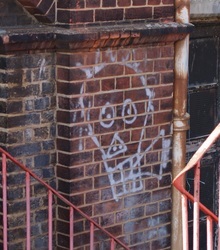 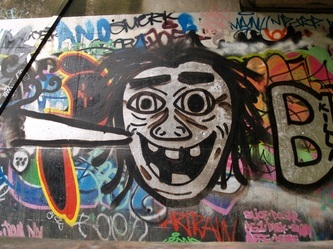 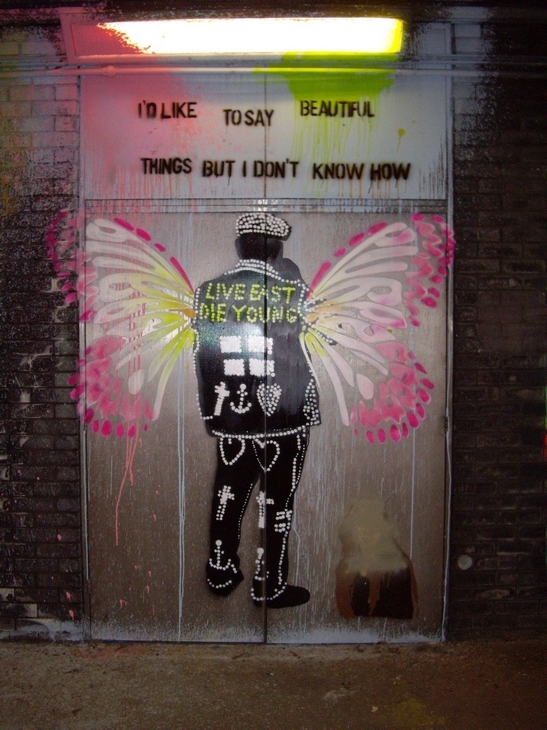 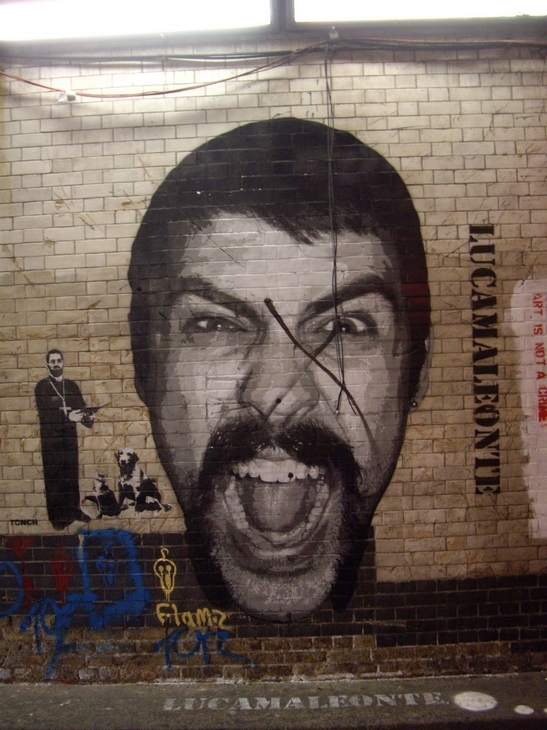 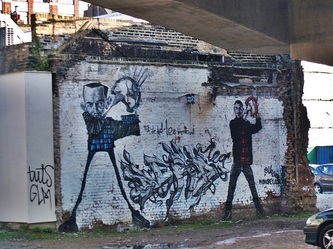 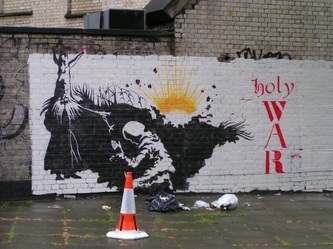 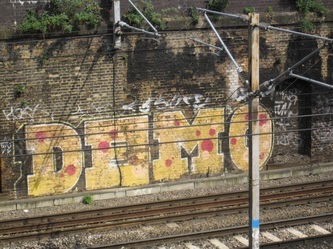 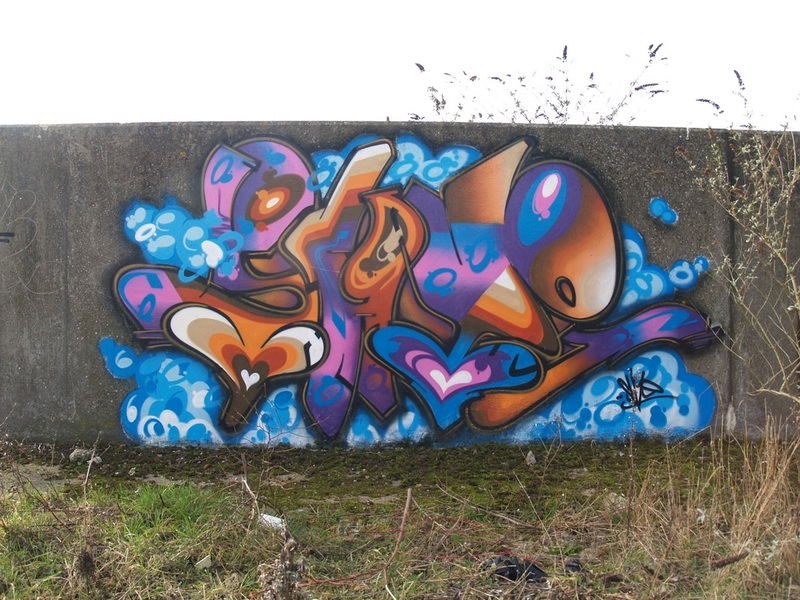 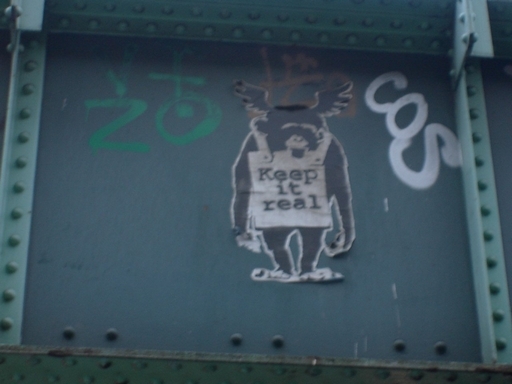 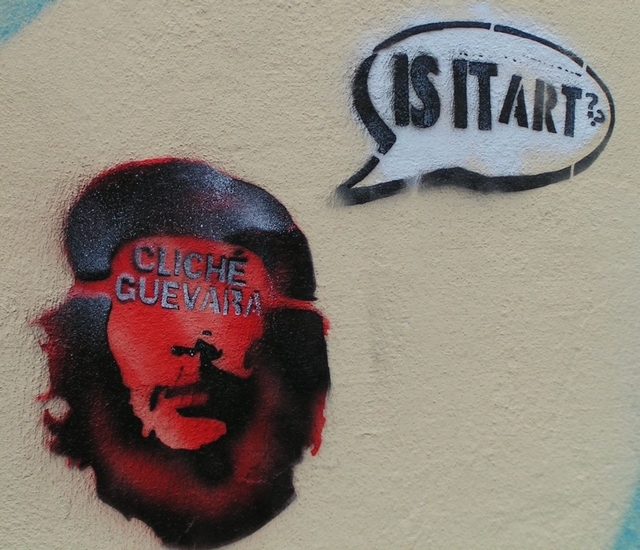 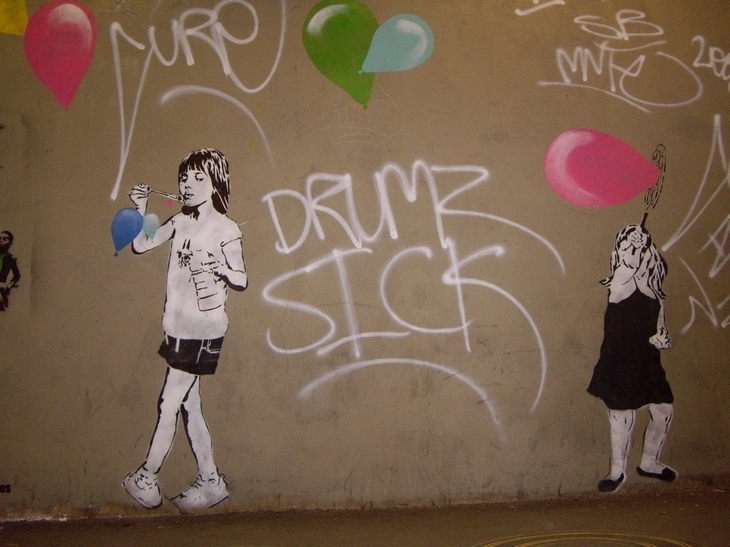 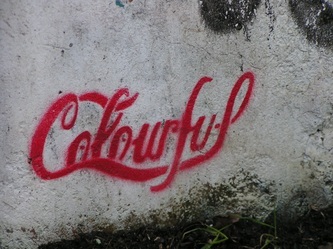 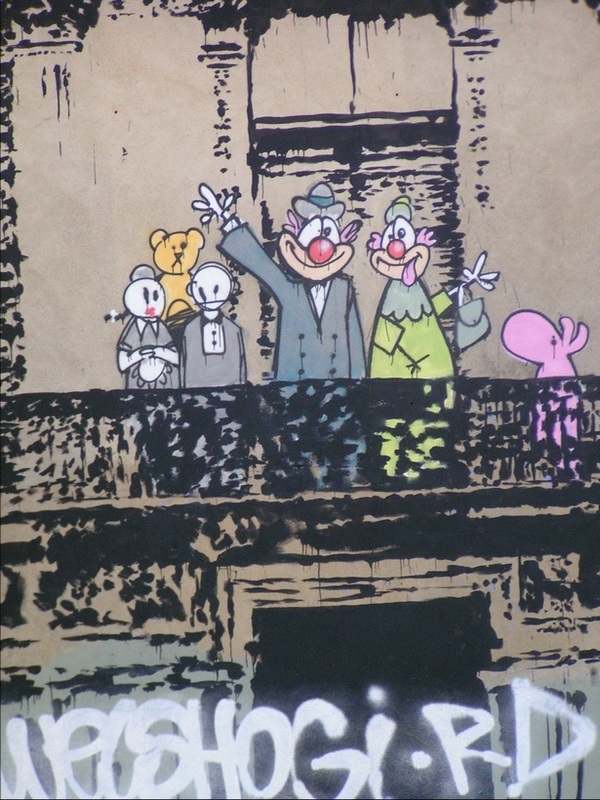 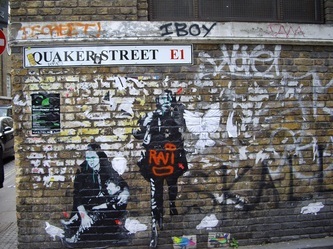 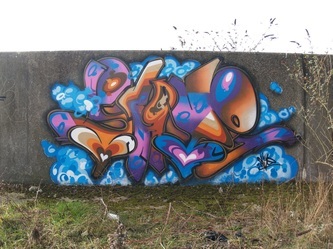 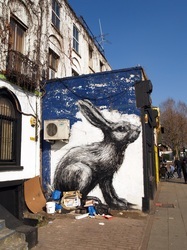 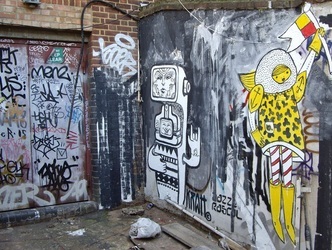 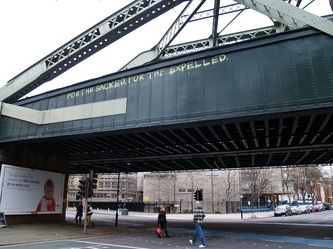 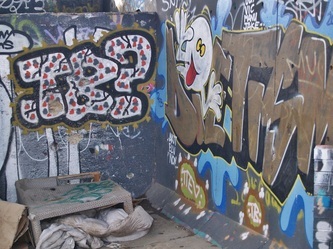 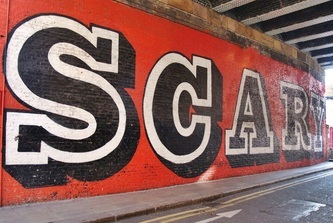 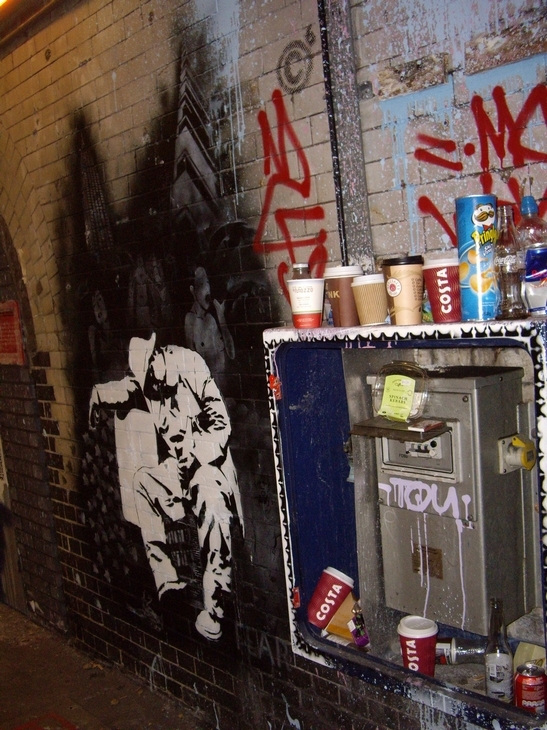 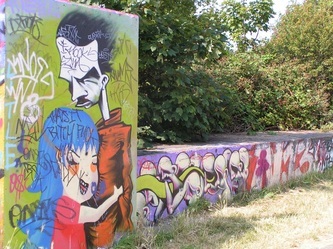 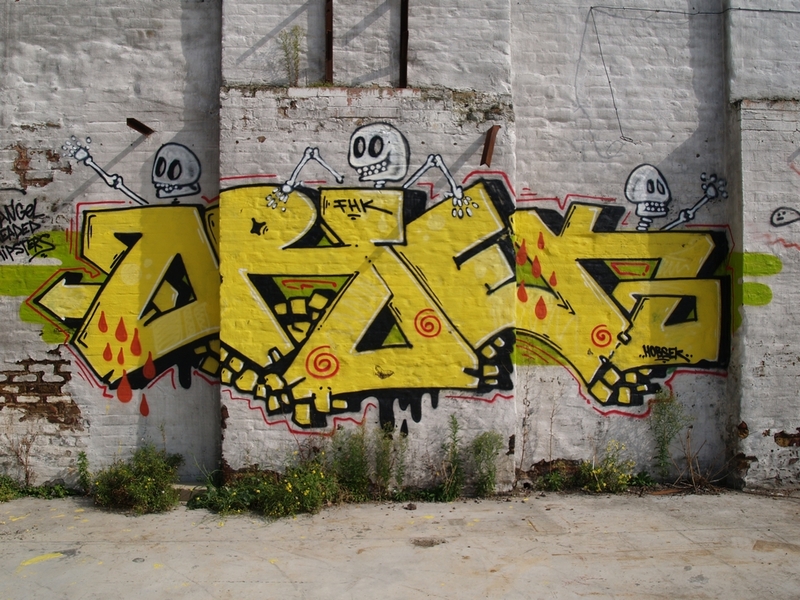 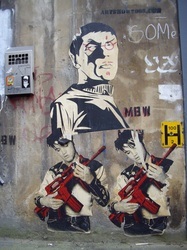 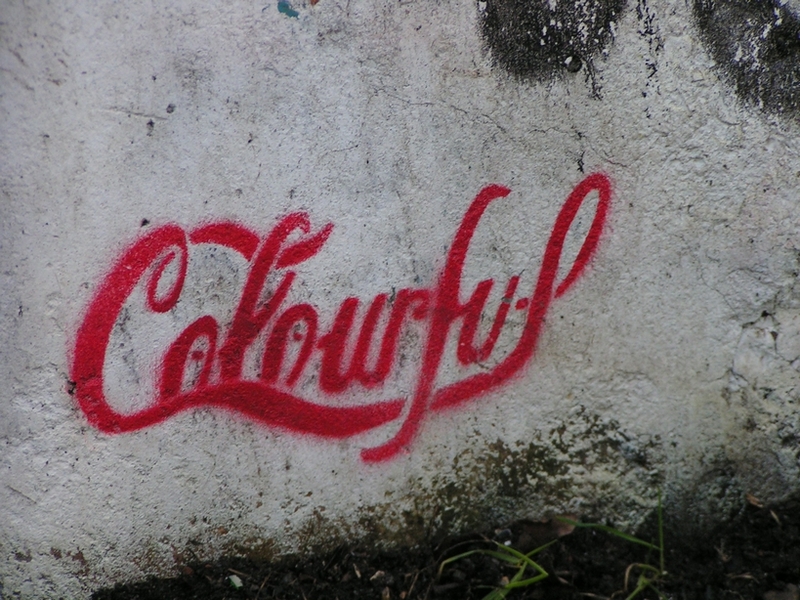 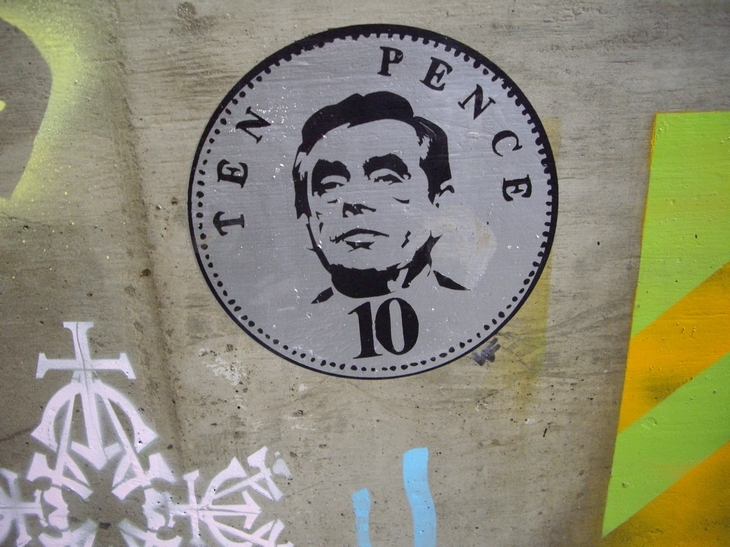 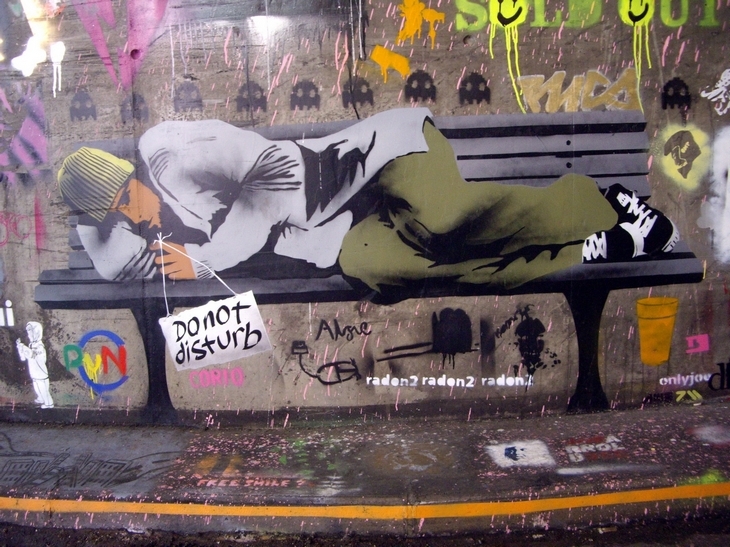 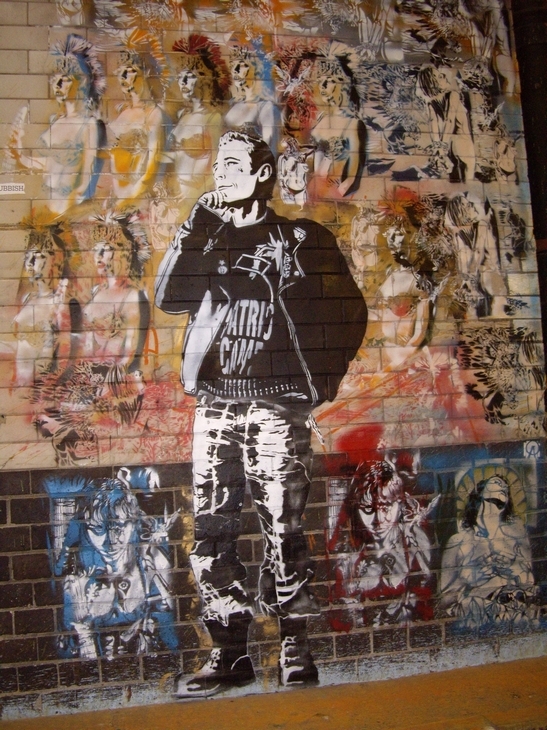 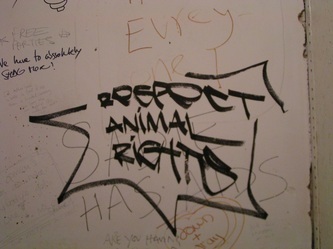 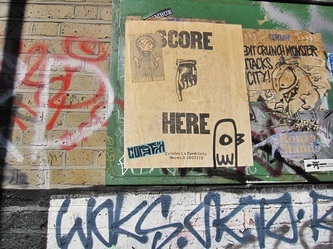 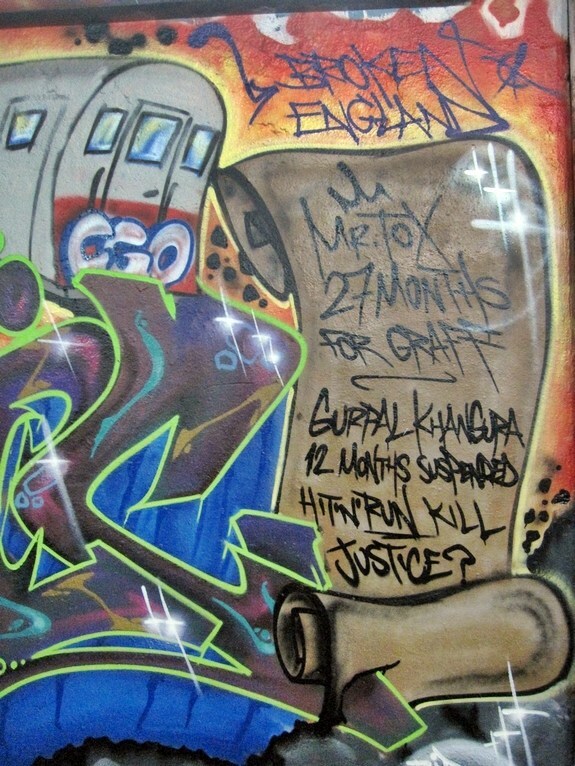 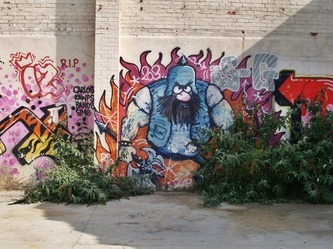 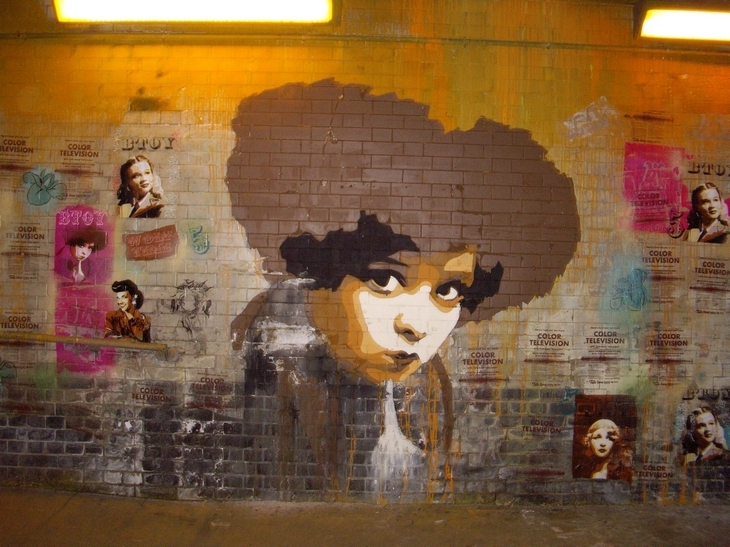 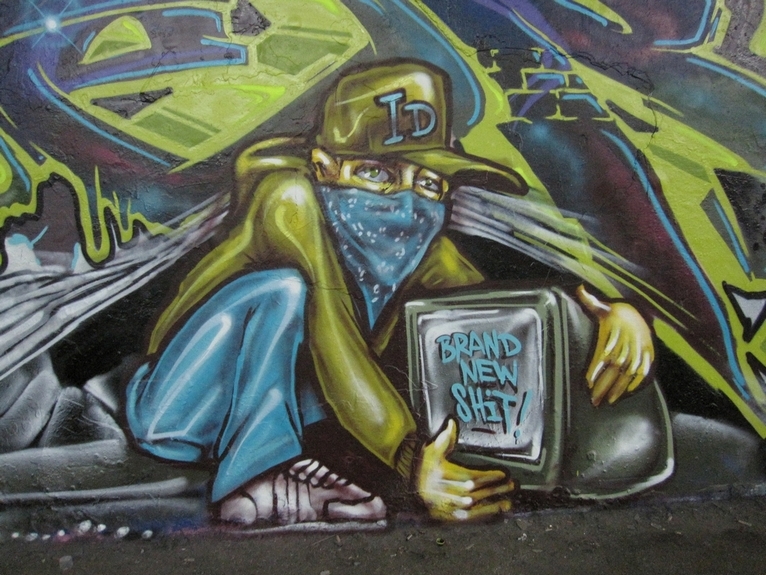 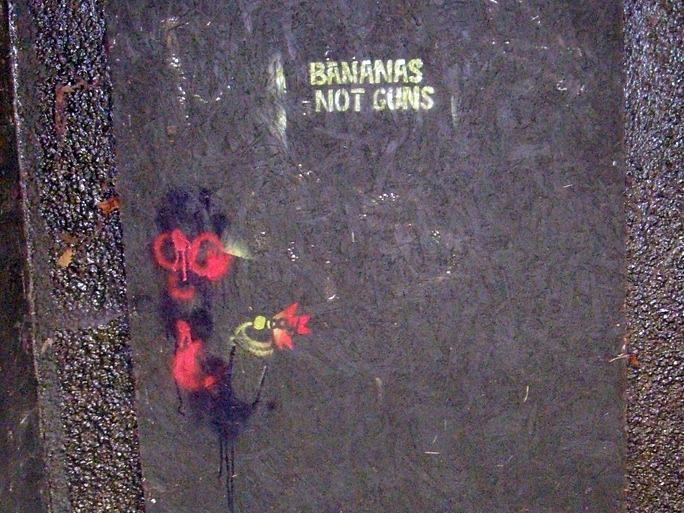 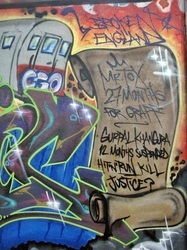 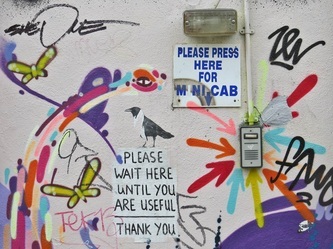 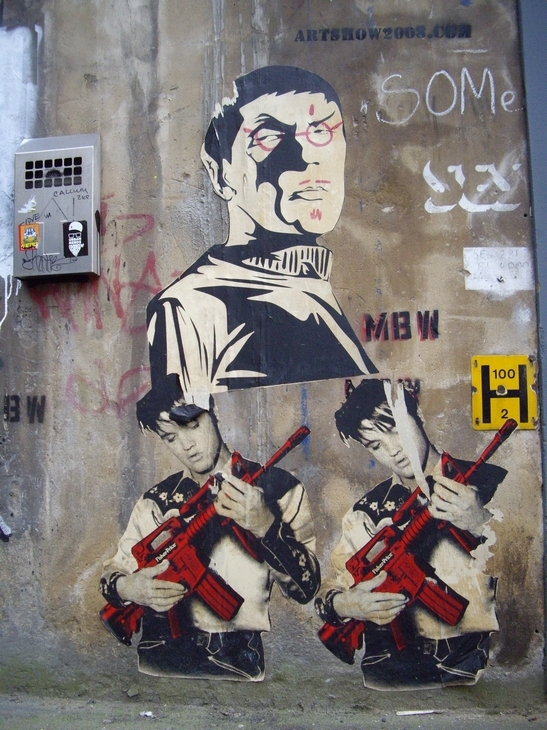 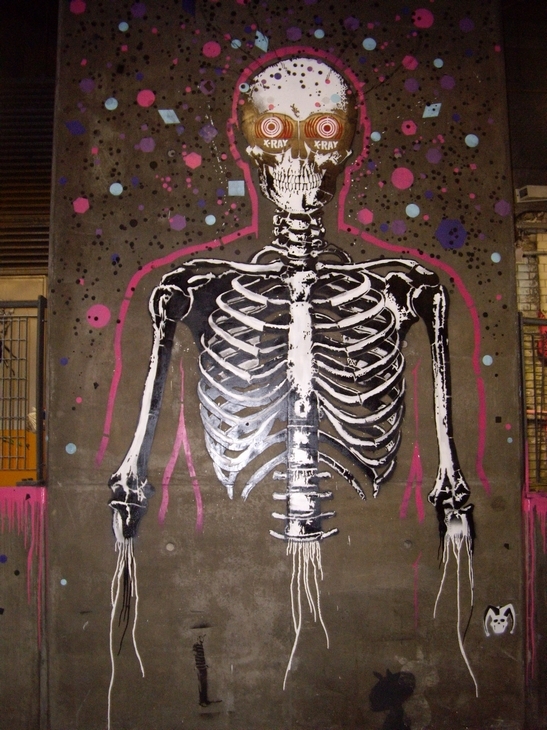 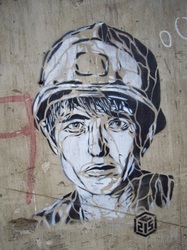 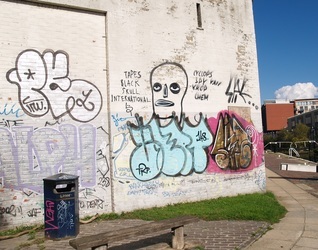 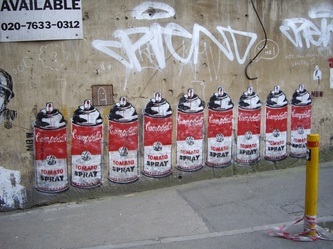 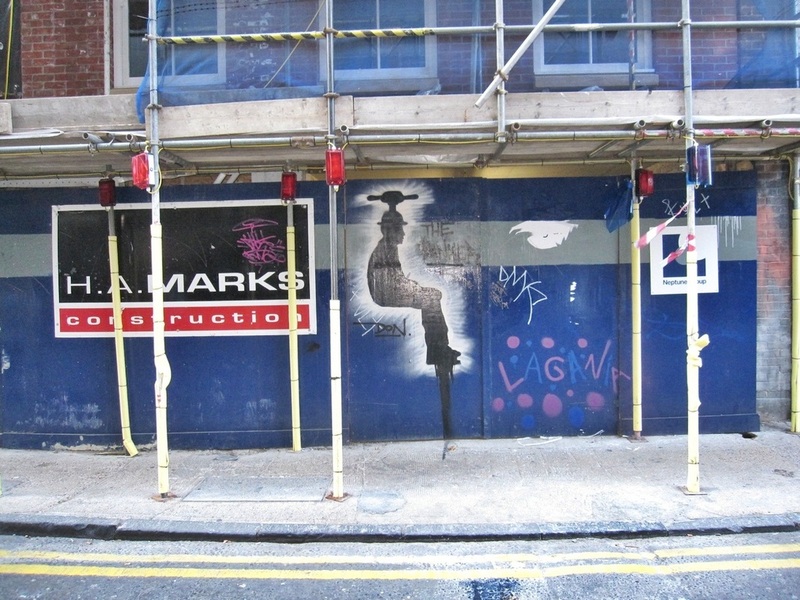 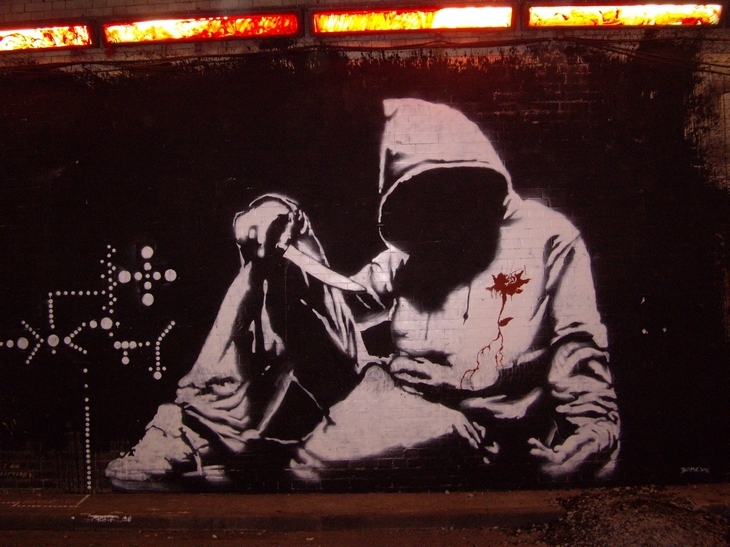 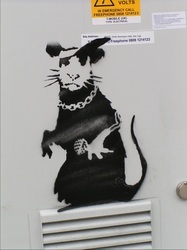 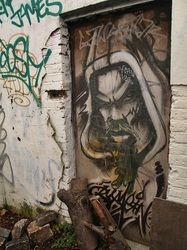 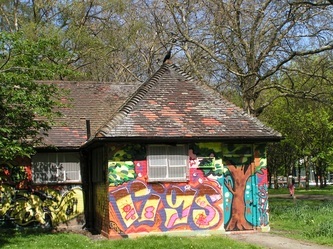 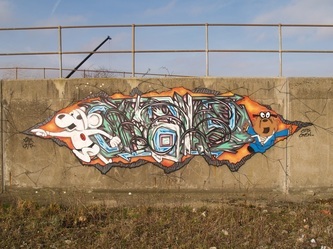 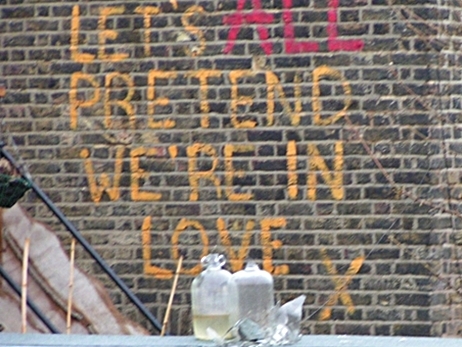 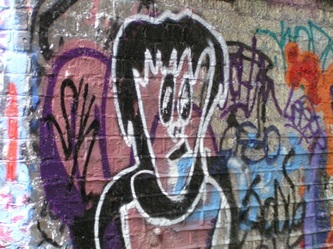 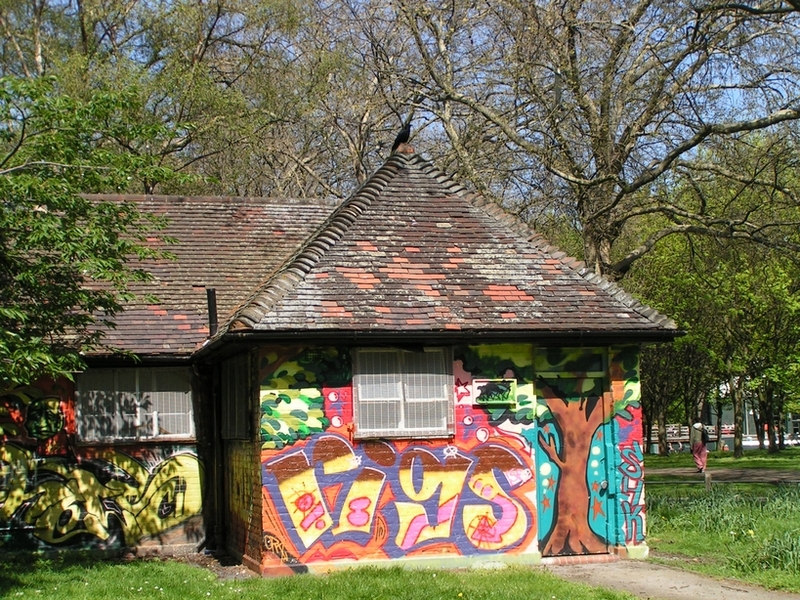 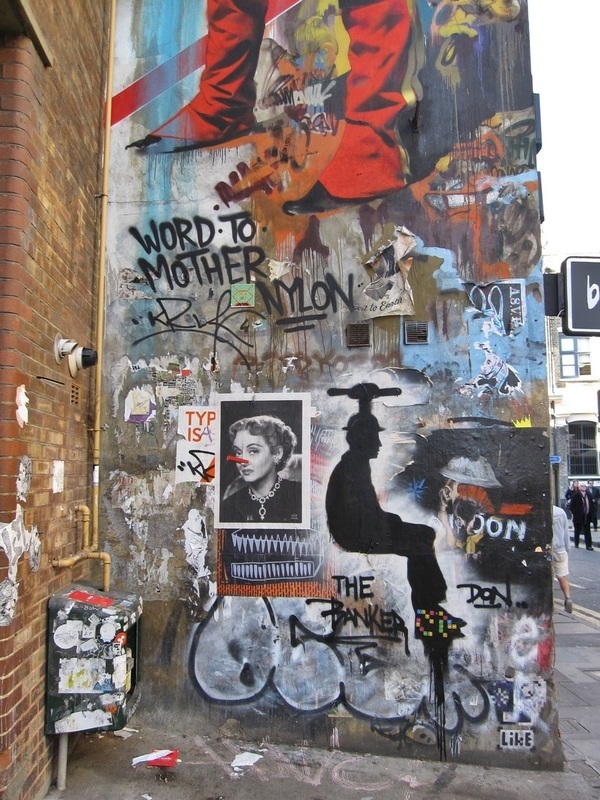 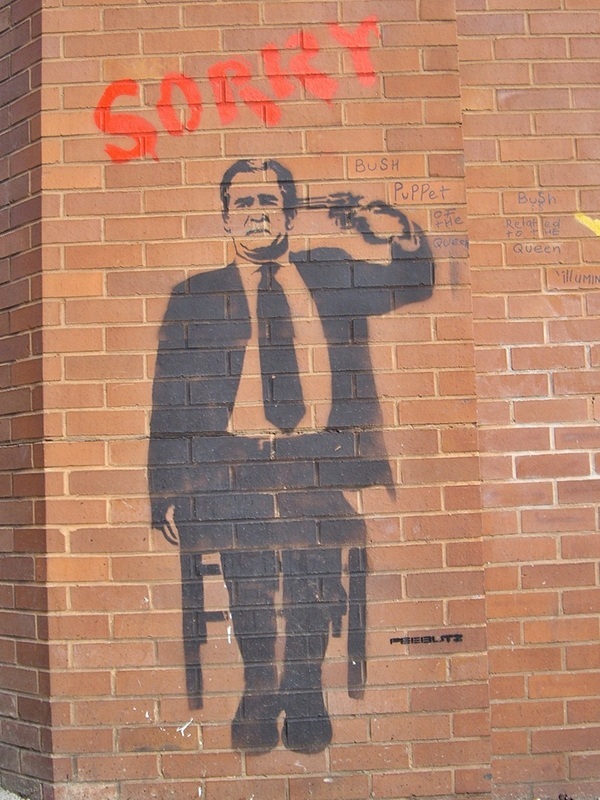 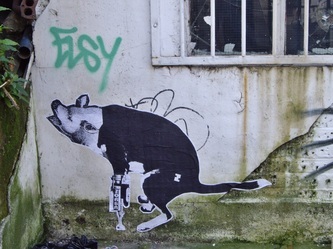 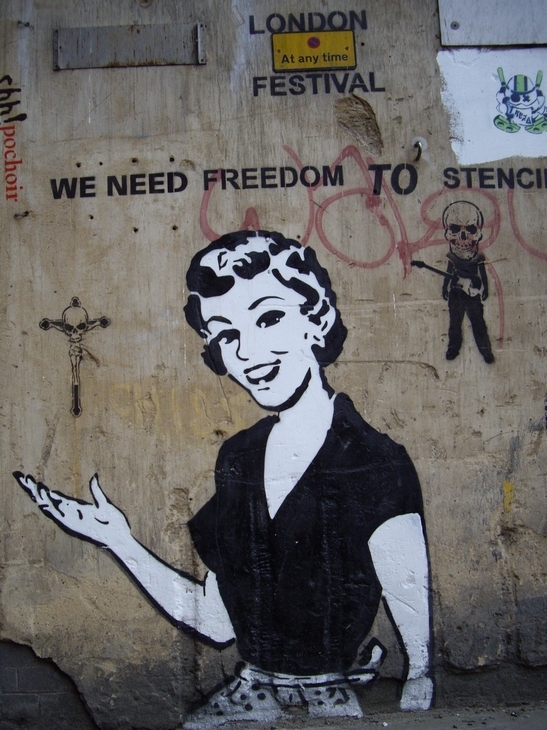 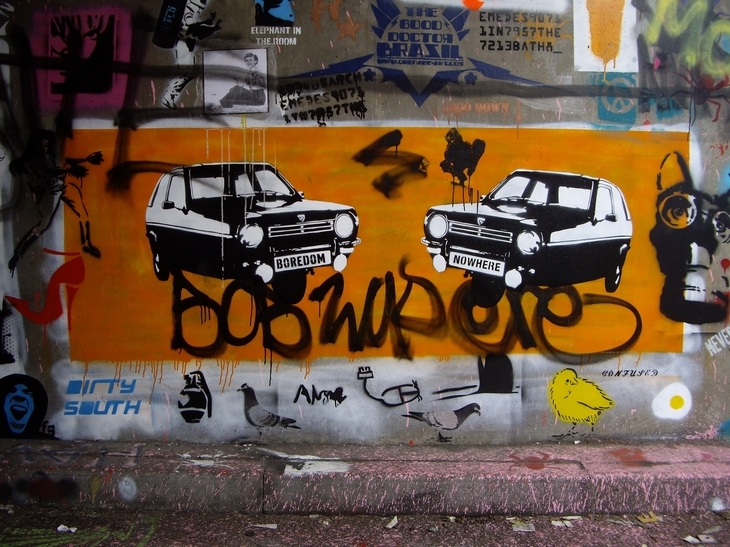 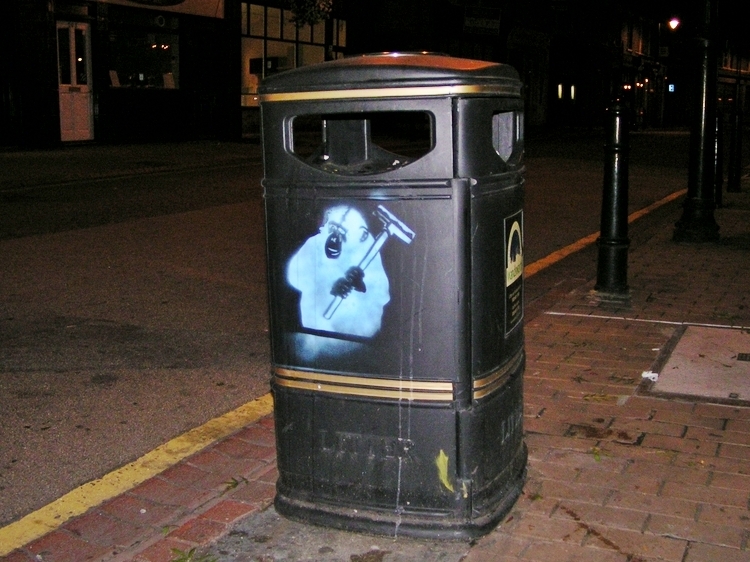 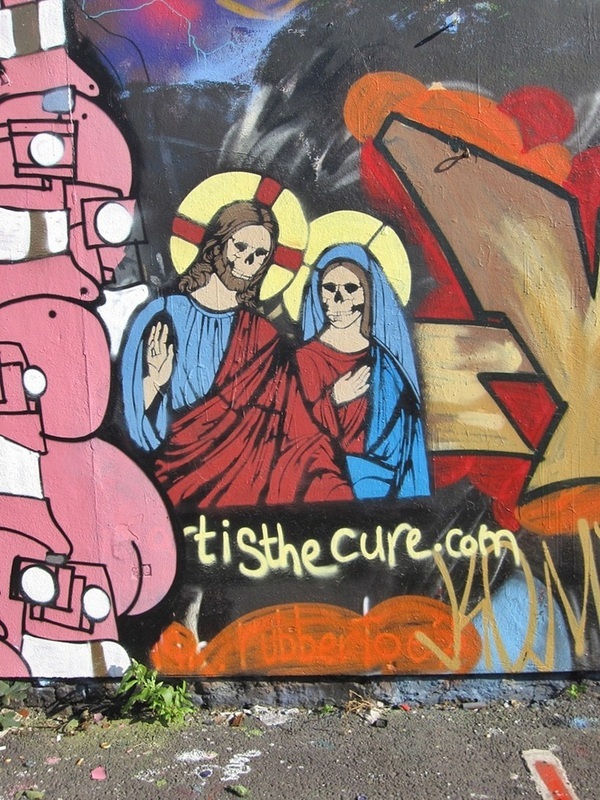 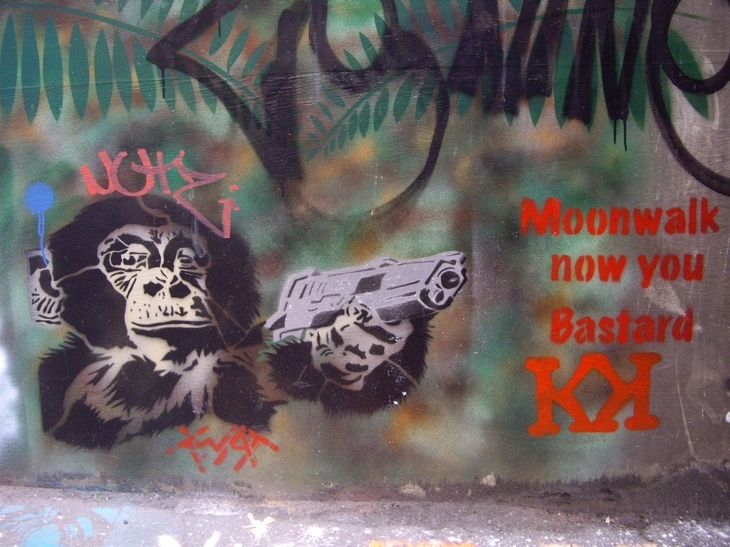 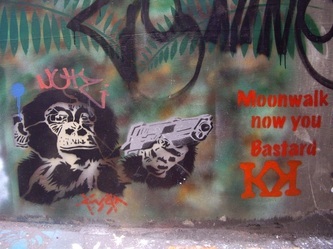 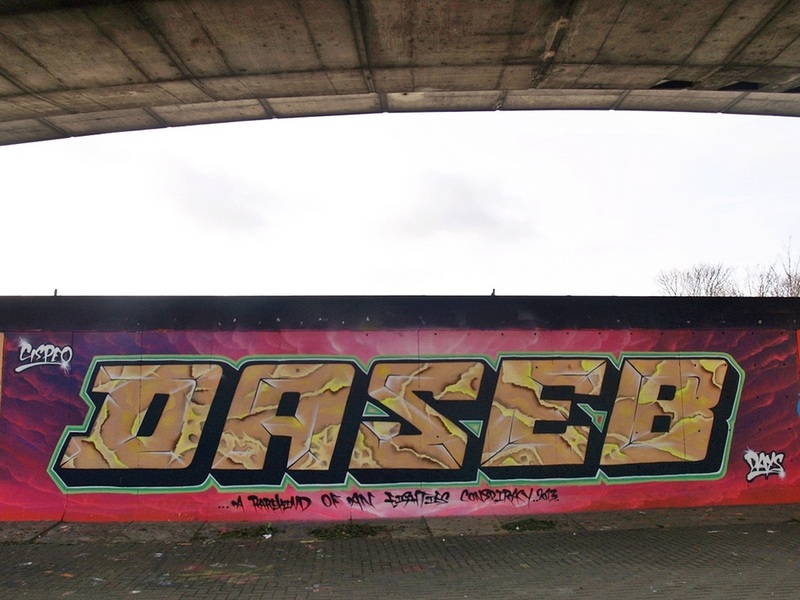 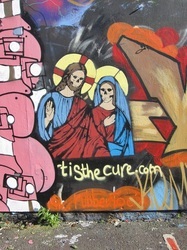 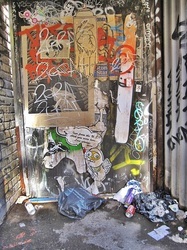 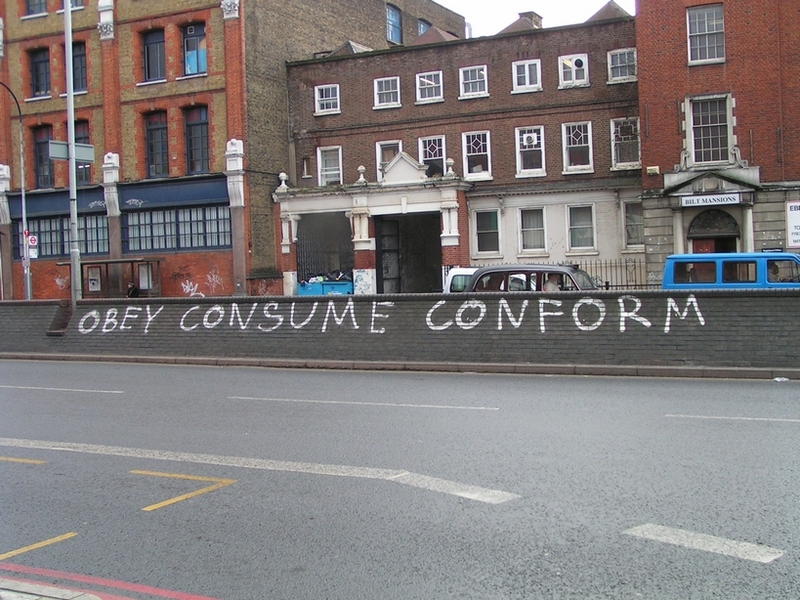 His street art, which combines graffiti writing with a distinctive stencilling technique, is similar to Blek le Rat, who began to work with stencils in 1981 in Paris and members of the anarcho-punk band Crass who maintained a graffiti stencil campaign on the London Tube System in the late 1970s/early 1980s. 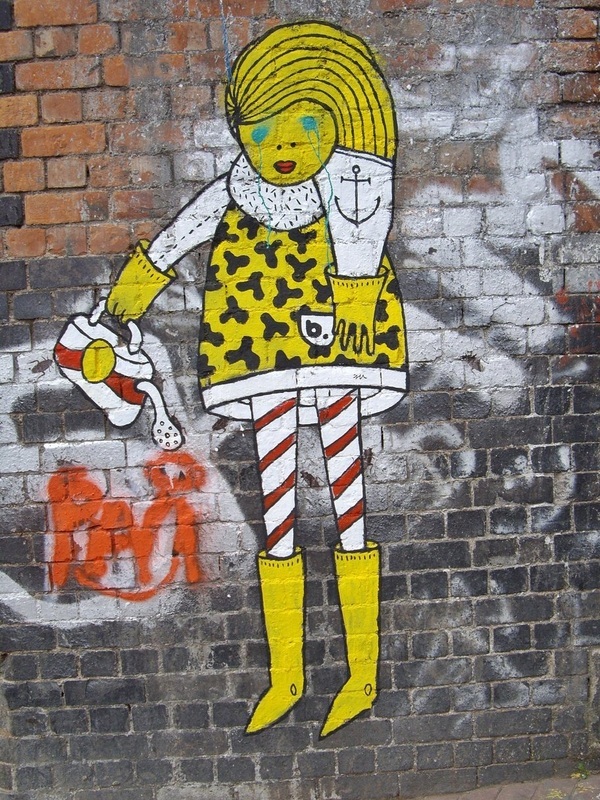 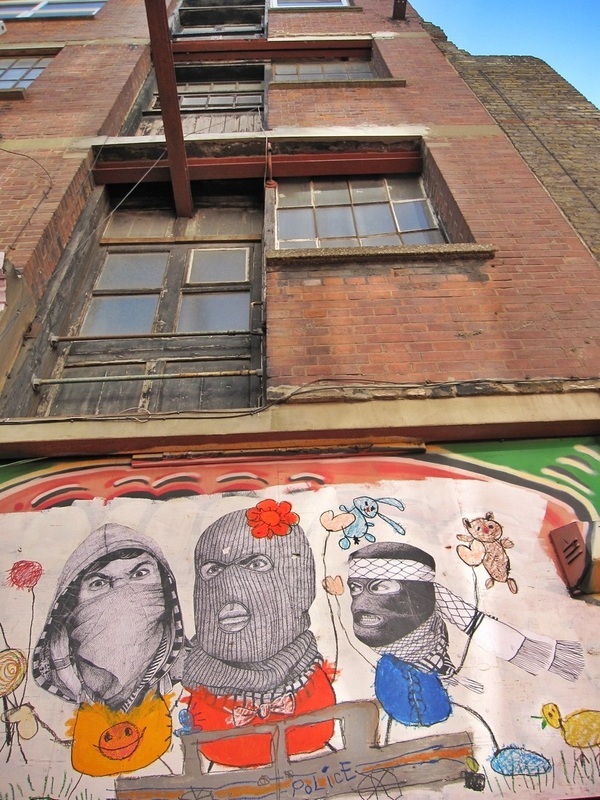 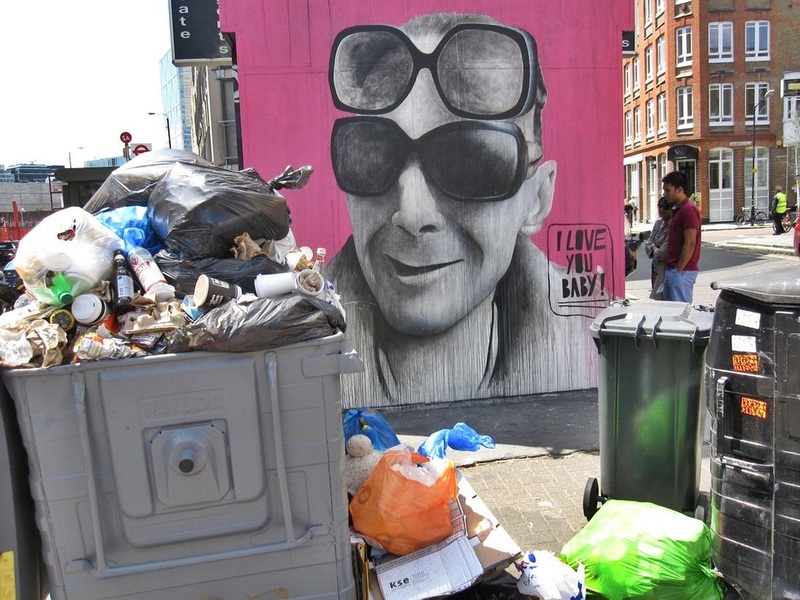 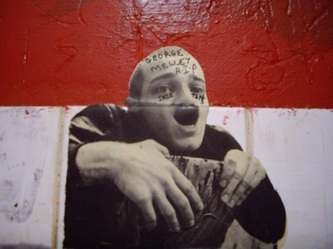 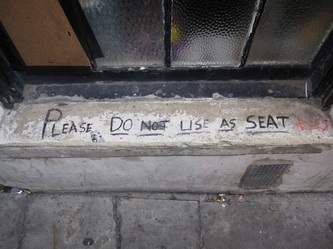 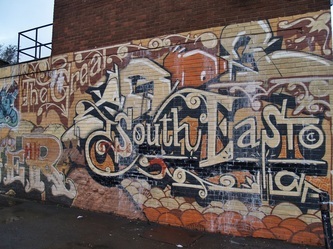 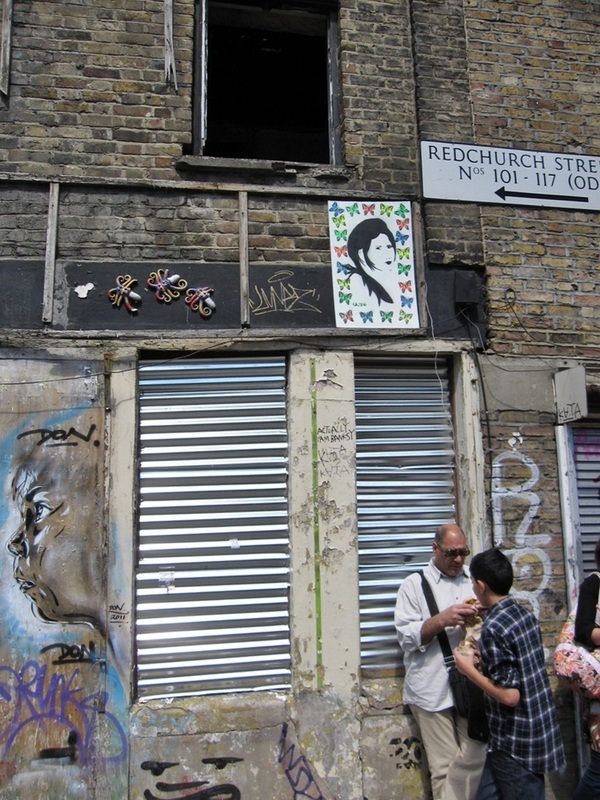 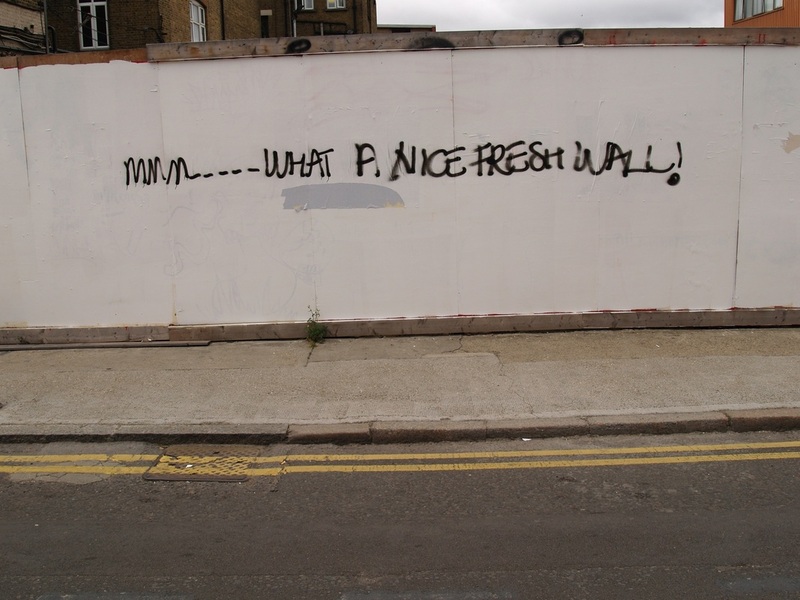 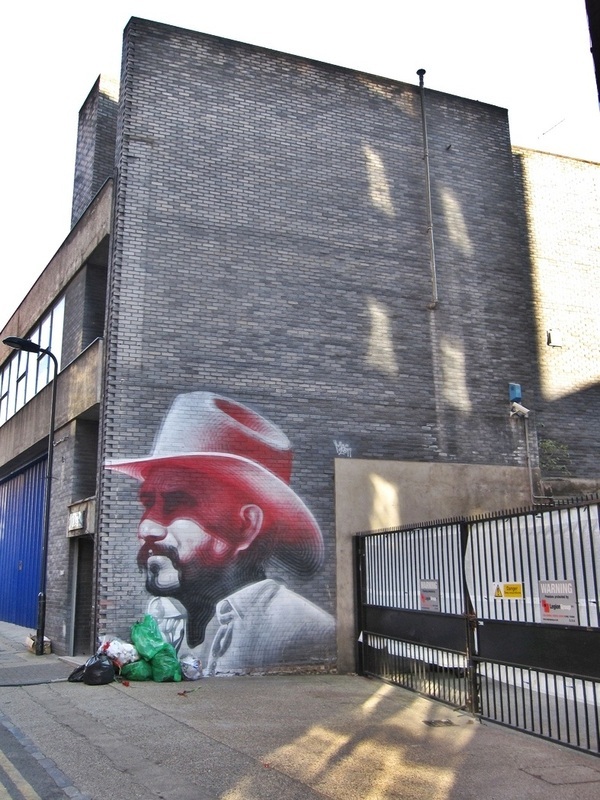 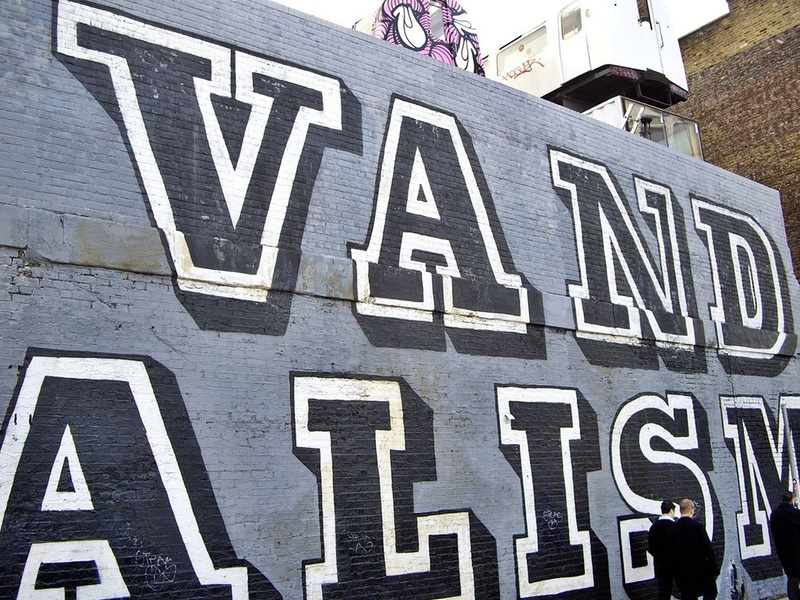 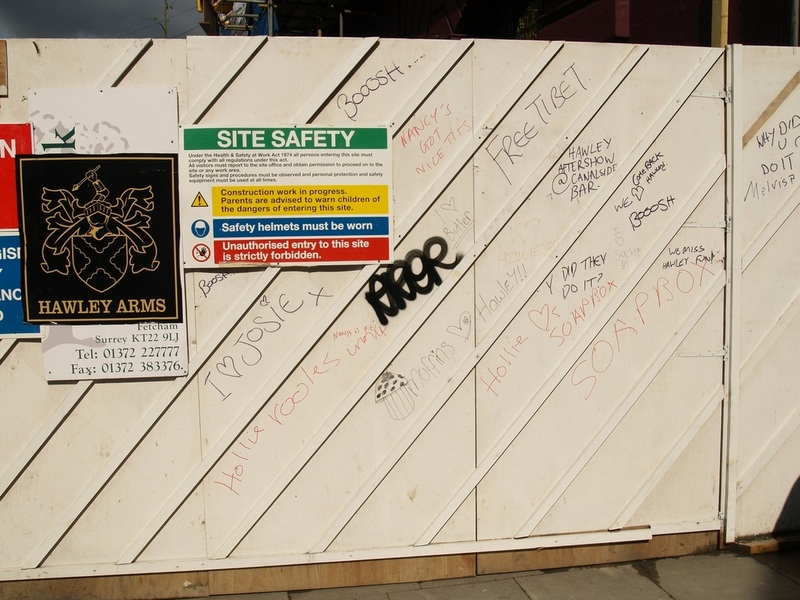 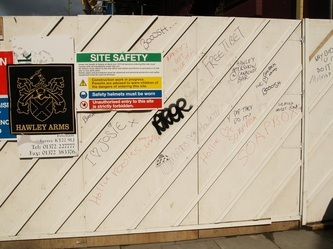 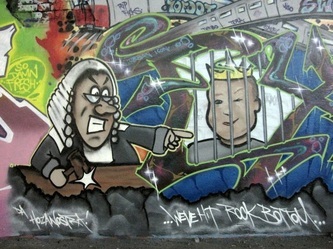 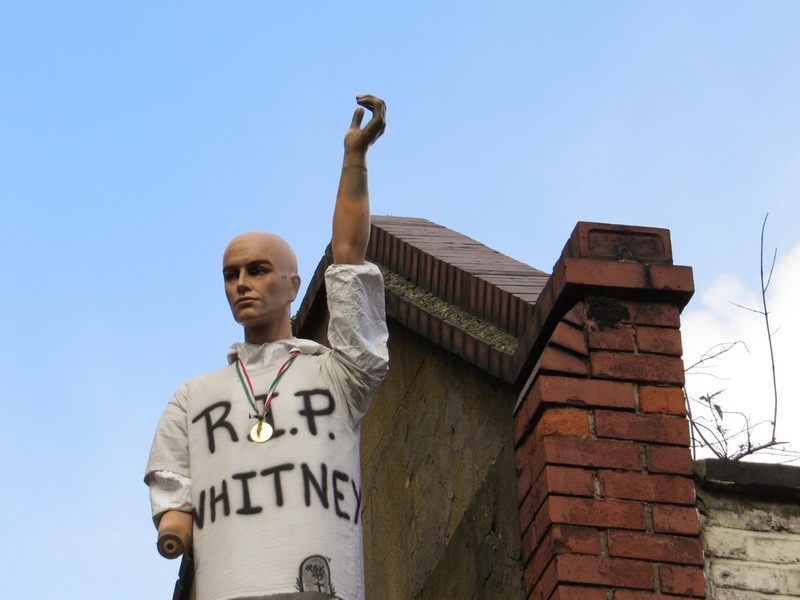 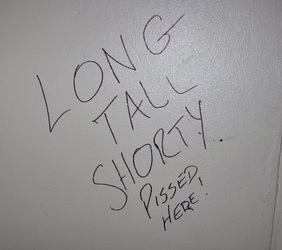 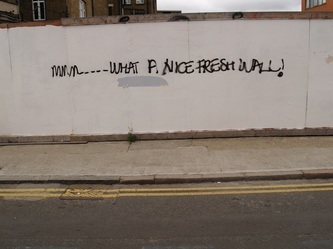 Billy was a much-loved local character and self-proclaimed ‘king of Brick Lane’ who passed away in 2010. 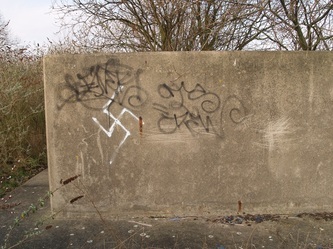 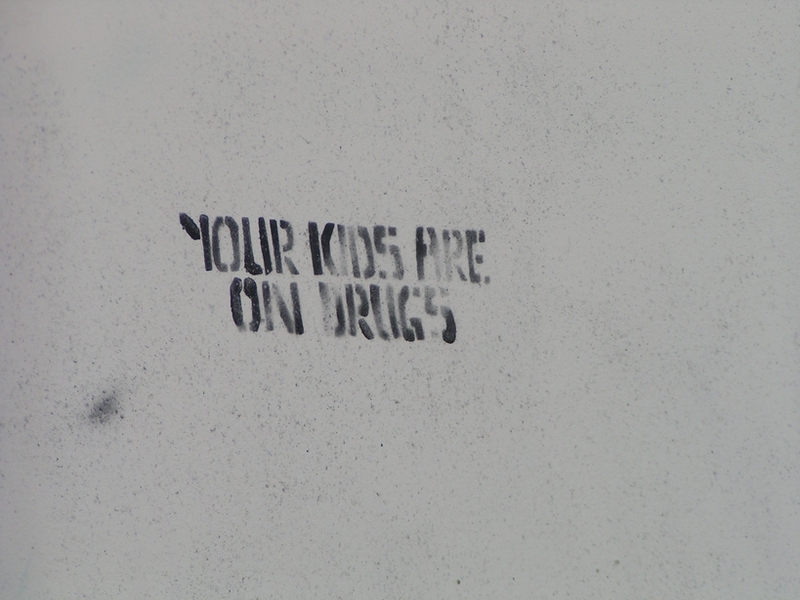 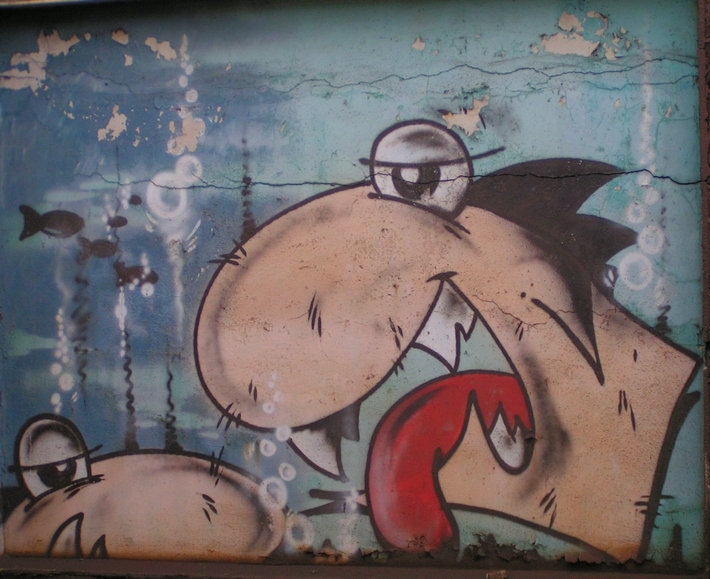 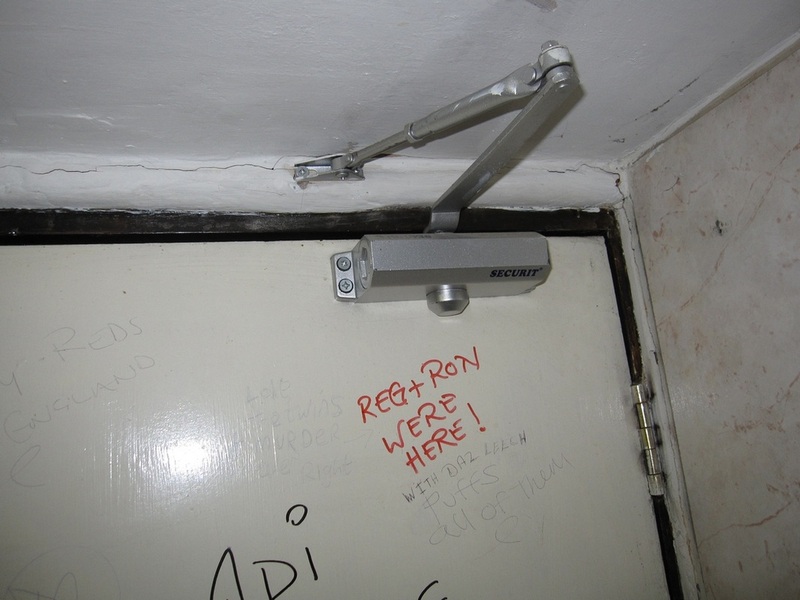 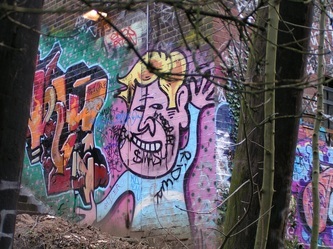 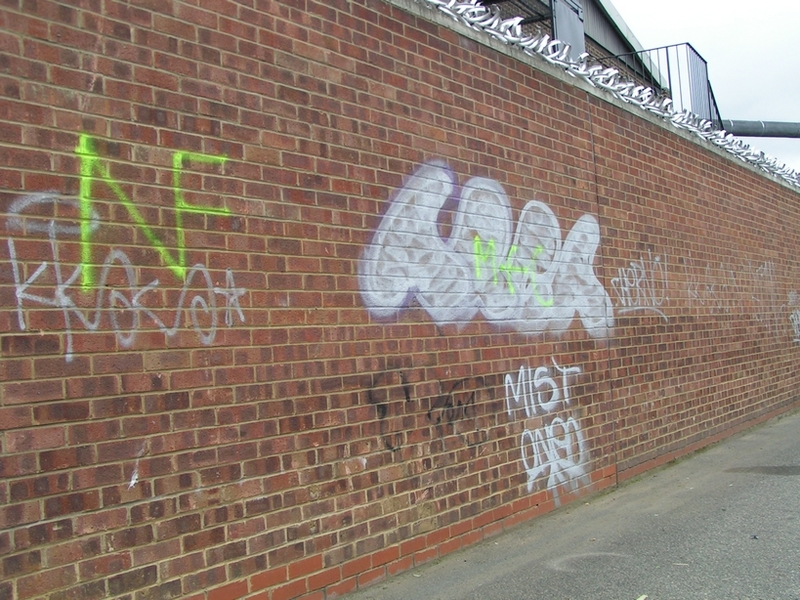 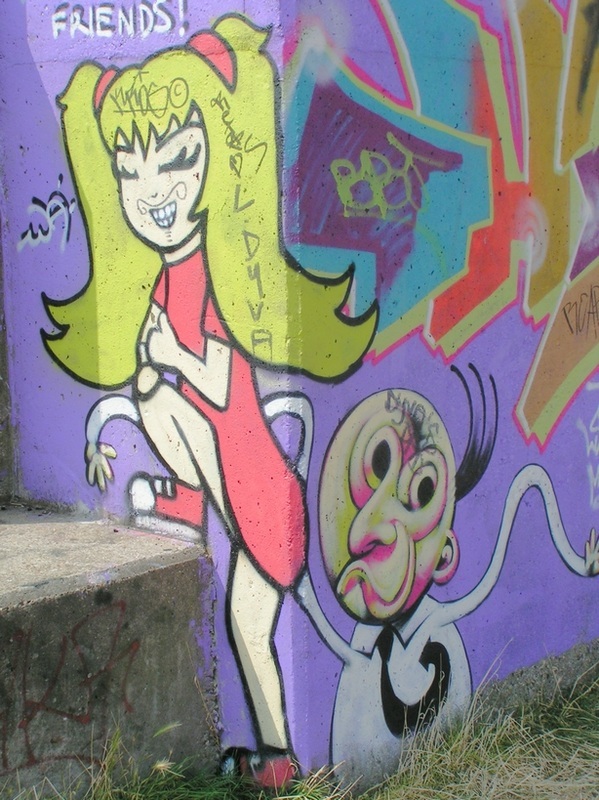 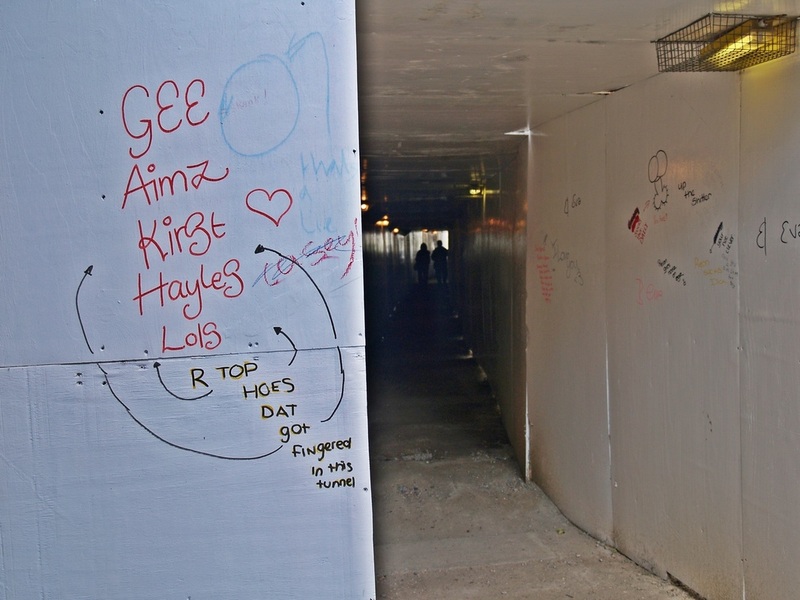 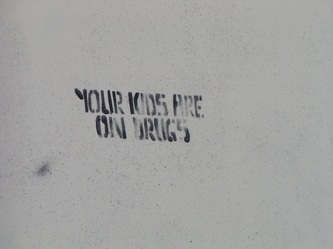 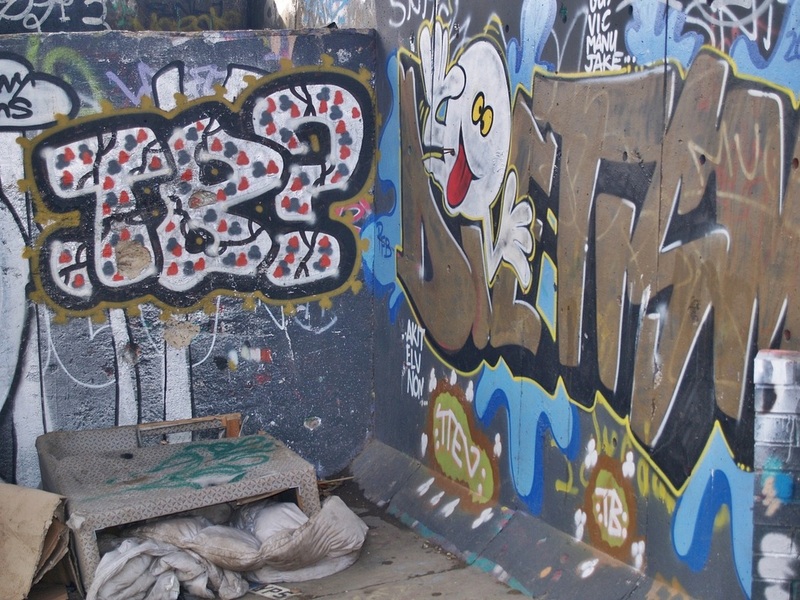 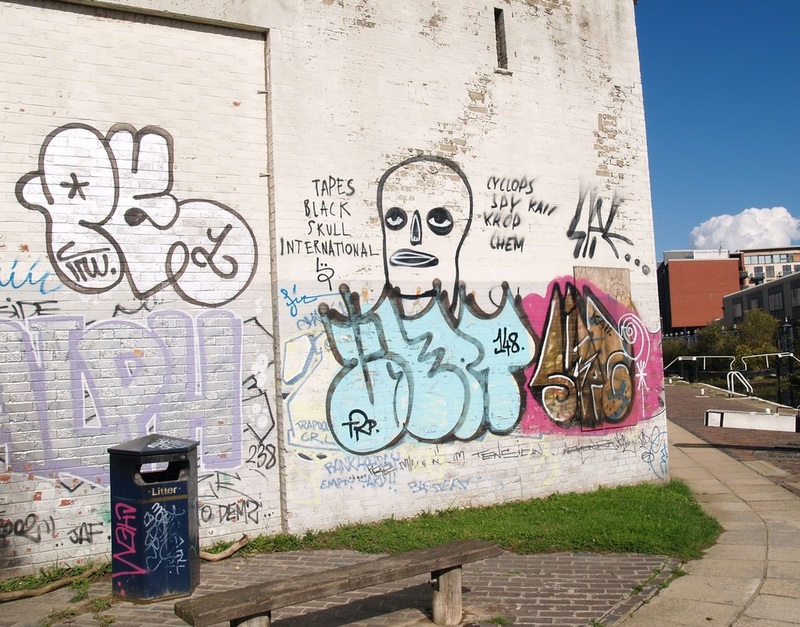 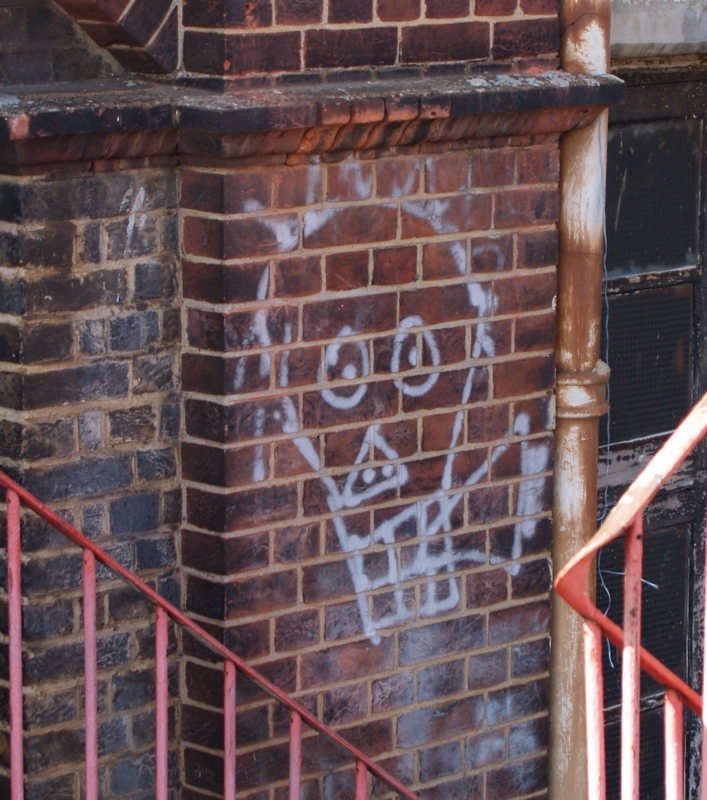 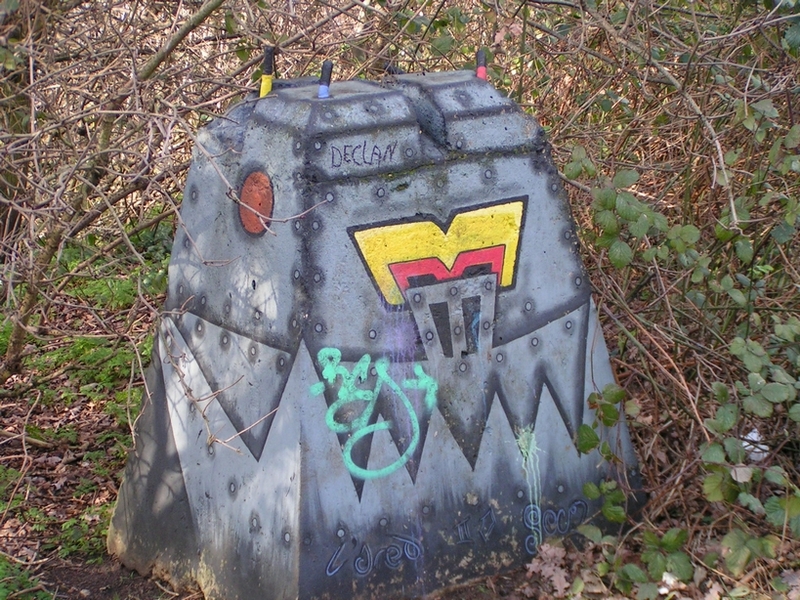 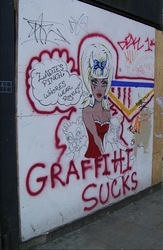 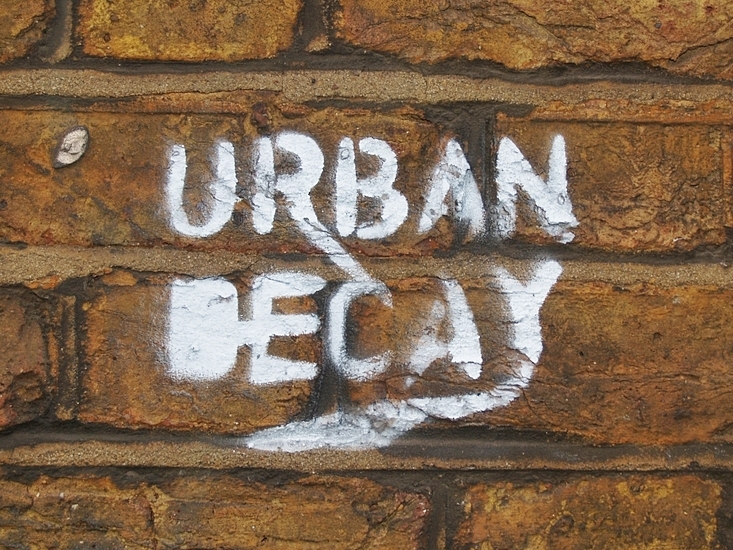 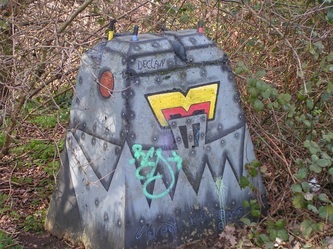 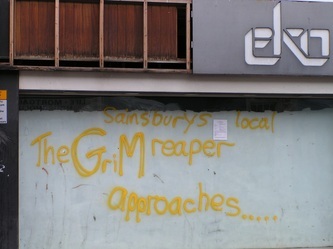 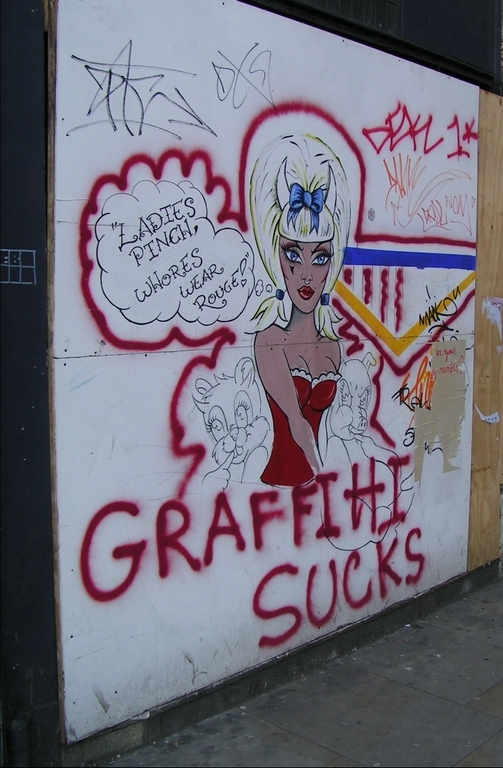 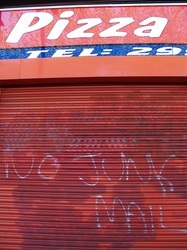 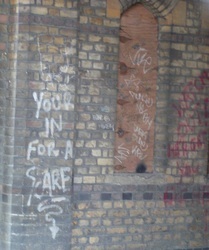 This graffiti is left over from the 1970s and was a common sight back in those days. George Davis is an ex-armed robber who became widely known through a very successful campaign by friends and supporters to free him from prison after his wrongful conviction in 1975 for an armed payroll robbery at the London Electricity Board (LEB) offices in Ilford in 1974. 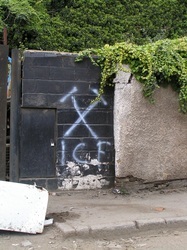 The conviction was based solely on the unreliable use of identification evidence, in the absence of any other evidence connecting him with the crime. Following his release Davis went on to be jailed for two other cases of armed robbery. 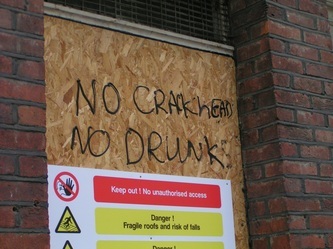 In 1975 while Davis was serving a 20 year prison sentence for the Ilford LEB robbery the pitch at the Headingley cricket ground was dug up by his supporters, preventing further play in the test match between England and Australia. 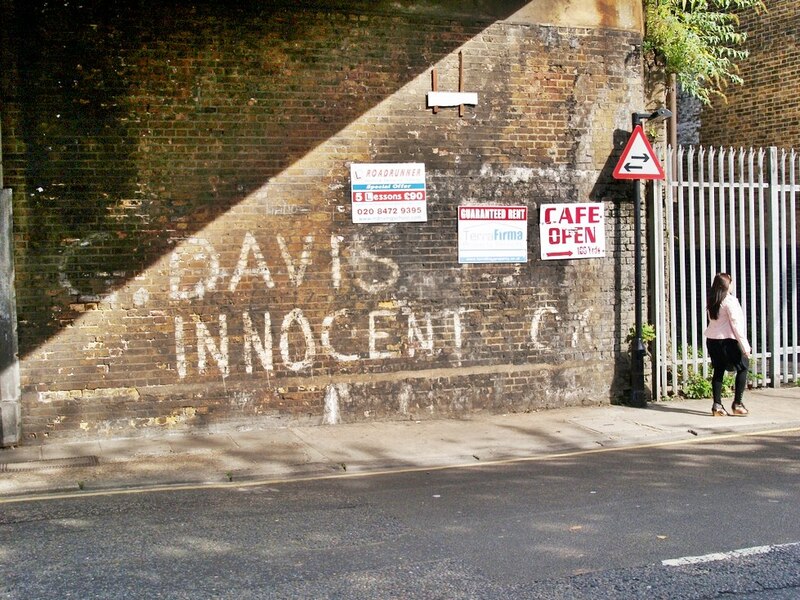 This dramatic direct action protest by relatives and friends of George Davis was accompanied by typical Davis Campaign graffiti proclaiming "FREE GEORGE DAVIS ... JUSTICE FOR GEORGE DAVIS ... GEORGE DAVIS IS INNOCENT ..."
Roger Daltrey of The Who was seen onstage in 1975 wearing a T-shirt emblazoned with "George Davis Is Innocent". "George Davis is Innocent" was also a song on Sham 69's 1978 debut album Tell Us the Truth, Davis also received a namecheck in a Duran Duran song entitled "Friends of Mine" on the album Duran Duran (1981): the chorus begins "Georgie Davis is coming out". 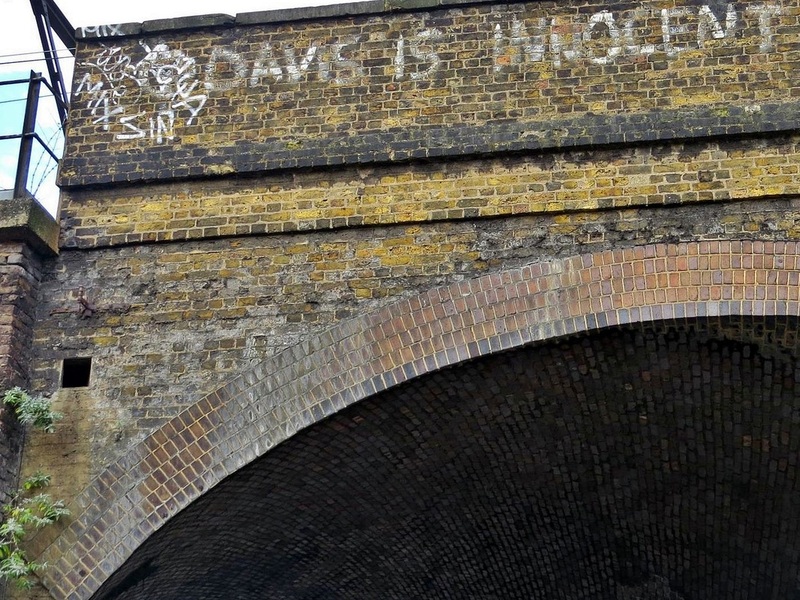 Although Davis was released in 1976 because his conviction was deemed to be "unsafe" by the Home Secretary he extraordinarily held that Davis was not held to be "innocent". 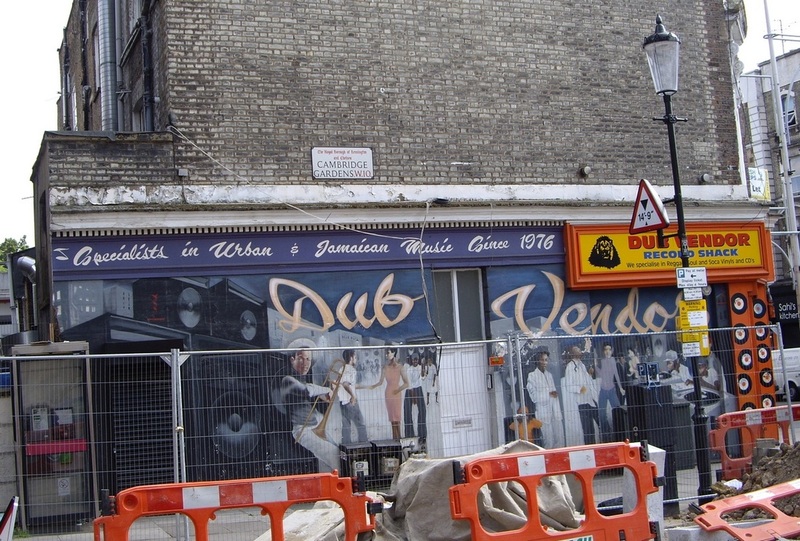 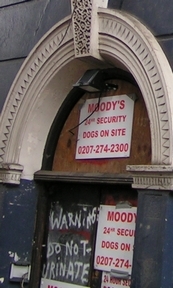 Two years after his release from prison, Davis was jailed again, having pleaded guilty to involvement in another armed bank raid in 1977 at The Bank of Cyprus, Seven Sisters Road. Davis was caught at the wheel of the getaway van with weapons beside him; in the raid shots were fired and a security guard clubbed to the ground. Having been released in 1984, he was jailed yet again in 1987 for attempting to steal mailbags. 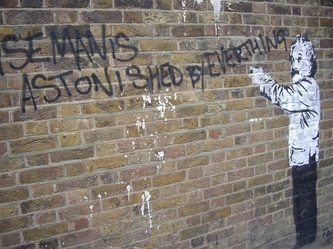 Davis admitted his guilt for both of these robberies. In 2011, Davis' conviction for the 1974 raid on the London Electricity Board was quashed by three judges at the Court of Appeal. 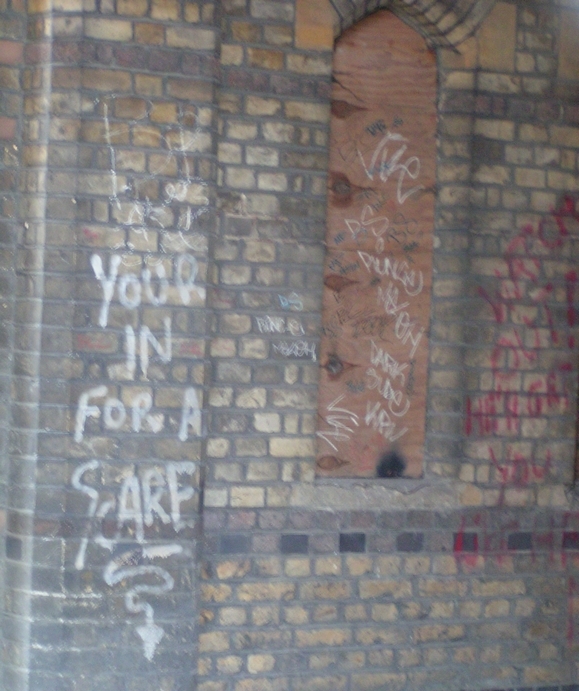 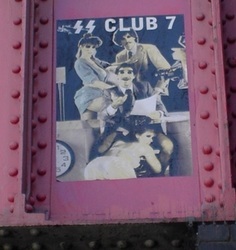 Under the railway bridge where the A2 Old Kent Road becomes the New Cross Road is this early 1980s grafitti that was once seen all over London. 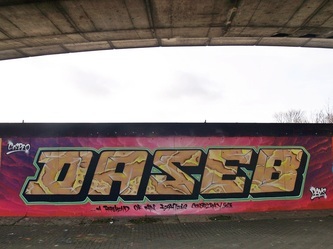 CASE were a South East London post-punk/ska band. 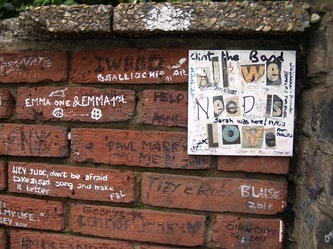 The band gained quite a reputation but only released one piece of vinyl in their time together – the ‘Wheat from the Chaff’ EP - gaining airplay by John Peel & Kid Jensen. They famously played at The Rainbow in November 1981 where smoke flares and buckets of maggots flew into the crowd as the band played according to the Damaged Goods website who in 2011 released a compilation of all previous CASE recordings. 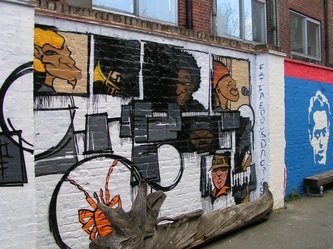 The band then reformed in 2011 and recorded new material which was also released by Damaged Goods. The band played a gig at the 100 Club around that time and made a couple of appearances at the Rebellion festival in Blackpool. 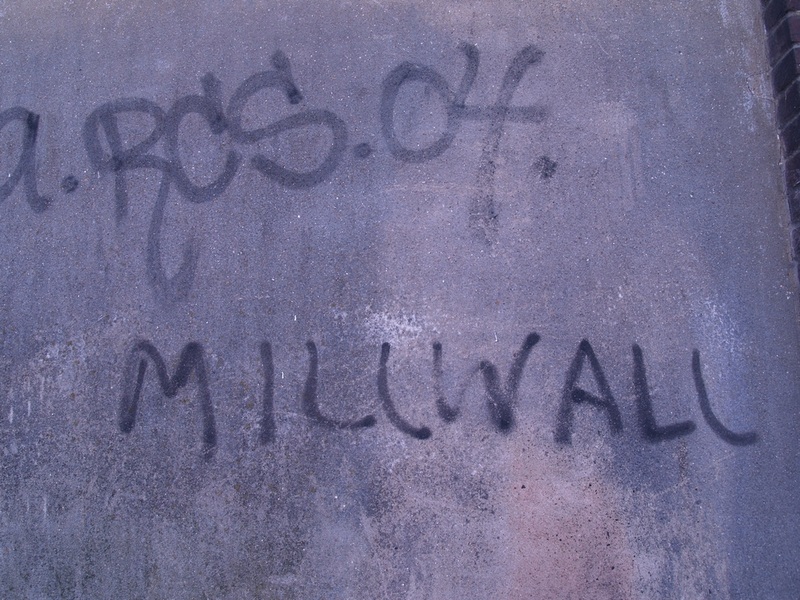 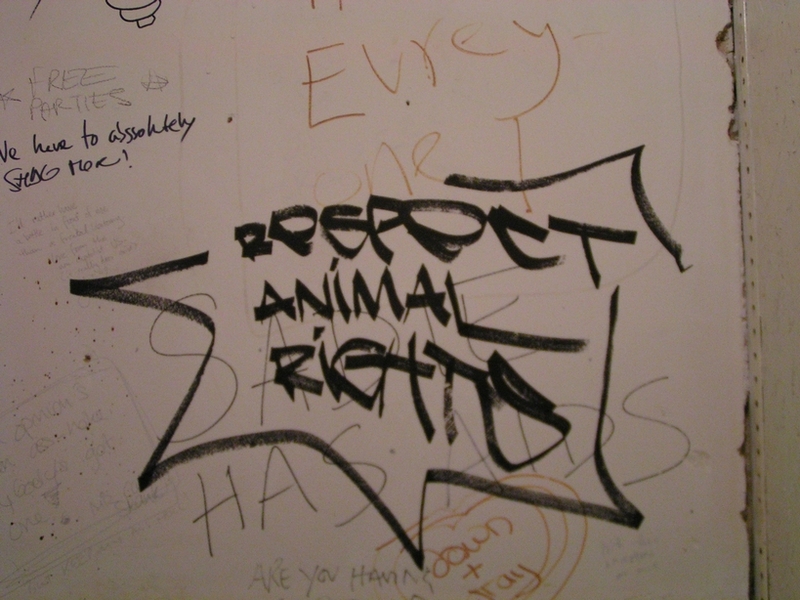 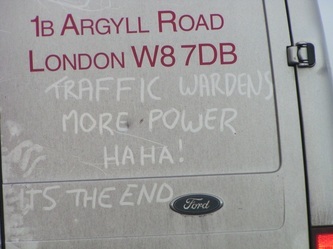 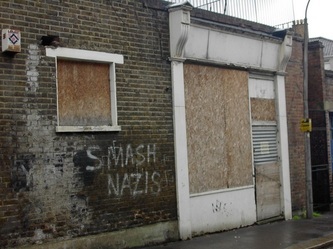 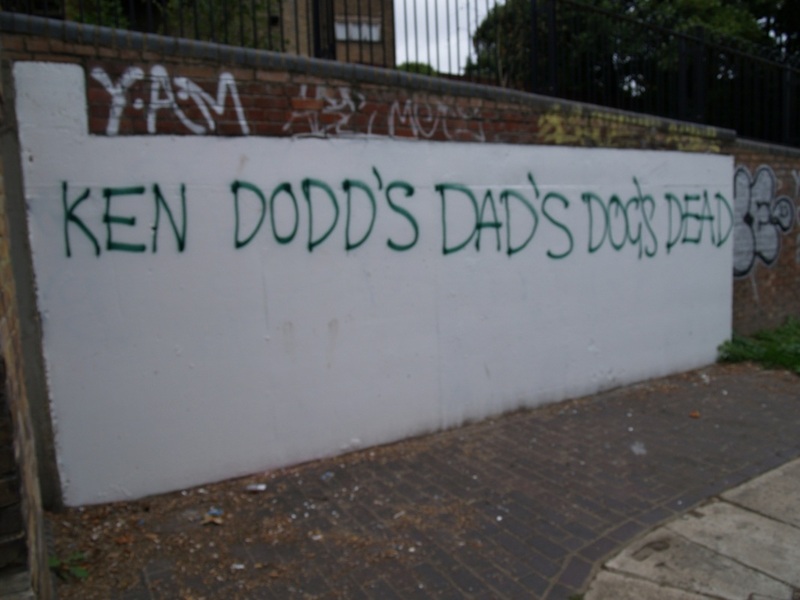 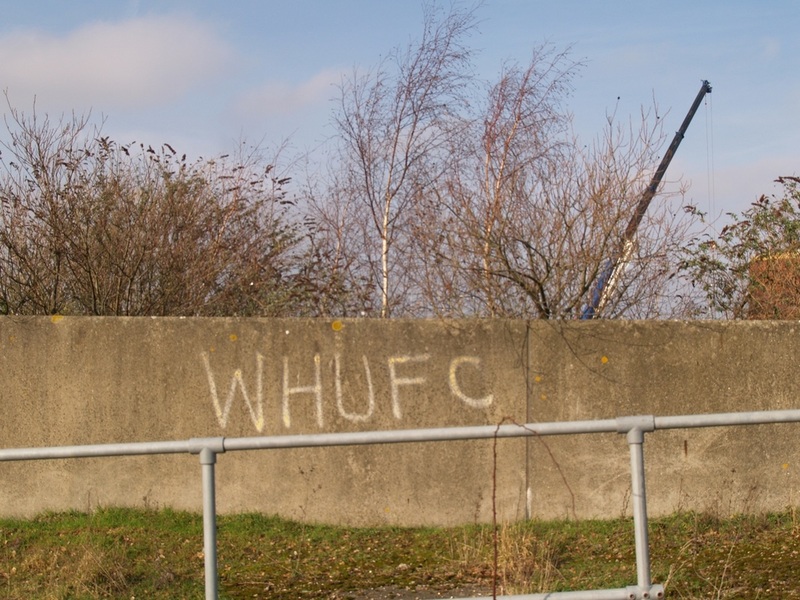 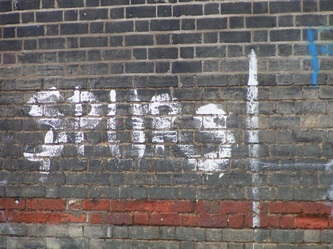 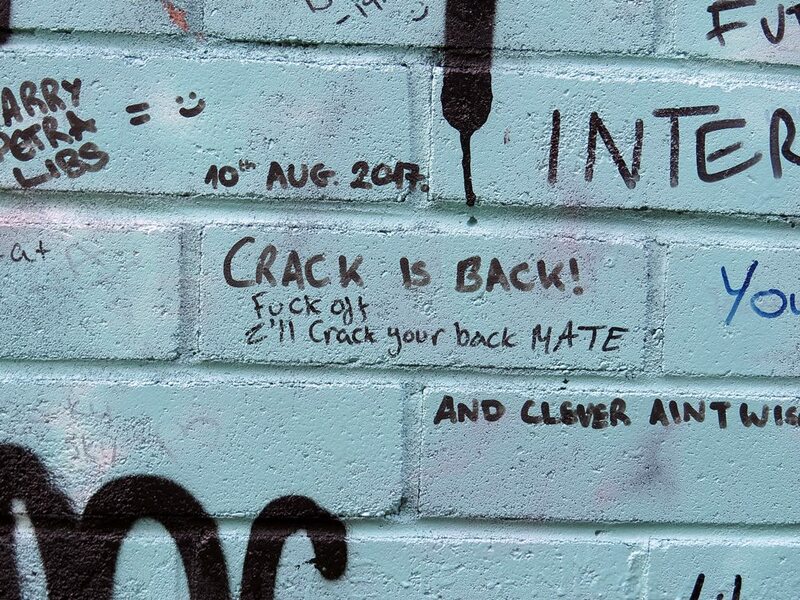 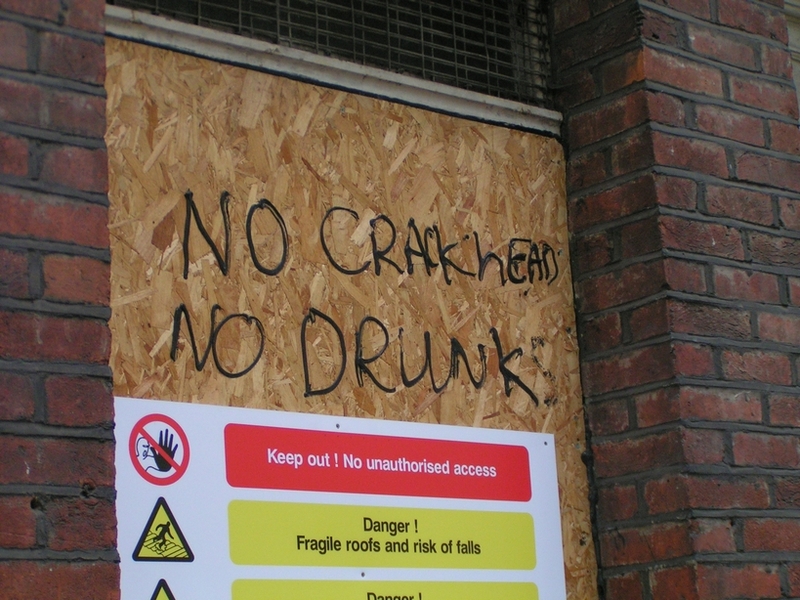 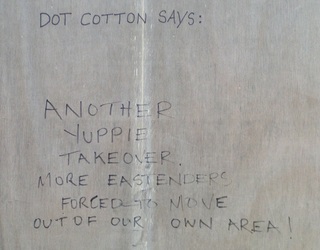 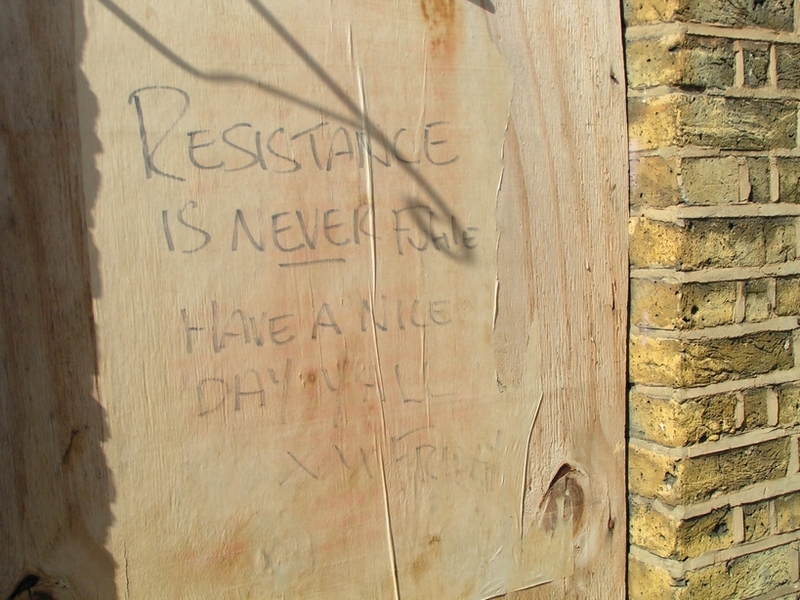 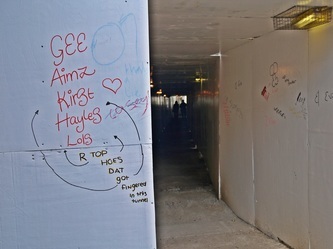 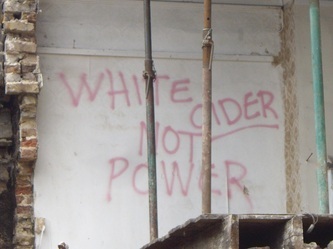 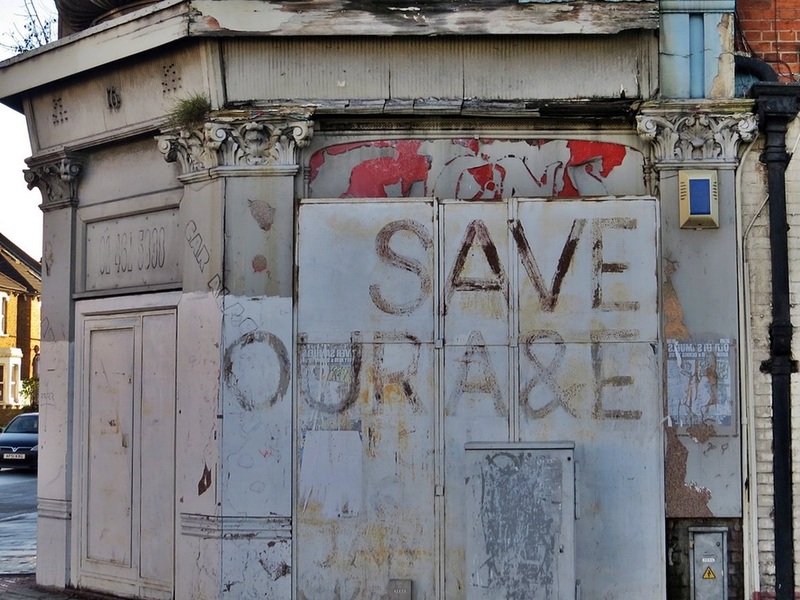 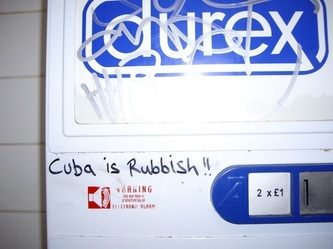 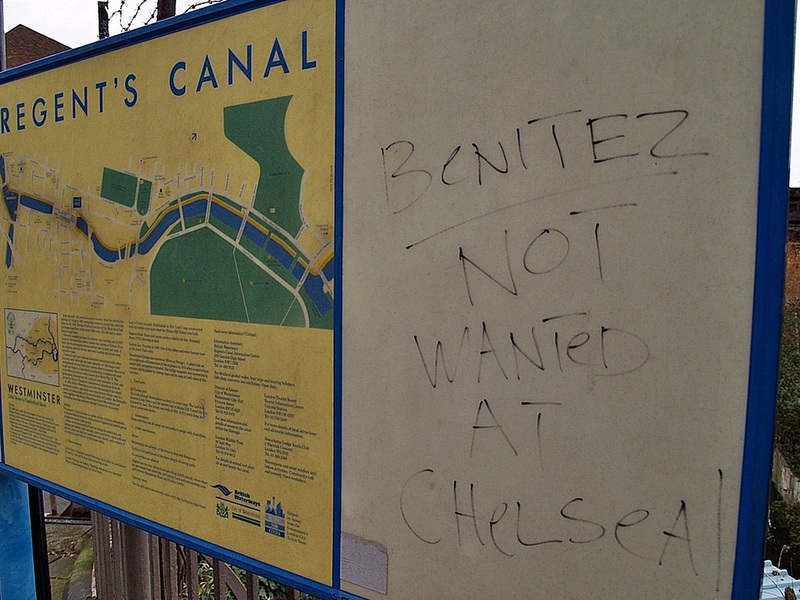 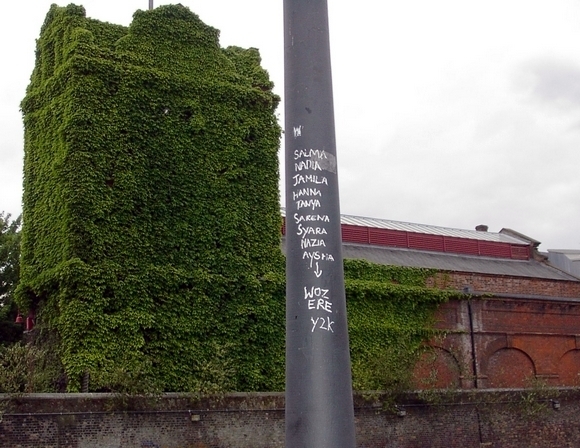 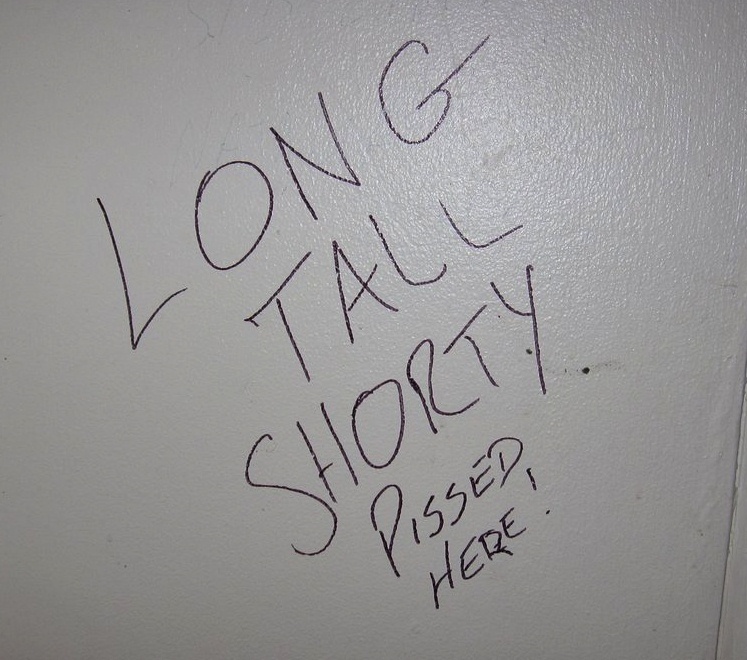 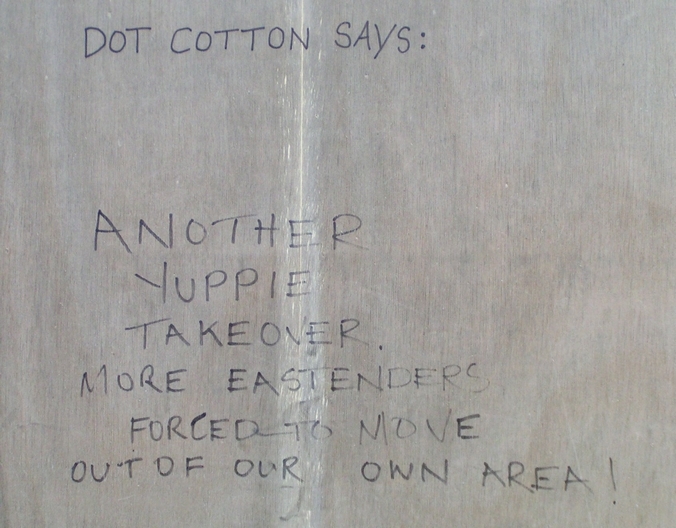 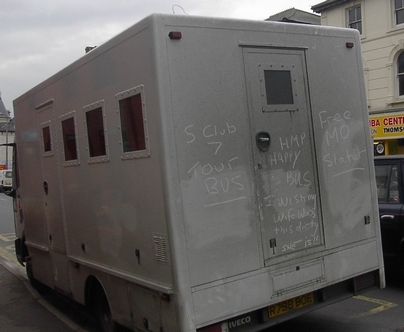 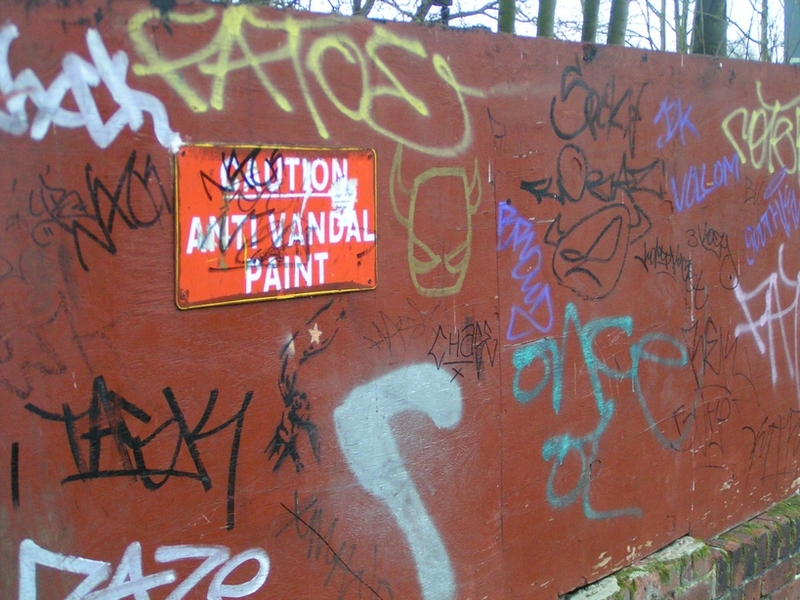 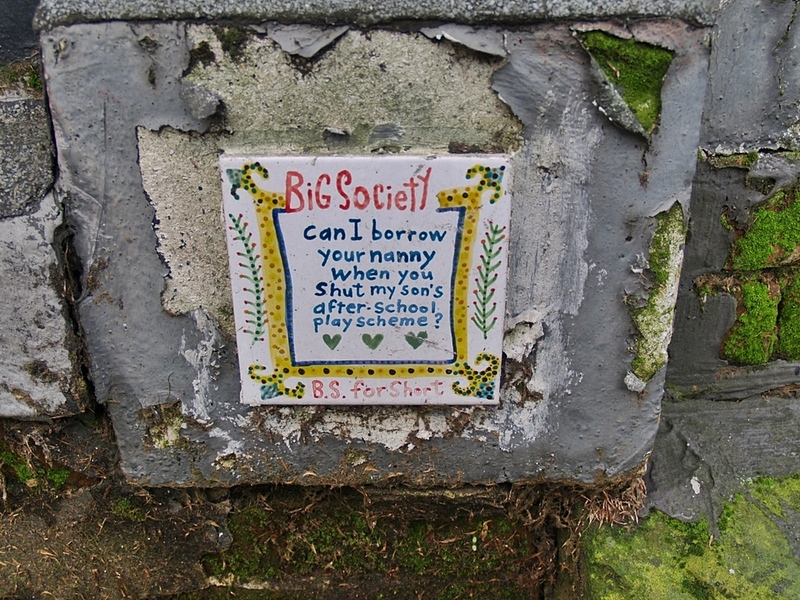 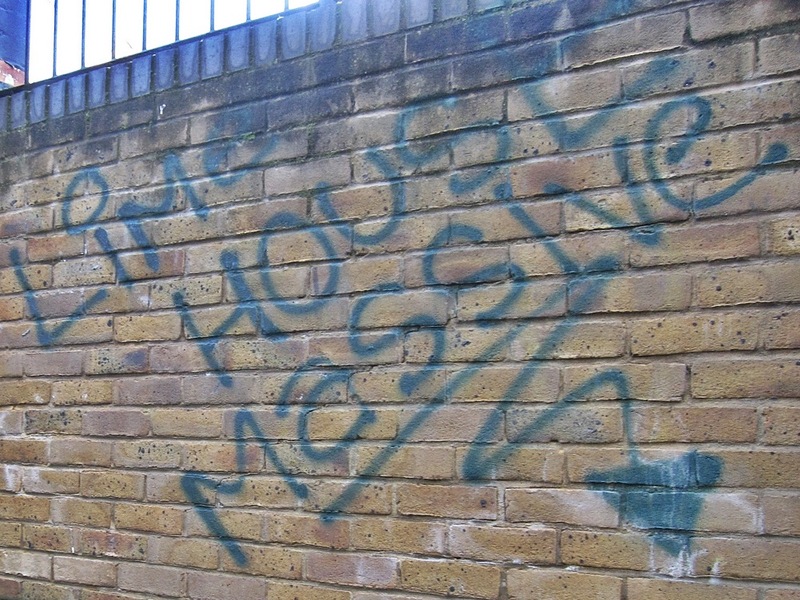 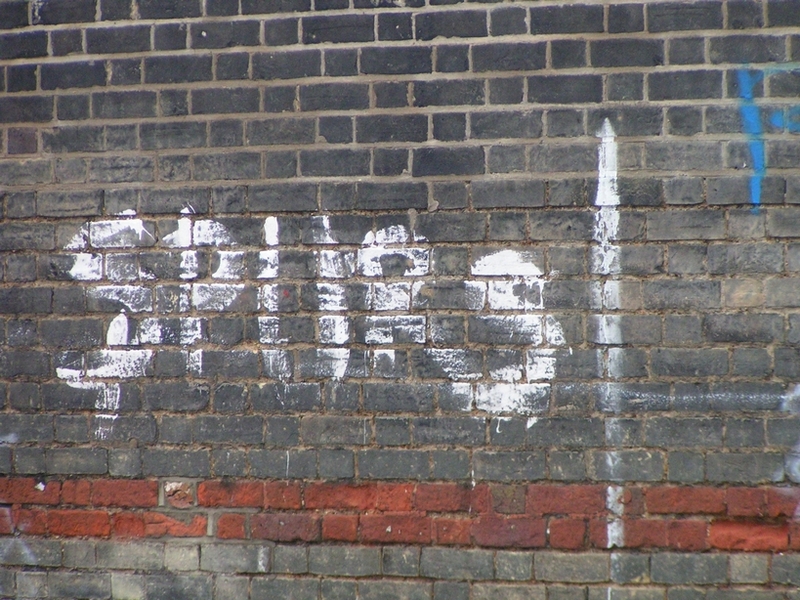 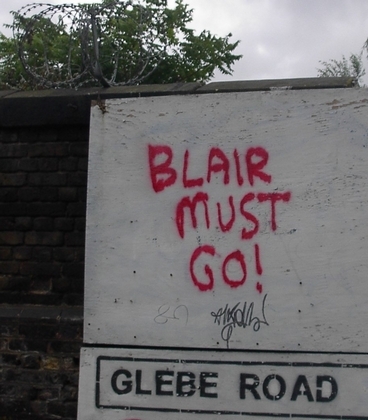 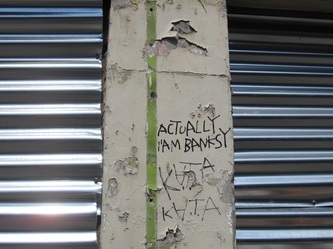 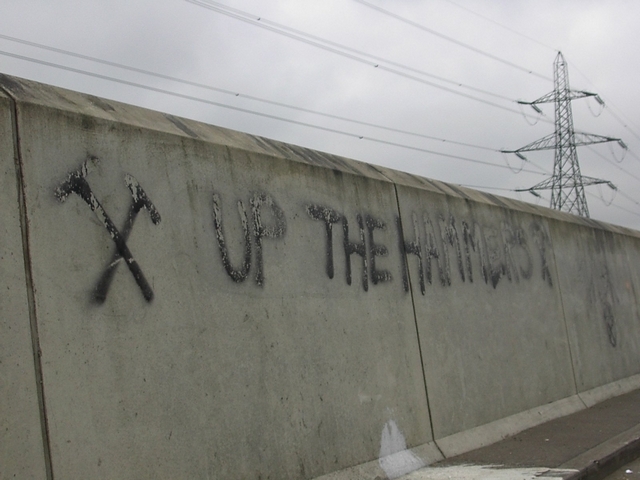 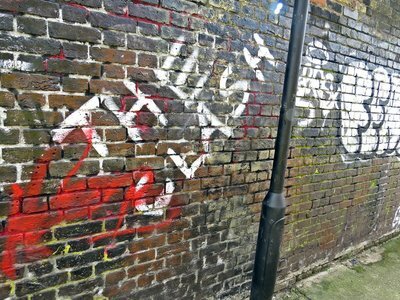 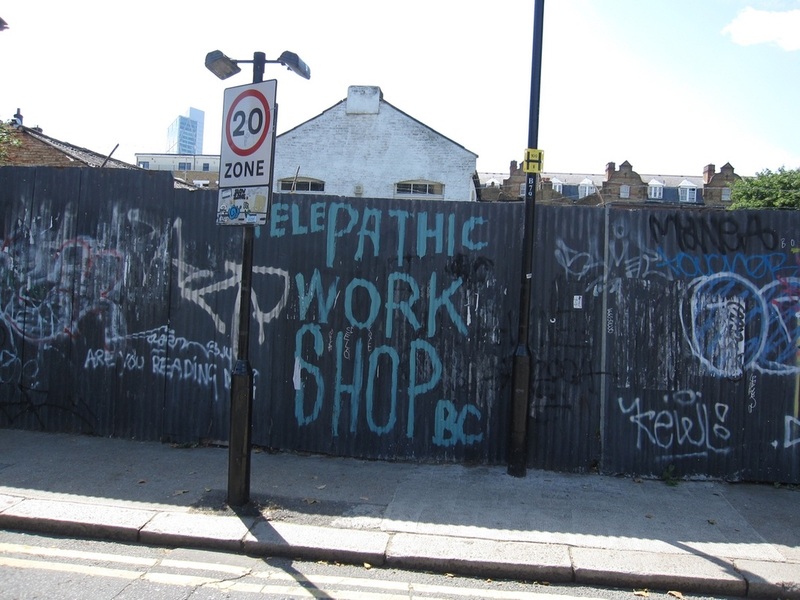 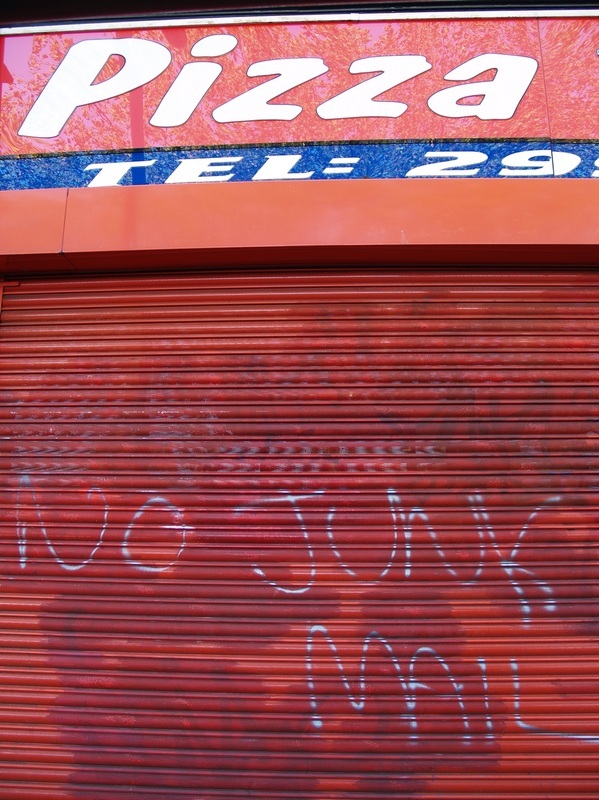 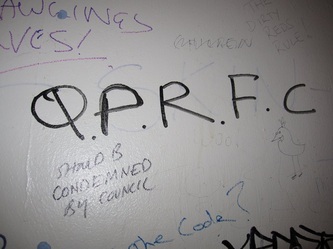 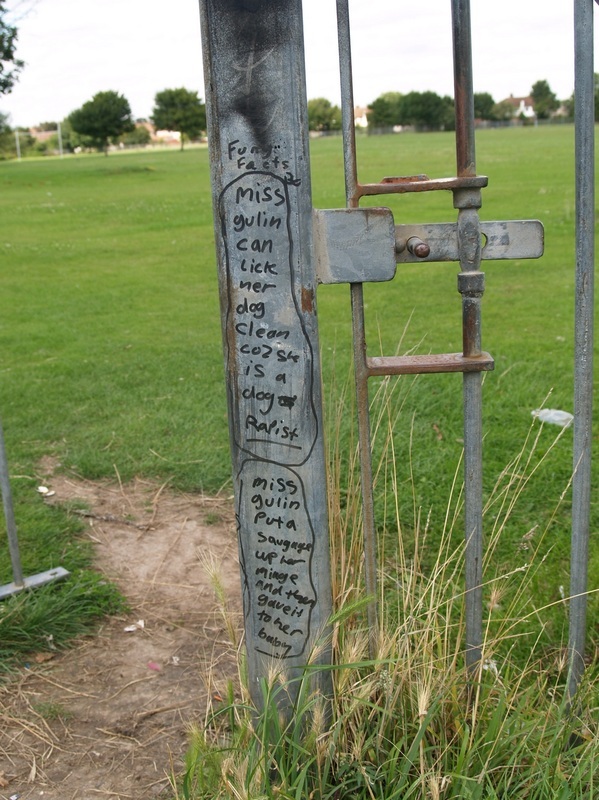 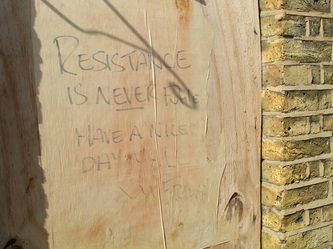 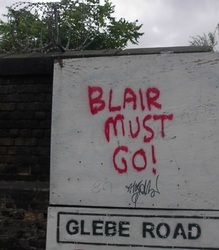 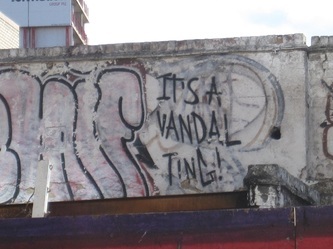 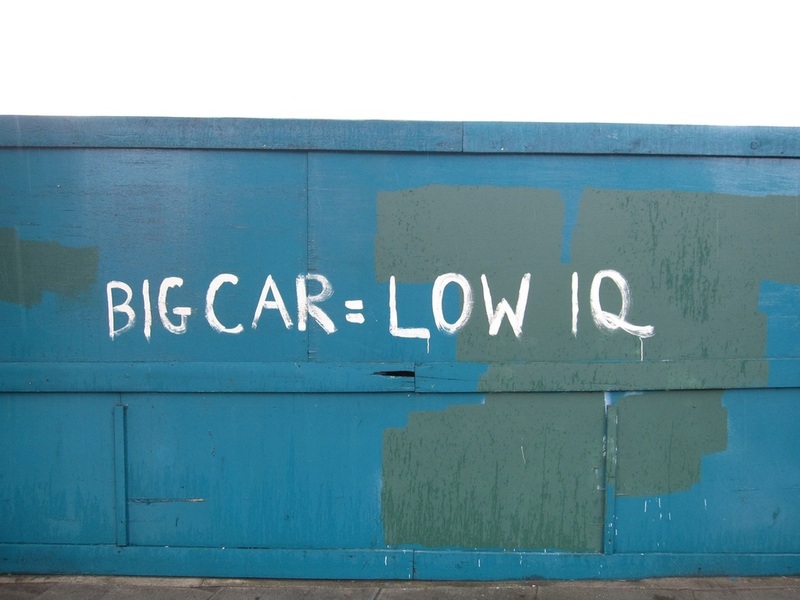 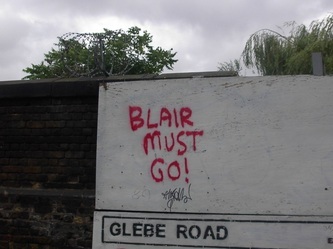 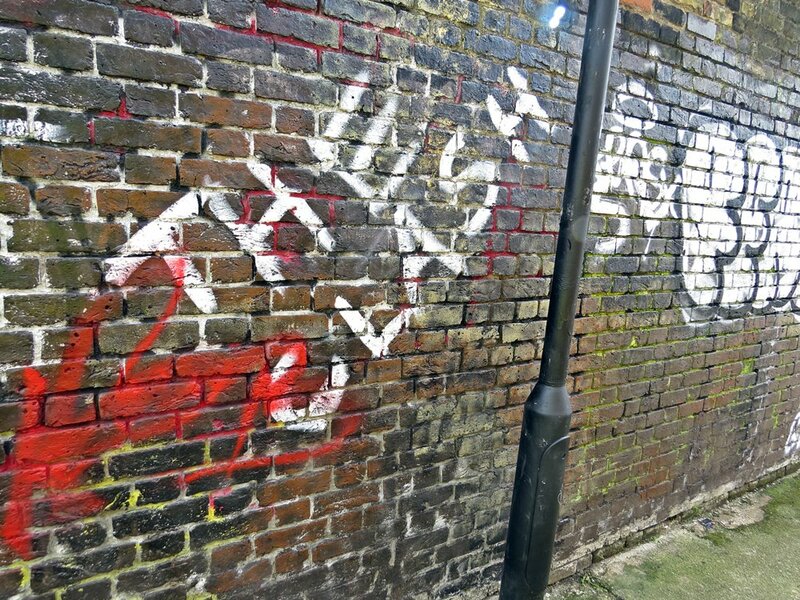 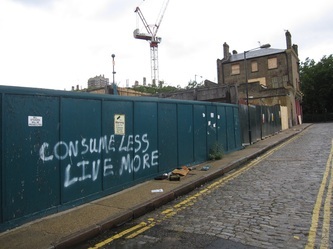 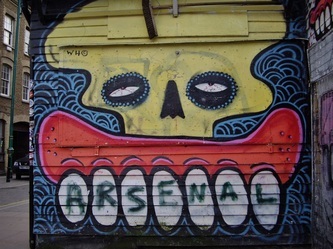 Right then, this is the real old school (not skool) graffiti - the amateur stuff - slogans, footie, political & ramblings either planned or random, offensive or quirky. 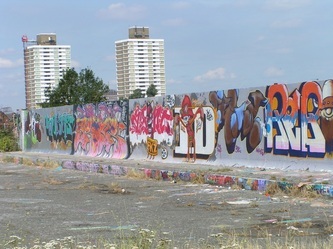 At its opening in 1970 the road was the largest continuous concrete structure in Britain and was constructed with many advanced features such as heating grids on slopes to control the formation of ice. It was planned and constructed in an era before environmental impacts were routinely considered, and it caused much controversy at the time for the effects it and the vehicles it carried had upon the local community and the environment. 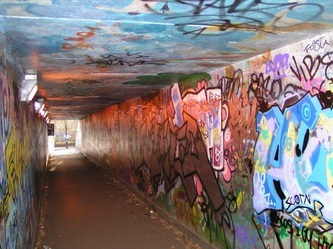 After completion a vast corridor of wasteland remained below the motorway. 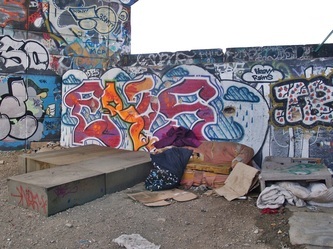 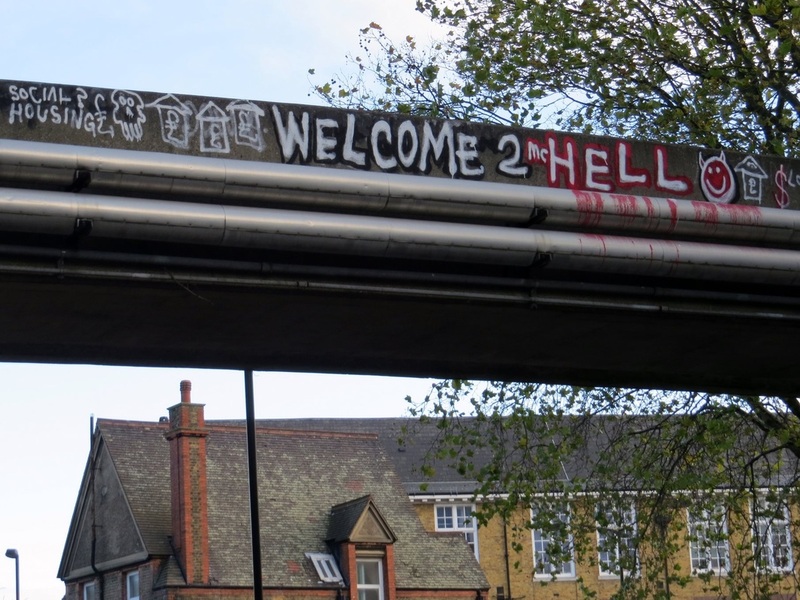 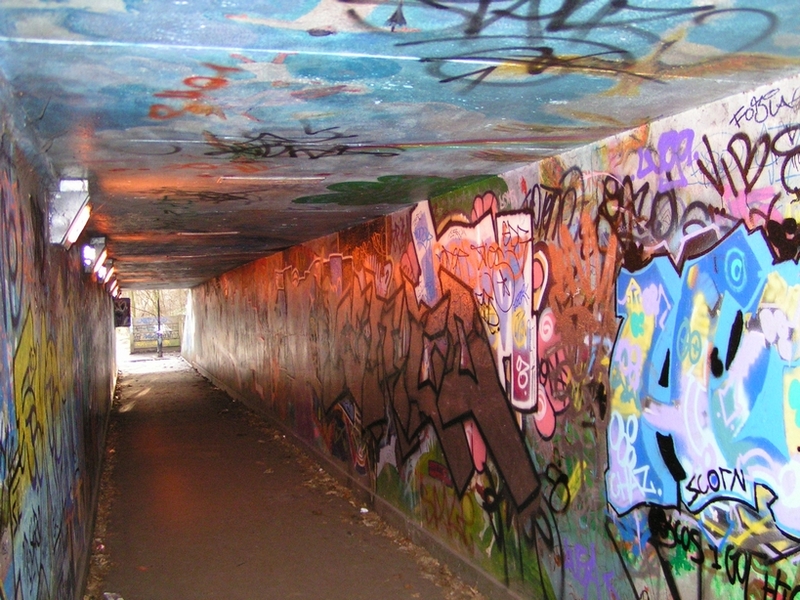 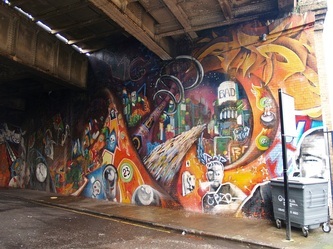 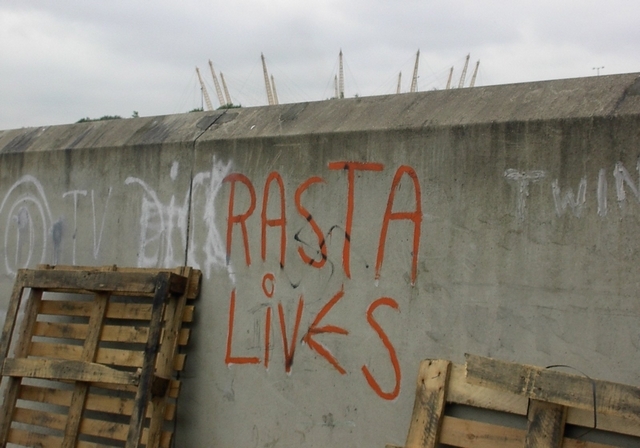 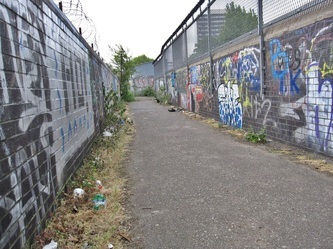 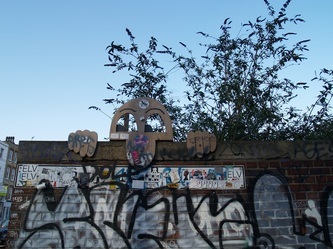 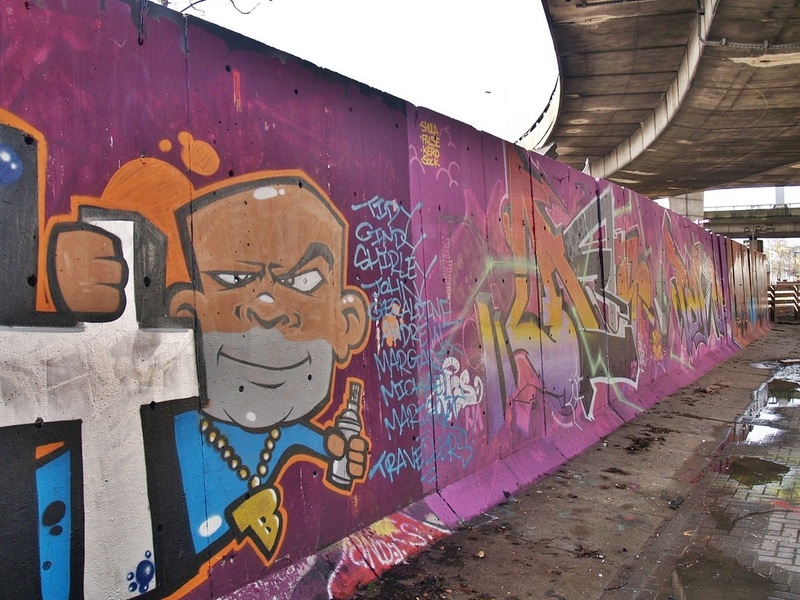 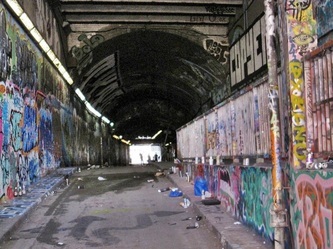 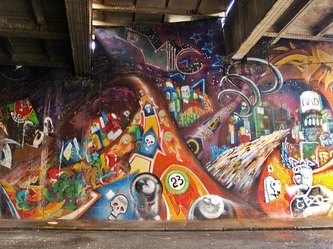 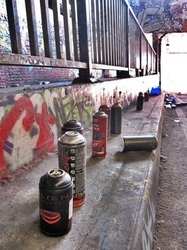 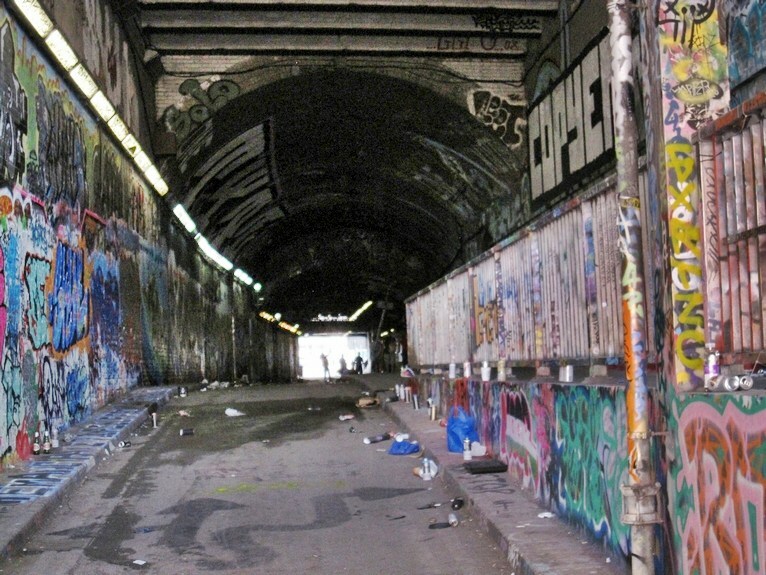 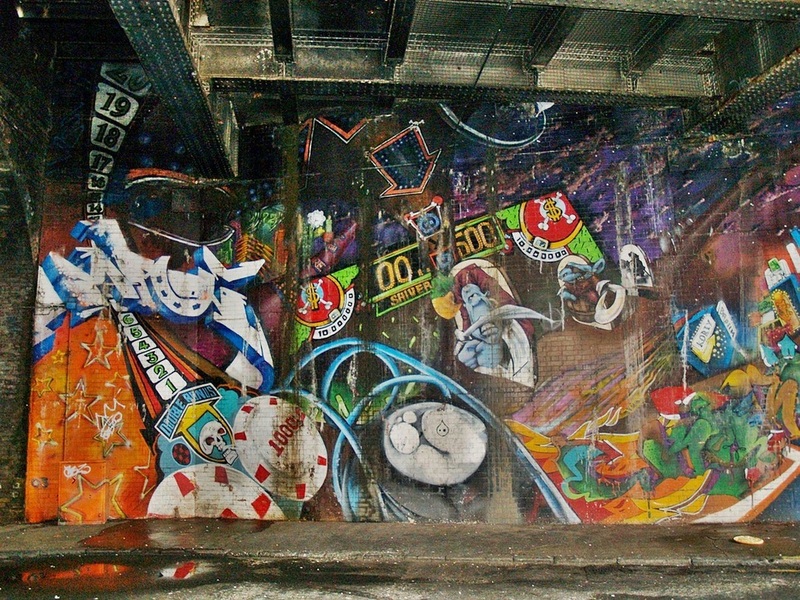 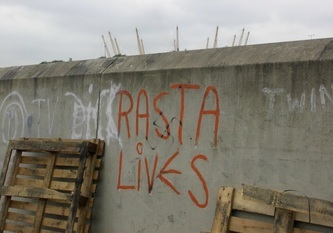 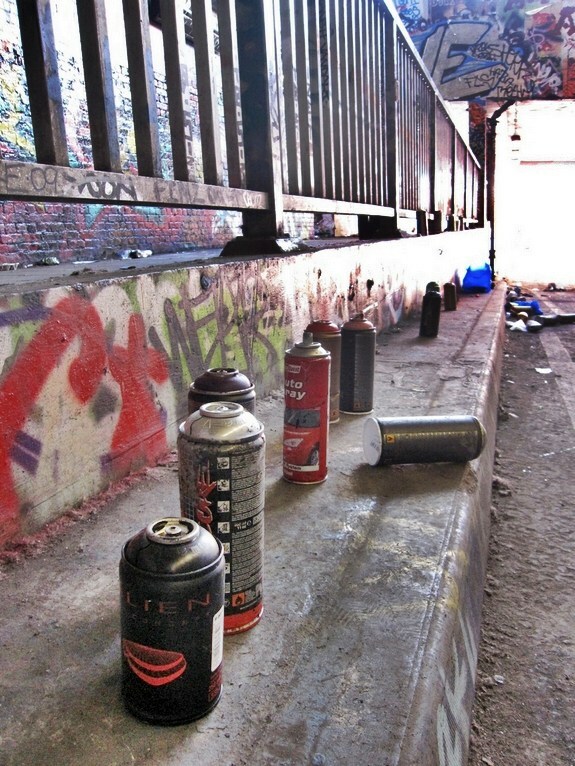 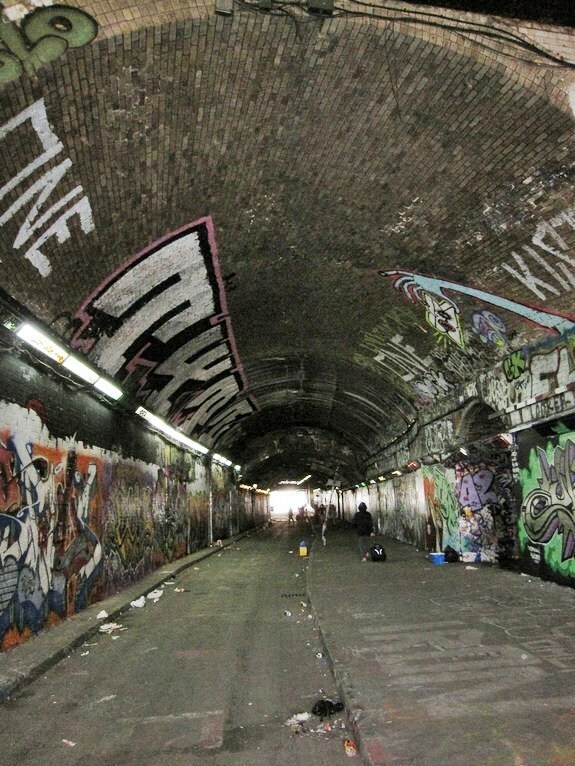 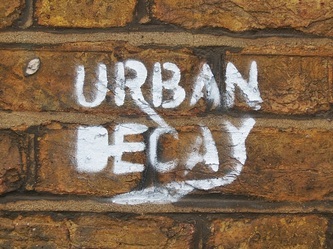 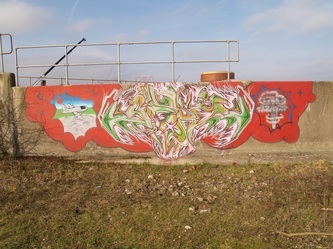 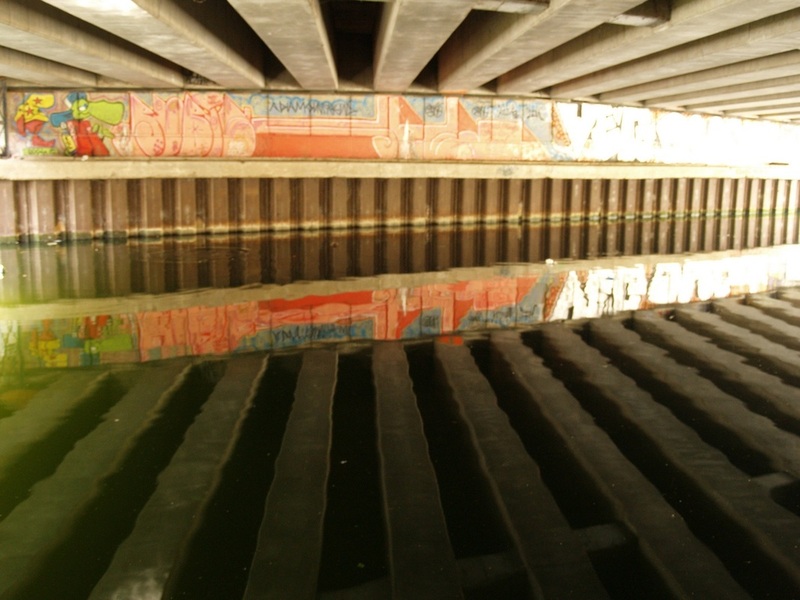 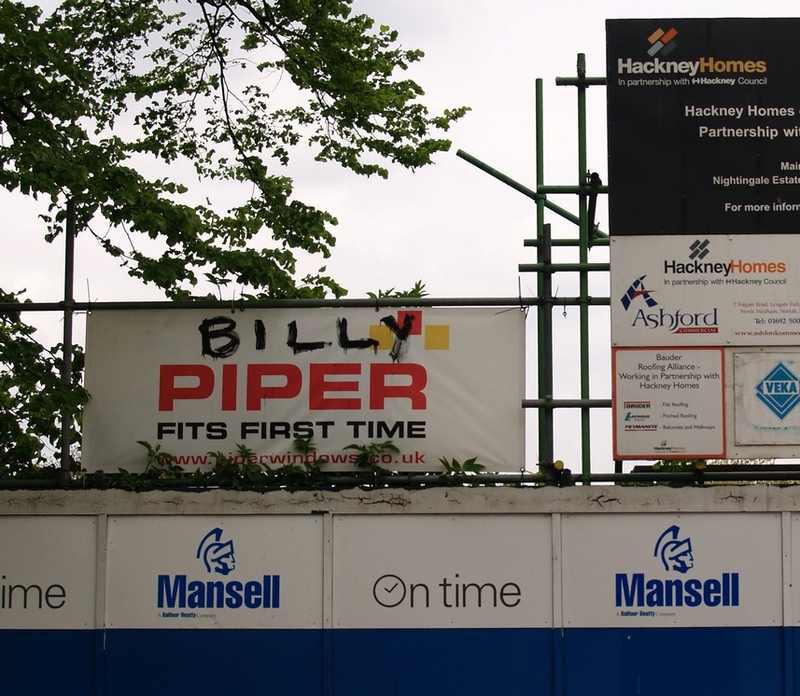 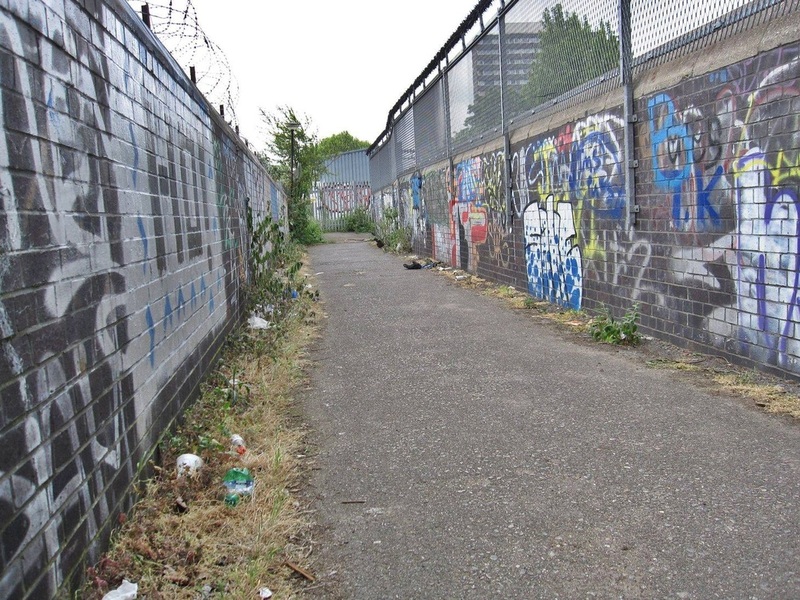 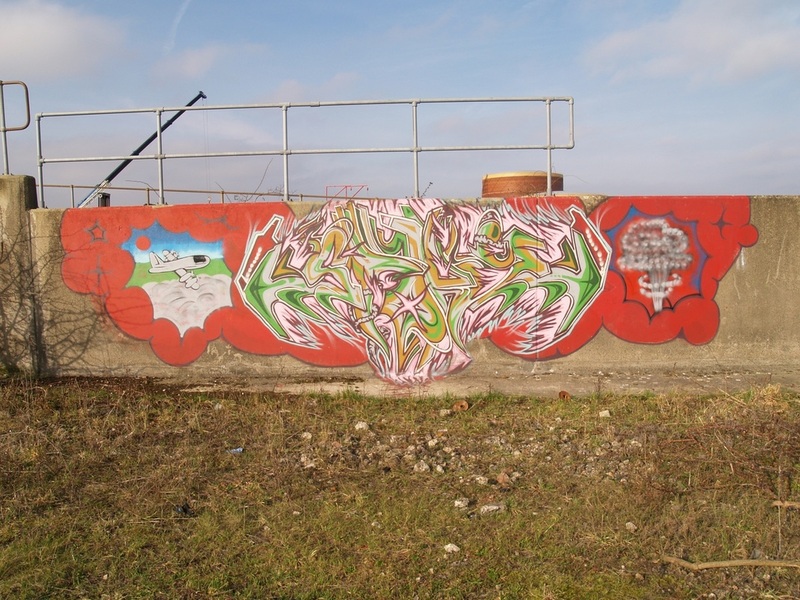 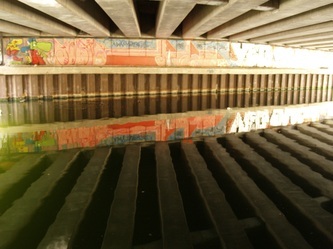 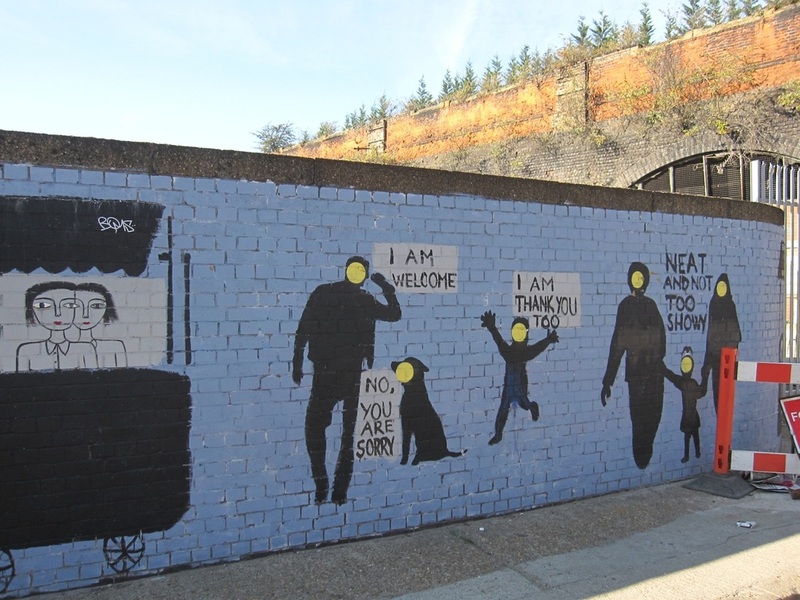 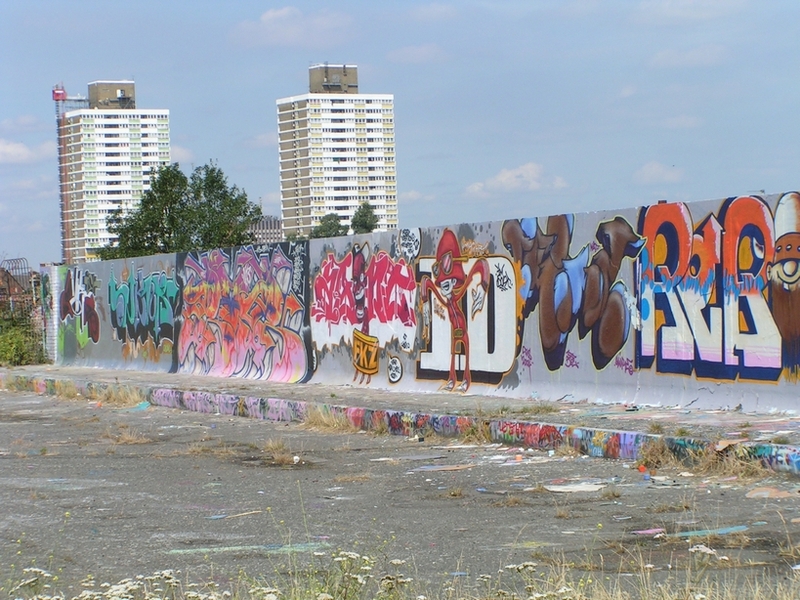 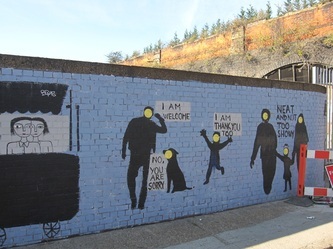 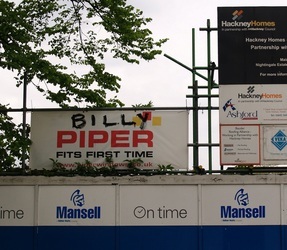 The North Kensington Amenity Trust was founded to reclaim and develop this land for local community use and since 2000 local charity Urban Eye has initiated a programme of cleaning, painting and lighting to brighten up and improve the safety of the areas under the Flyover structure.